Description: Red Axanthic Orange Ghost (RAOG) 1/10 x HY Lesser PHOG 1/10. 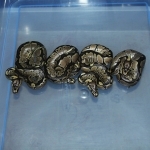 Description: Banded HRA 1/11 x Banded HRA 2/11. 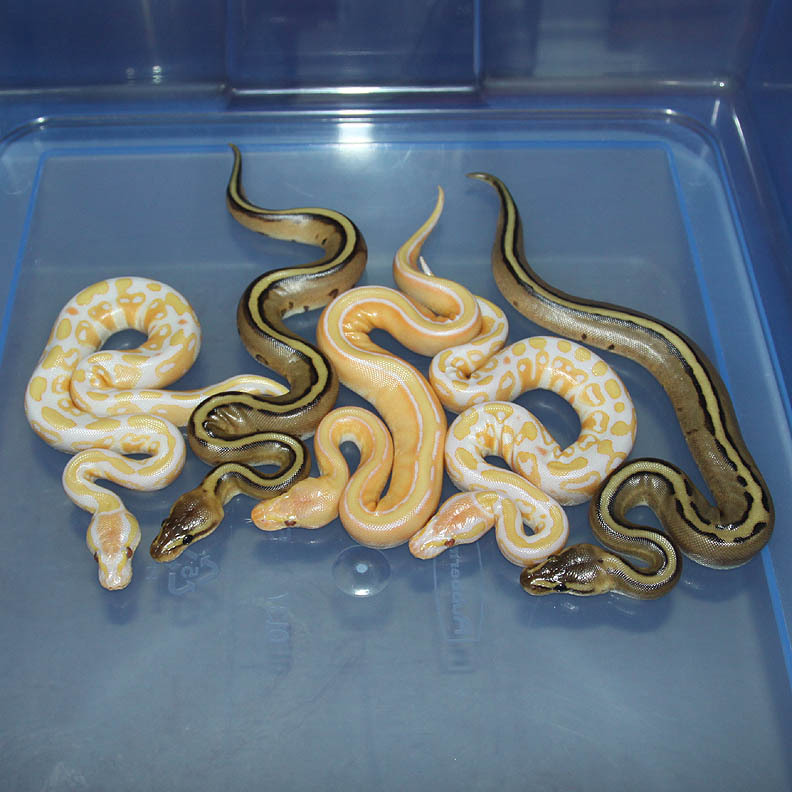 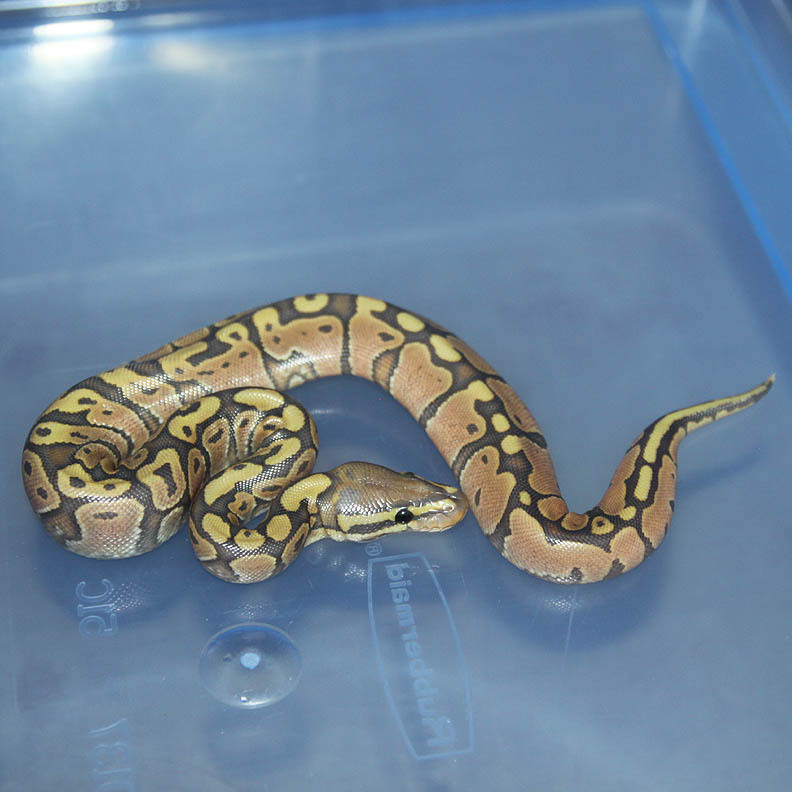 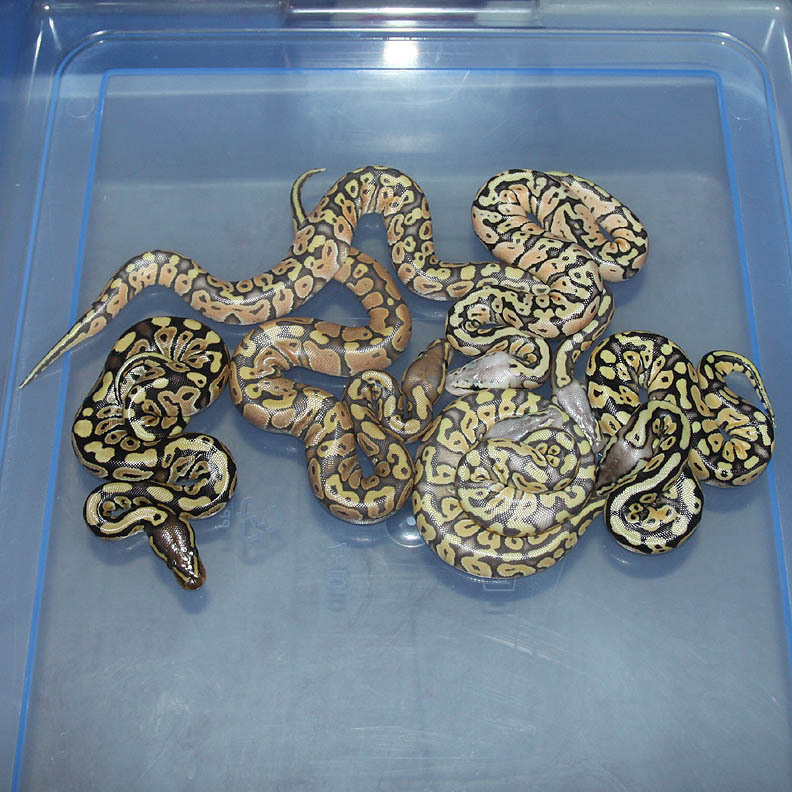 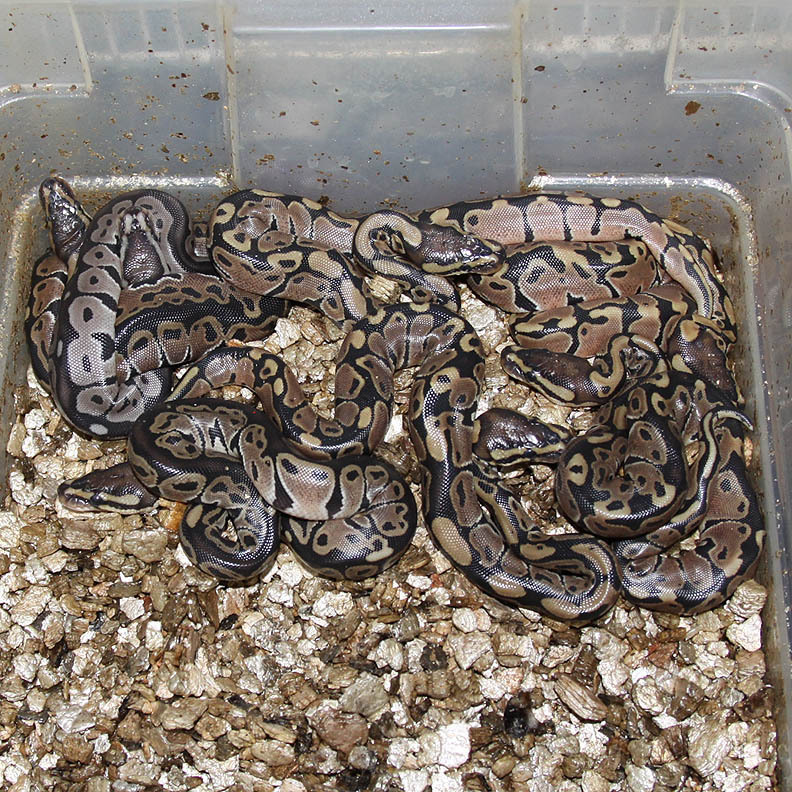 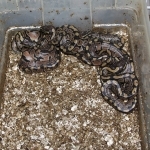 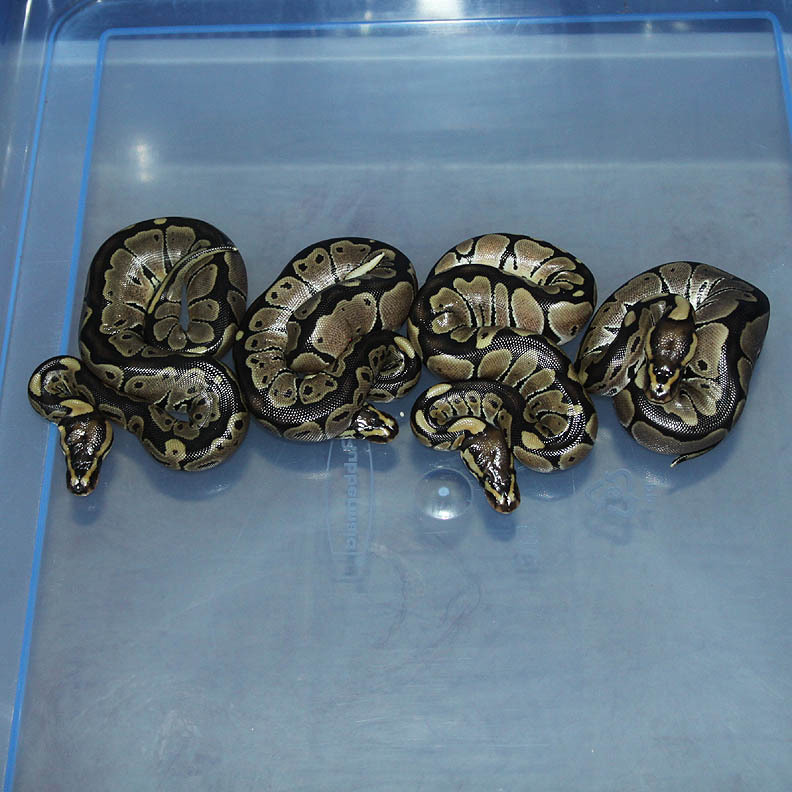 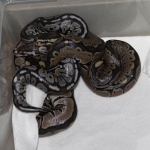 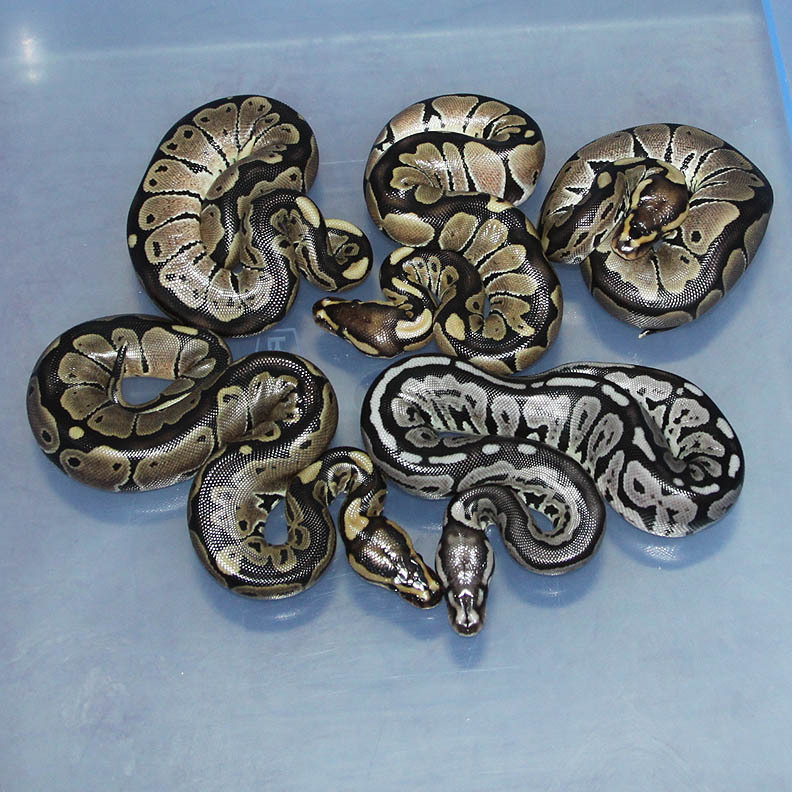 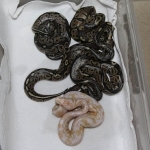 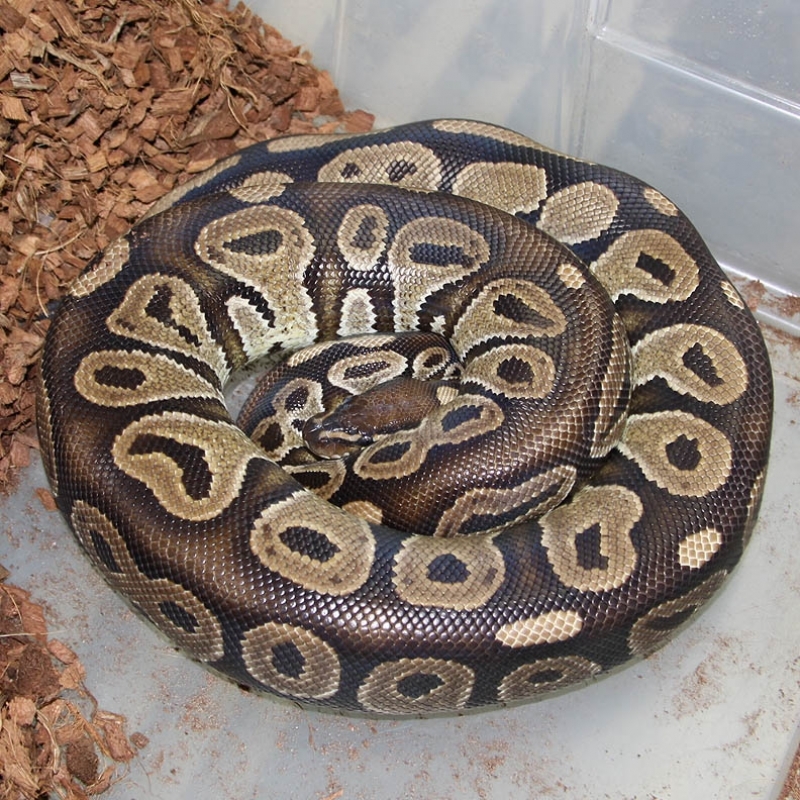 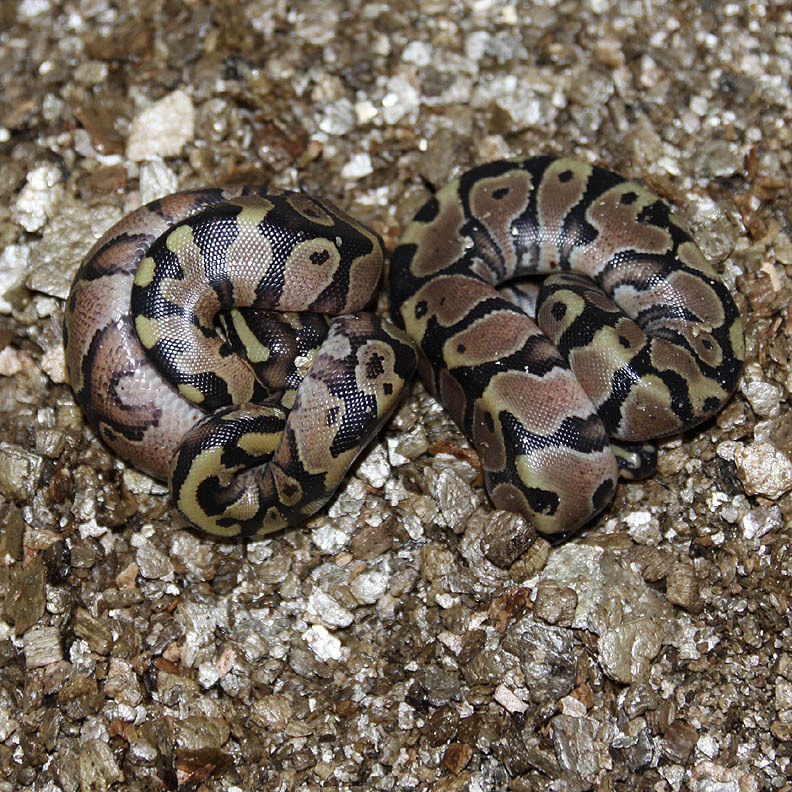 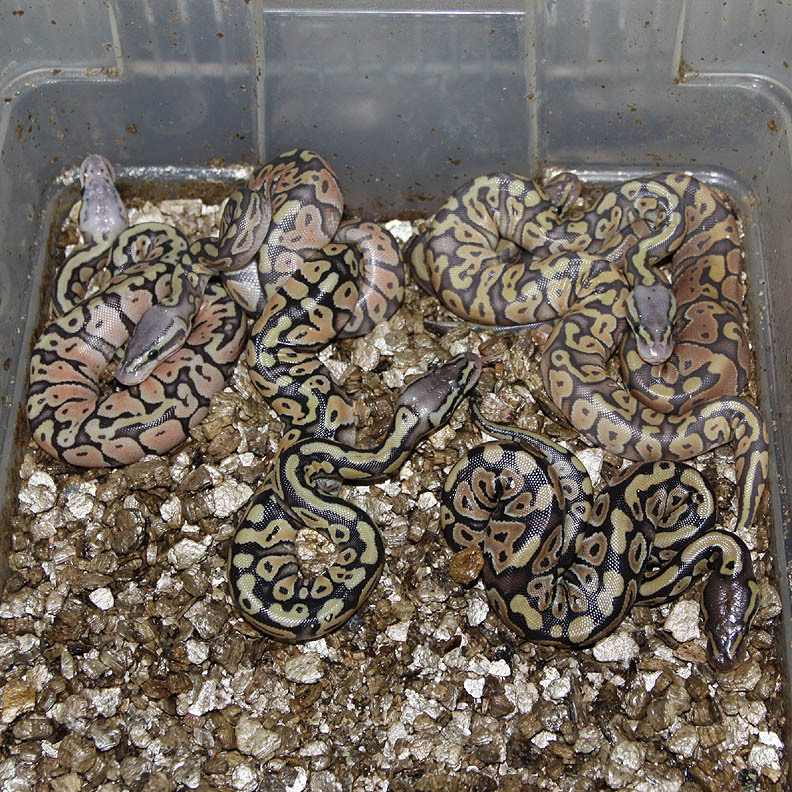 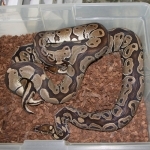 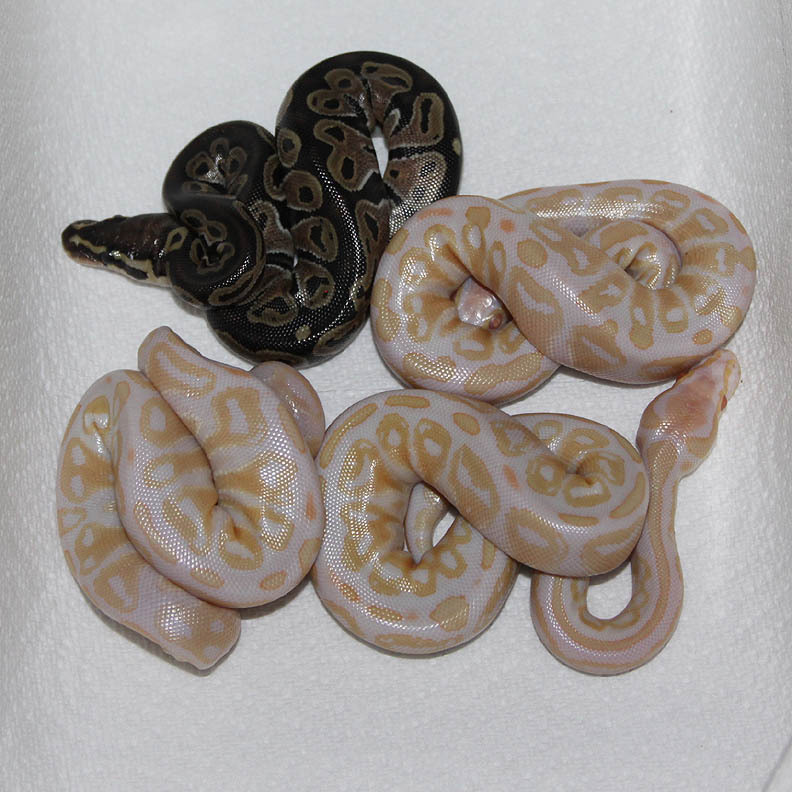 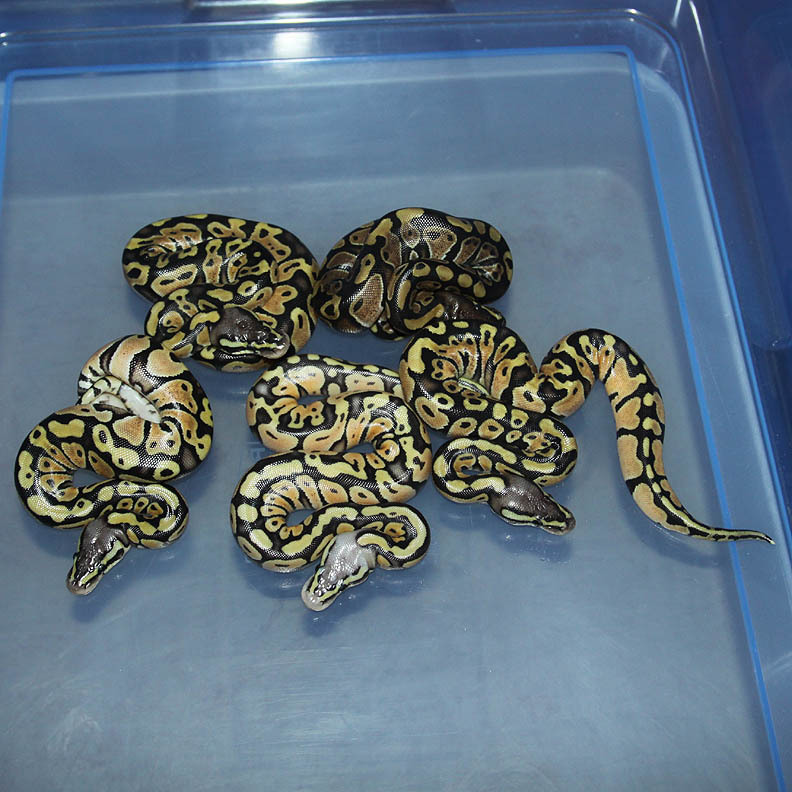 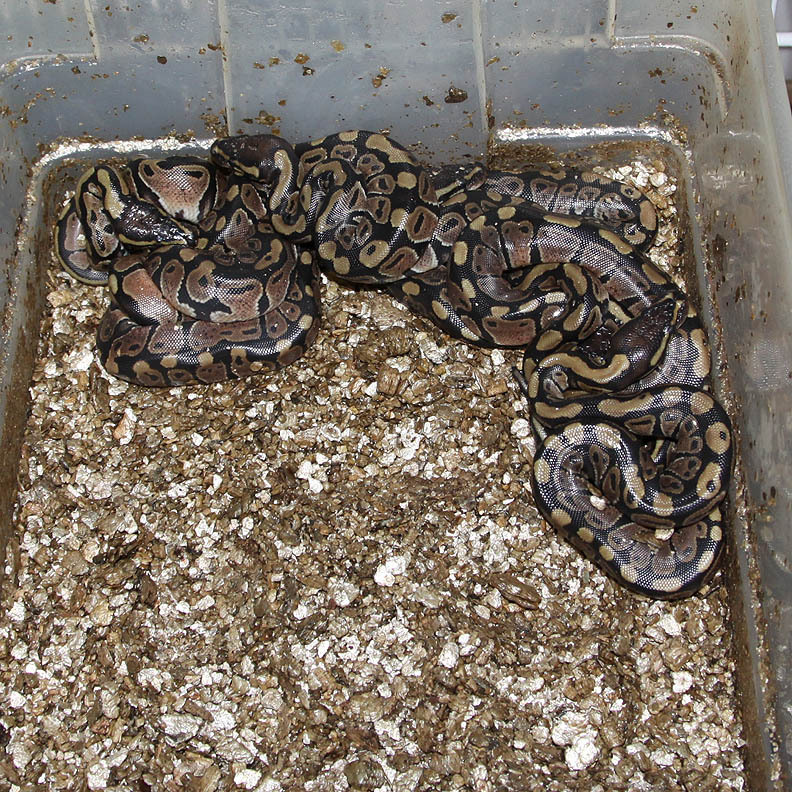 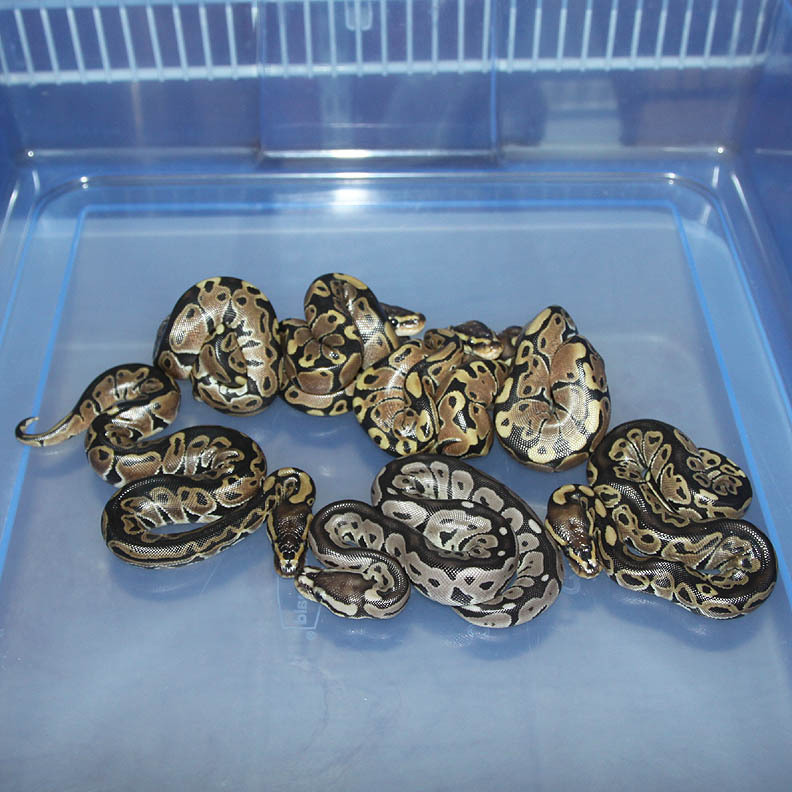 Description: Pastel Banded 1/11 x Pastel Het RA/Banded 1/09. 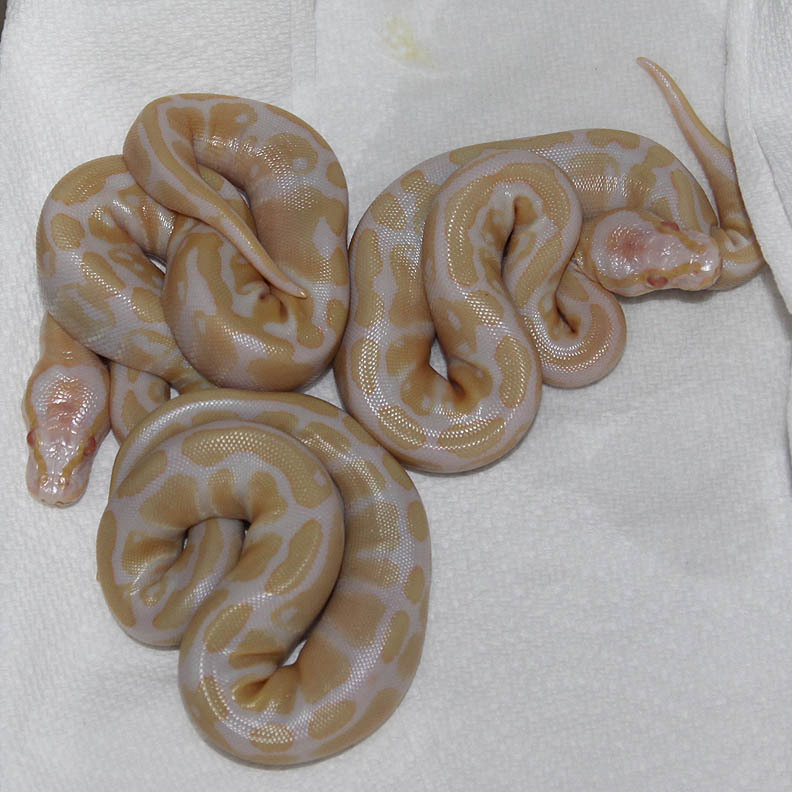 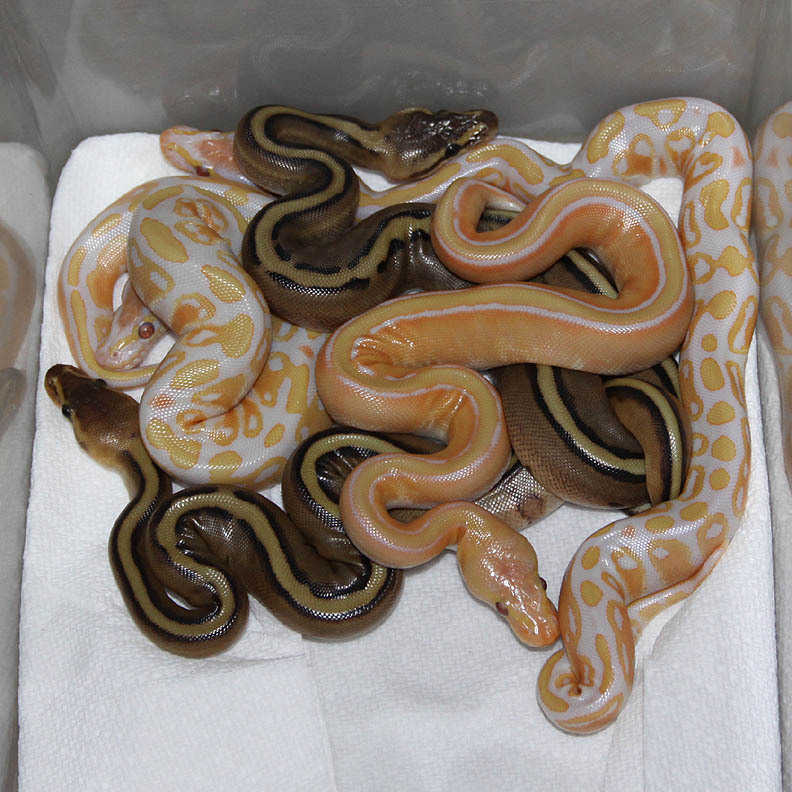 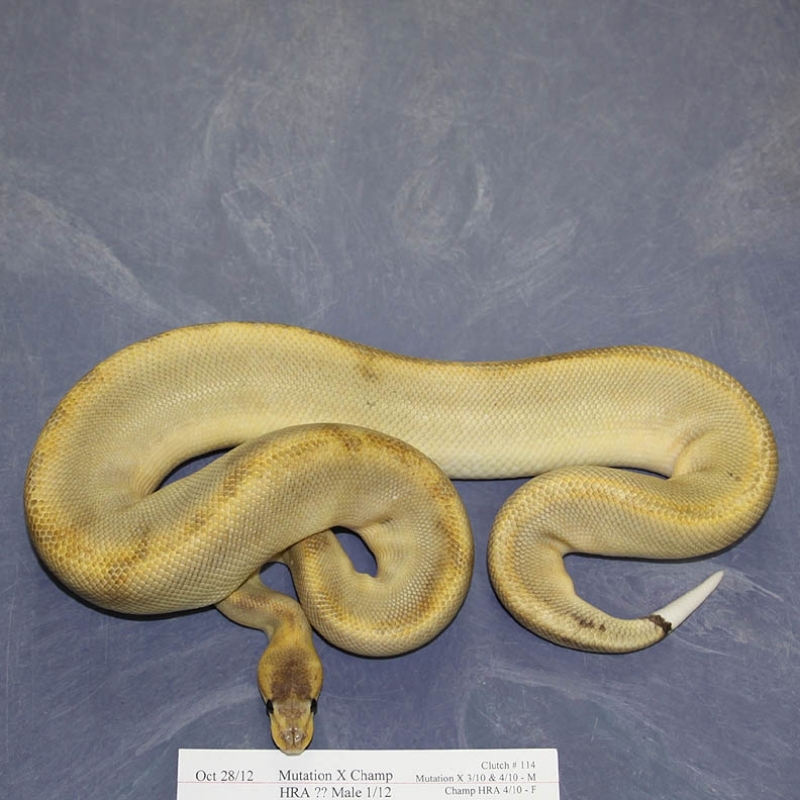 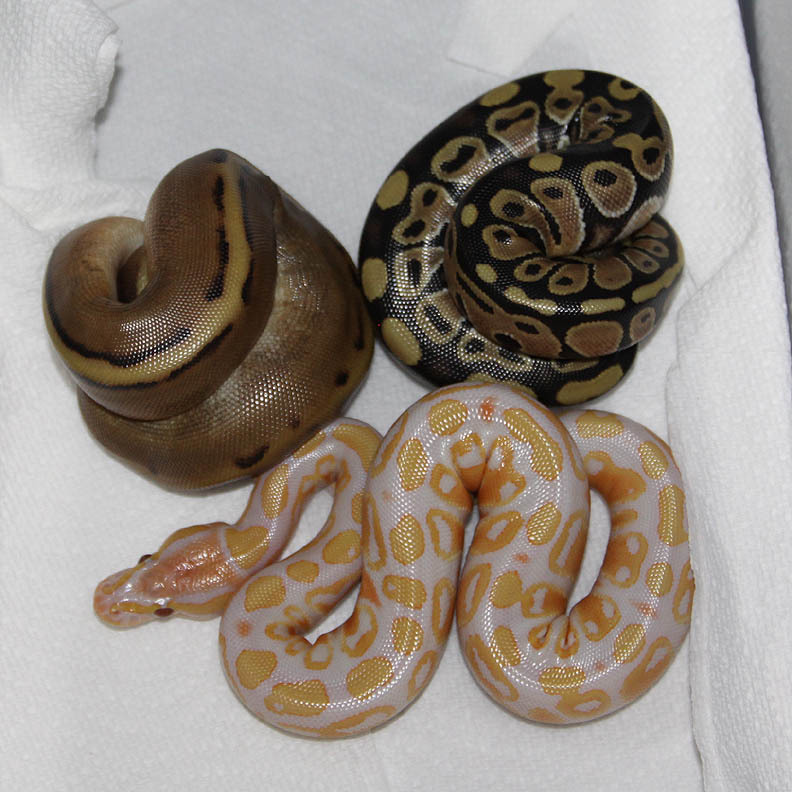 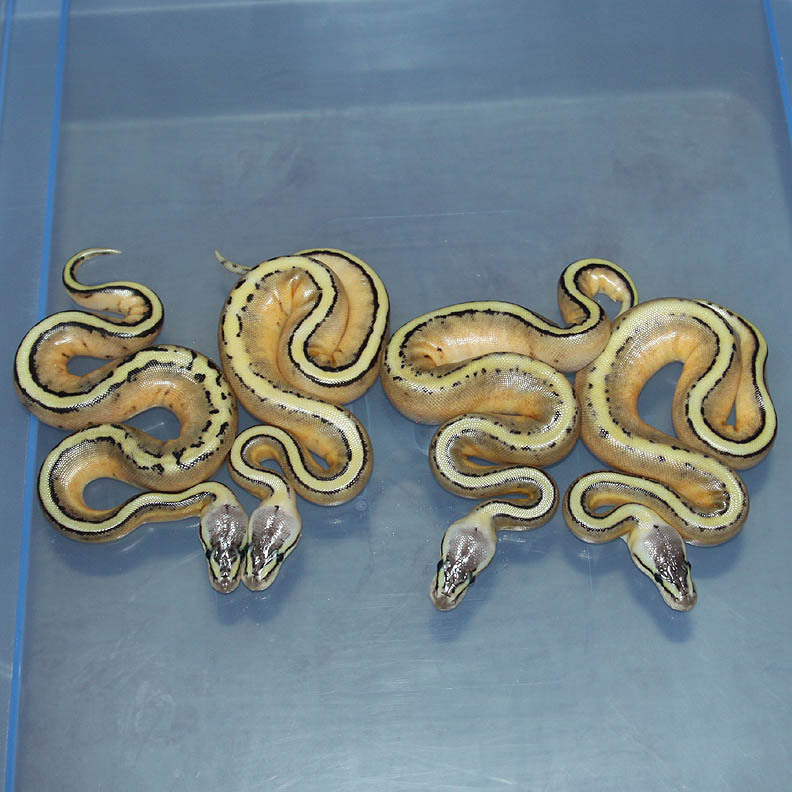 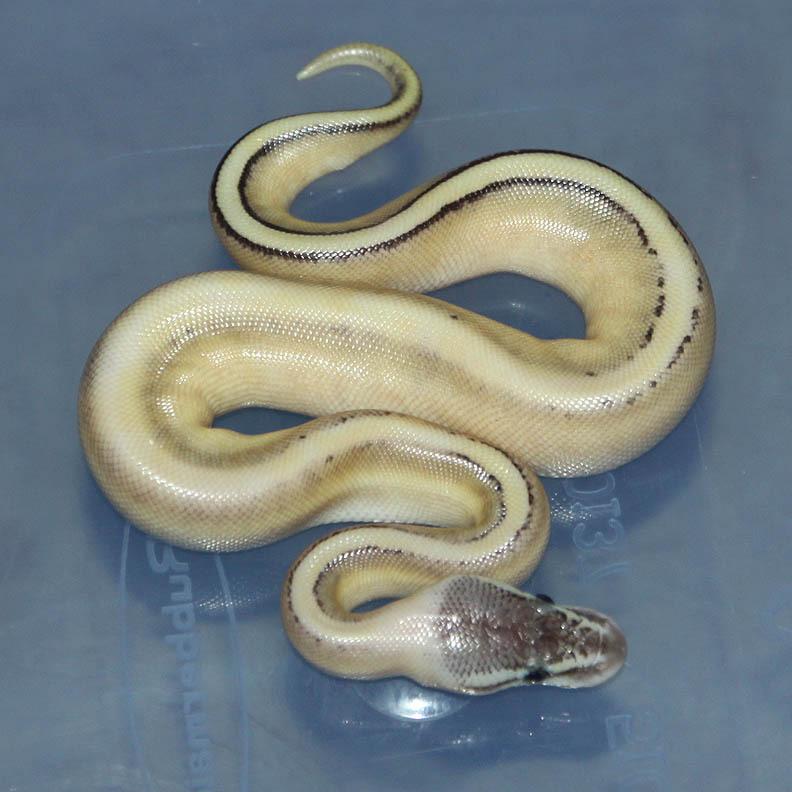 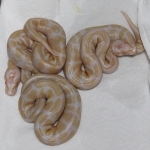 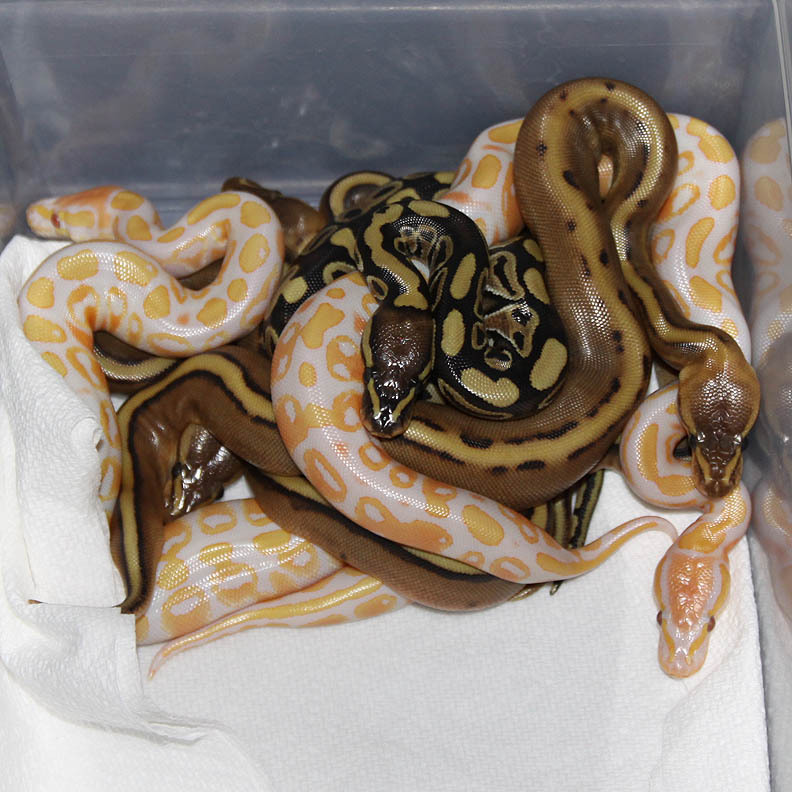 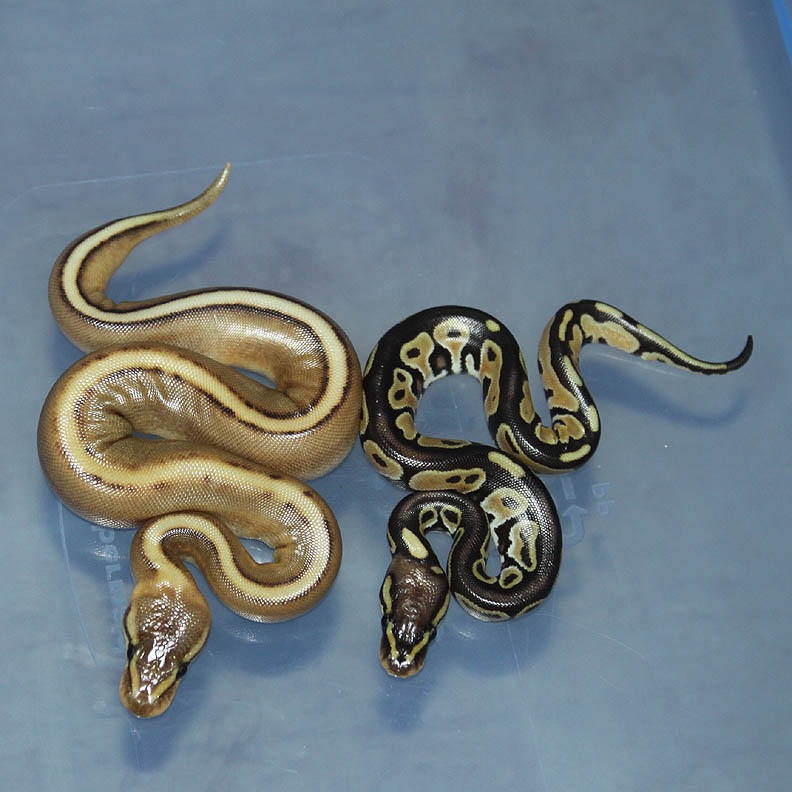 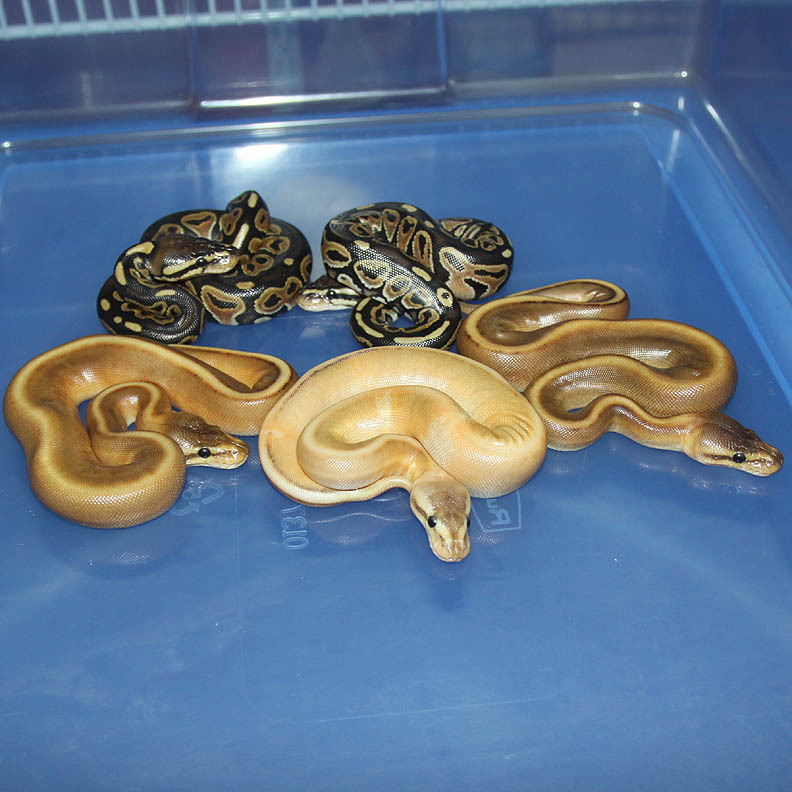 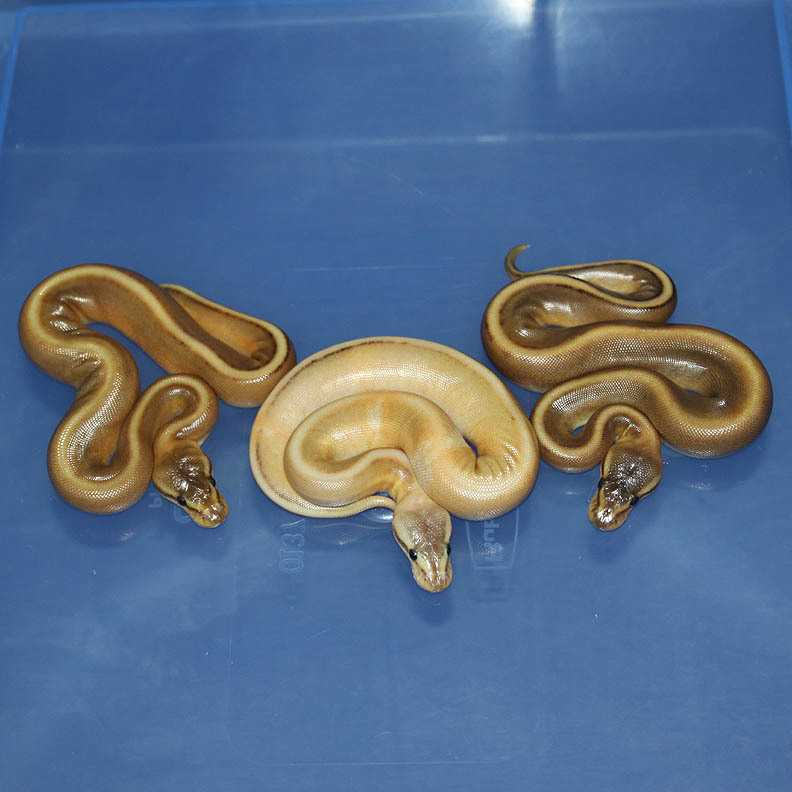 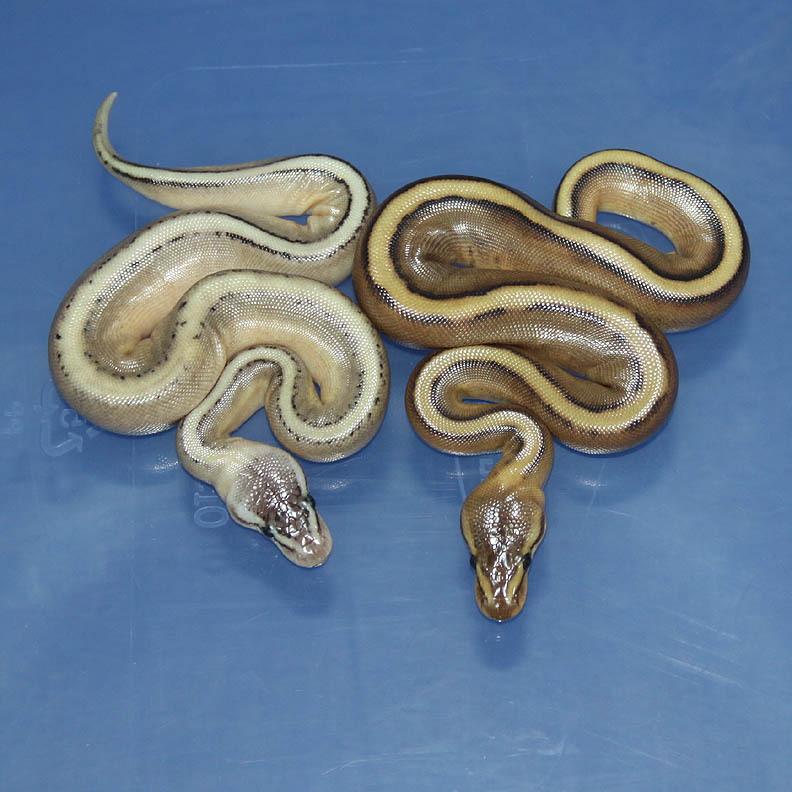 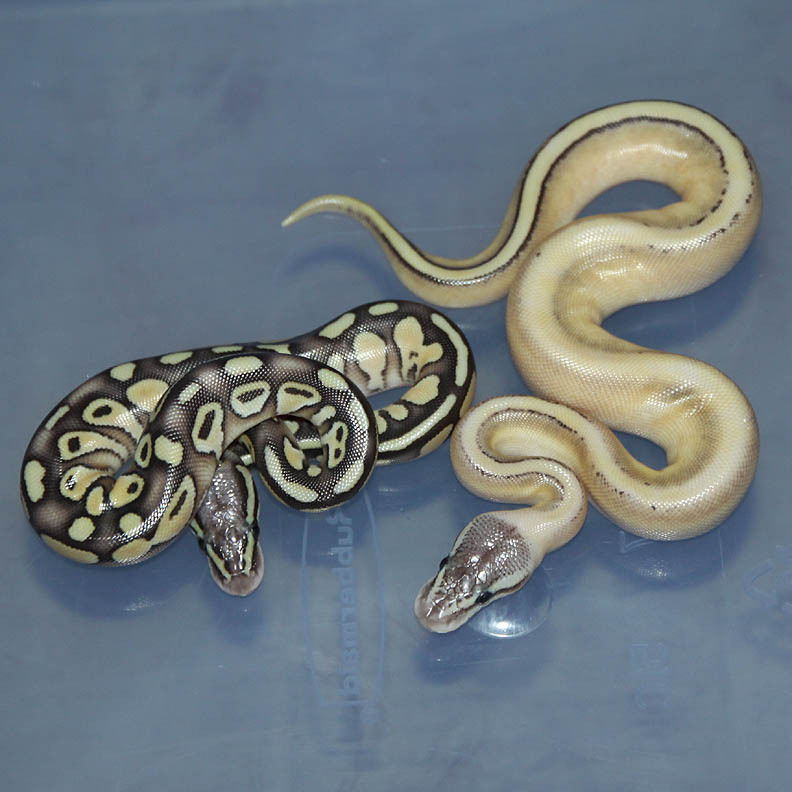 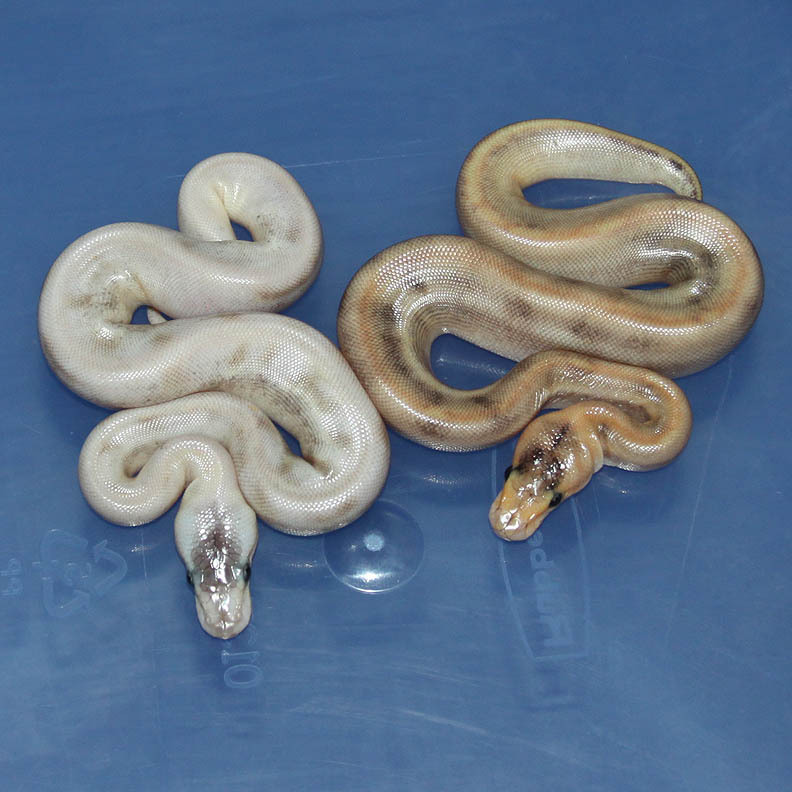 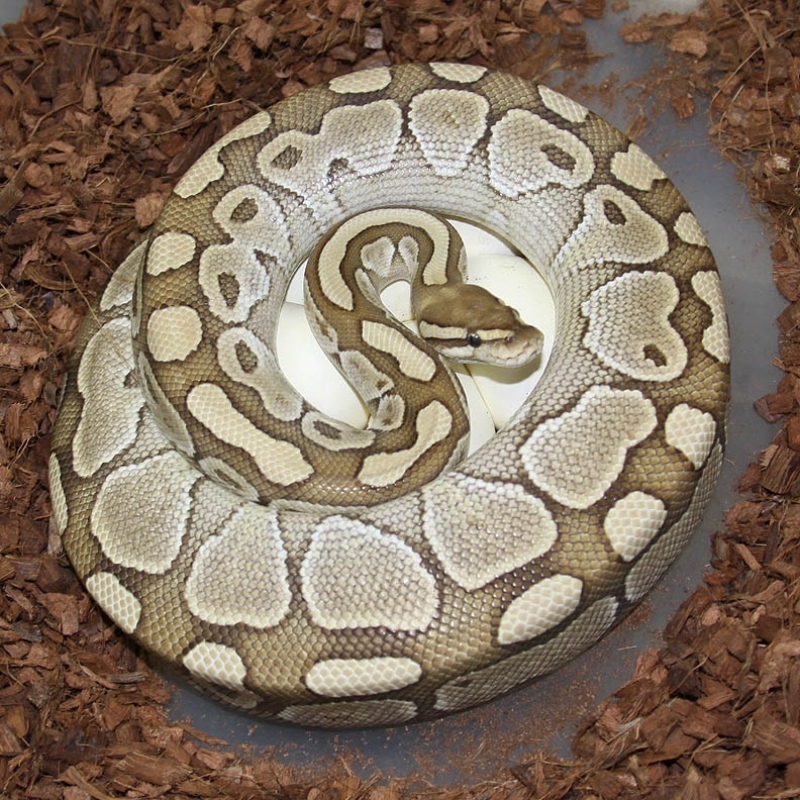 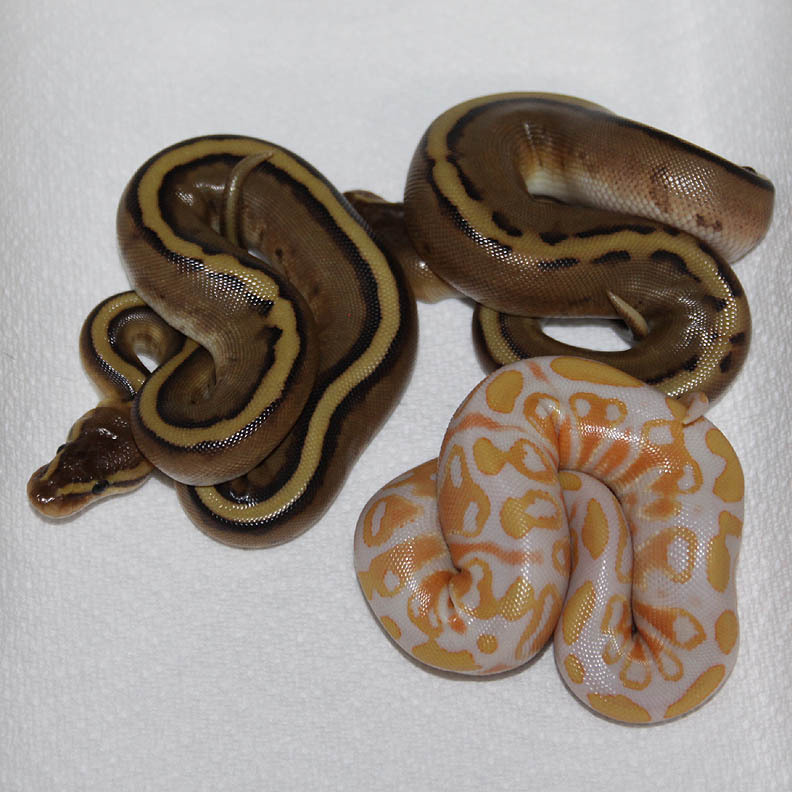 Description: Pastel Pinstripe Champagne Het Caramel 1/12 x Het Caramel 1/09. 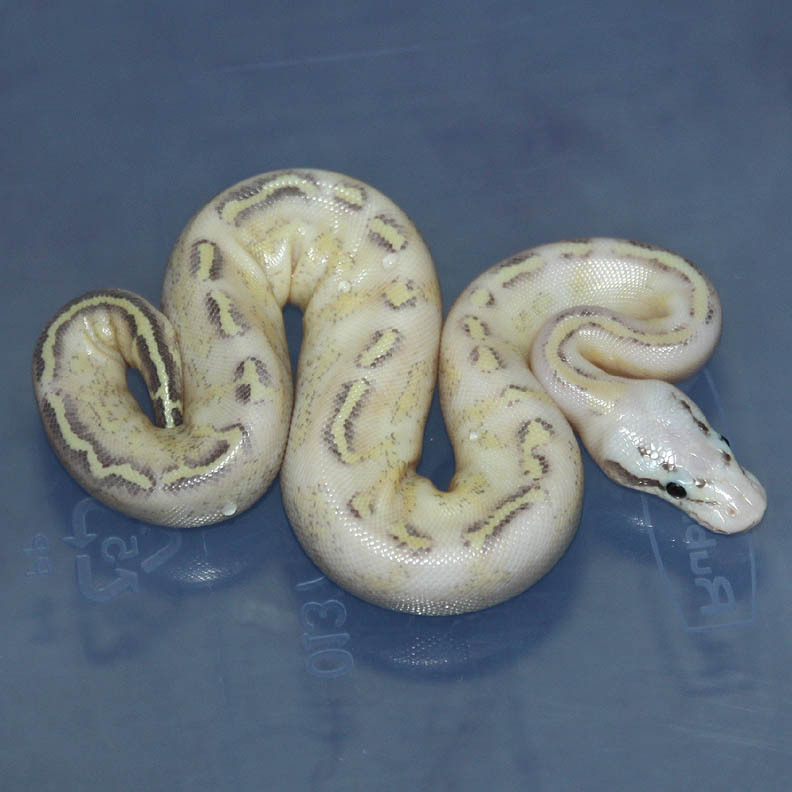 Description: Pastel Lavender Het Genetic Stripe 1/10 x Genetic Stripe HRA 2/11. 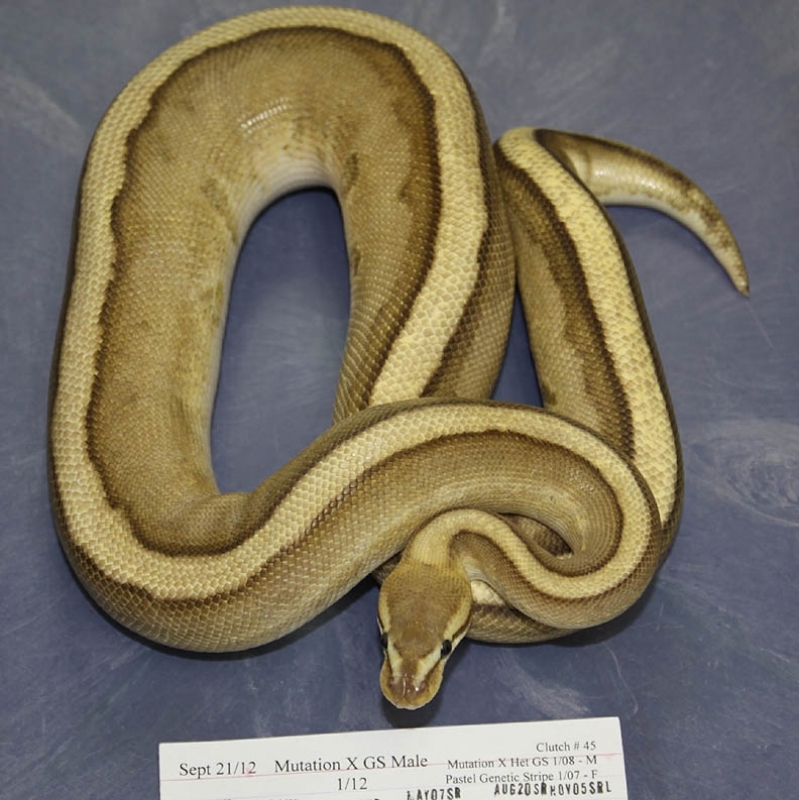 Description: Mutation X Genetic Stripe 1/12 x Red Axanthic PHGS 2/10. 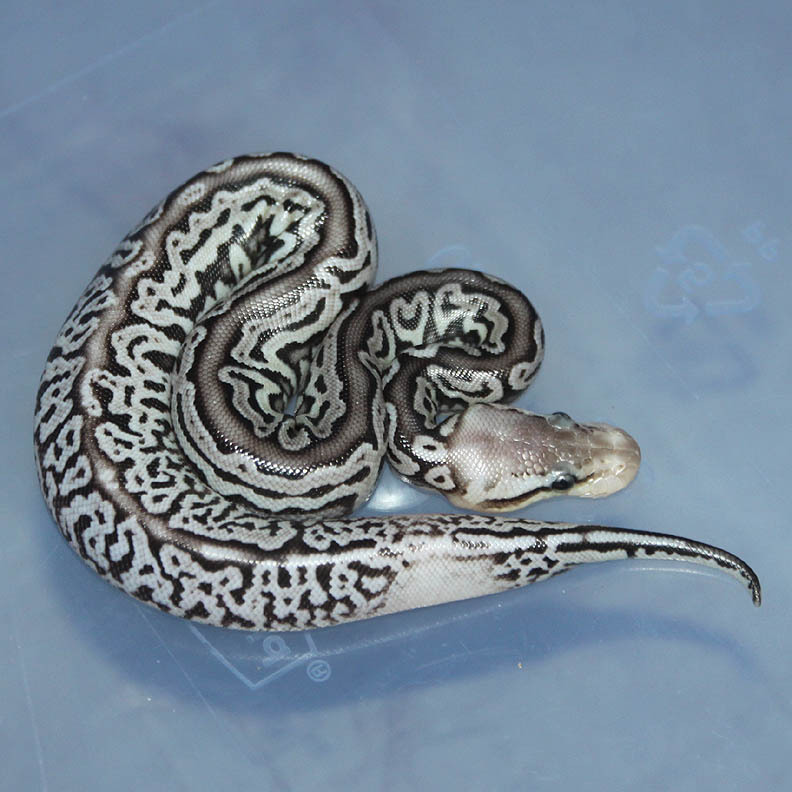 I really like the Mutation X GS HRA!!! 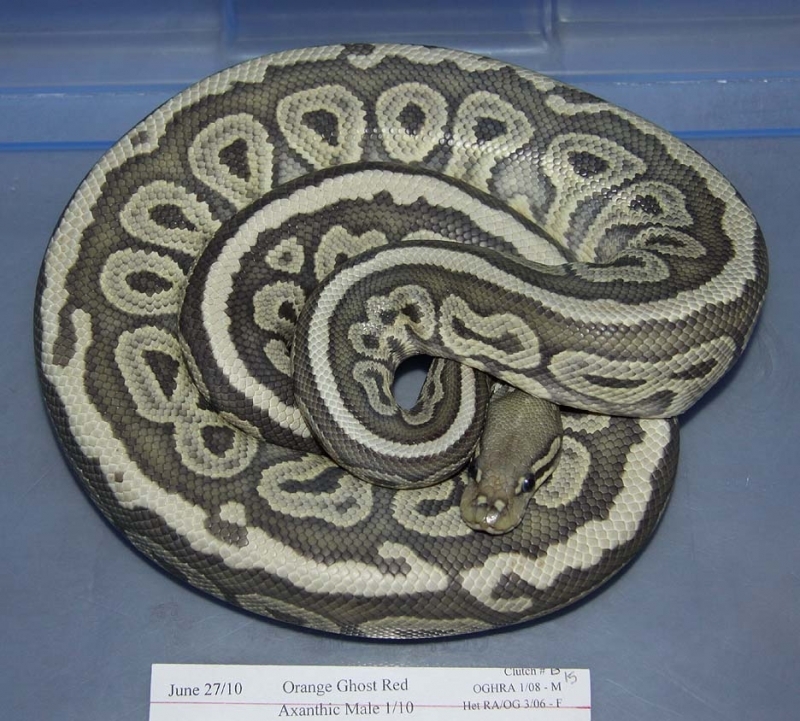 Description: Pastel Pin Champ HRA/OG 1/12 x DH OG/GG 1/11. 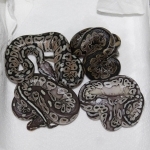 Description: Genetic Stripe Het Lavender 1/12 x Het Lavender PHGS 2/11. 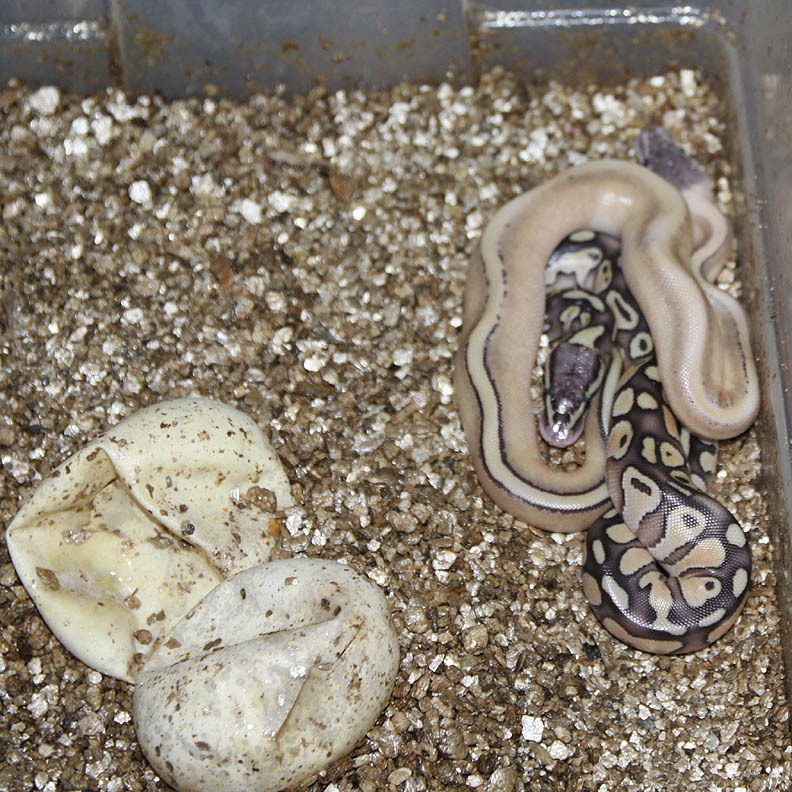 The mom proved out to be a Double Het Lavender/GS! I missed on the Lav GS but it's nice to know this female is a DH!! 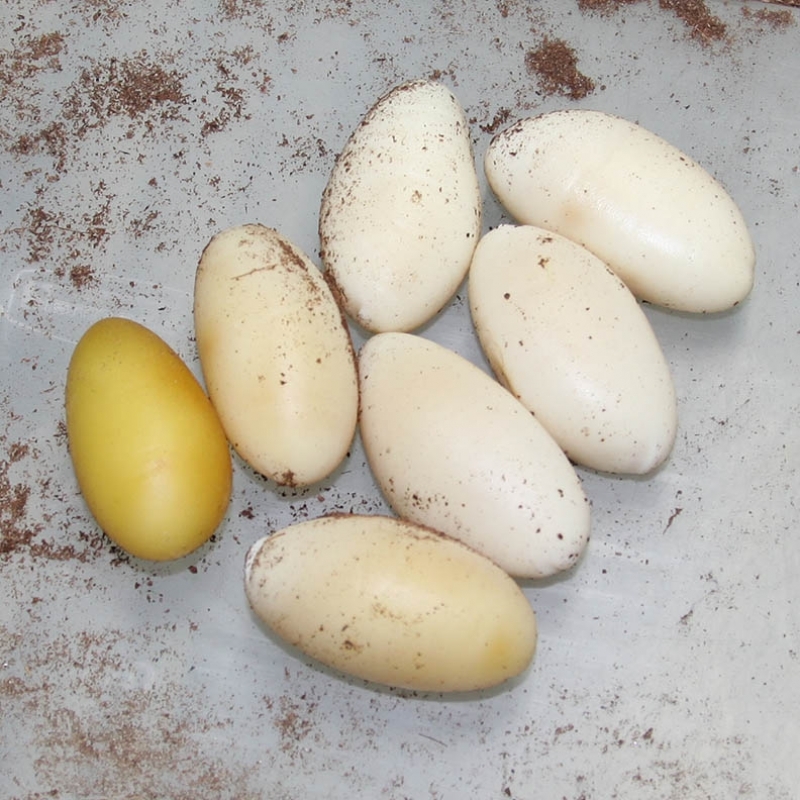 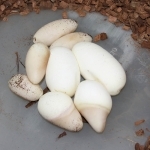 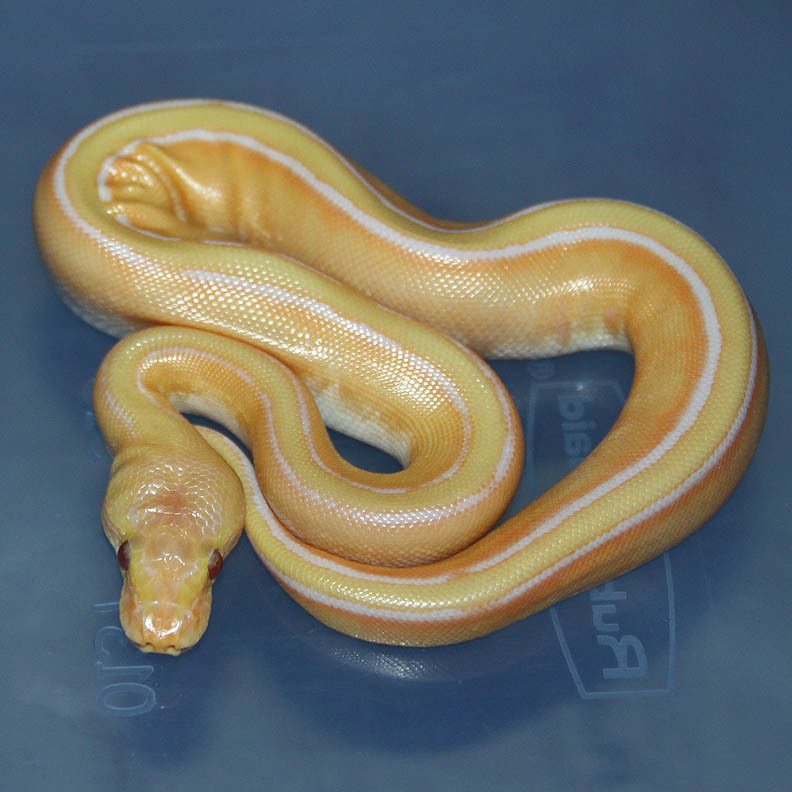 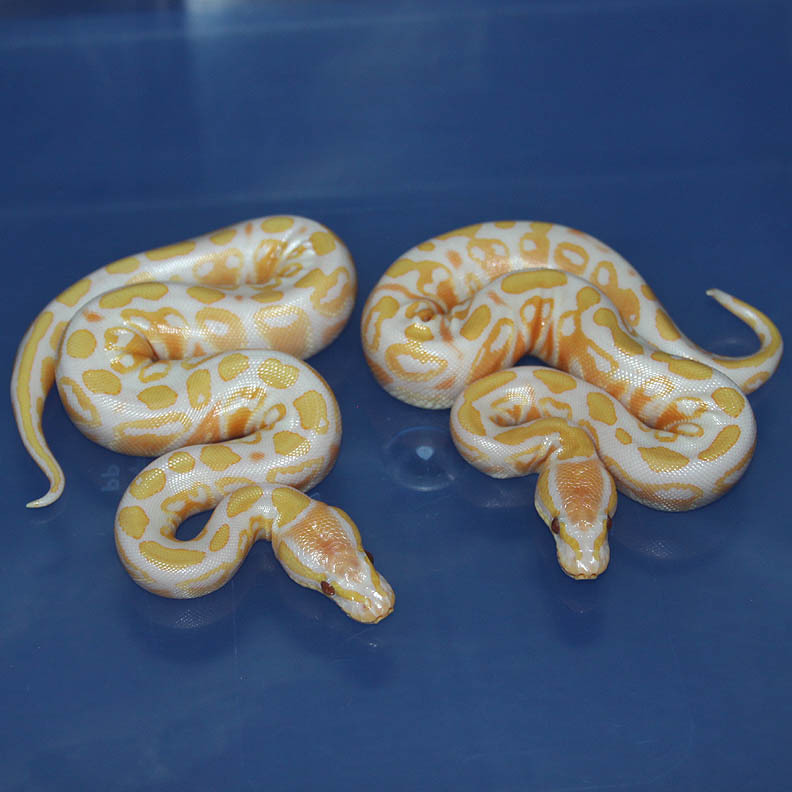 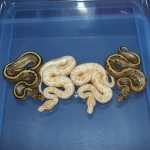 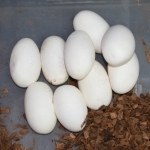 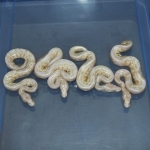 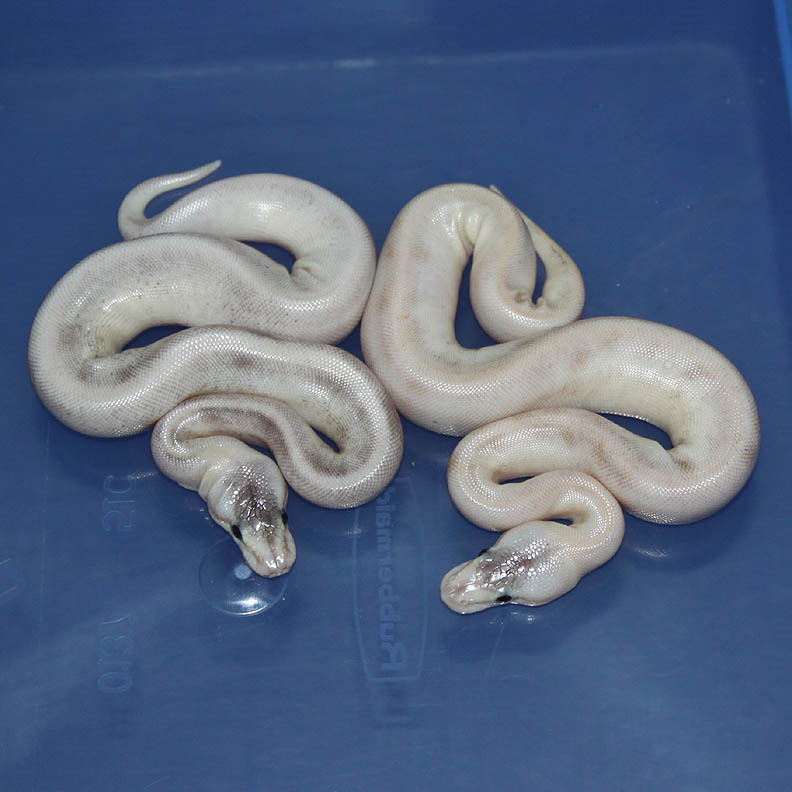 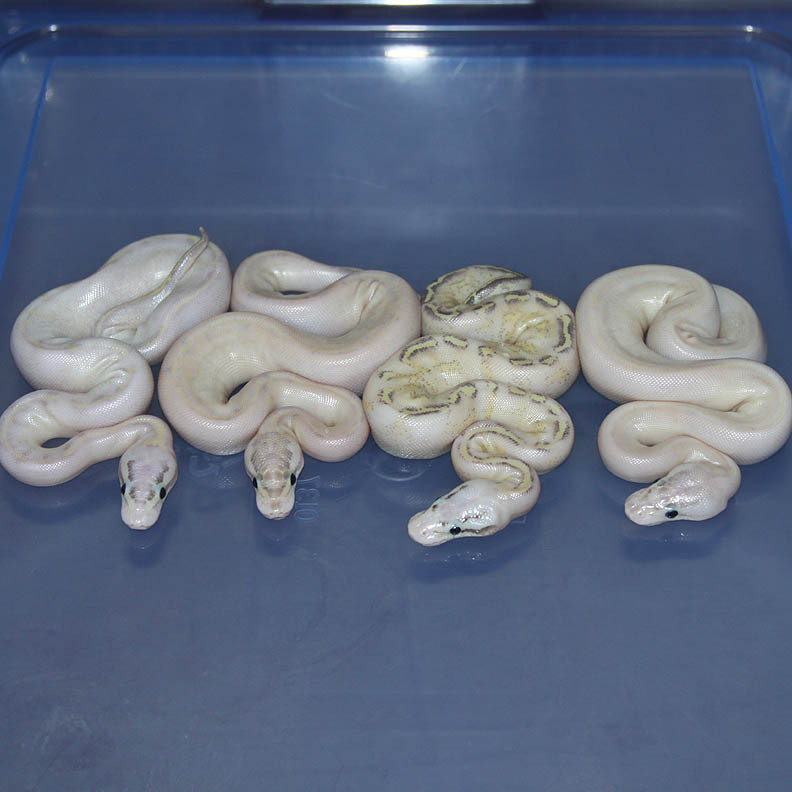 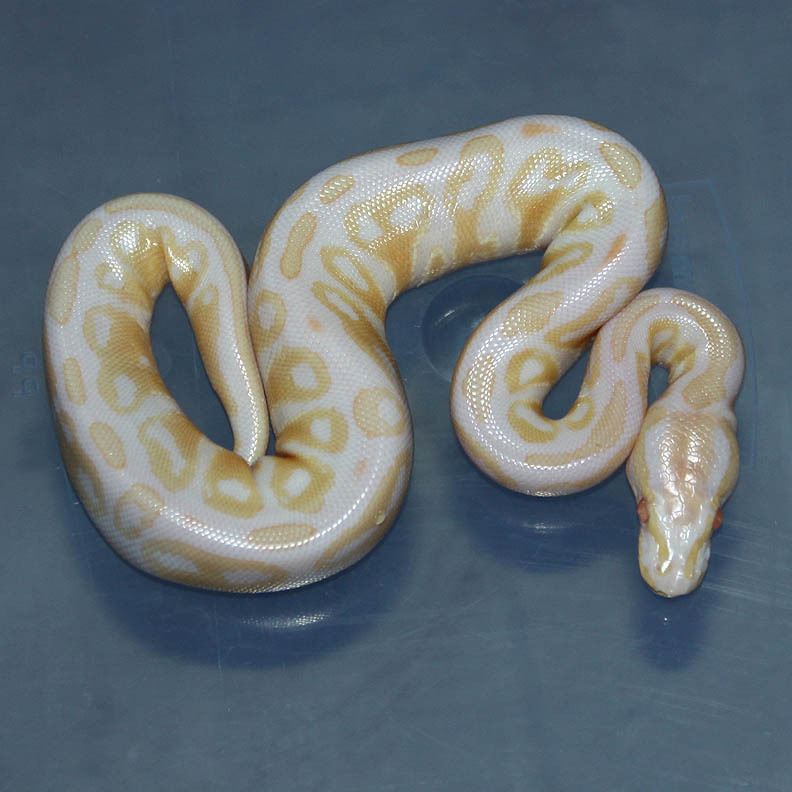 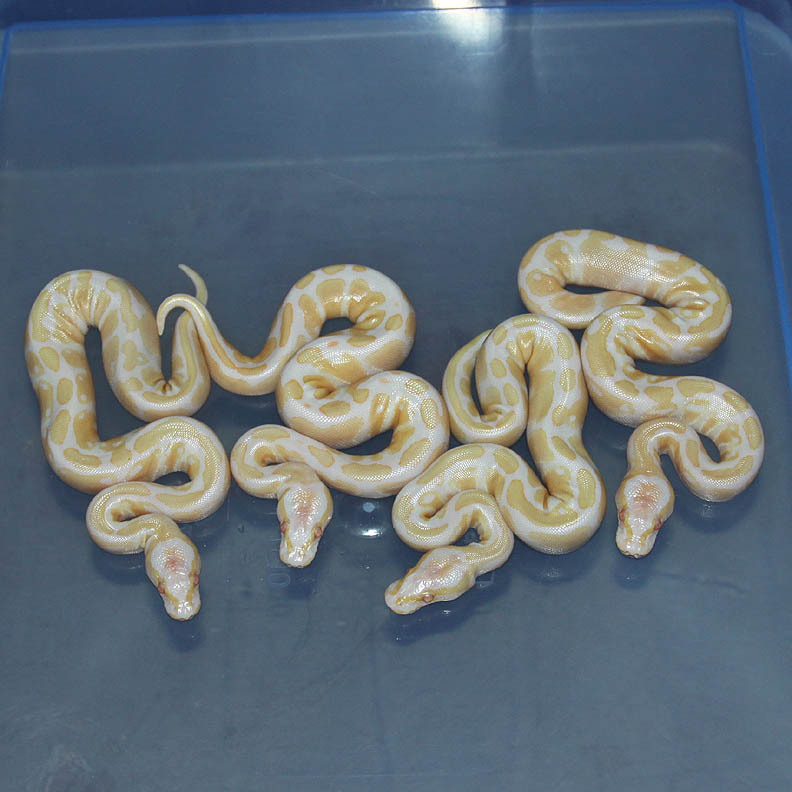 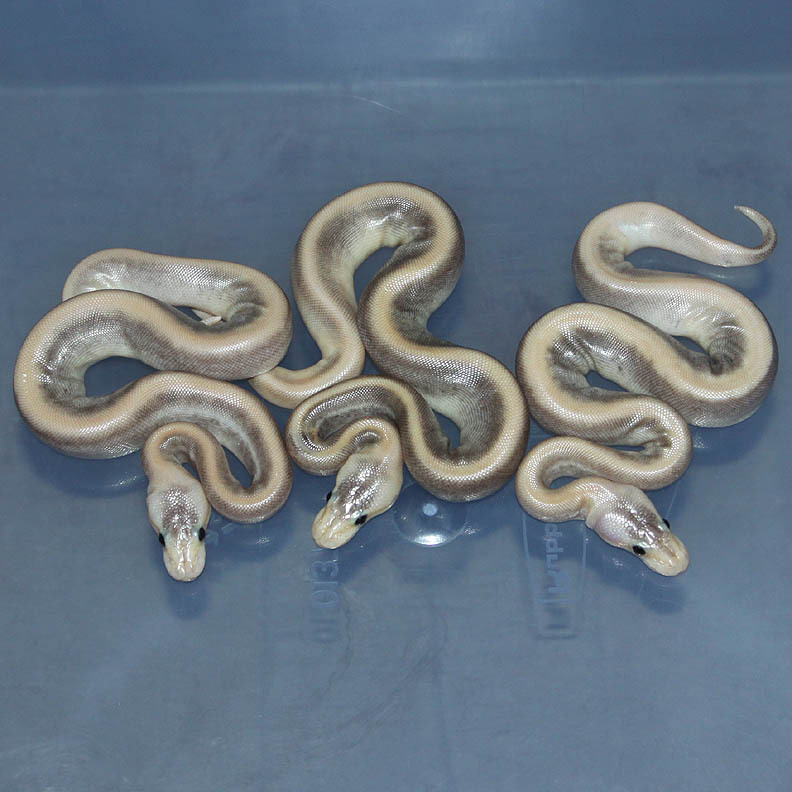 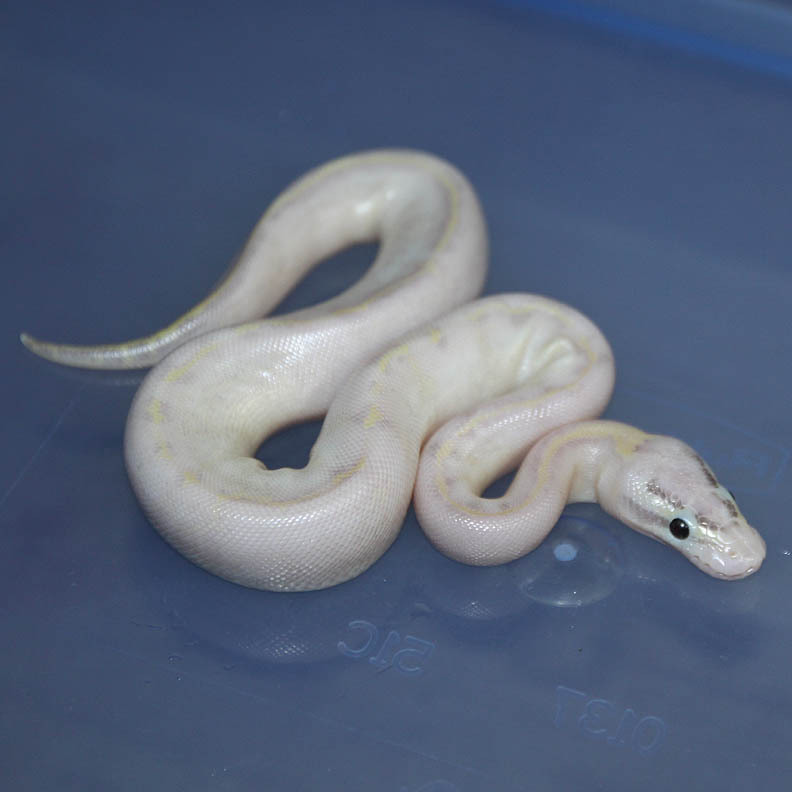 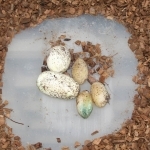 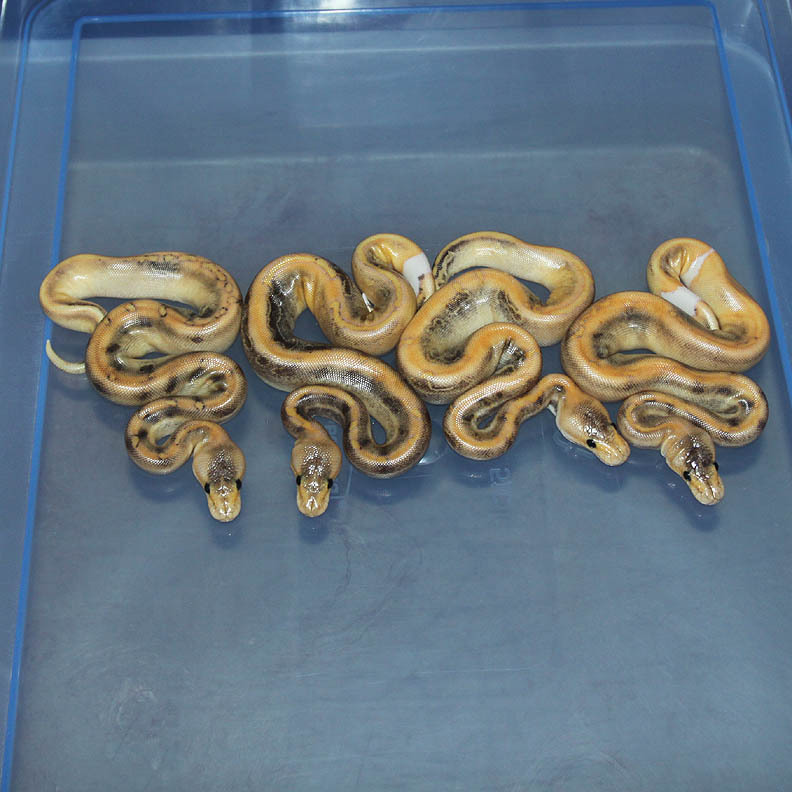 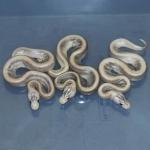 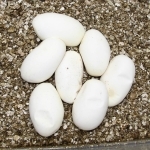 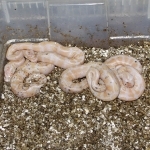 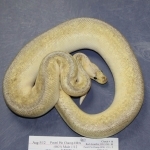 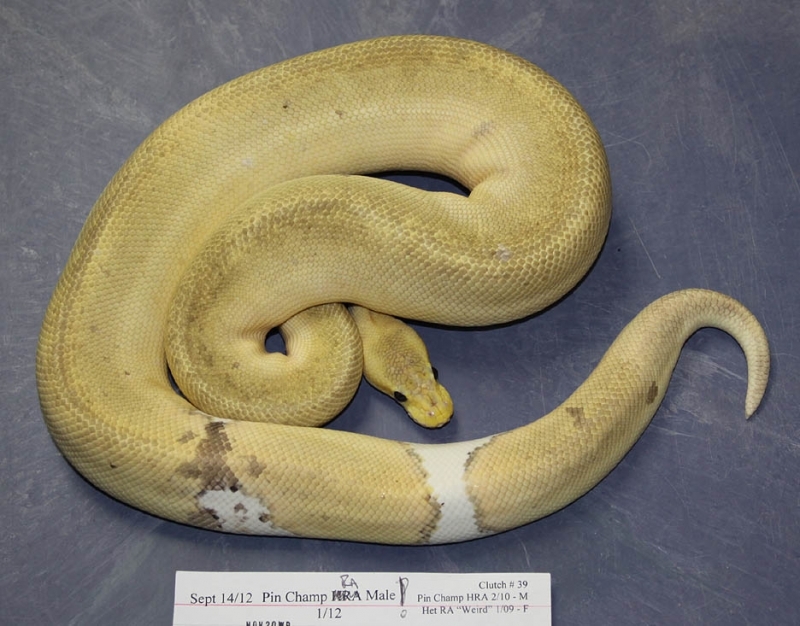 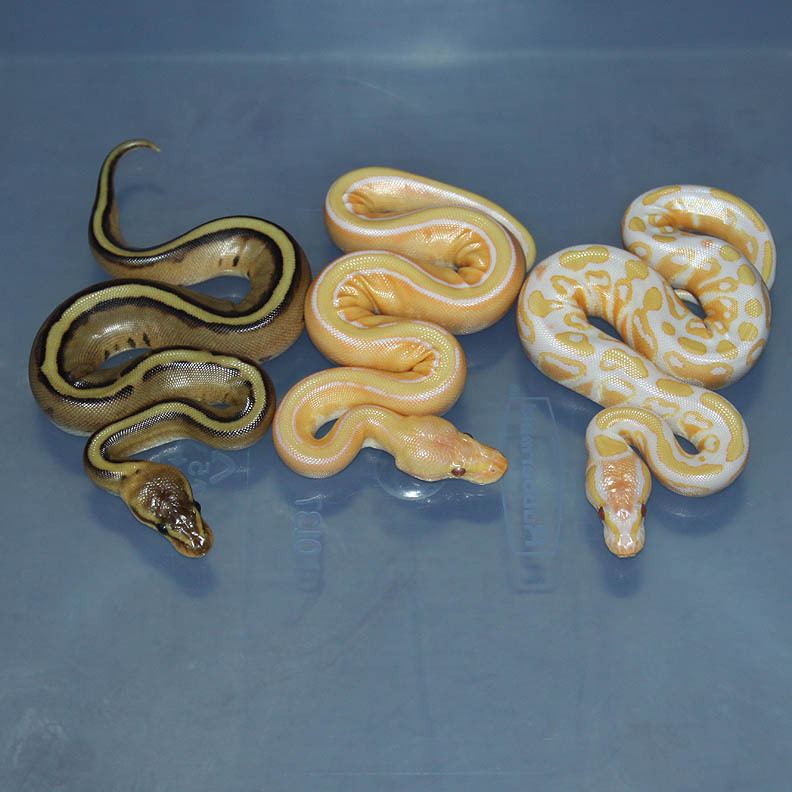 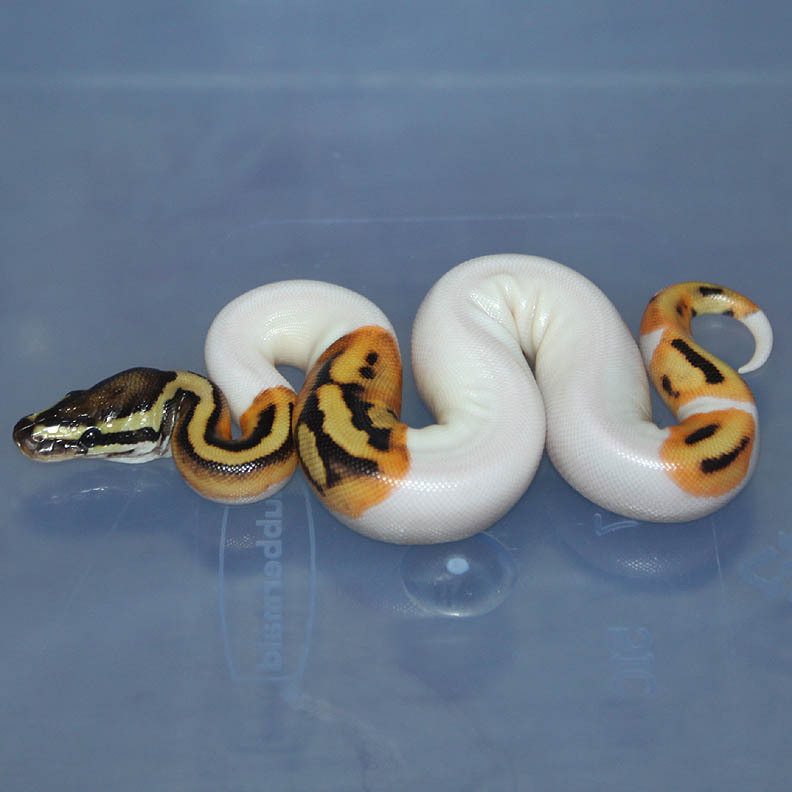 Description: Banded HRA 1/11 x Pastel Champagne PH Banded 1/11. 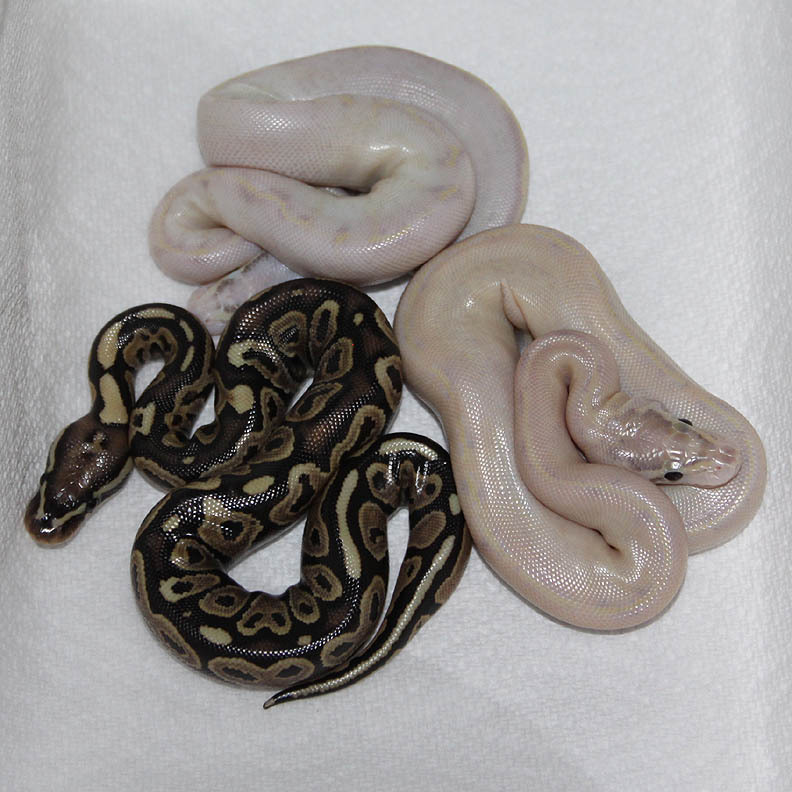 Description: Pastel Chocolate HRA 2/11 x Chocolate HRA 4/11. One of the slugs popped and made a mess everywhere. 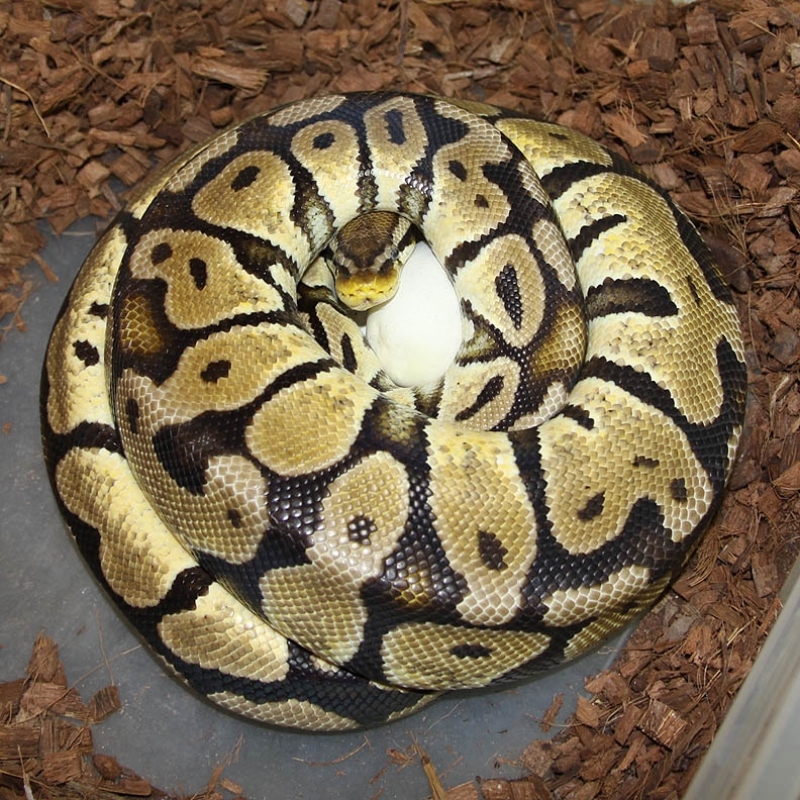 I hate when that happens. 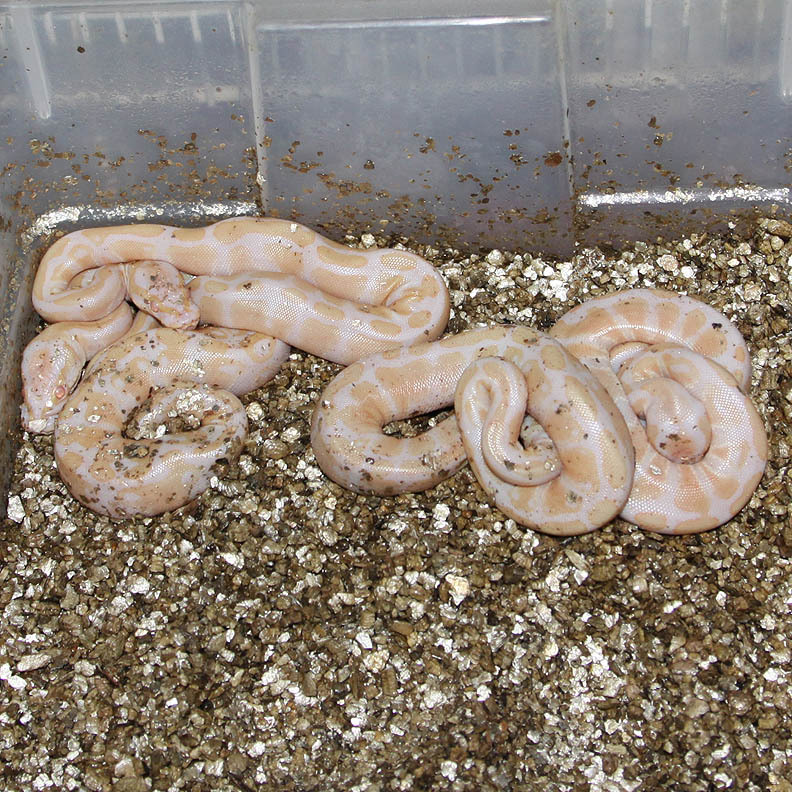 Mega gross!!!! 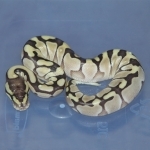 Description: Lesser Ivory 3/12 x Genetic Stripe "Perfect" 3/10. 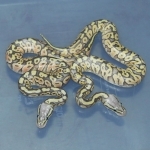 Description: Pastel Lesser DH GG/GS 2/11 x DH GG/GS 1/10. 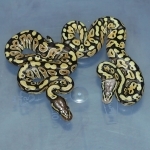 Description: Granite 1/12 x Granite 1/06. 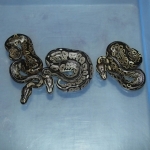 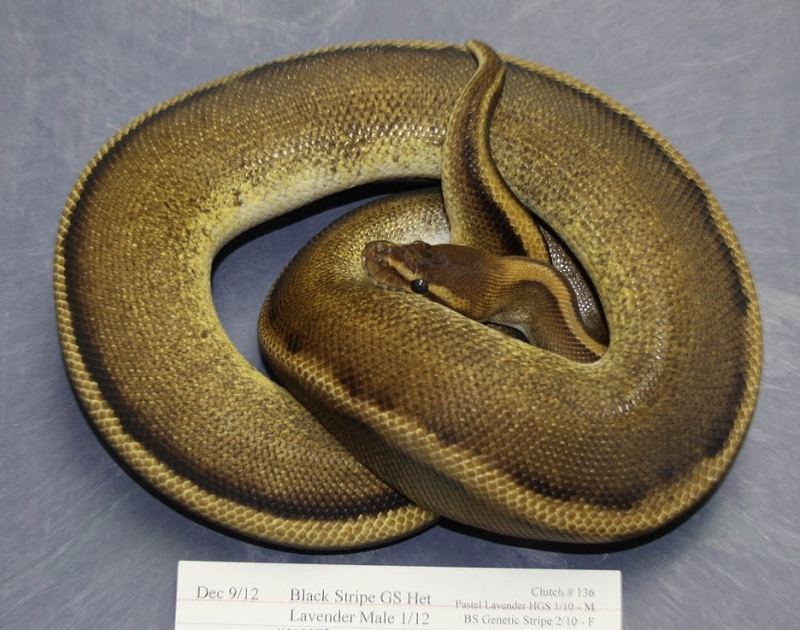 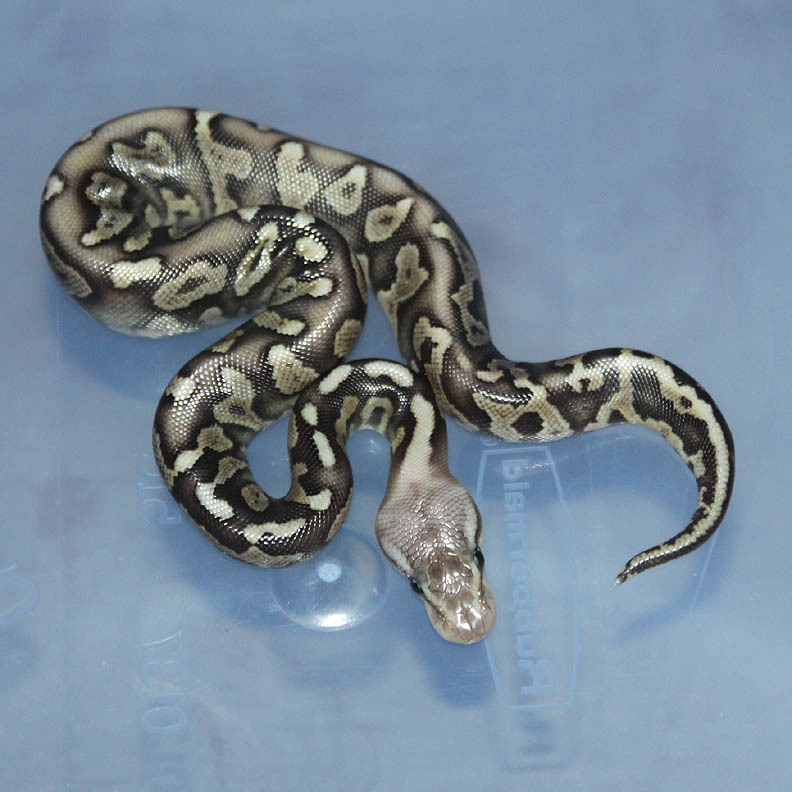 Description: Lesser GS HRA 1/12 x Pastel Het GS 5/07. 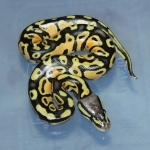 Description: Citrus Puma 1/11 x Het RA YB 1/10. 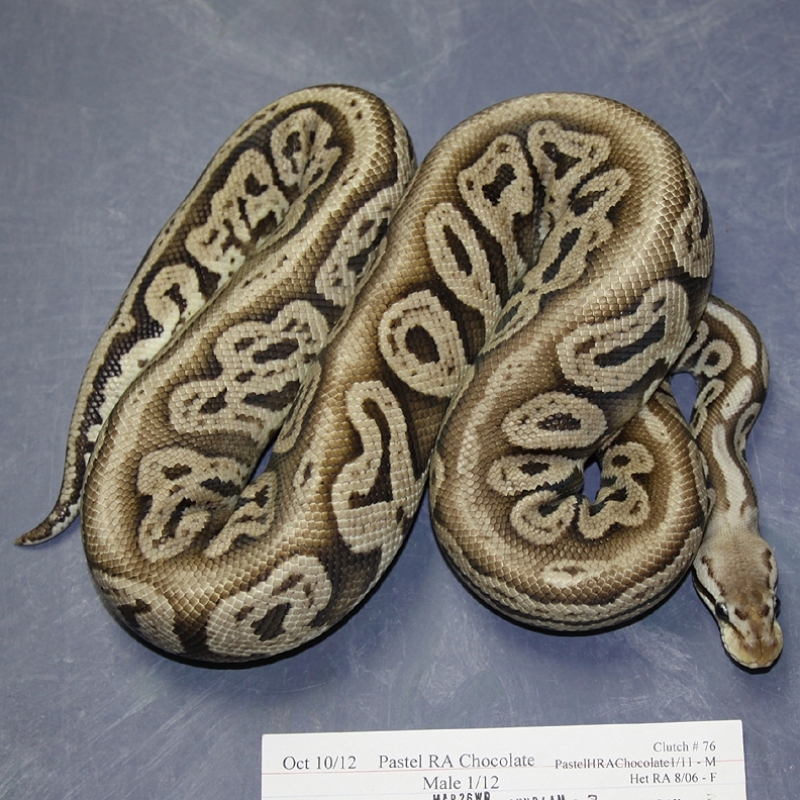 Description: Pastel Chocolate HRA 1/11 x Chocolate 8/11. 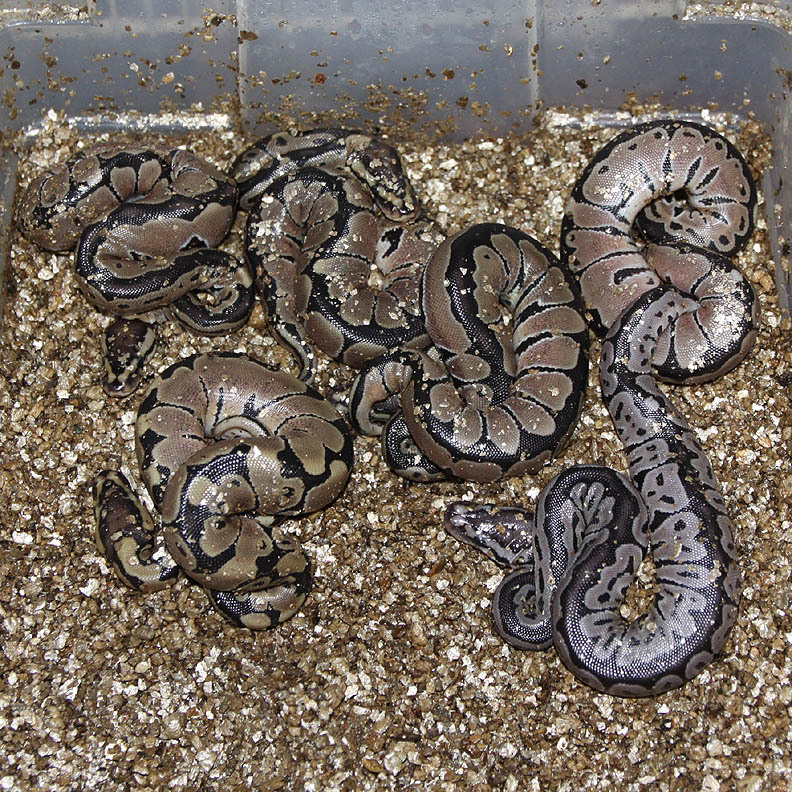 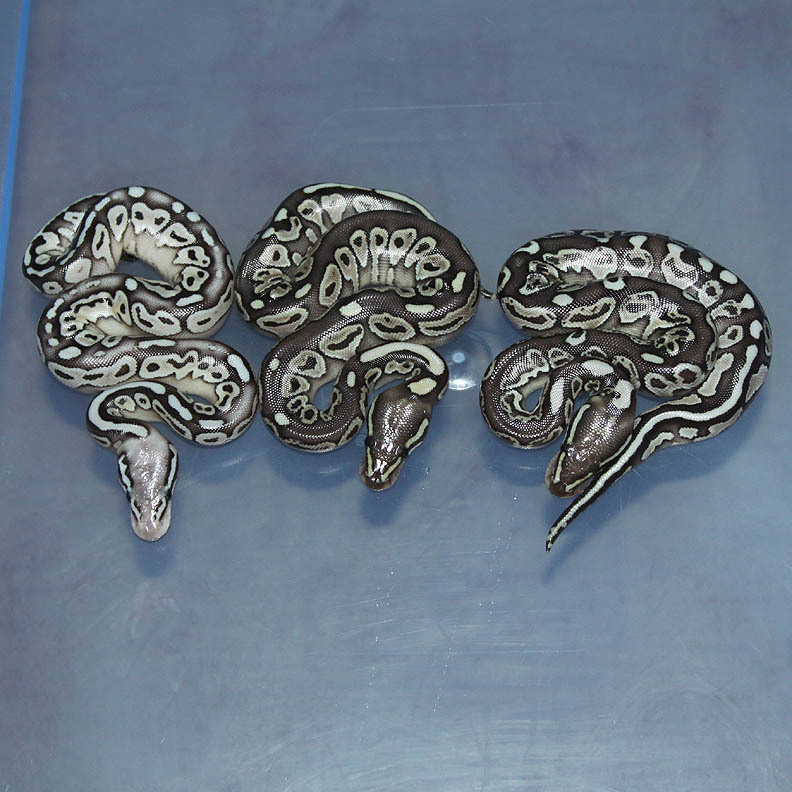 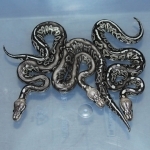 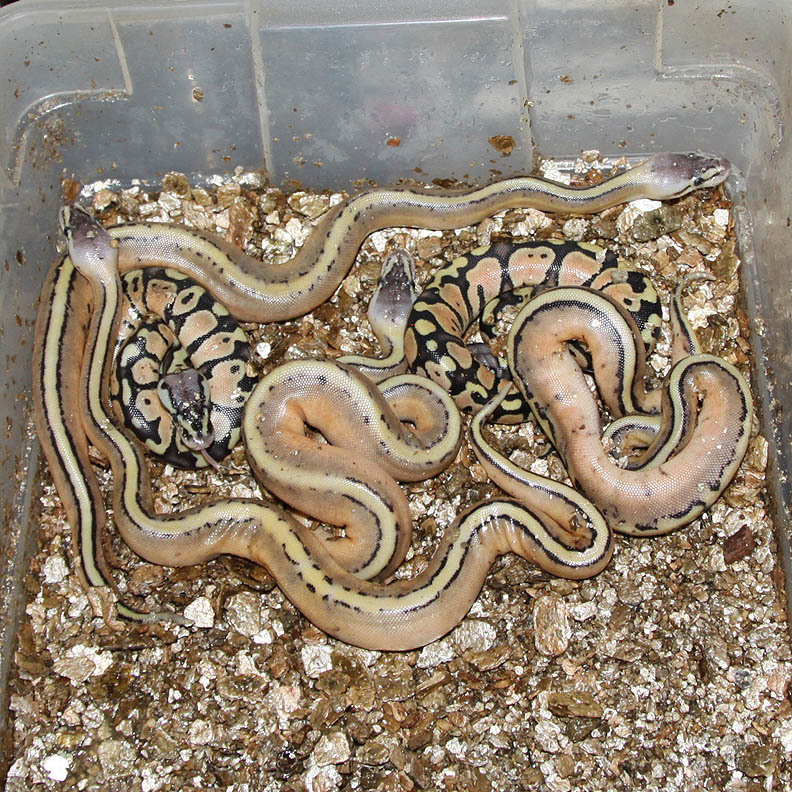 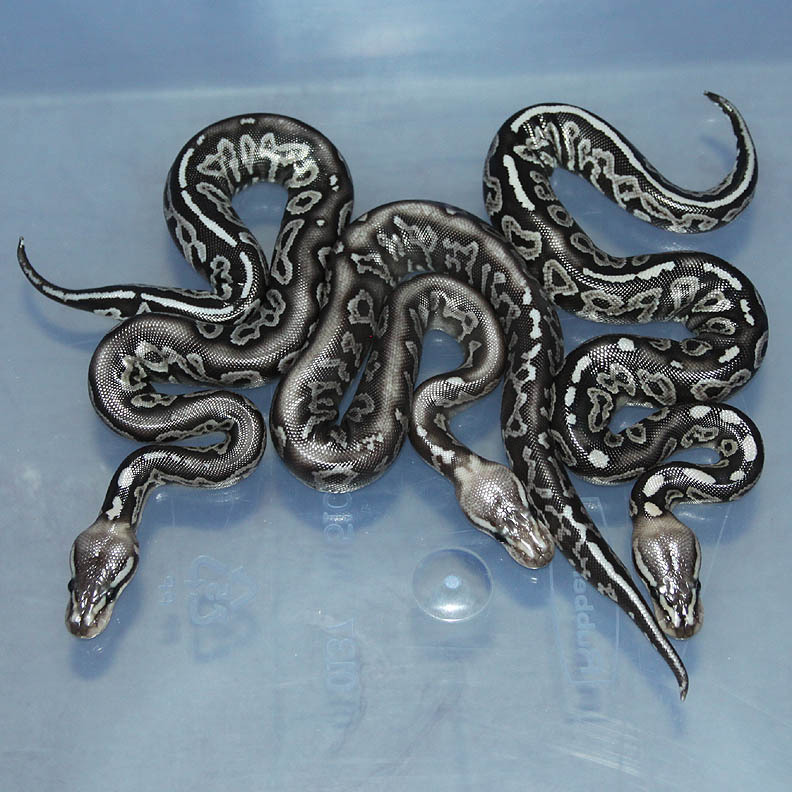 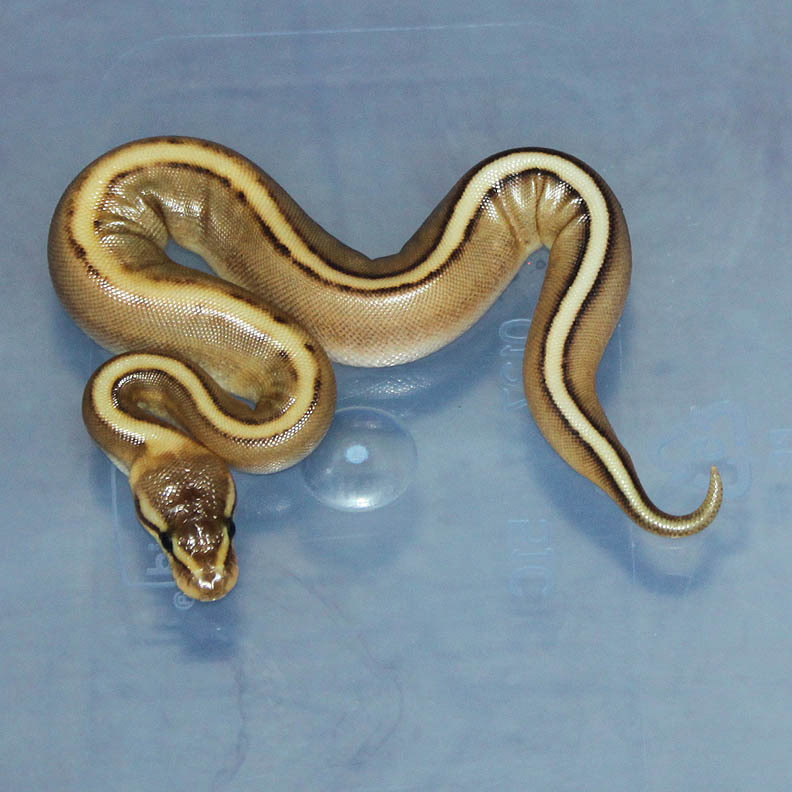 Description: Black Stripe Genetic Stripe Het Lavender 1/12 x Het Lavender PHGS 4/11. 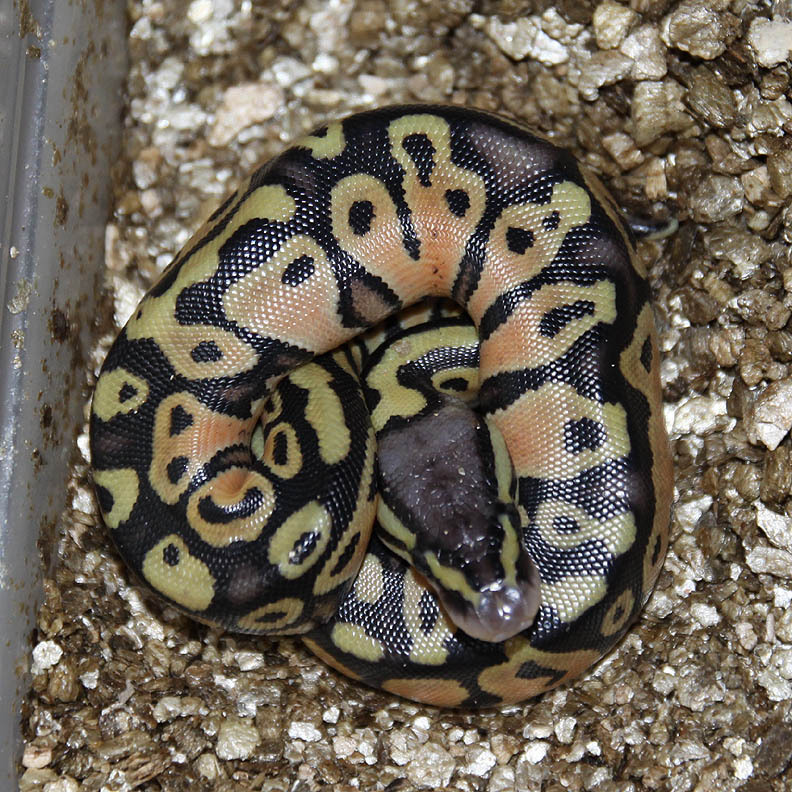 Another of the pos het females proves out and I got my male!!!! 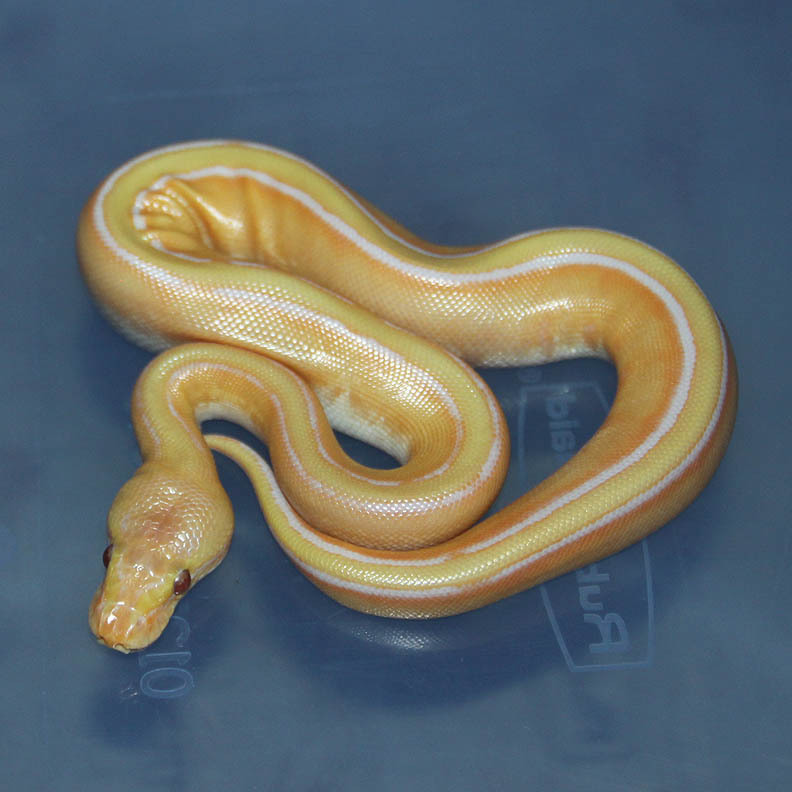 This guy is awesome in person. 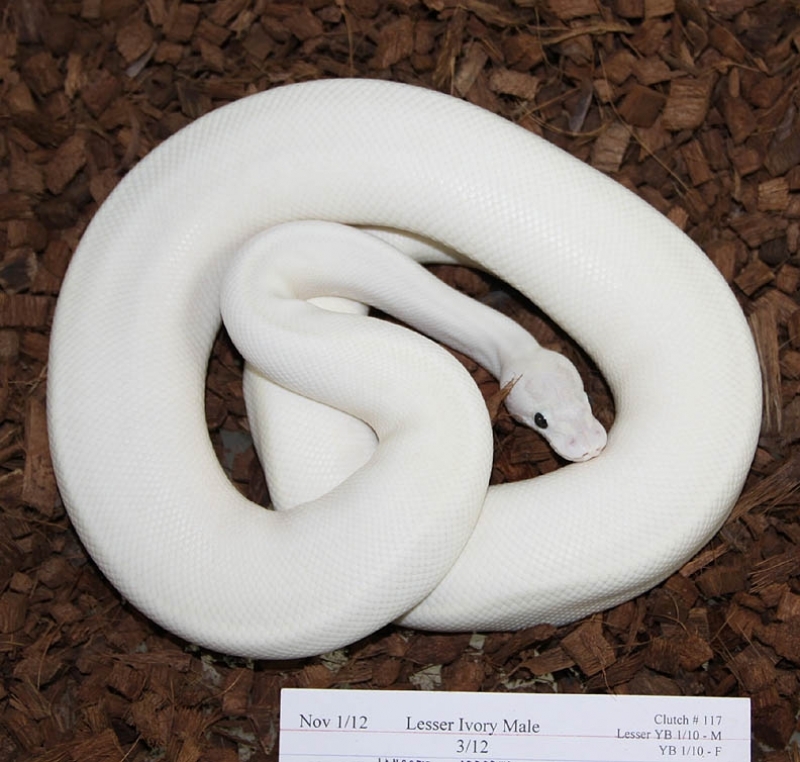 I'm over the moon with him! 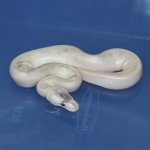 Description: Pastel DH OG/GS 1/11 x Lesser DH OG/GS 1/11. 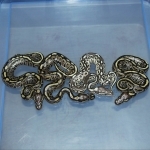 Description: Pastel GS HRA 2/11 x Het GS 9/07. 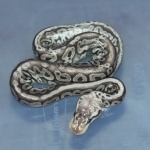 Description: Lavender Het Pied 1/12 x Pied 2/10. 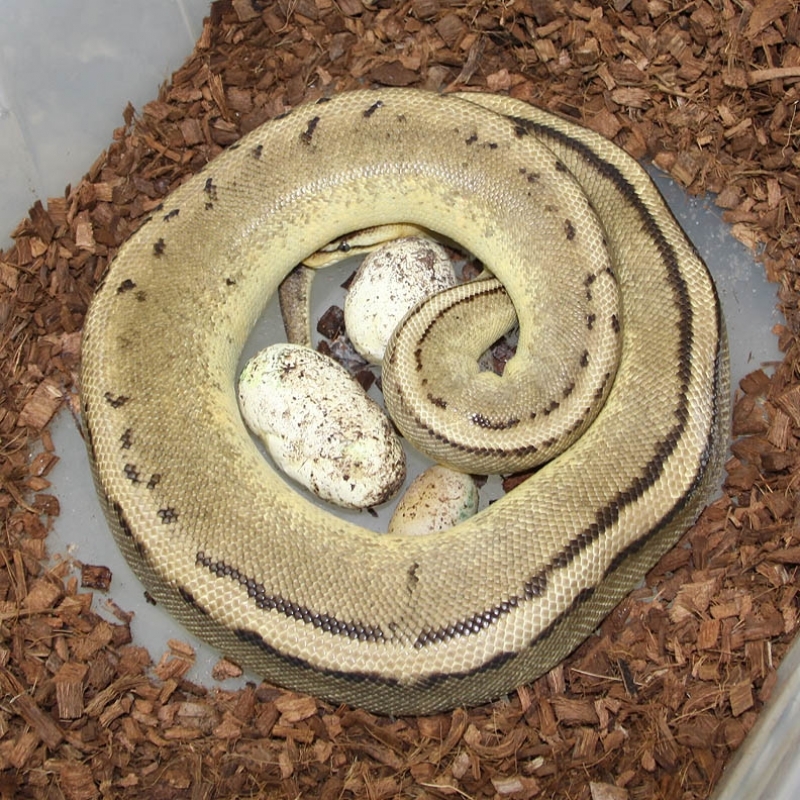 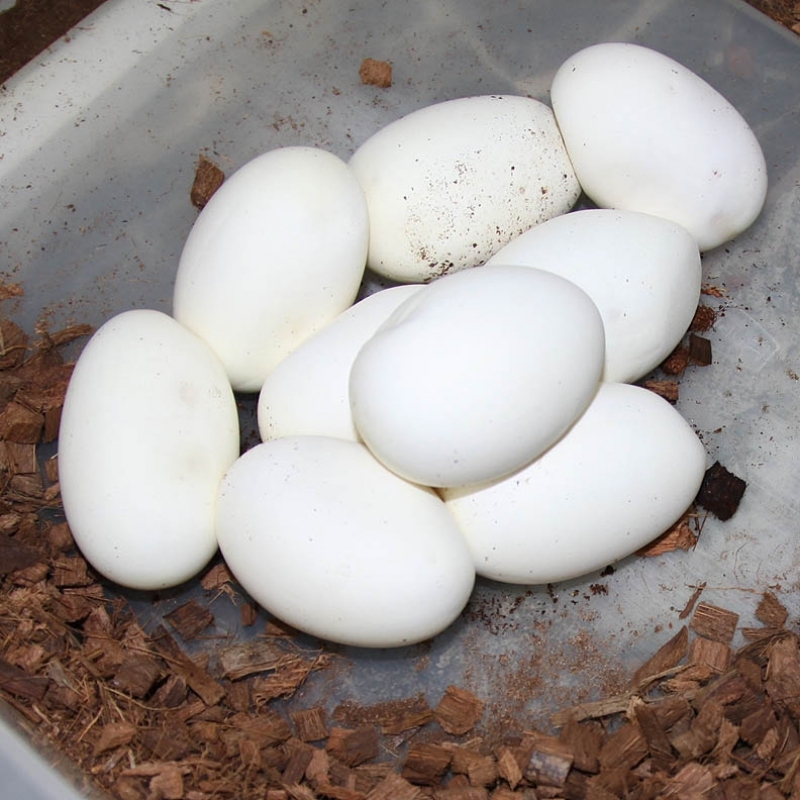 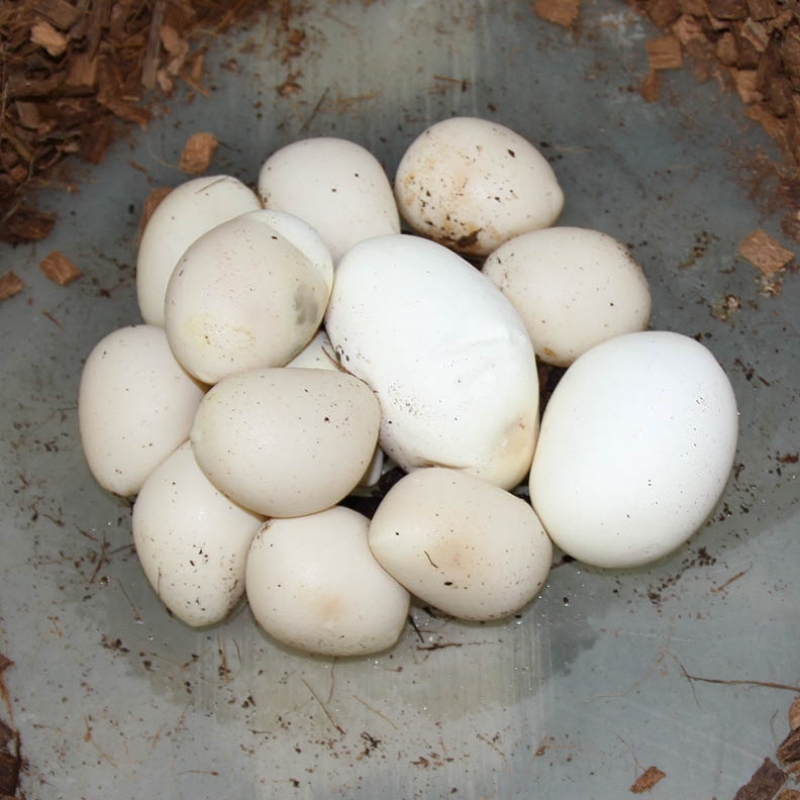 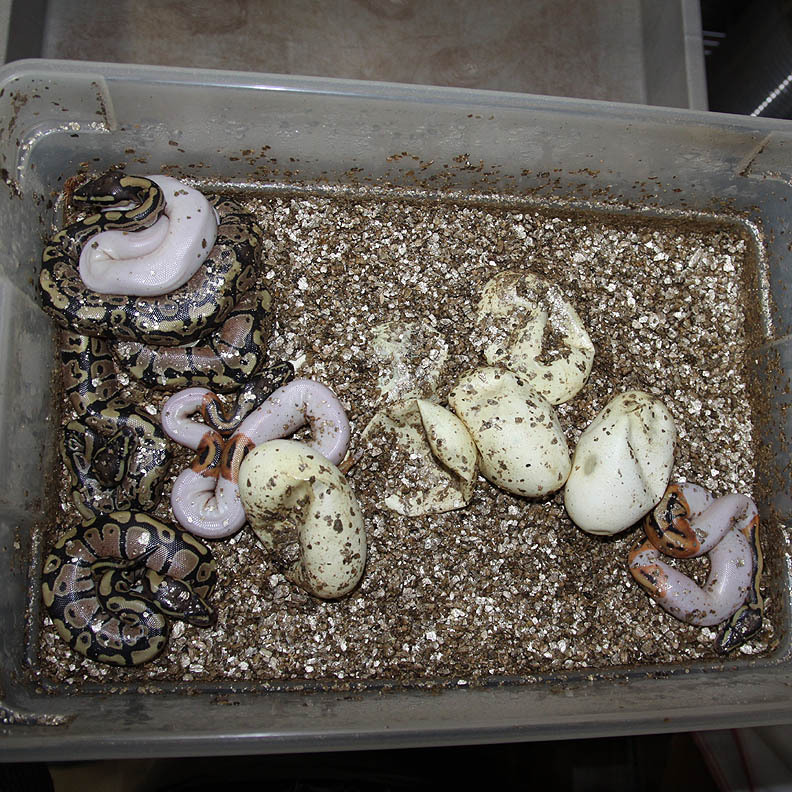 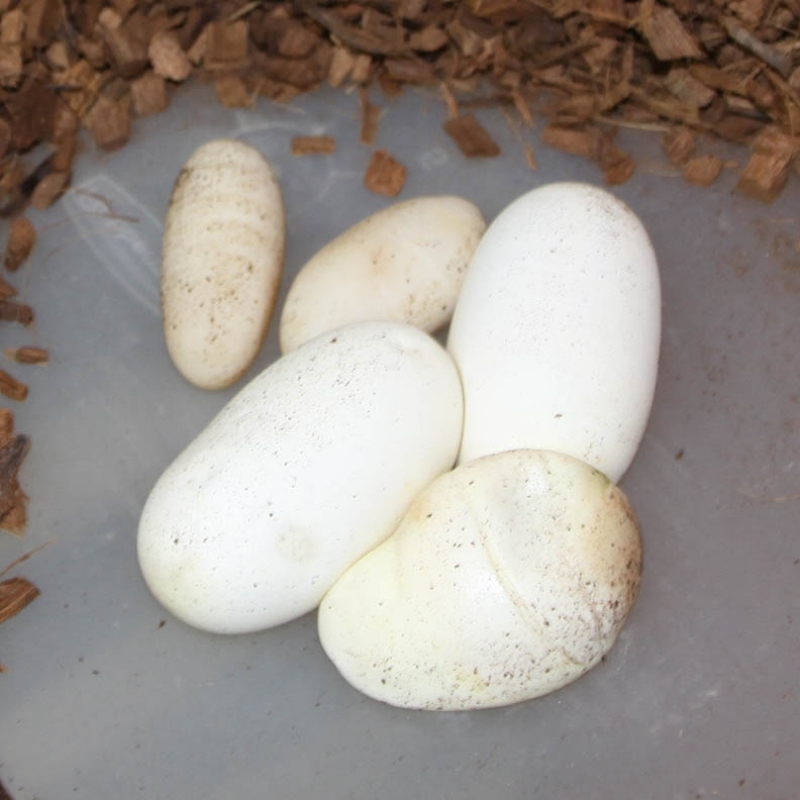 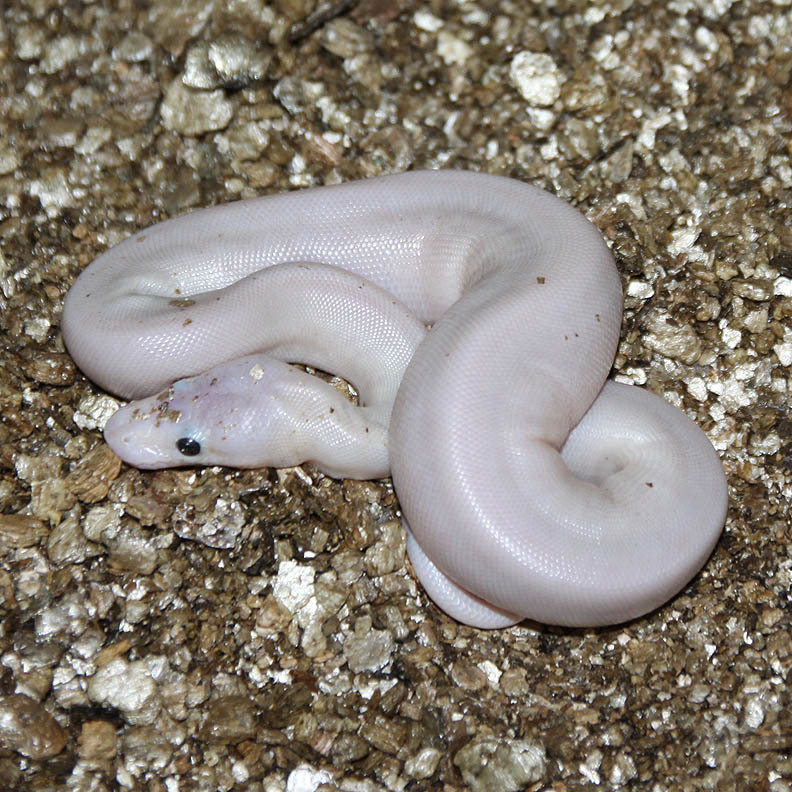 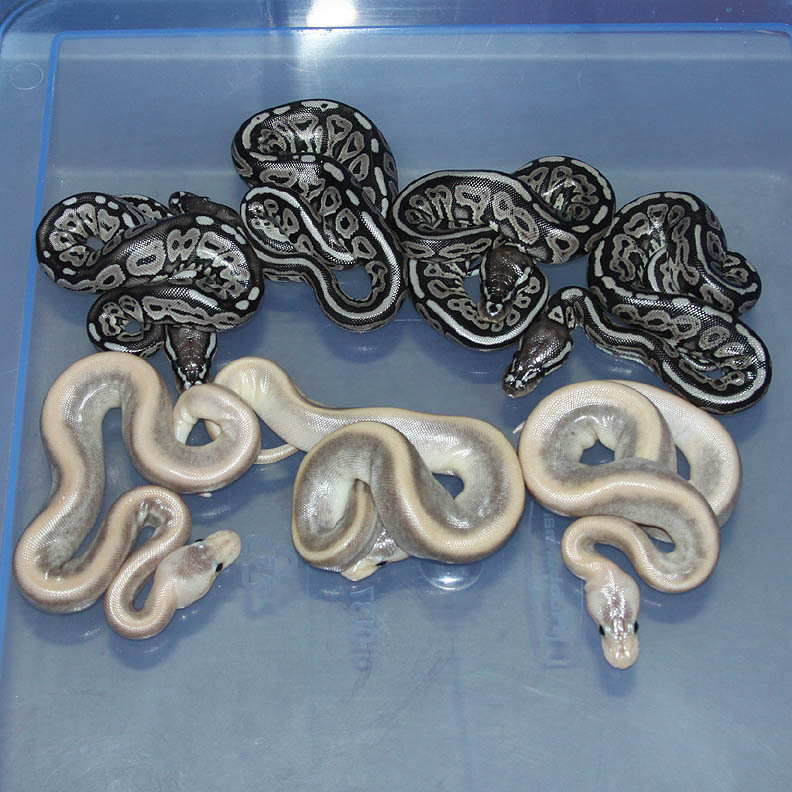 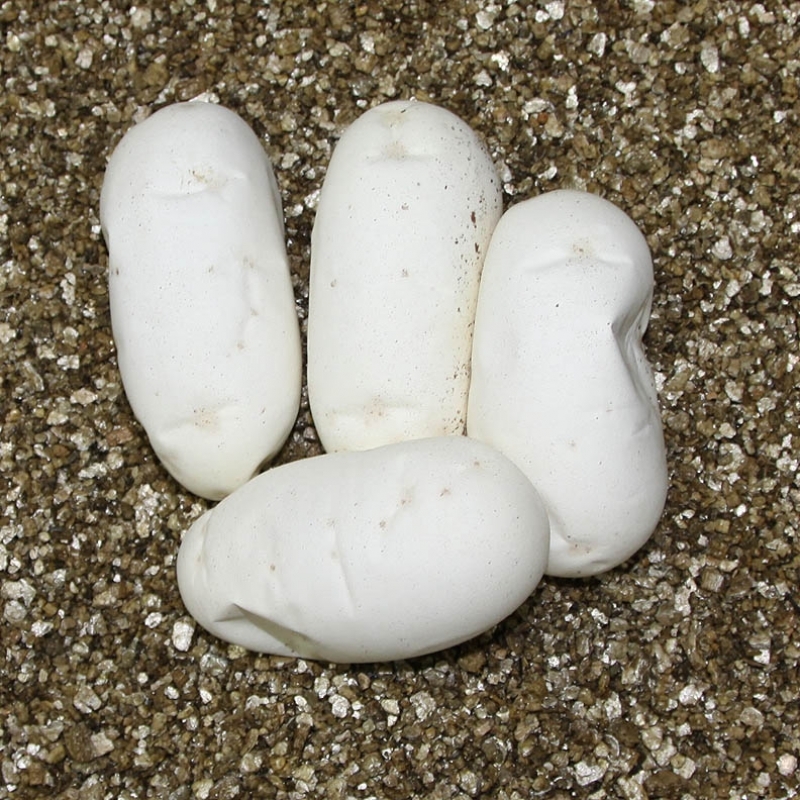 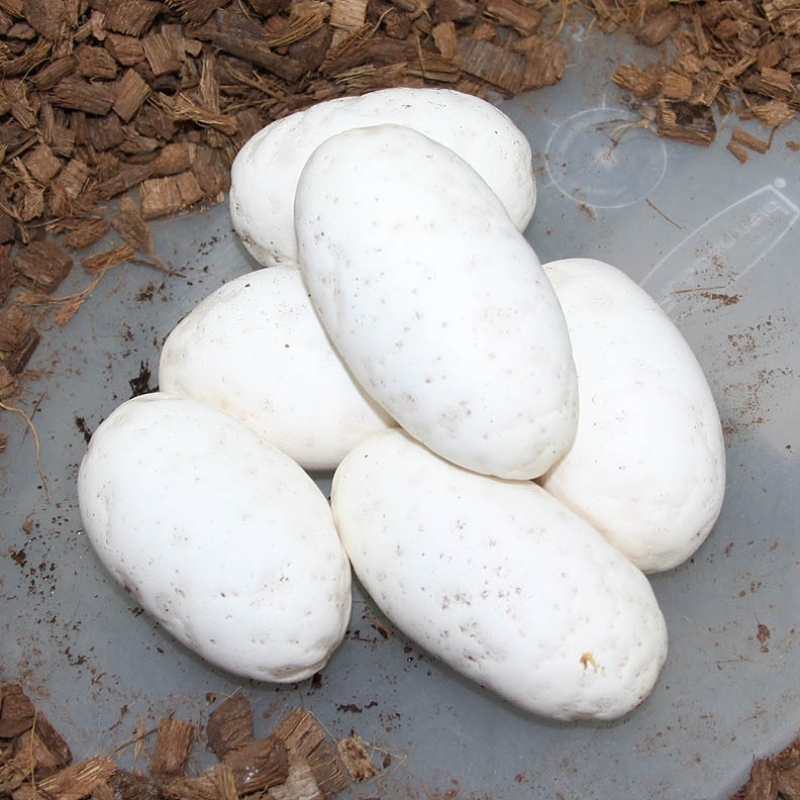 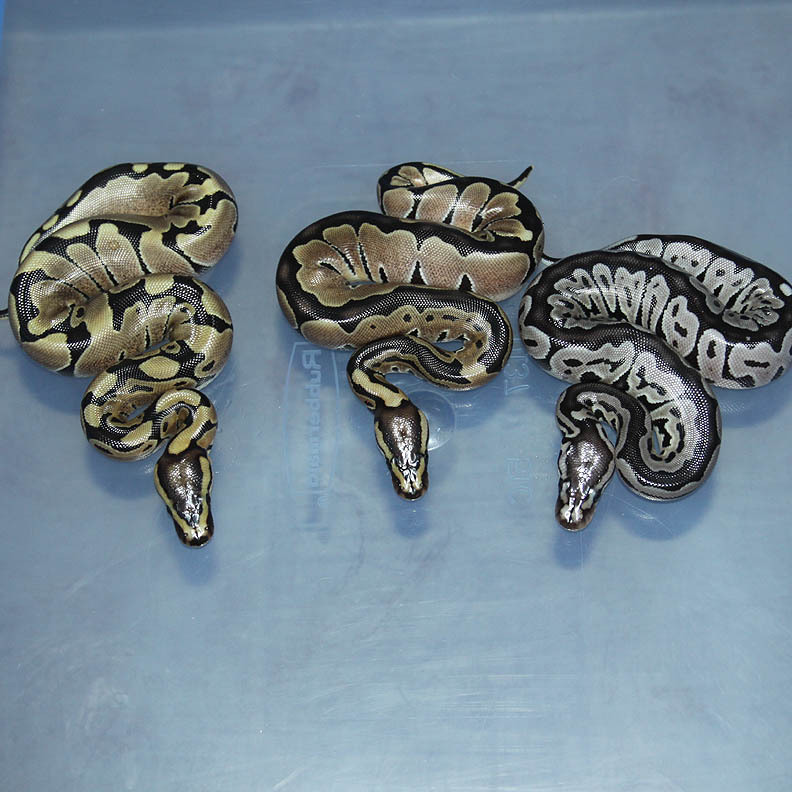 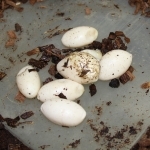 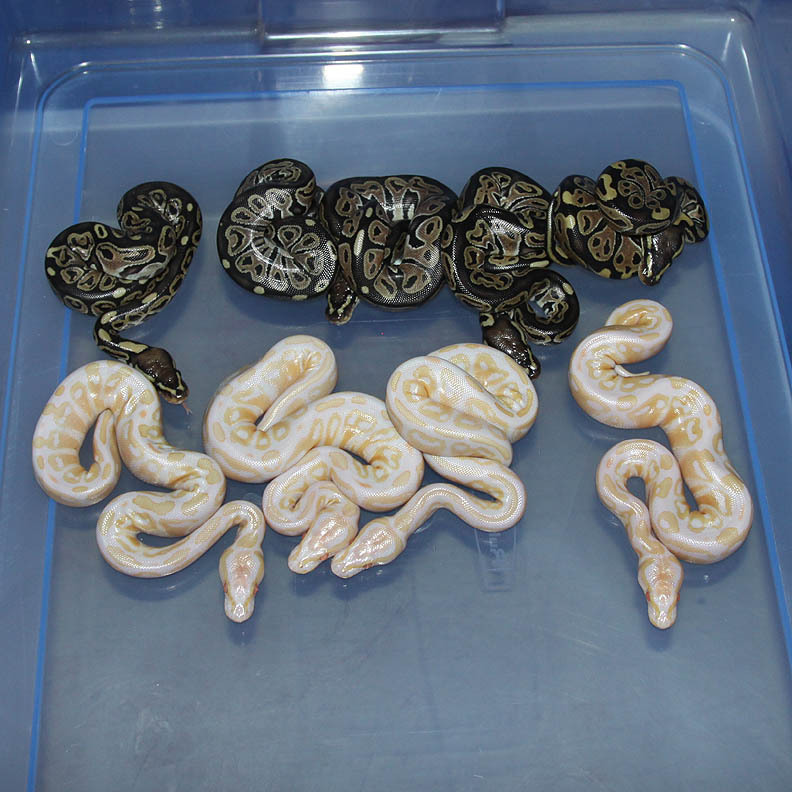 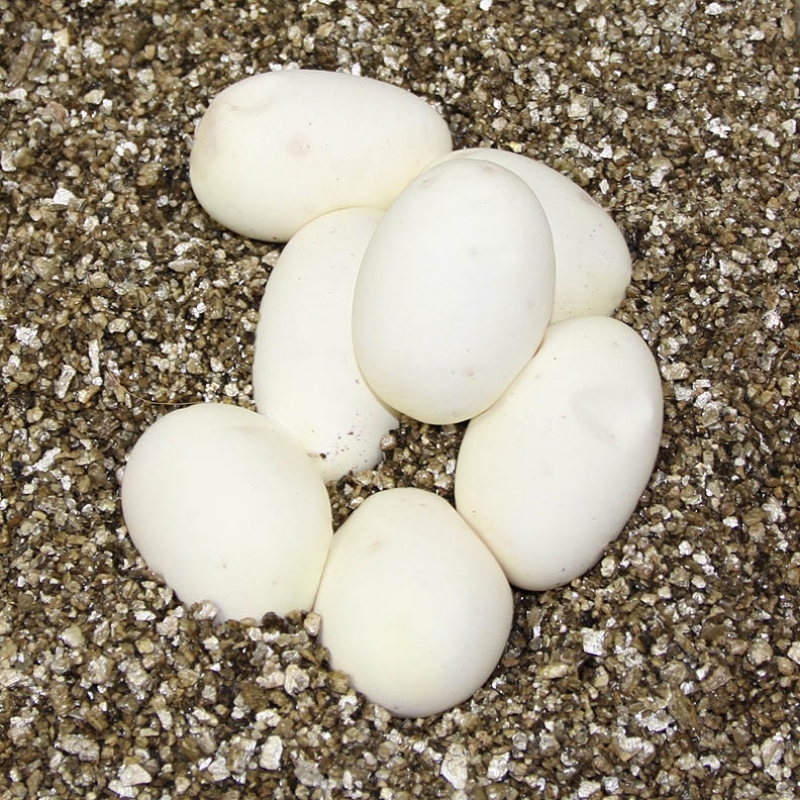 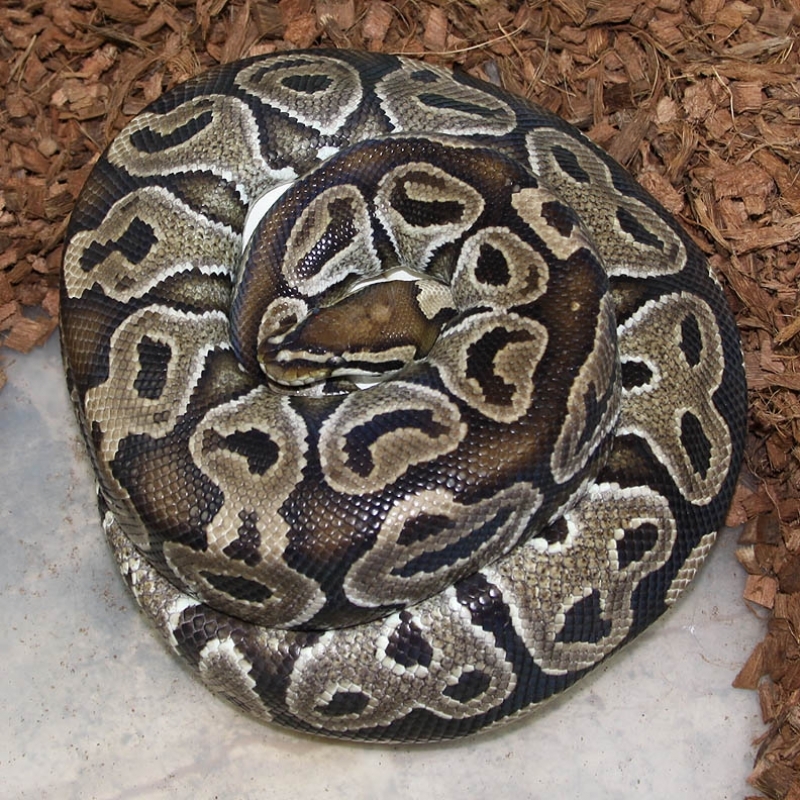 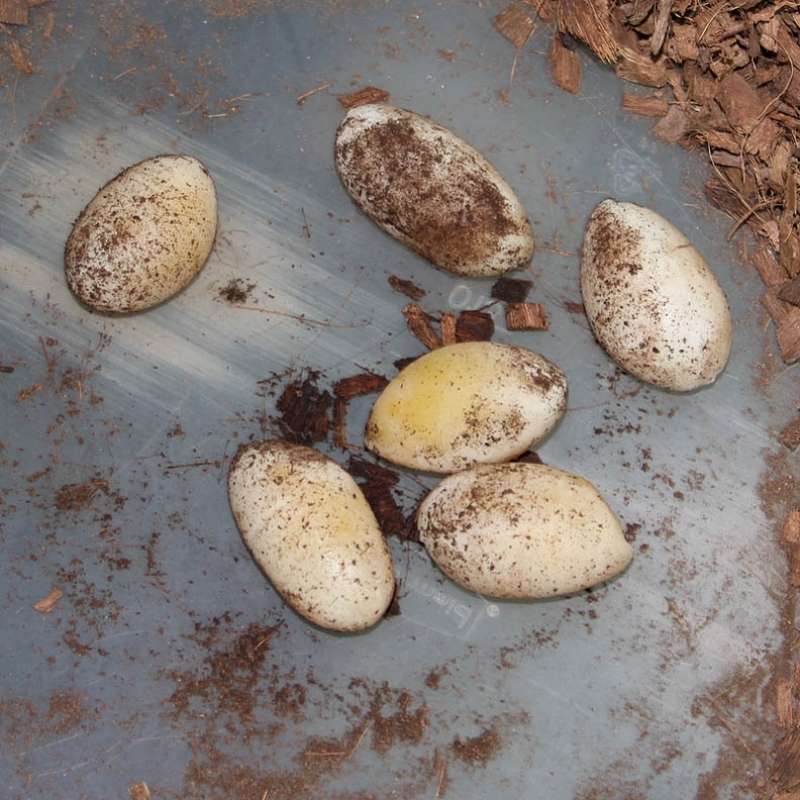 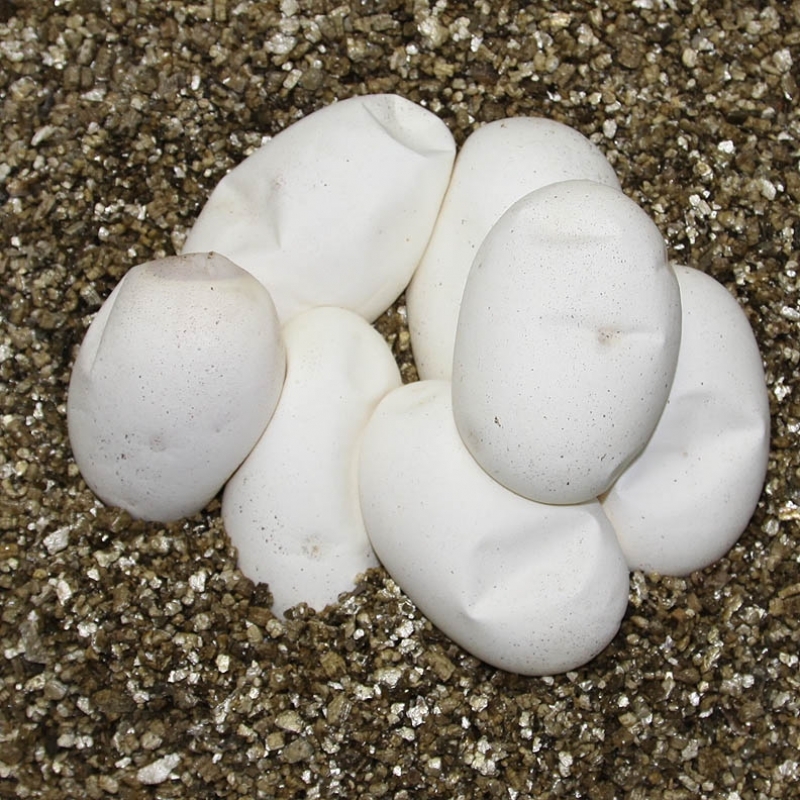 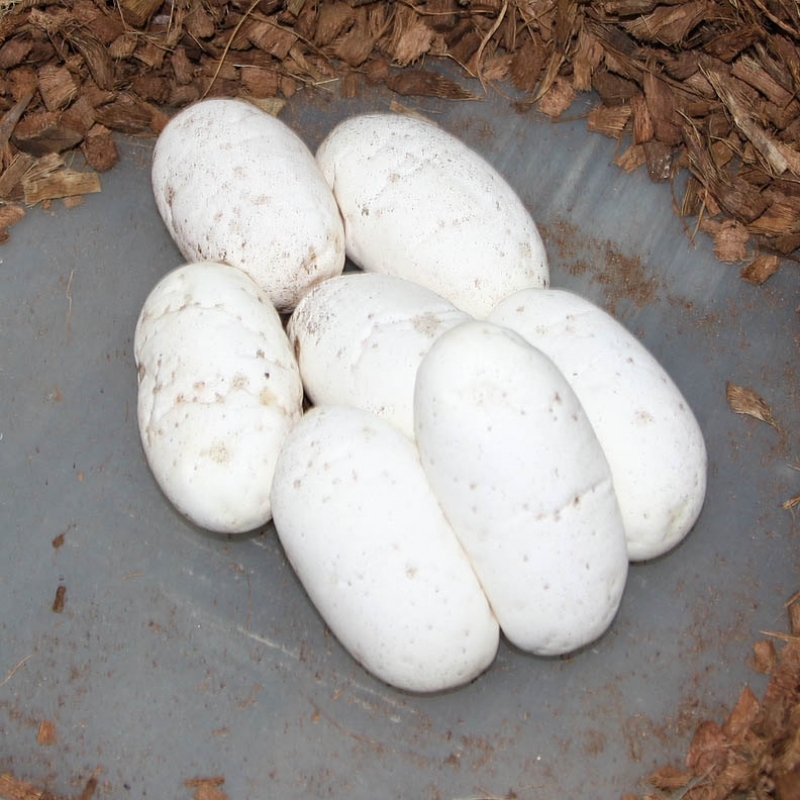 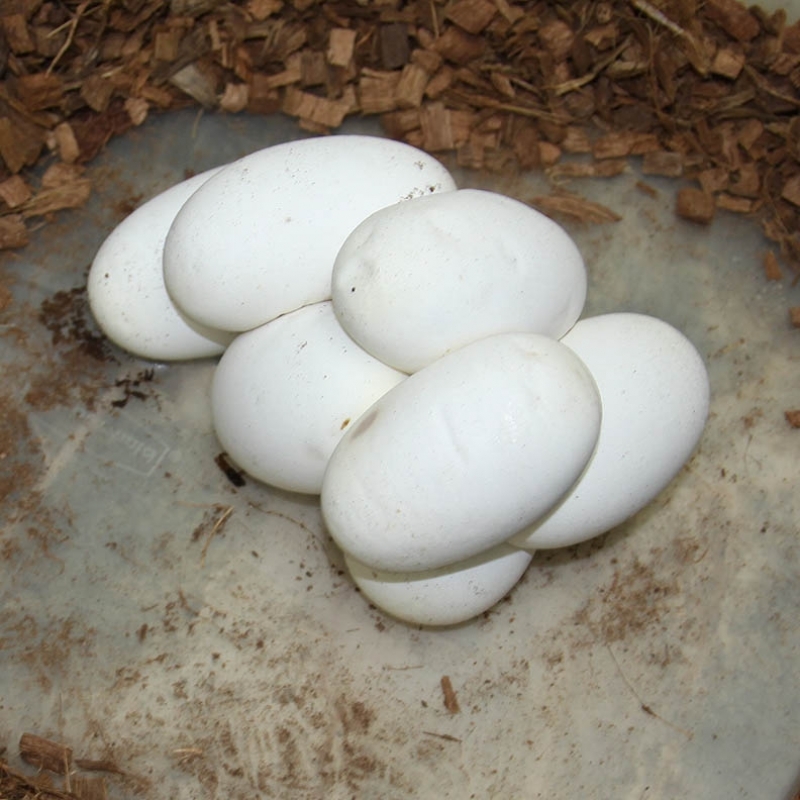 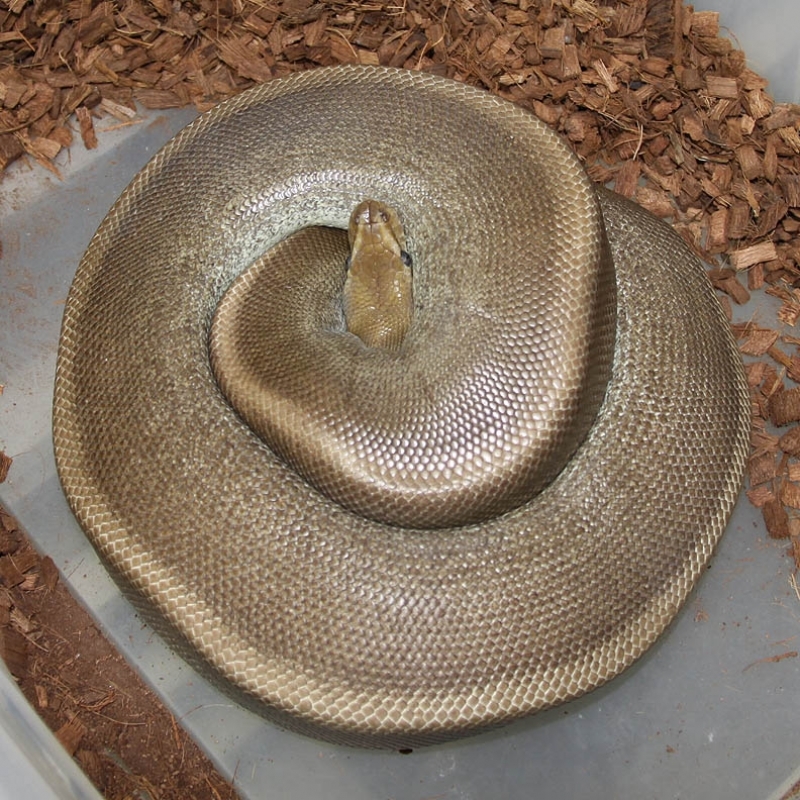 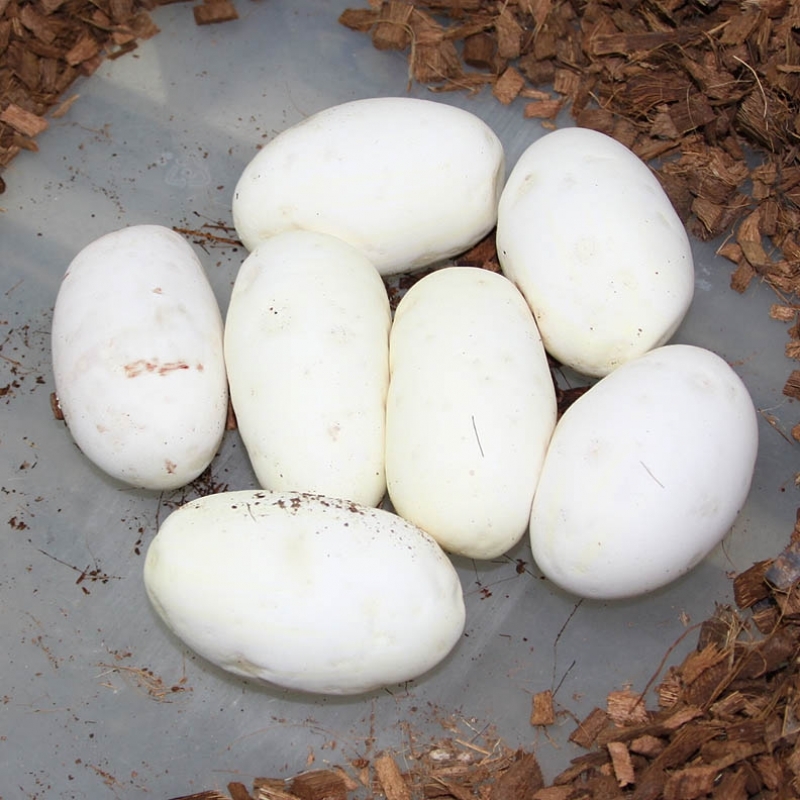 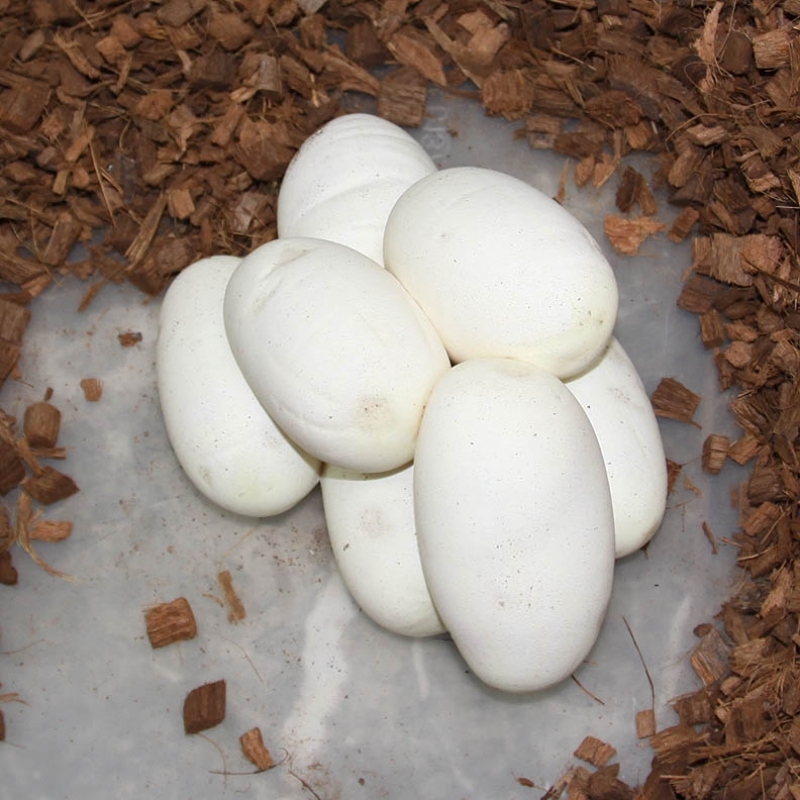 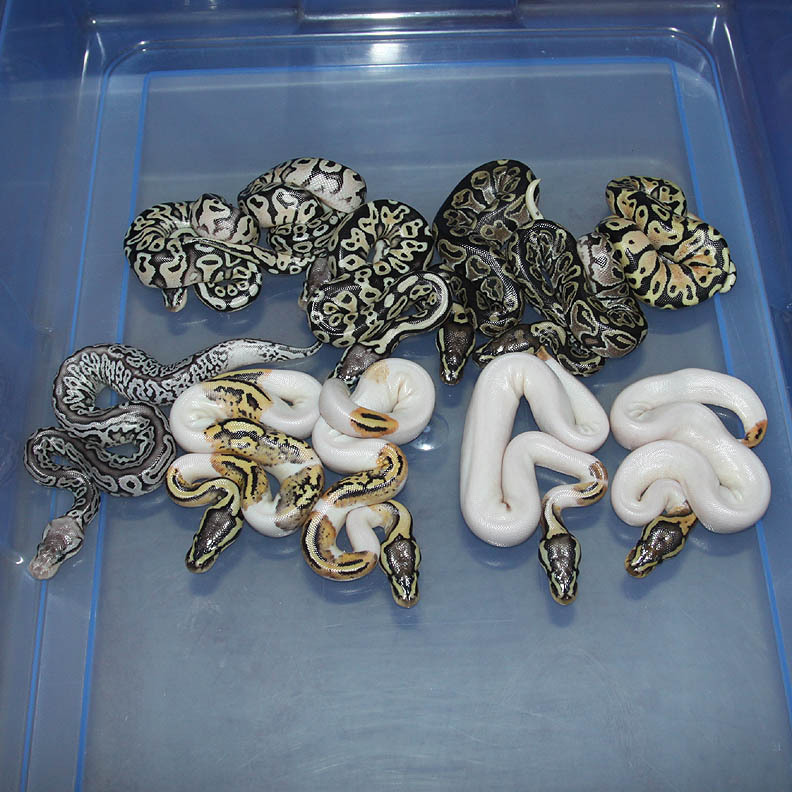 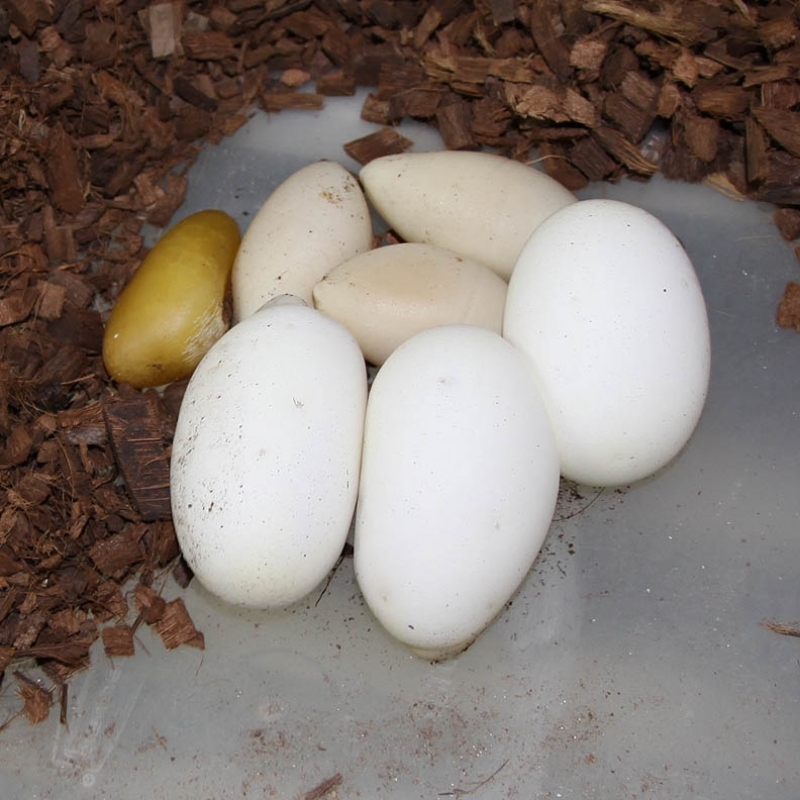 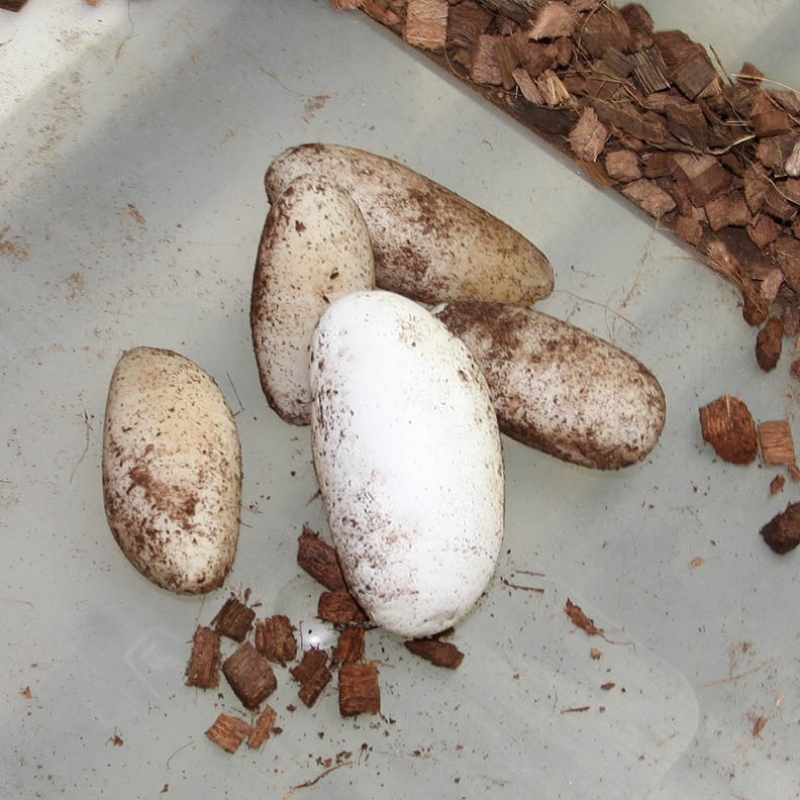 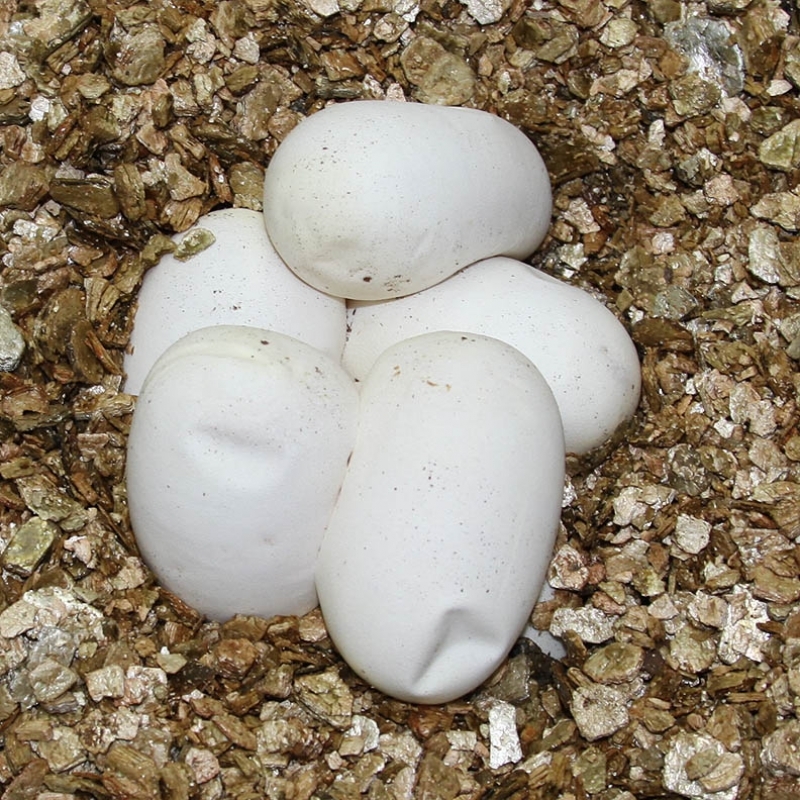 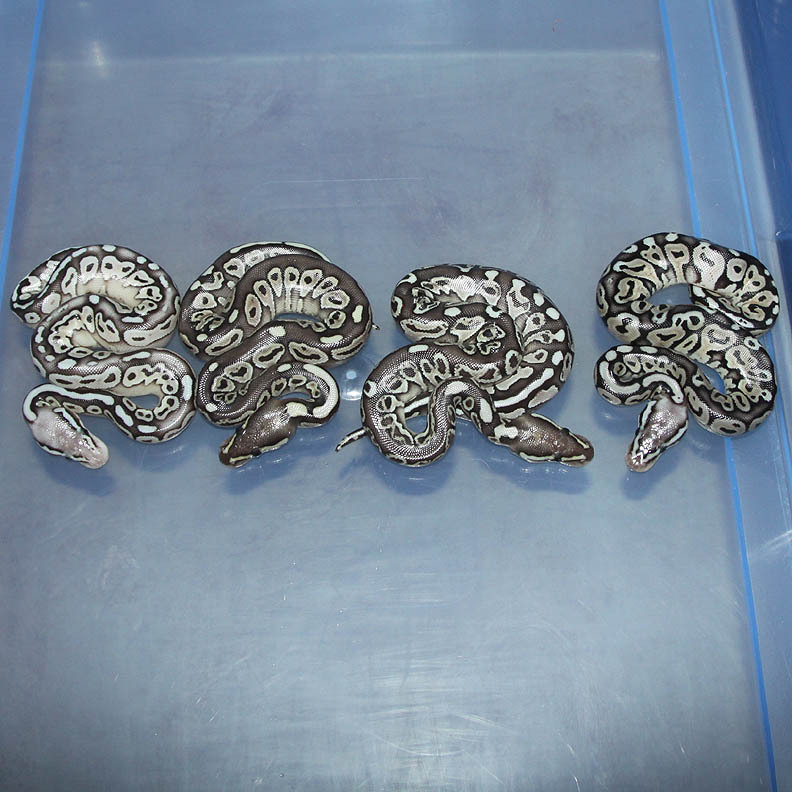 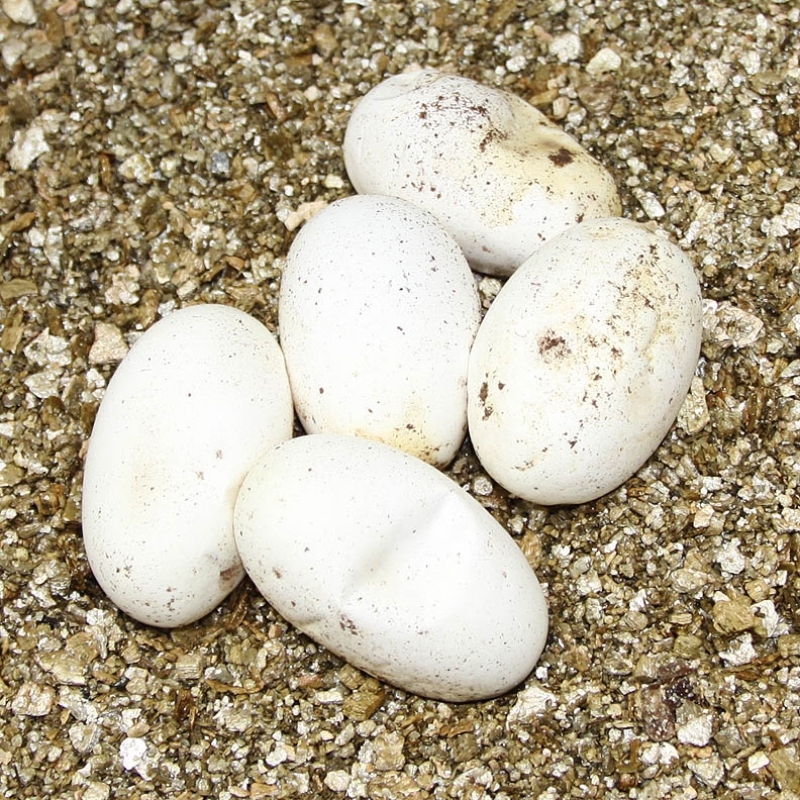 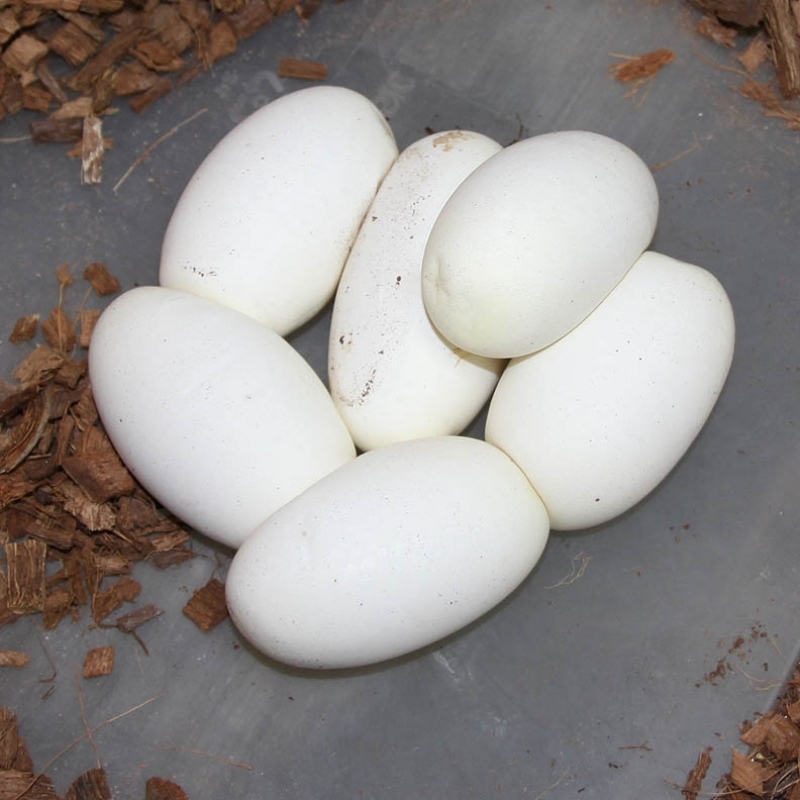 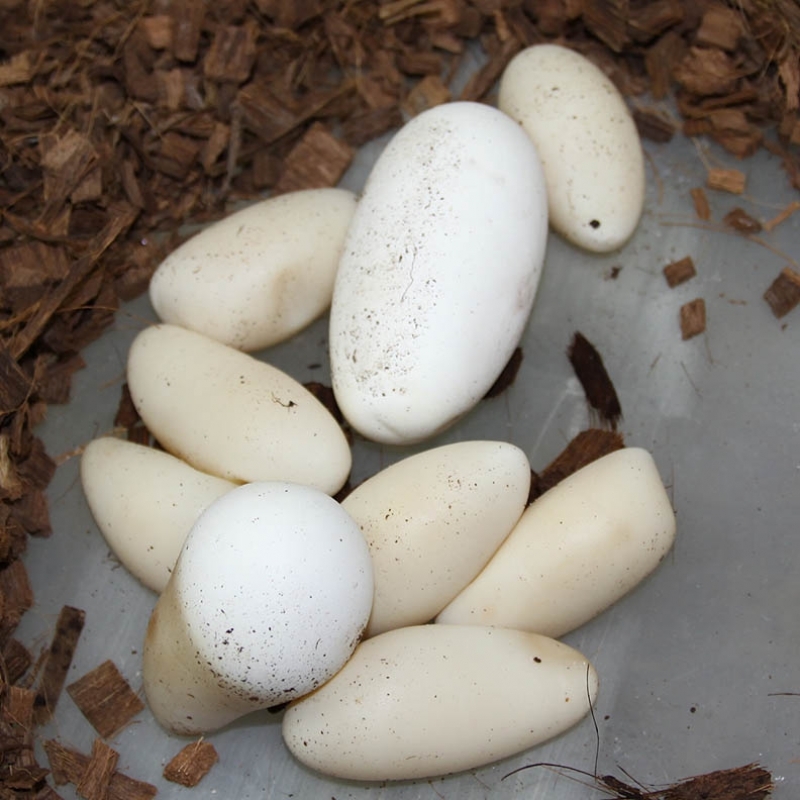 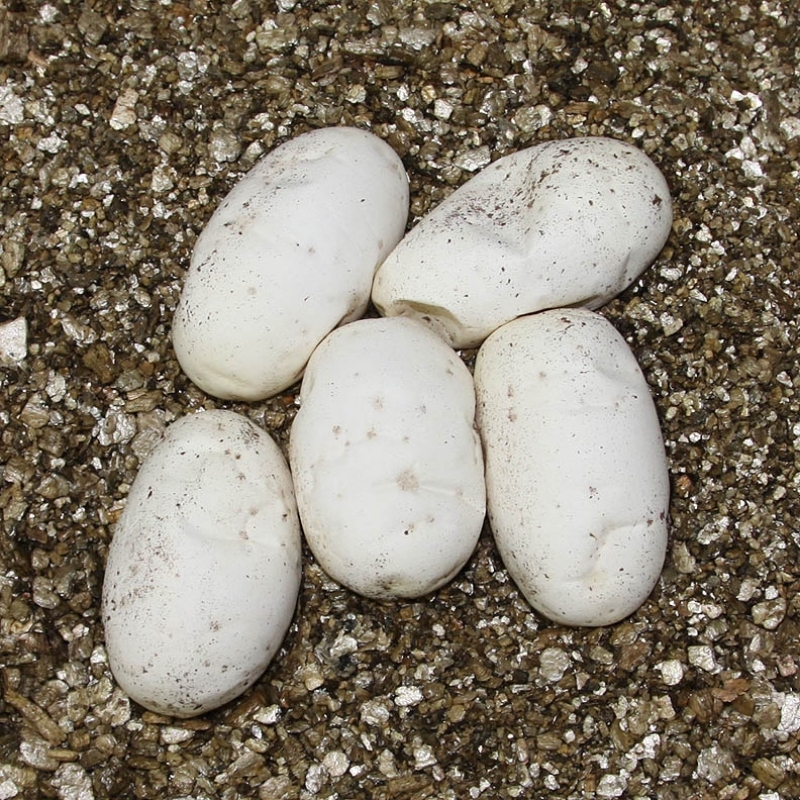 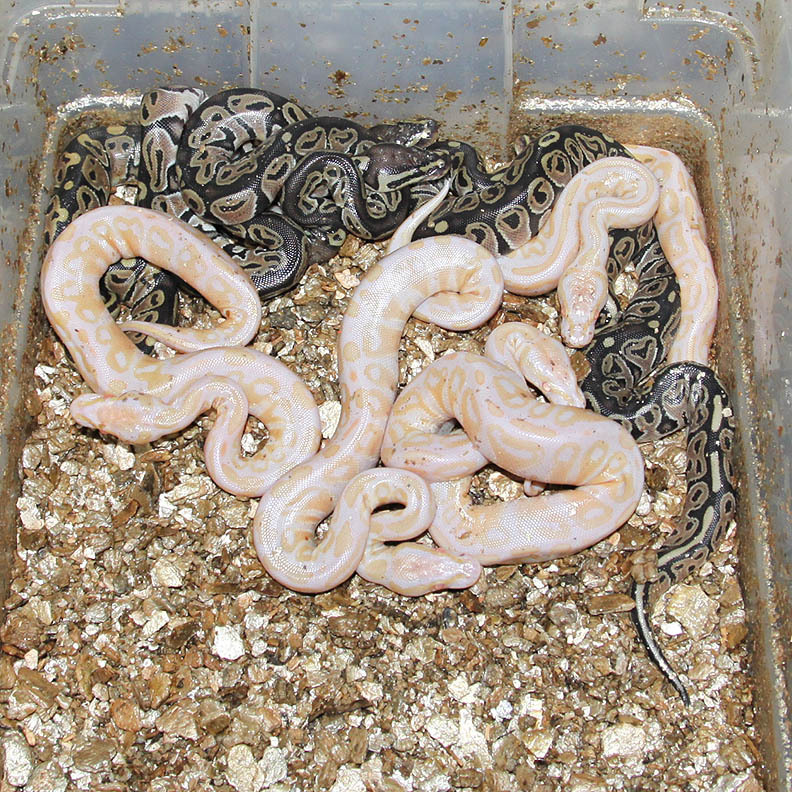 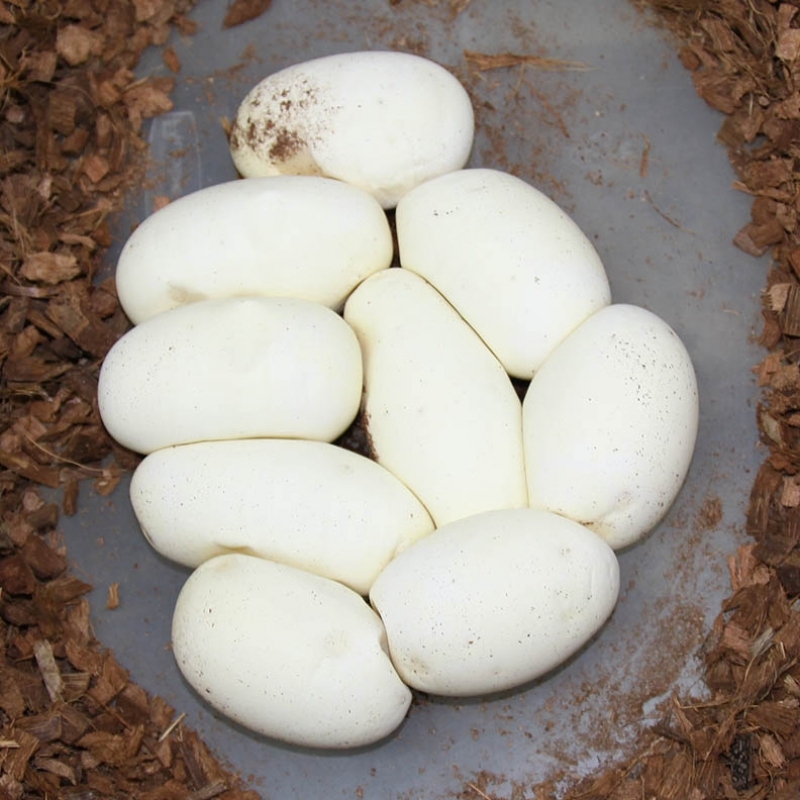 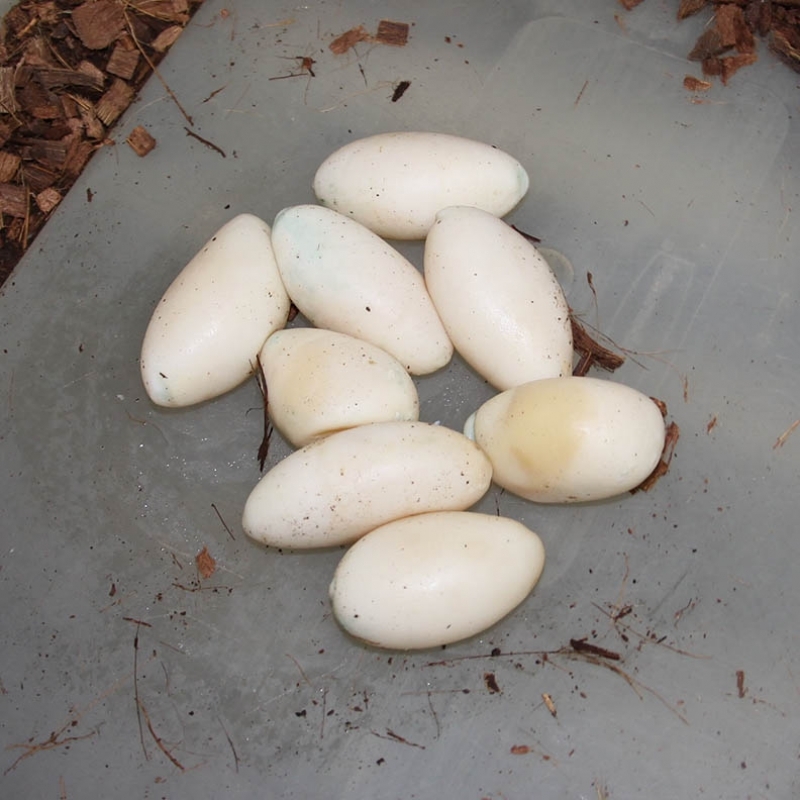 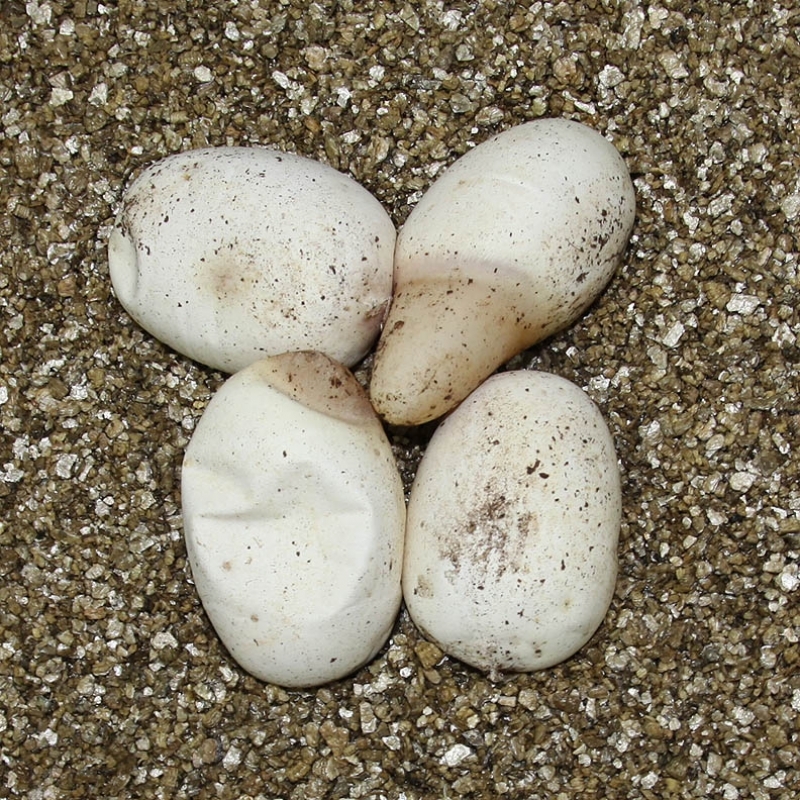 The Lavender Het Pied comes from Justin Kobylka in the USA. 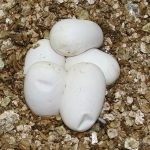 2012 Clutch 152. 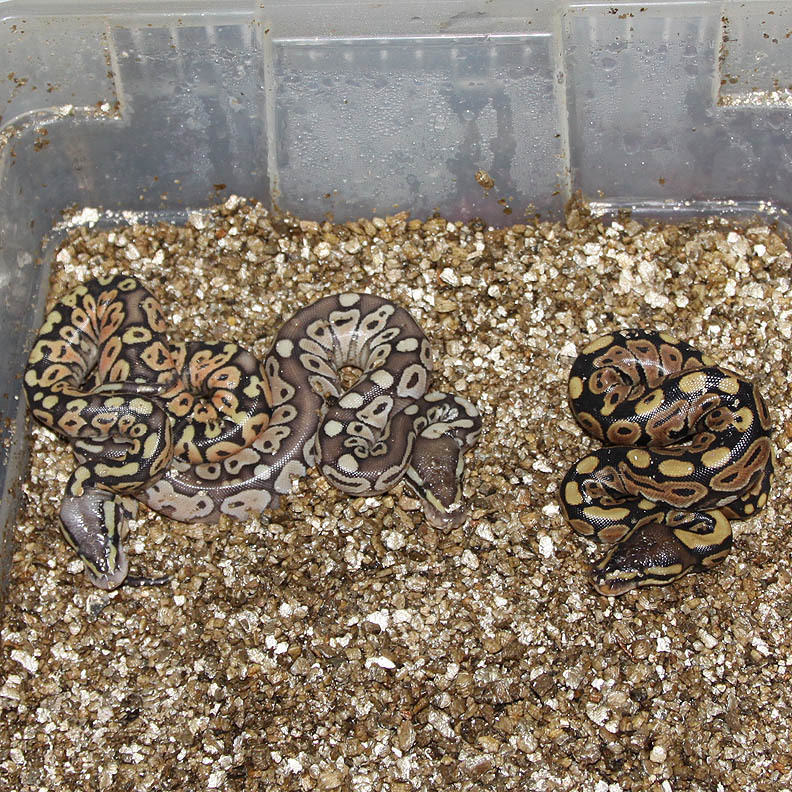 It's really nice to have a project that proves out to be exactly what you've purchased! 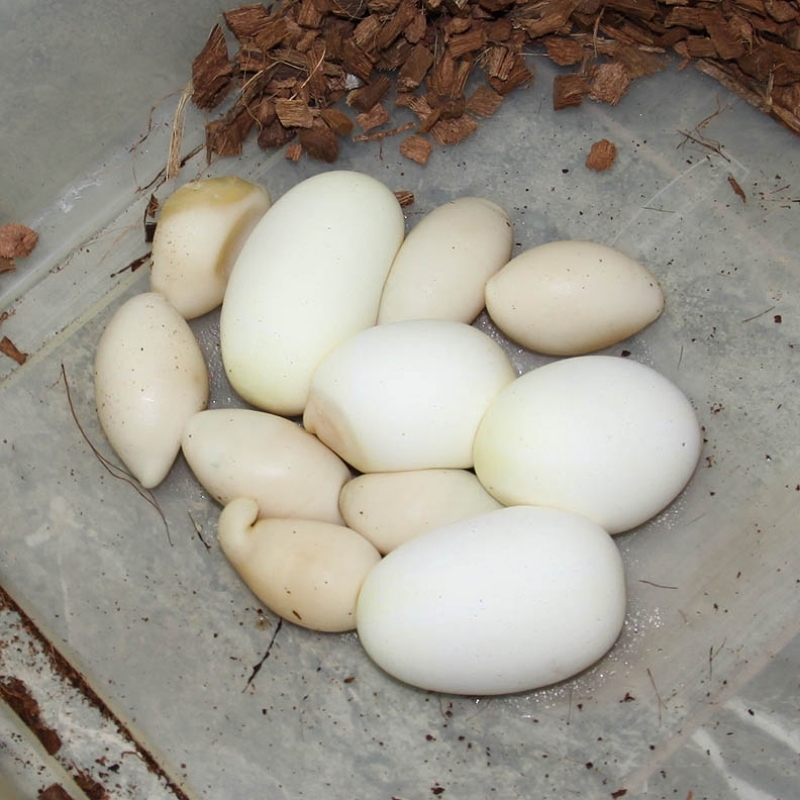 Thank you Justin Kobylka! 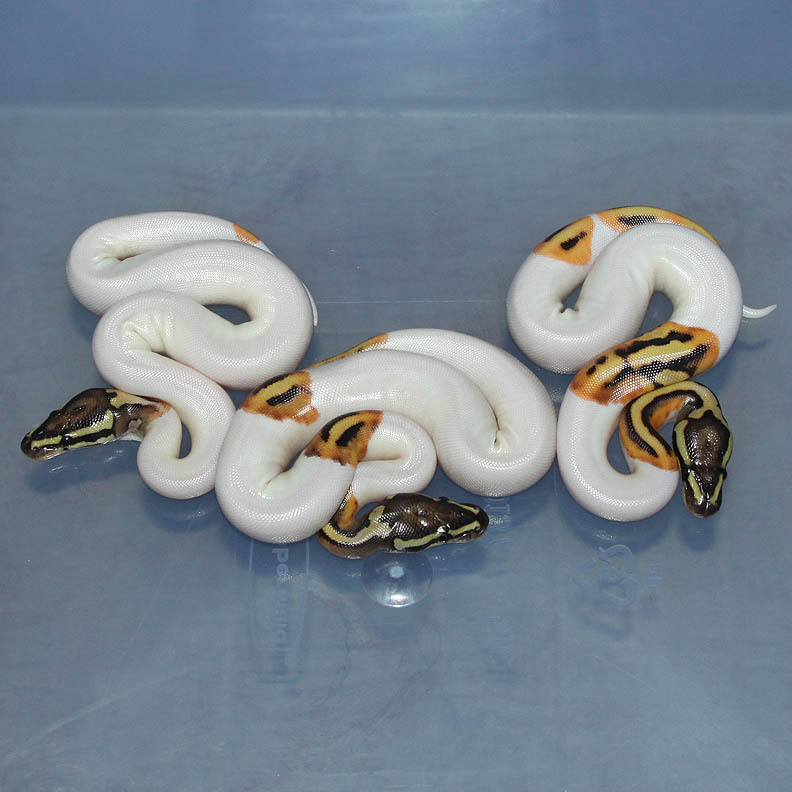 Description: Red Axanthic Pinstripe Champagne 1/12 x Red Axanthic Pinstripe. 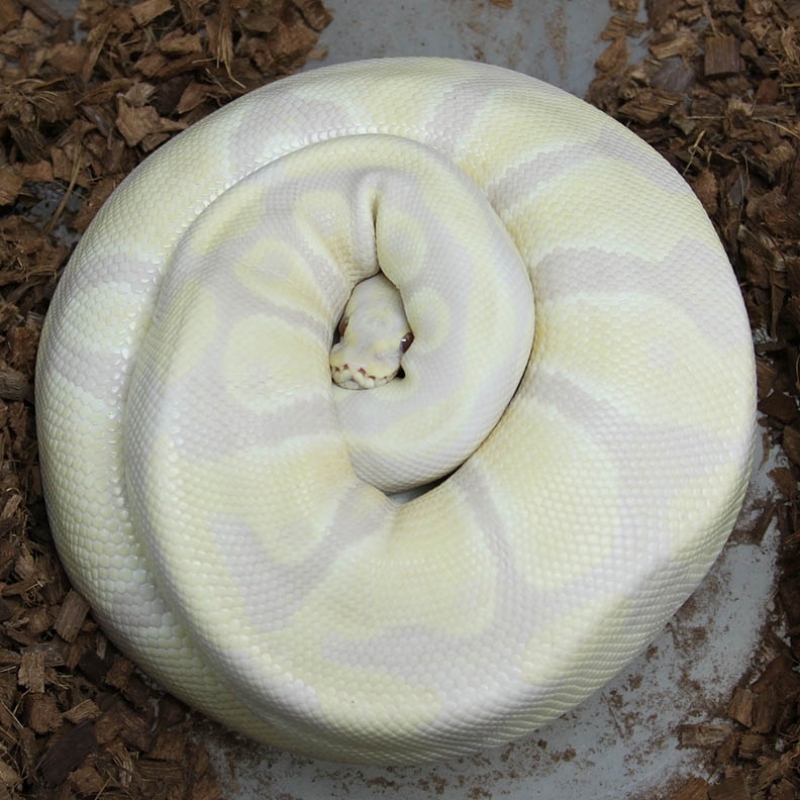 Description: Pastel Ivory 1/11 x YB 4/08 JS. 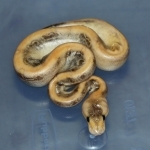 Description: Ivory HRA 1/12 x Het RA 14/06. 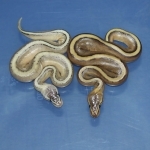 Description: Toffino 1/11 x Toffino 3/12. This clutch has the possibility to produce pure Toffee's. 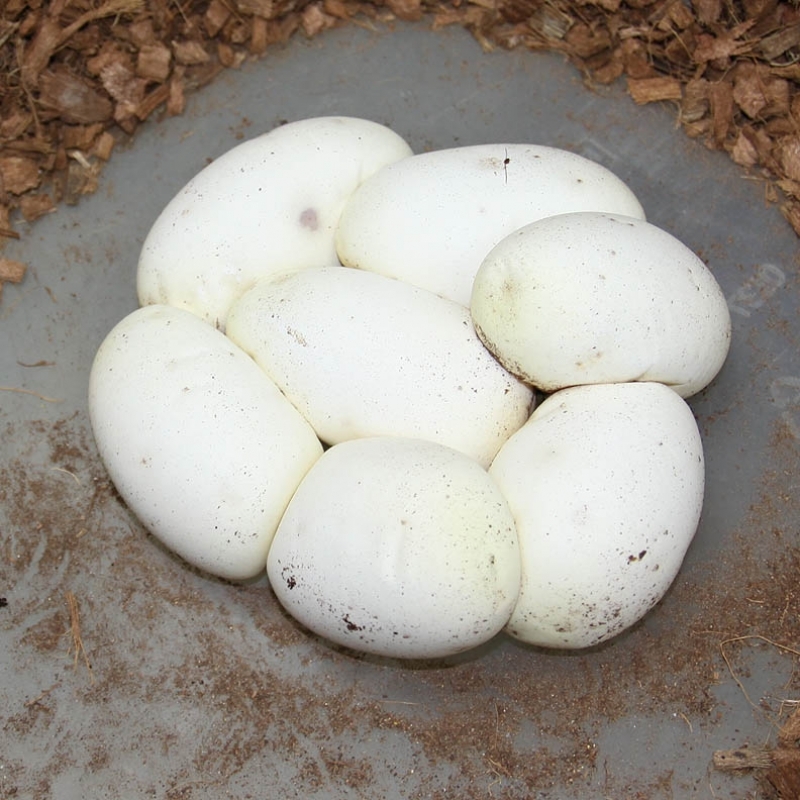 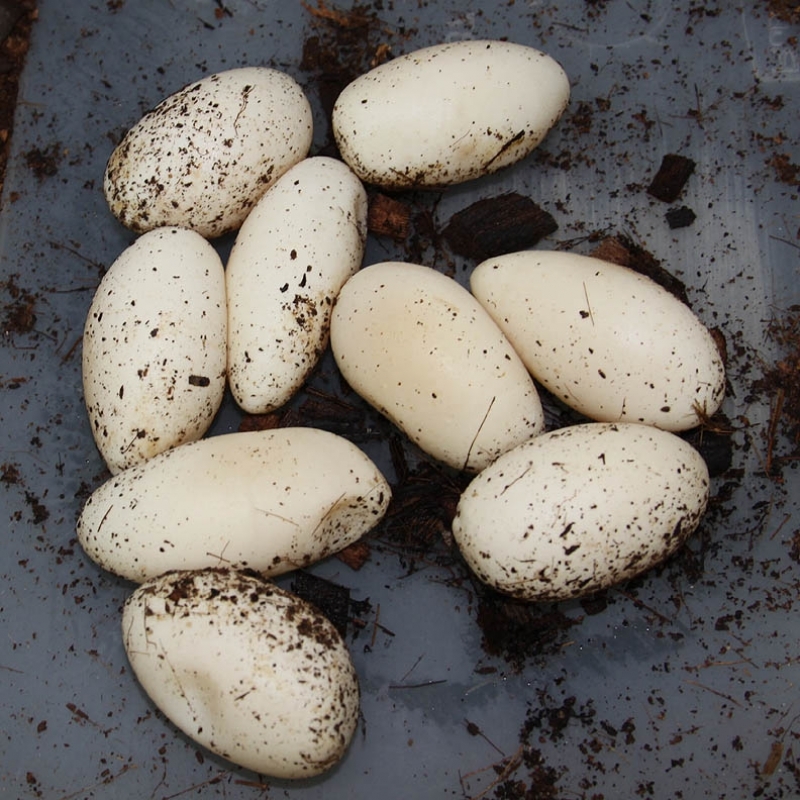 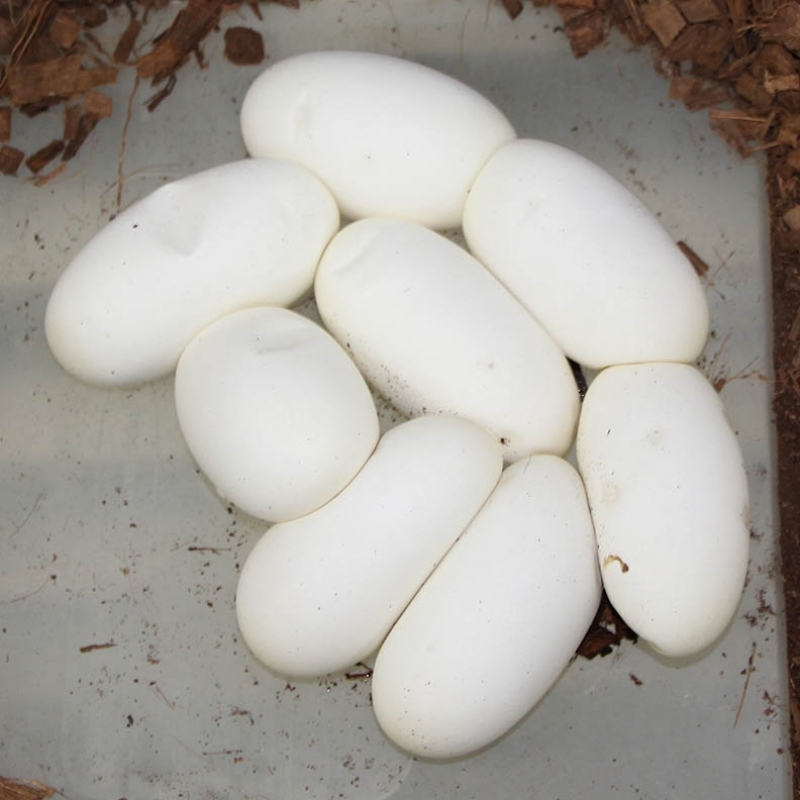 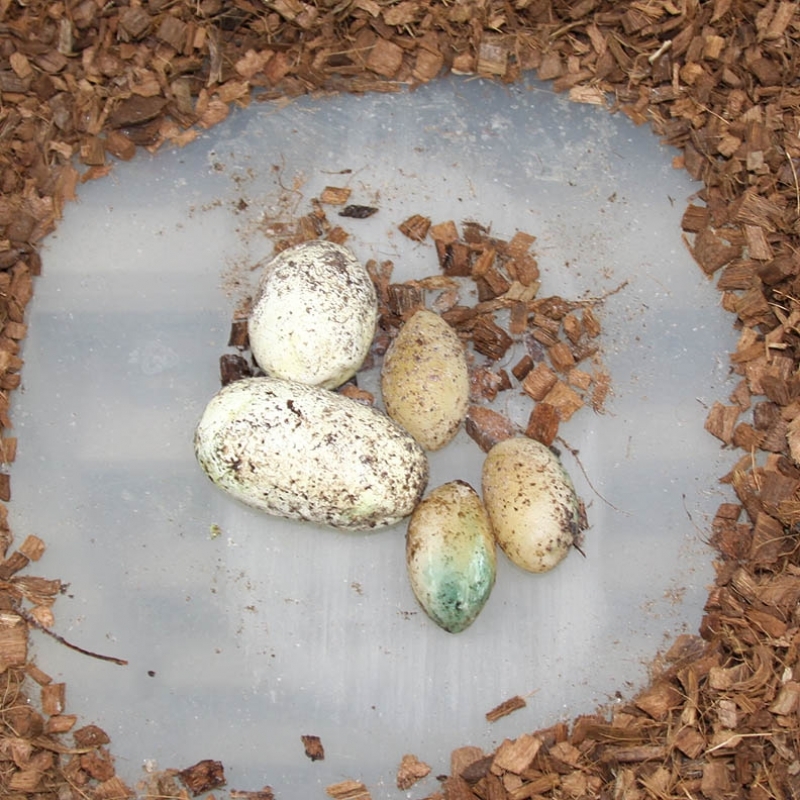 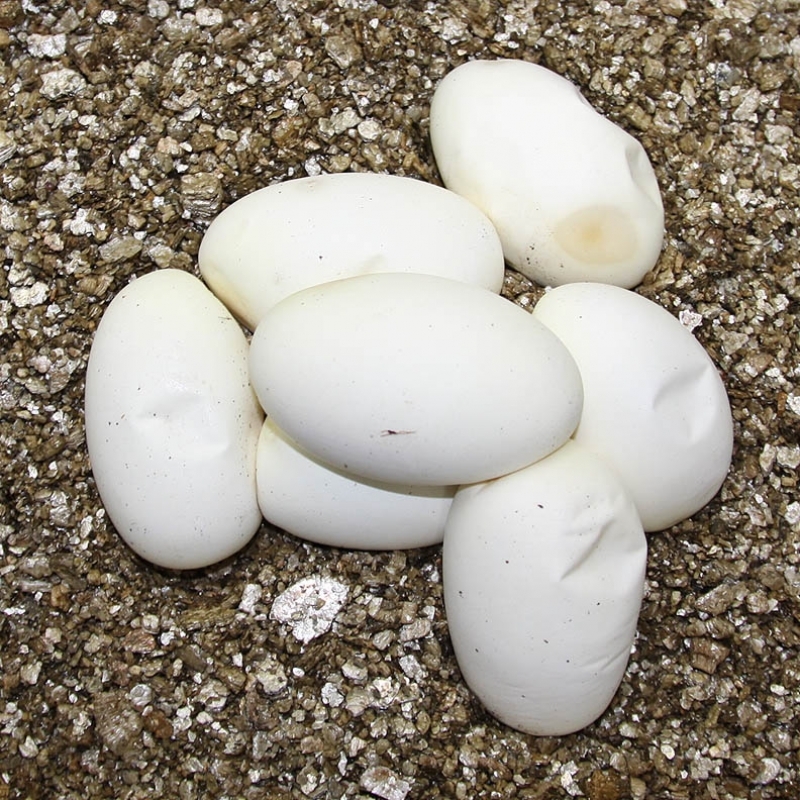 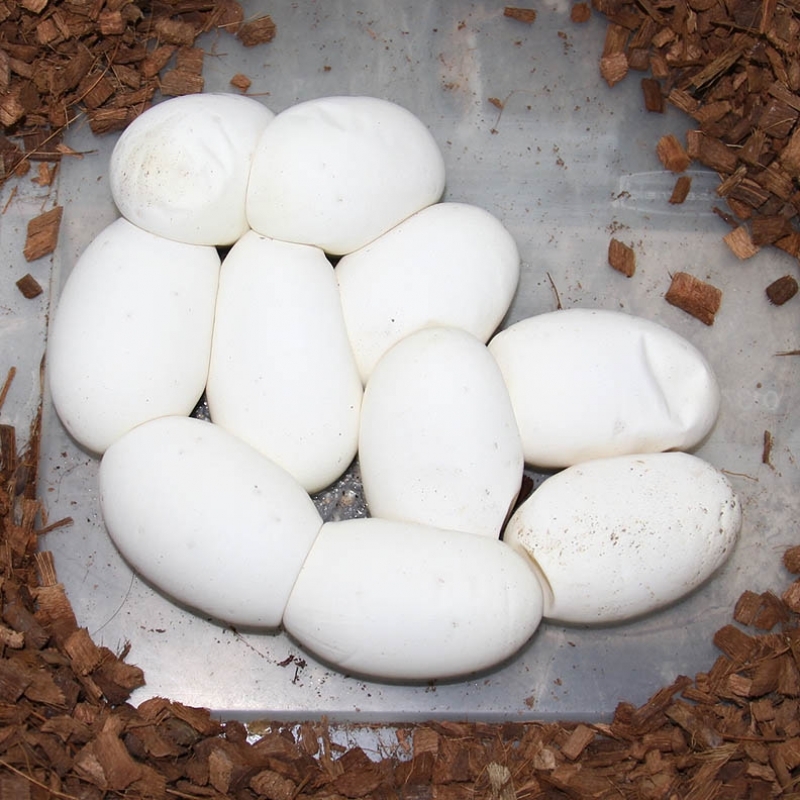 I will update this clutch in a few months when I know how the odds came out. 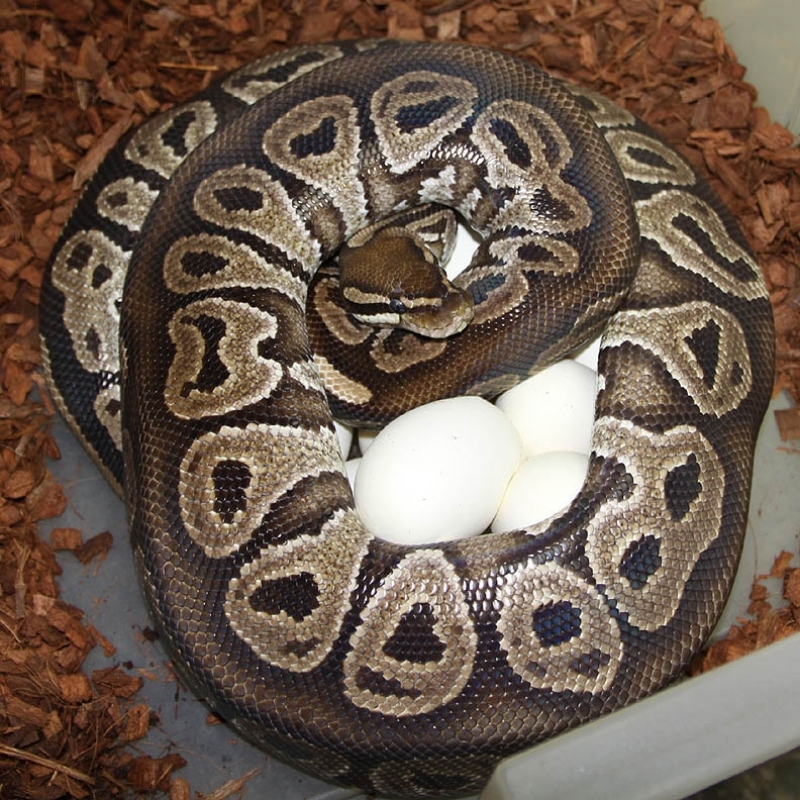 One egg went bad. 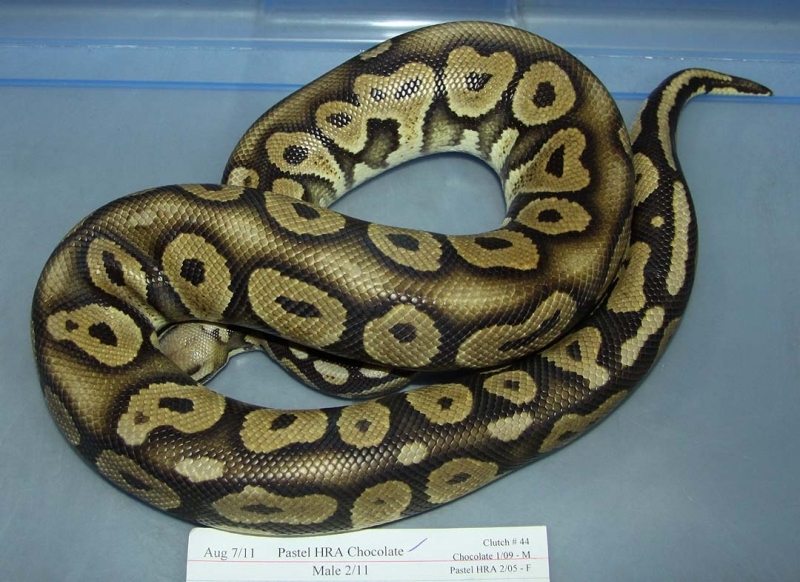 Description: Pastel Chocolate HRA 2/11 x Chocolate HRA 2/11. 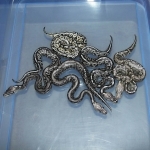 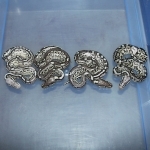 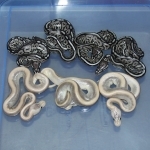 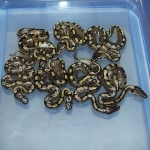 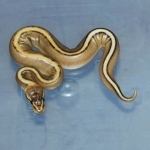 Description: Banded HRA 1/11 x Het RA/Banded 1/09. 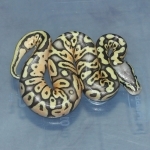 Description: Pastel DH OG/GS 1/11 x Pastel DH OG/GS 1/11. 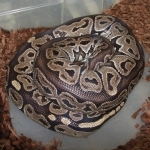 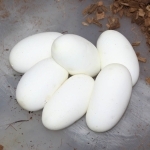 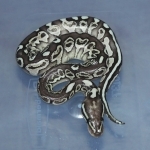 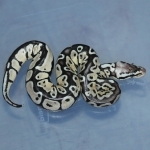 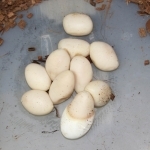 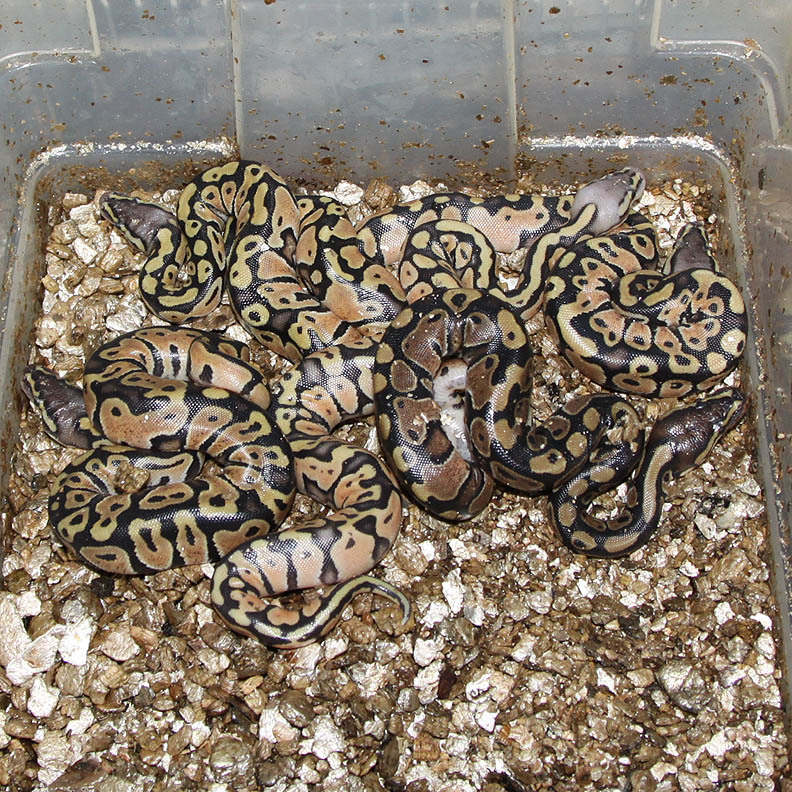 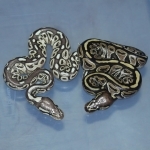 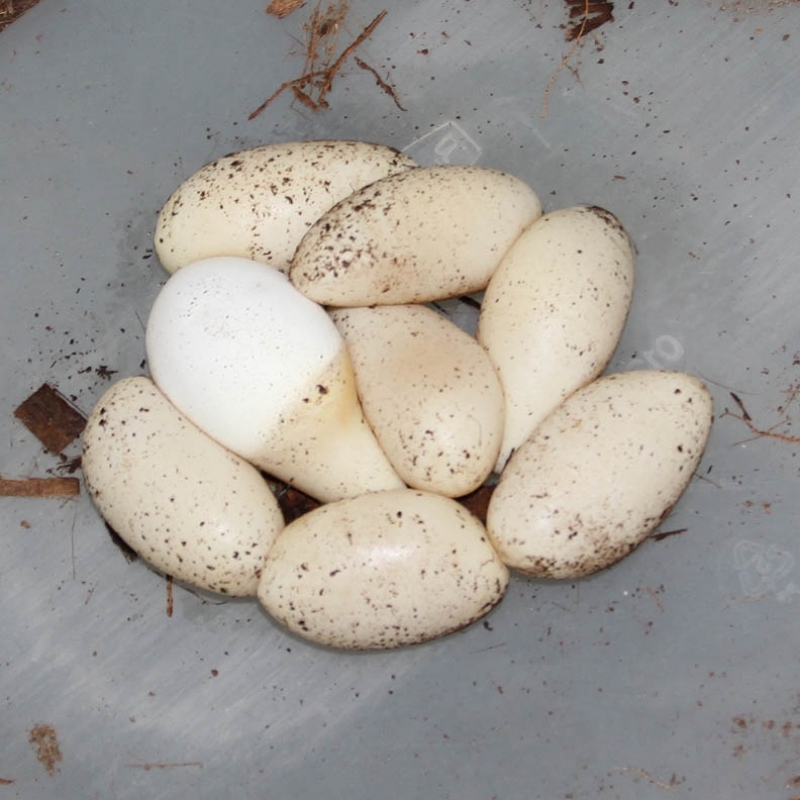 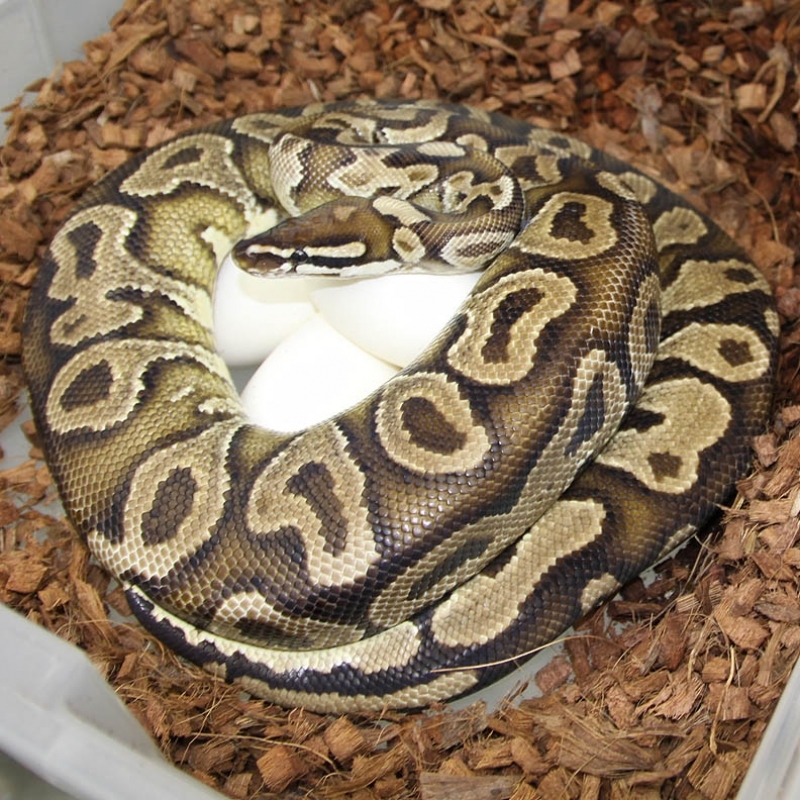 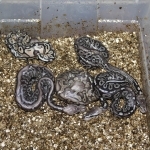 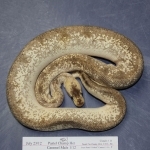 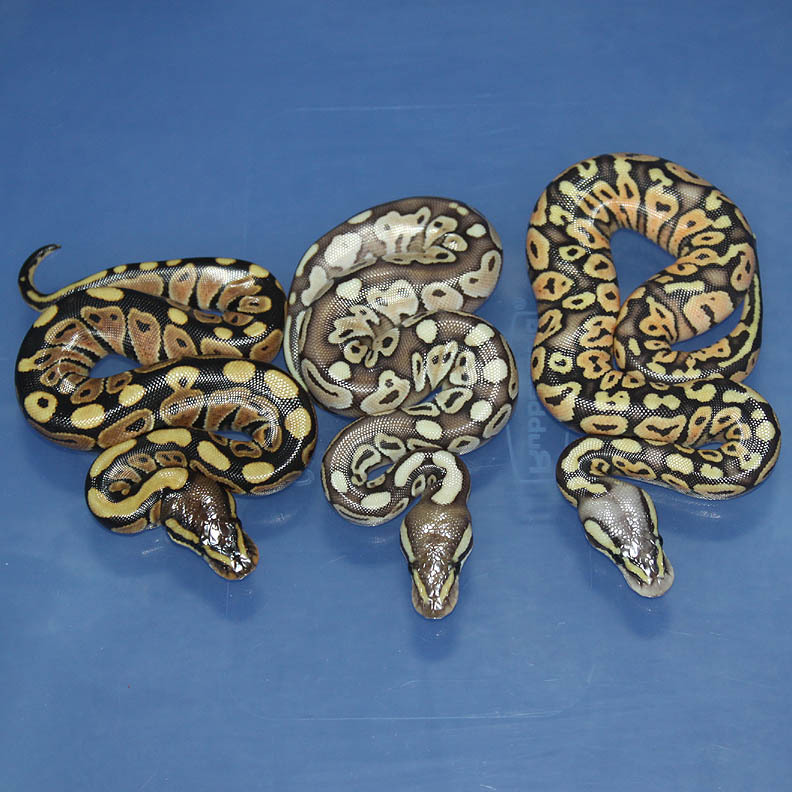 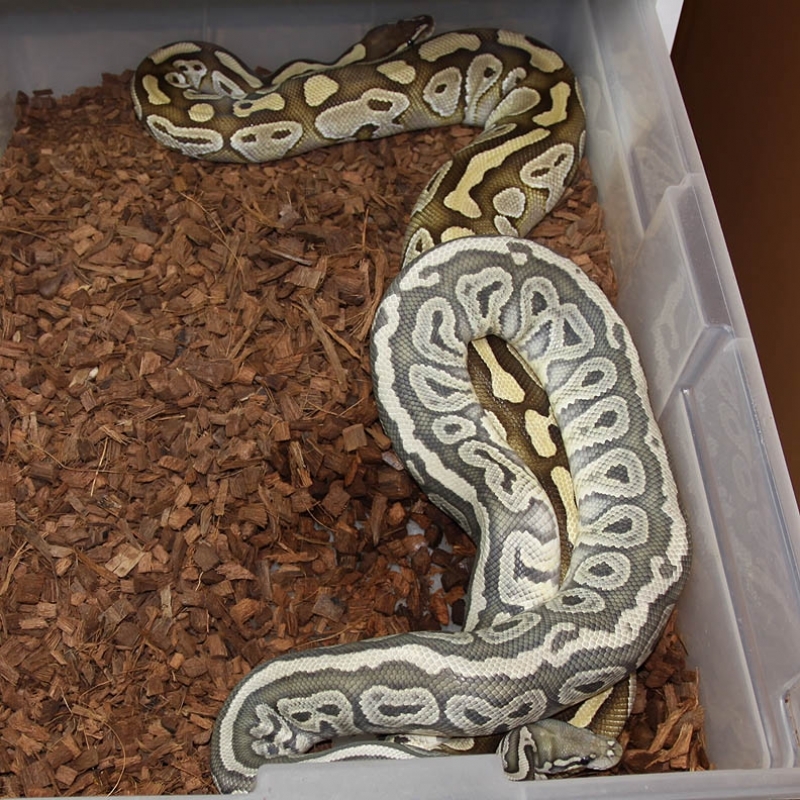 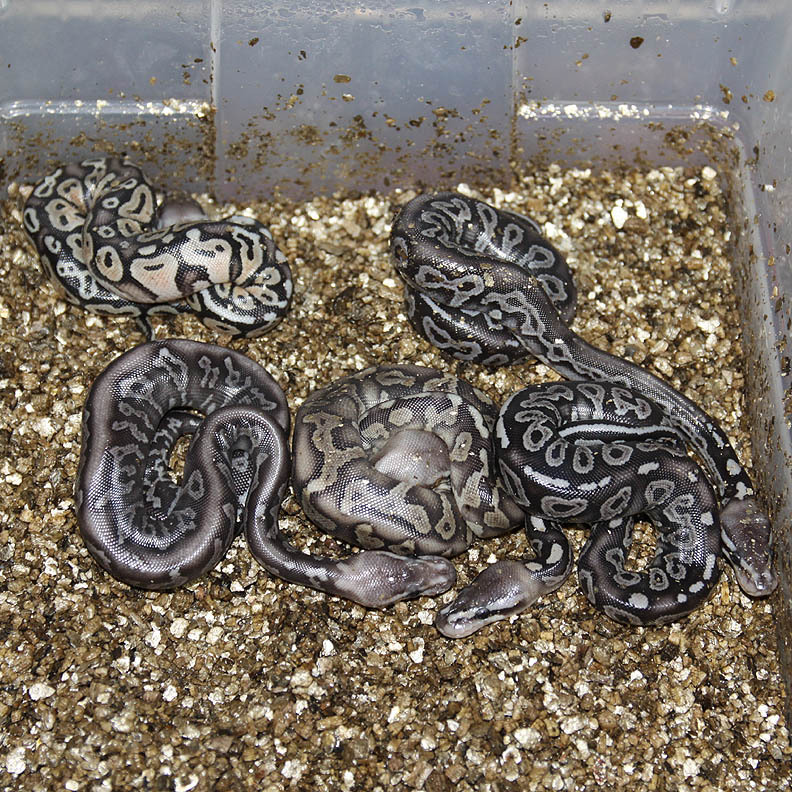 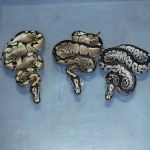 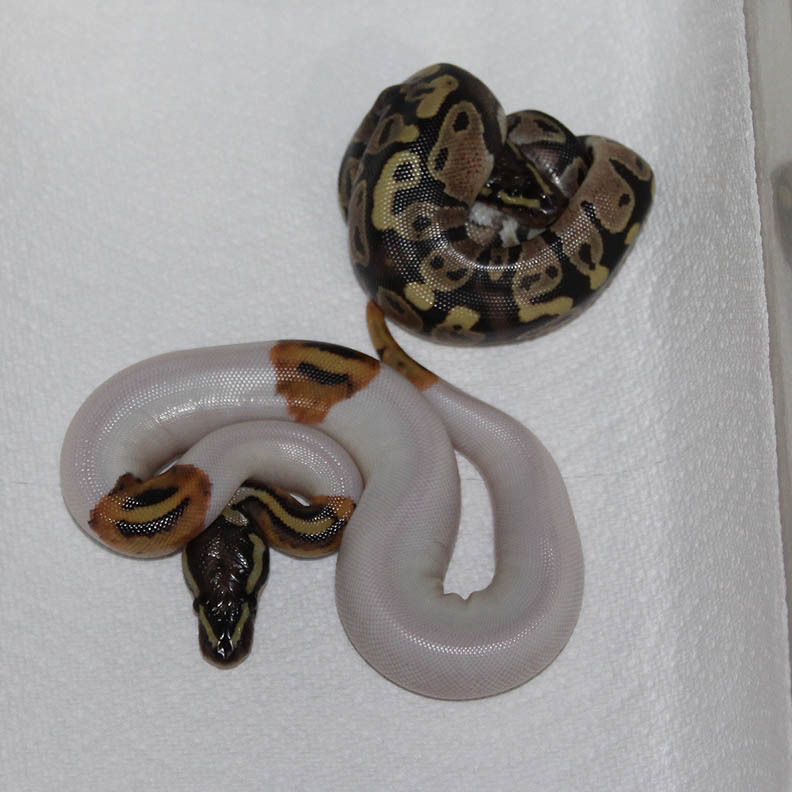 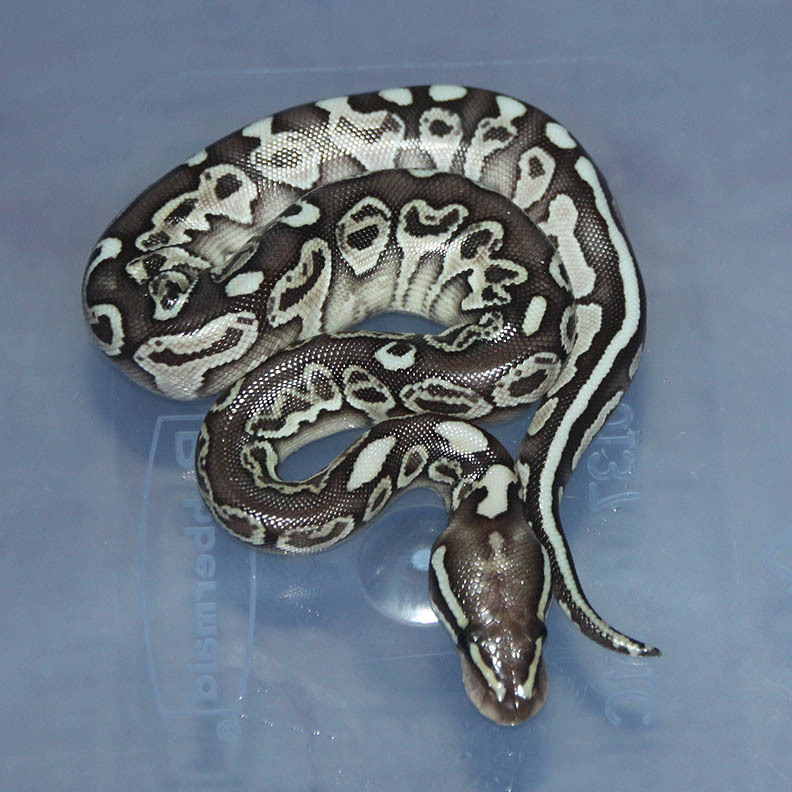 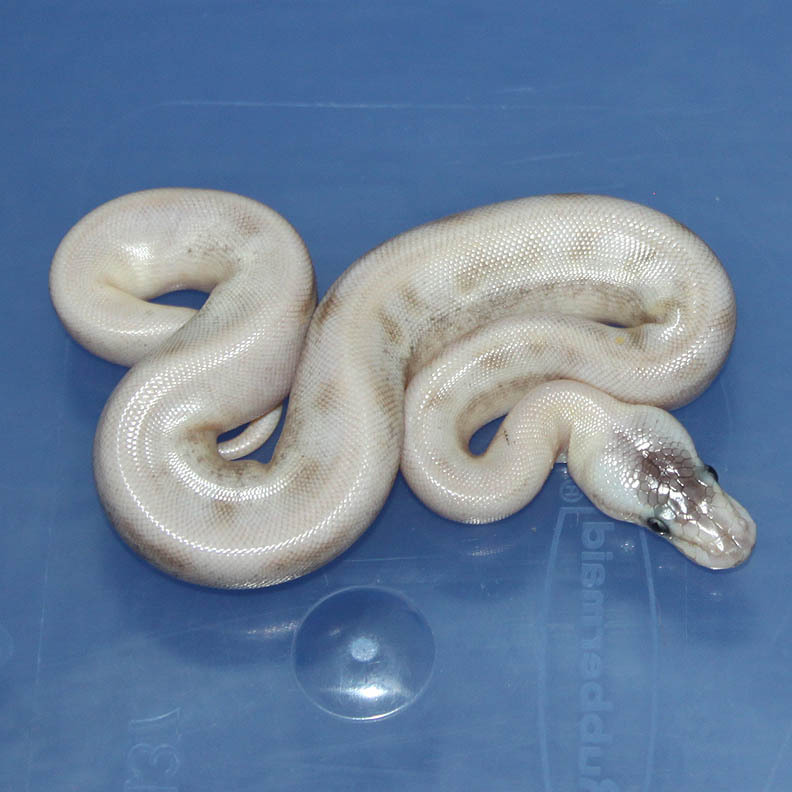 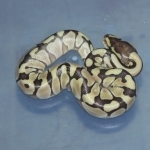 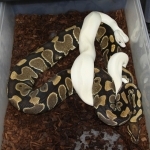 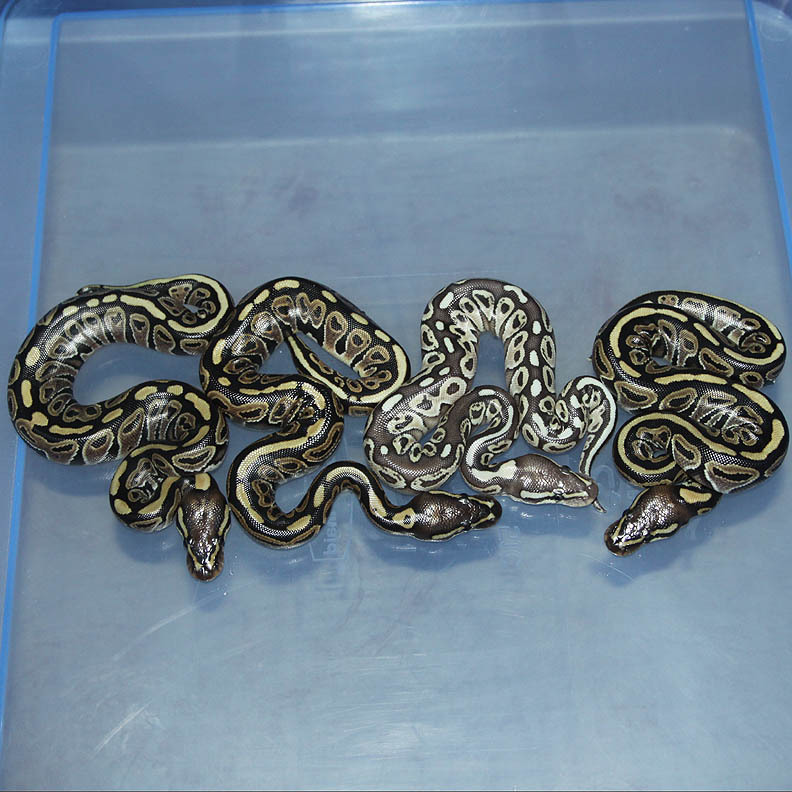 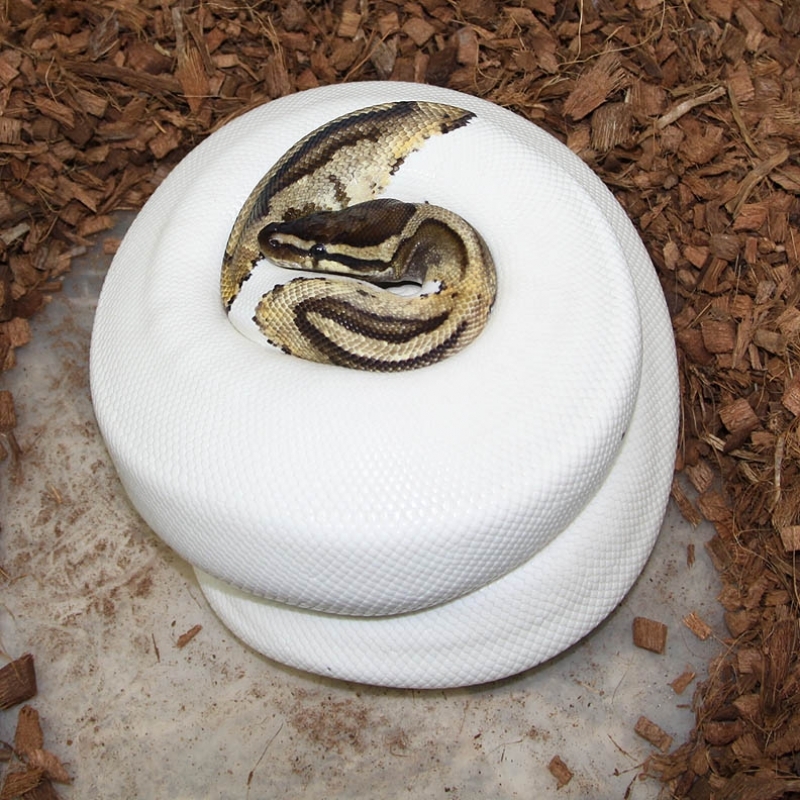 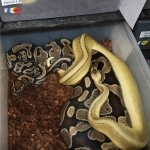 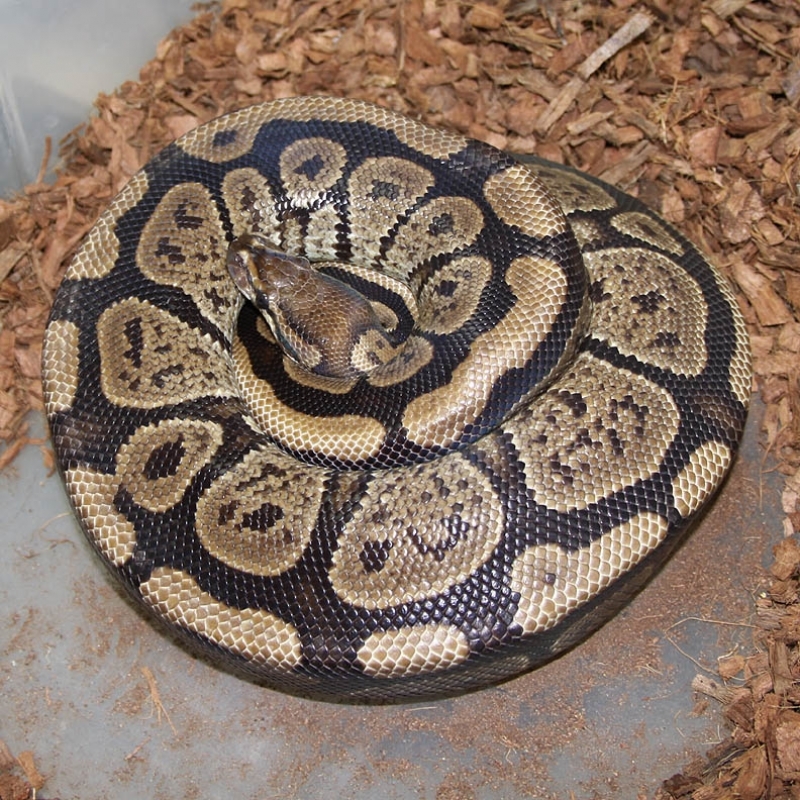 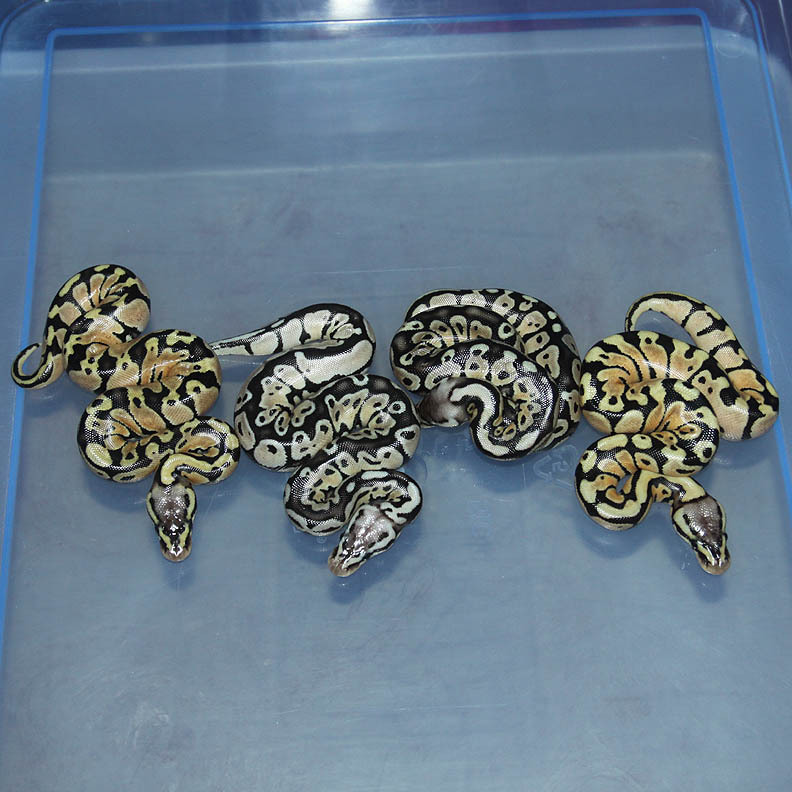 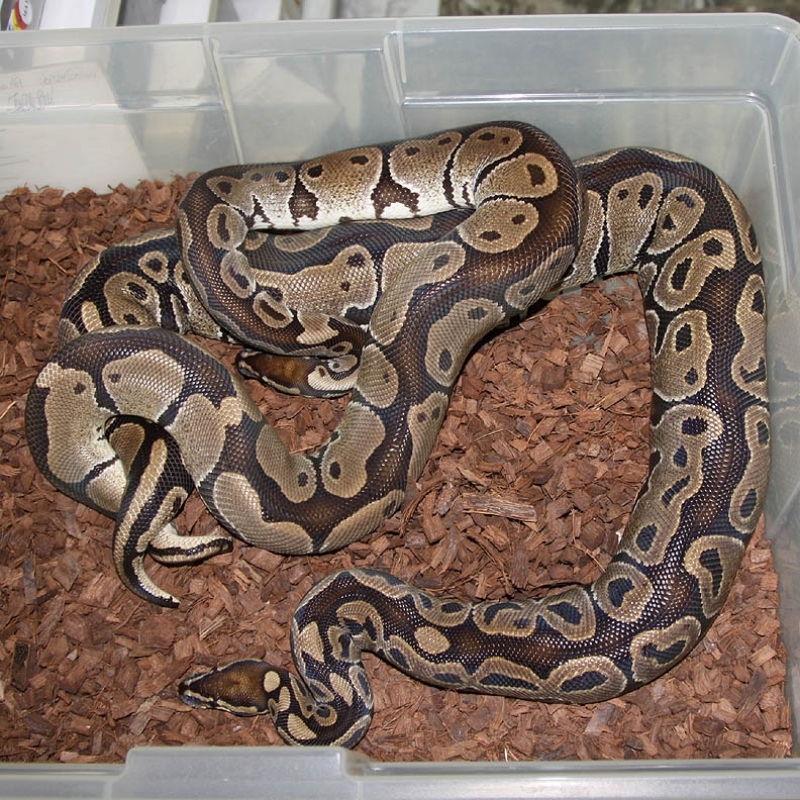 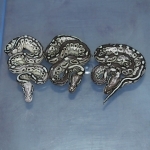 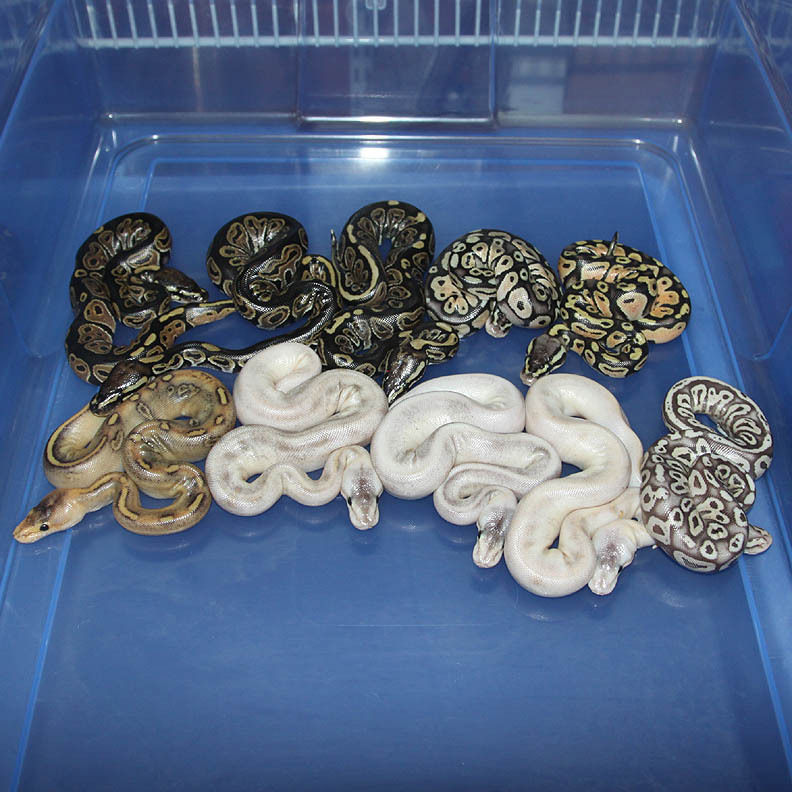 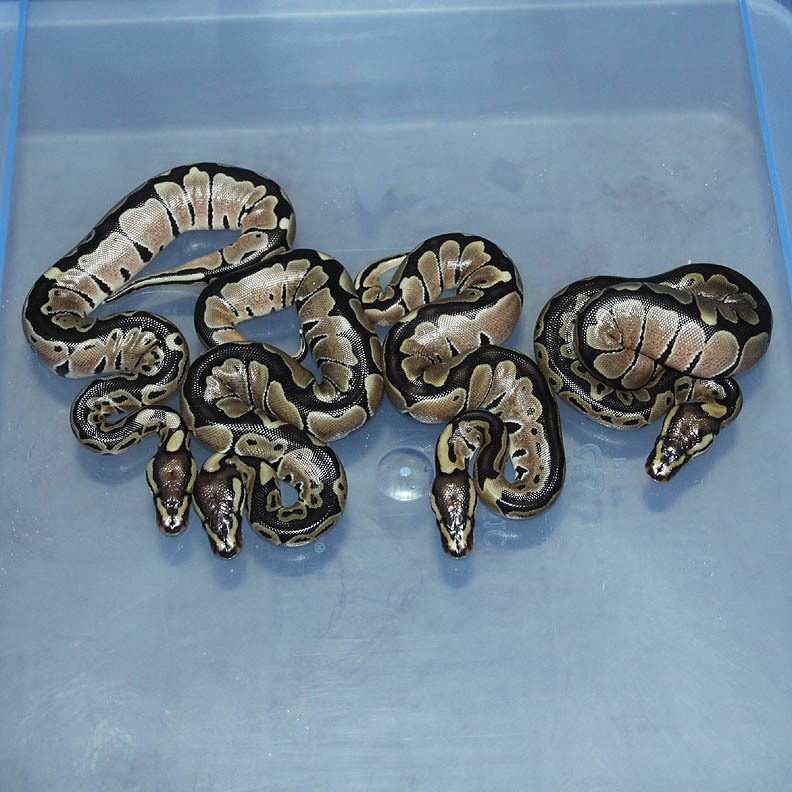 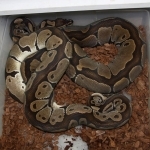 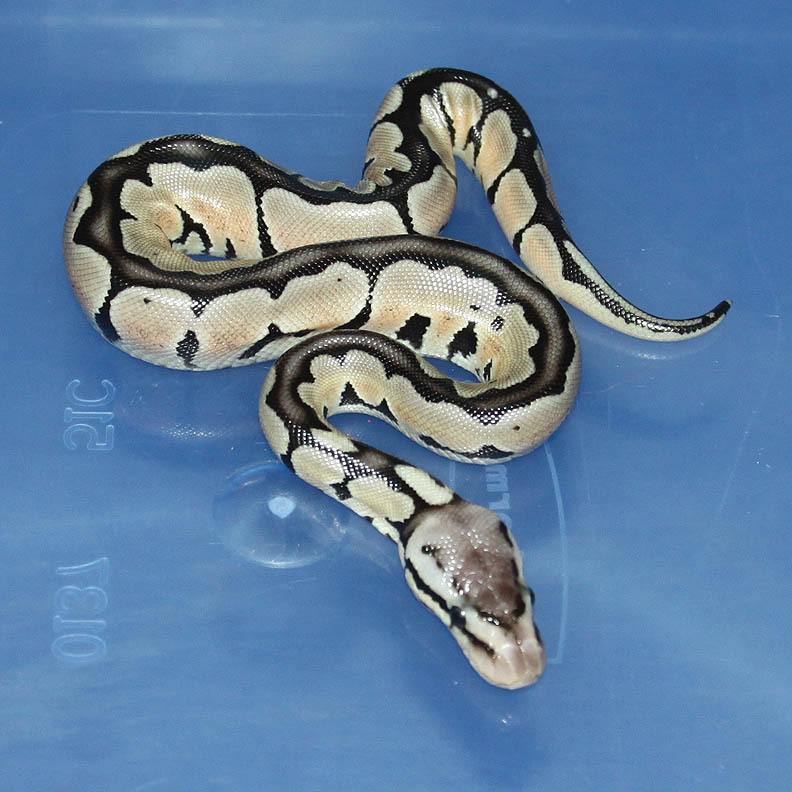 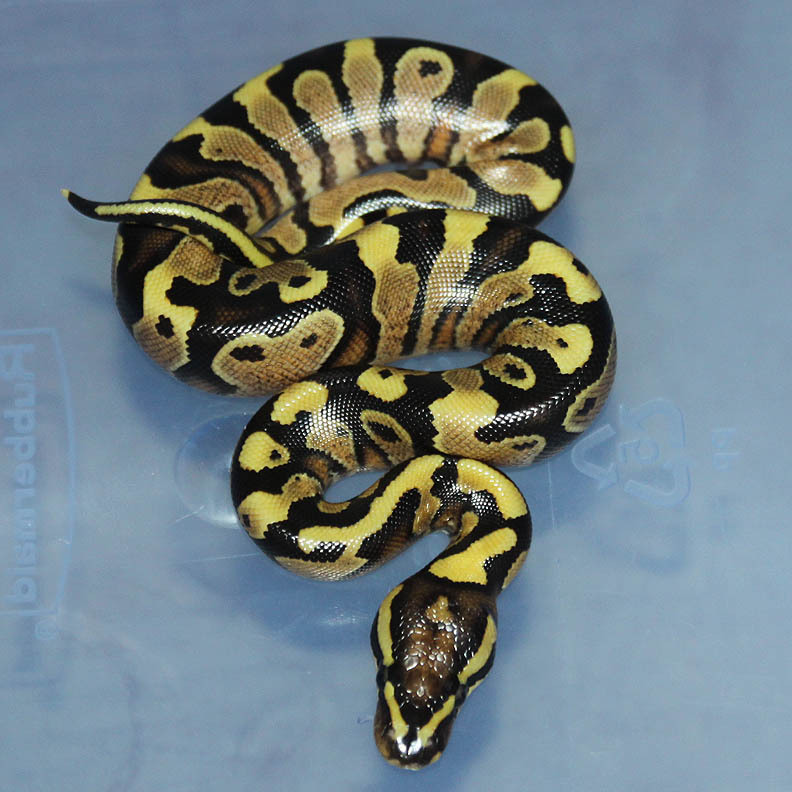 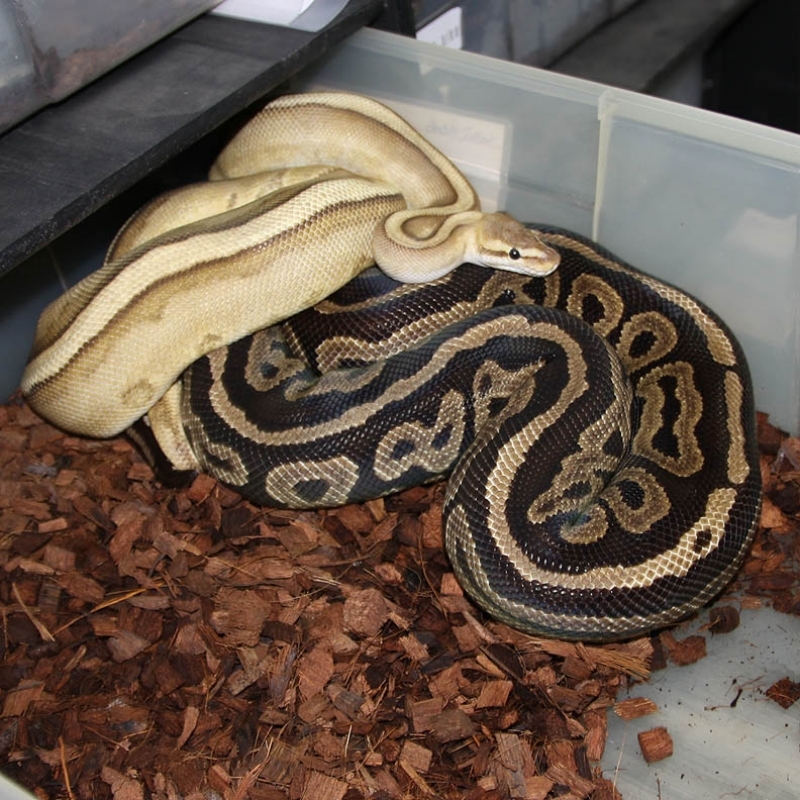 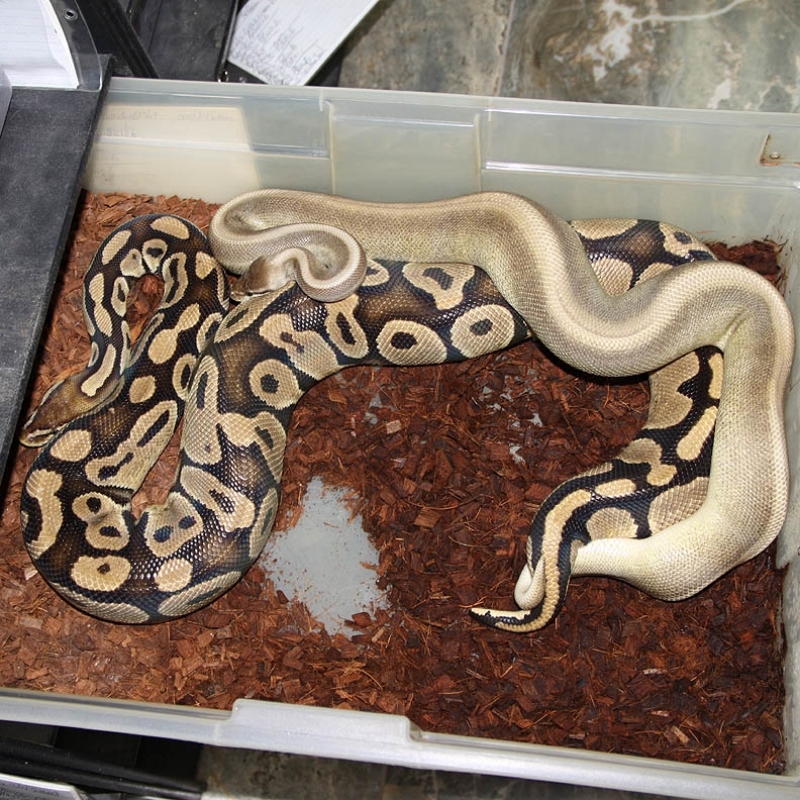 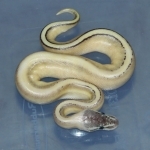 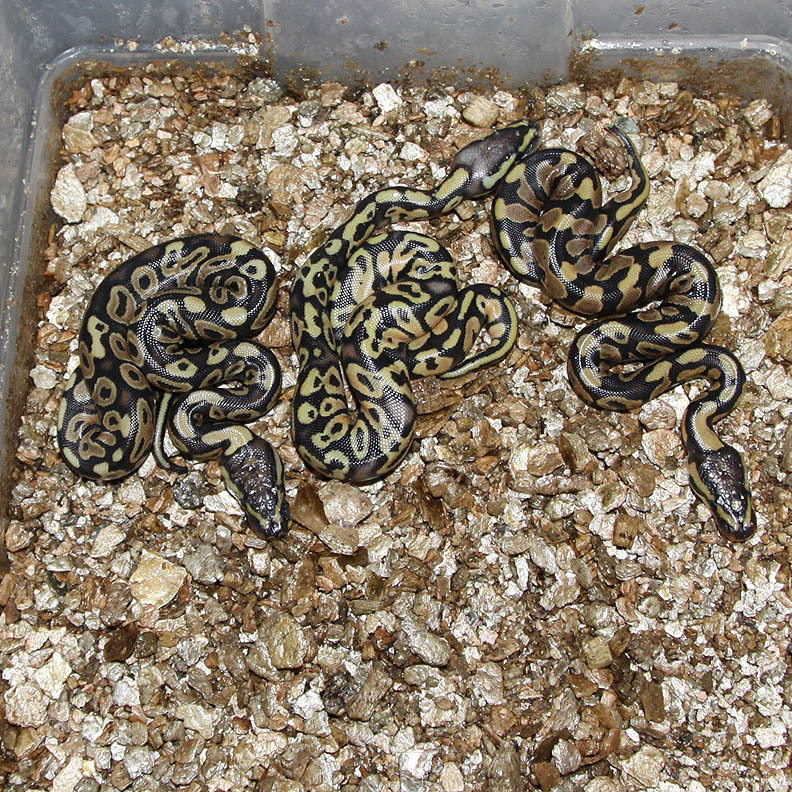 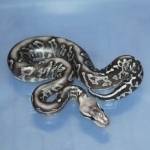 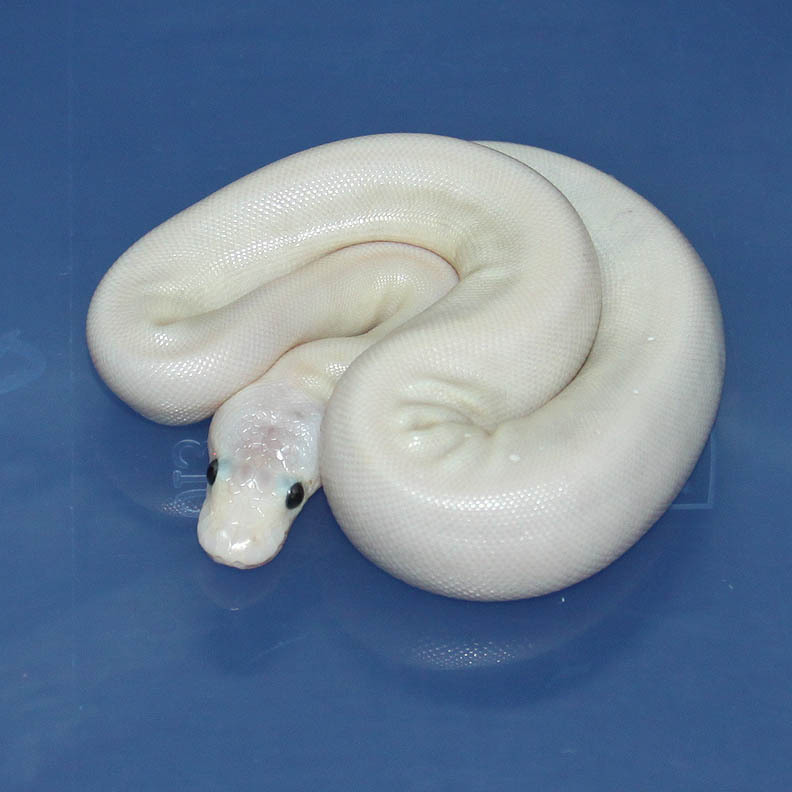 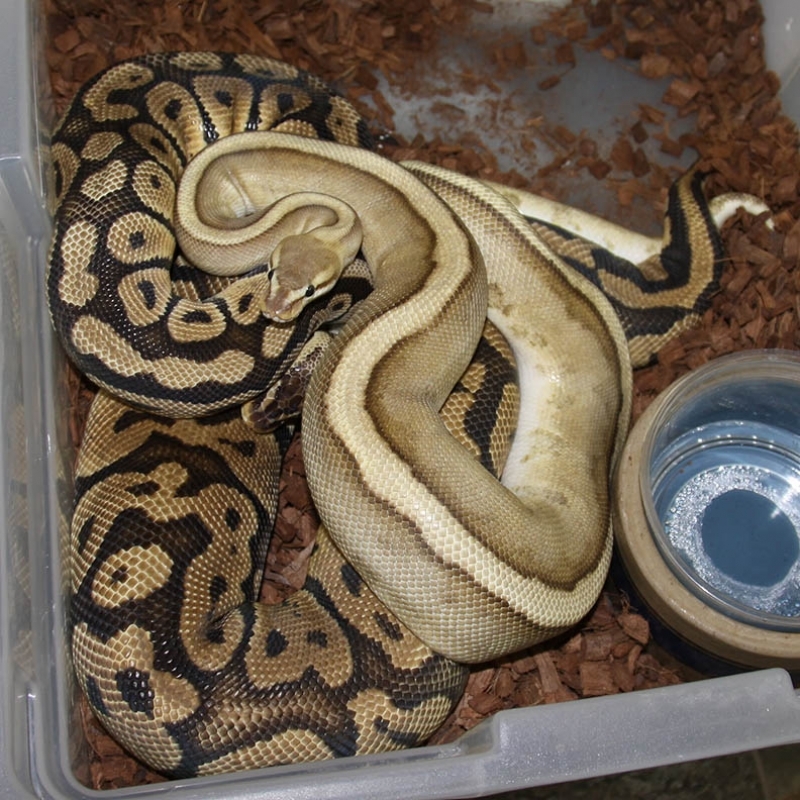 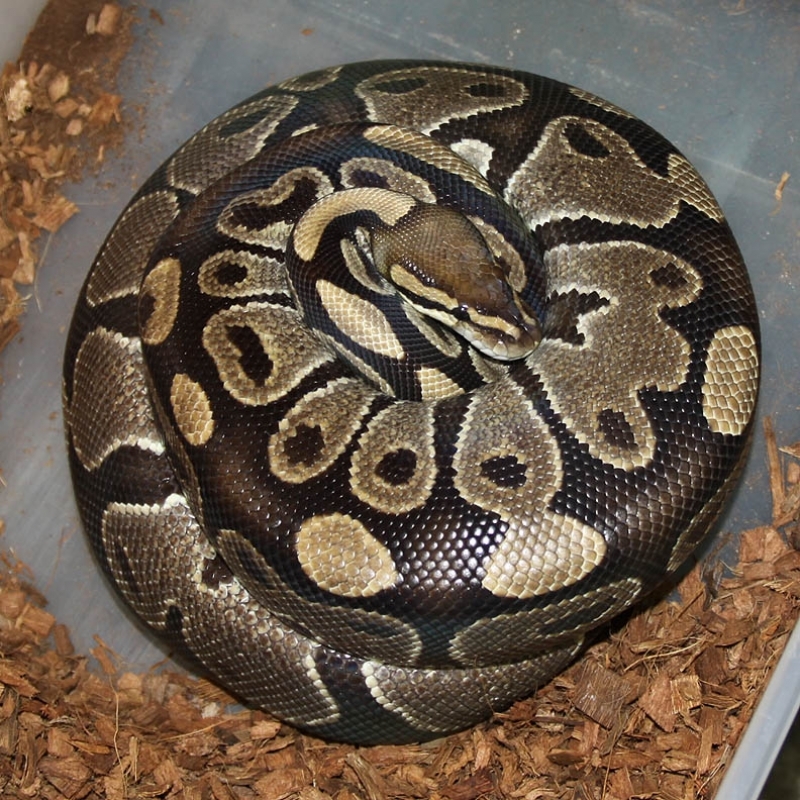 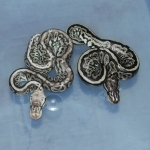 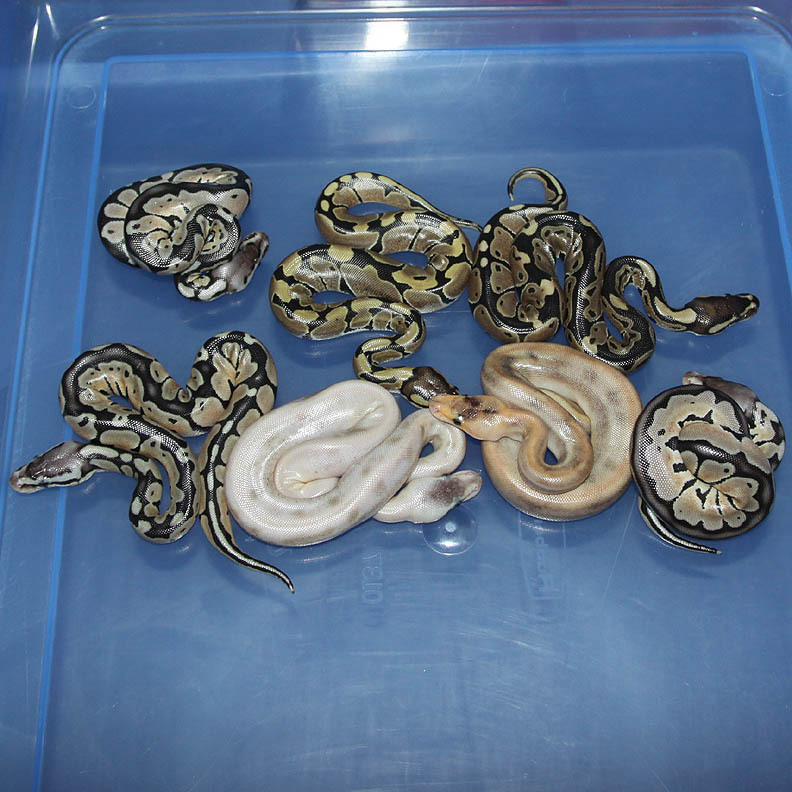 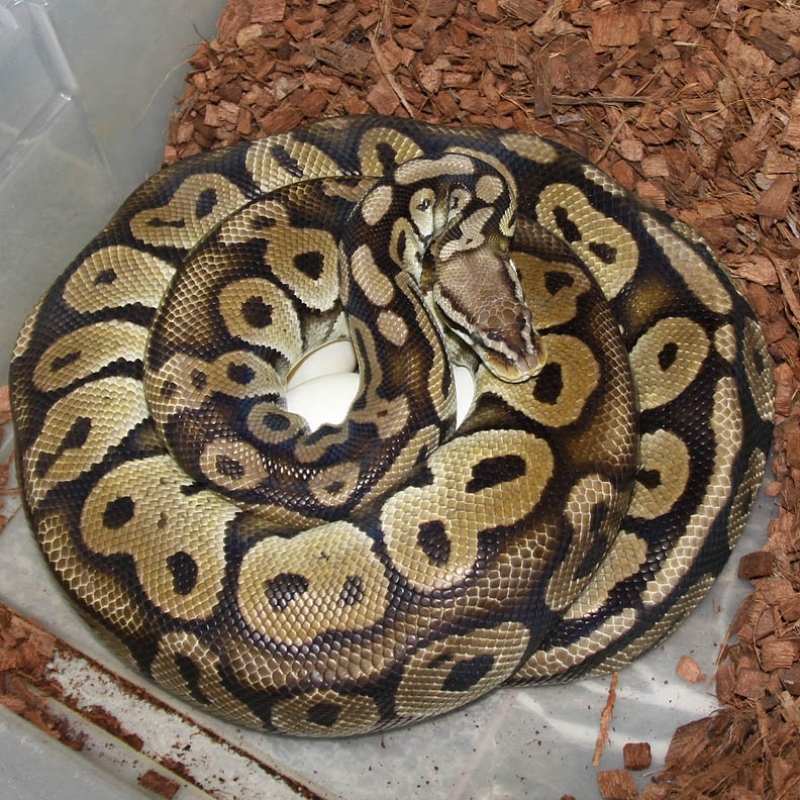 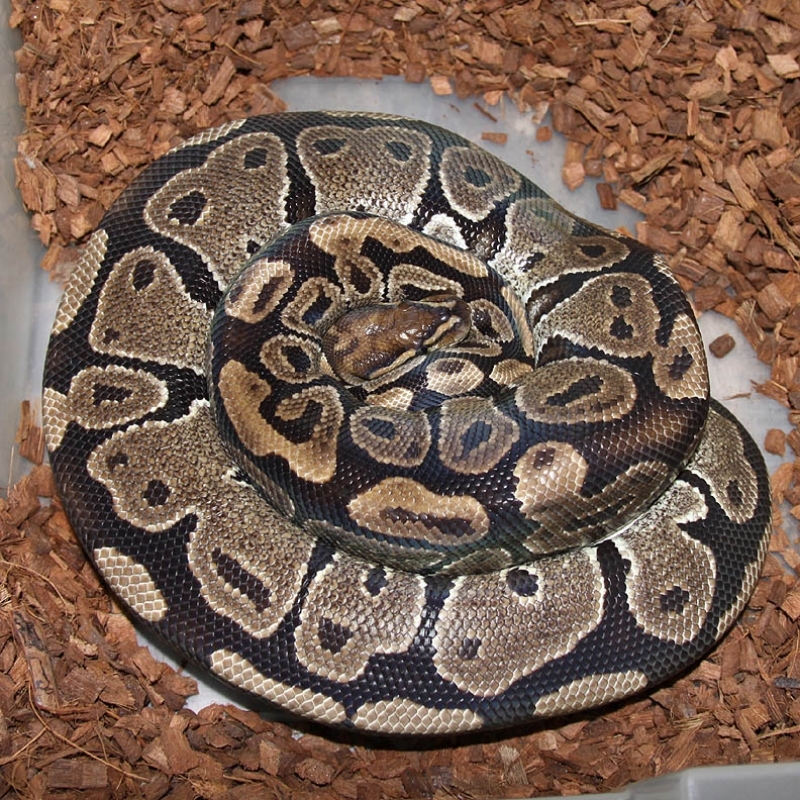 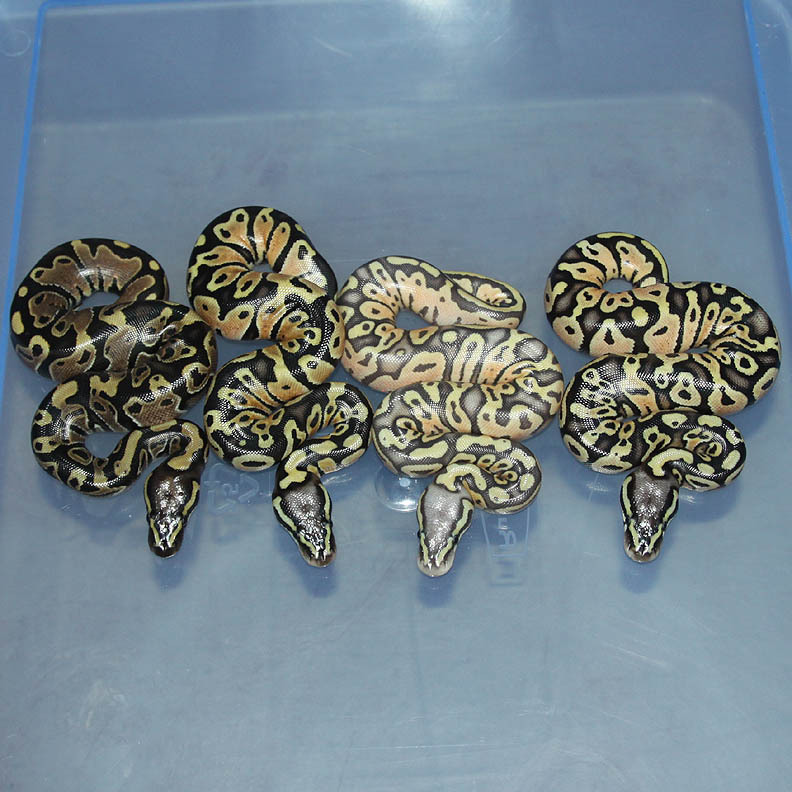 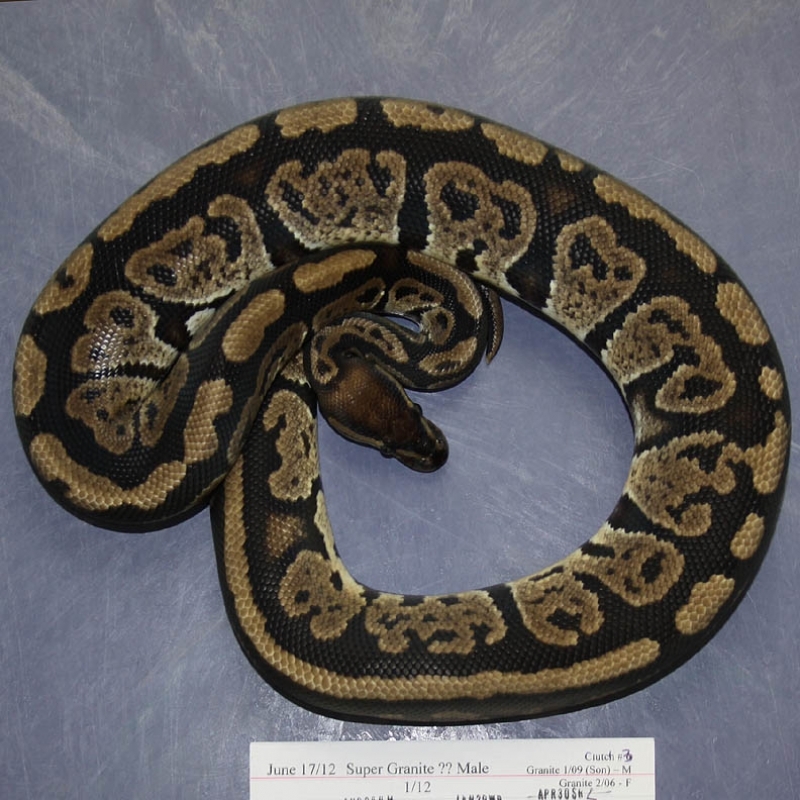 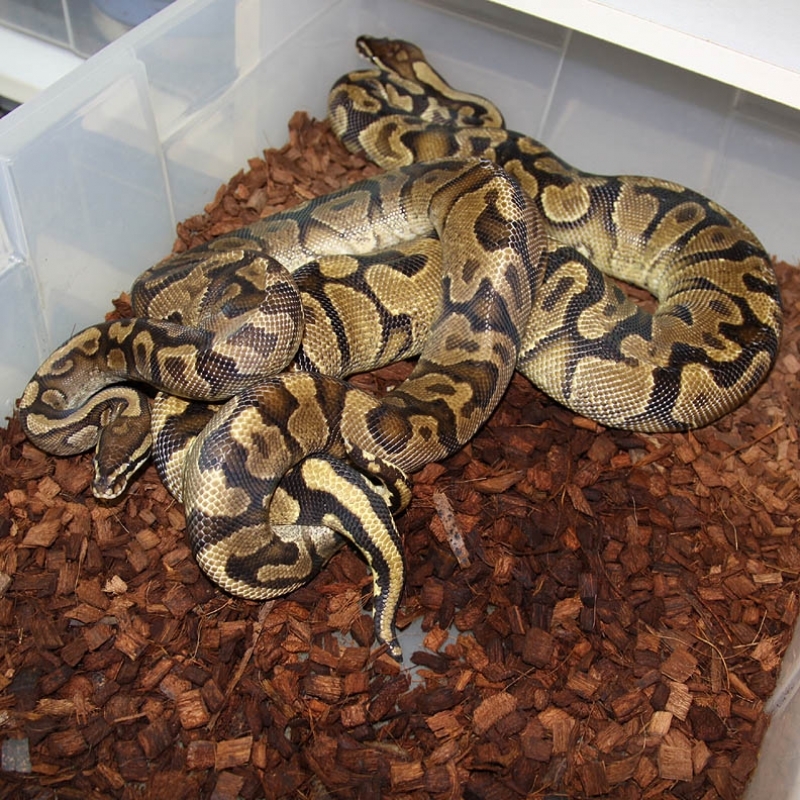 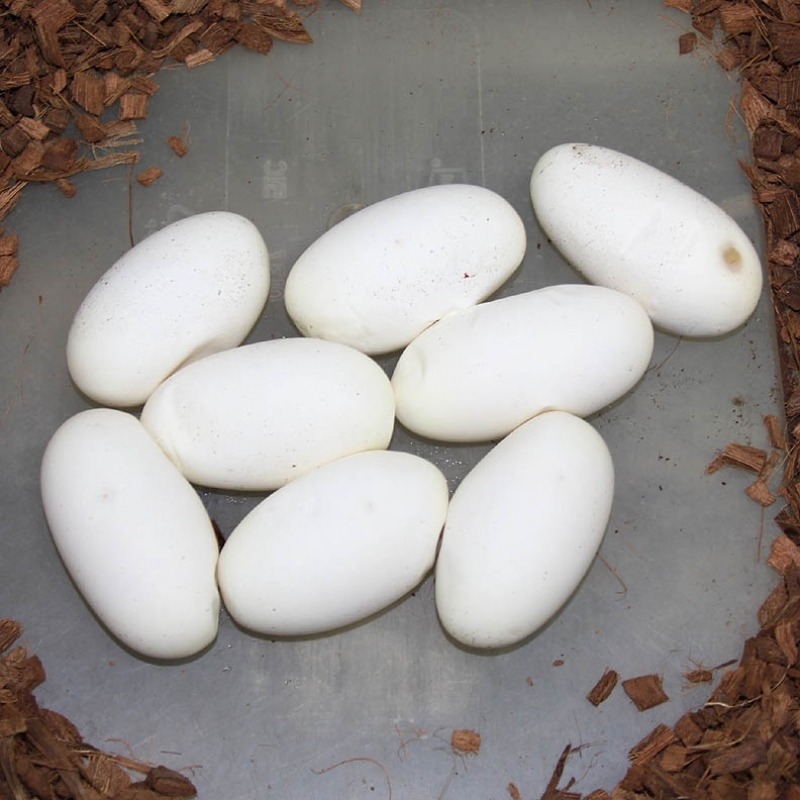 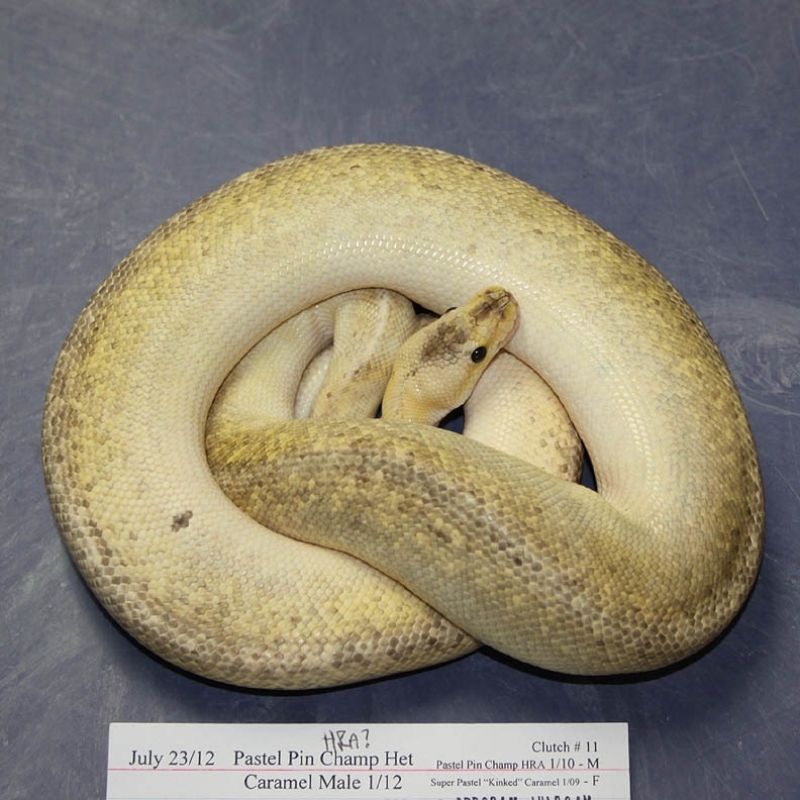 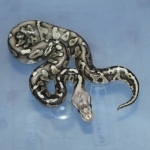 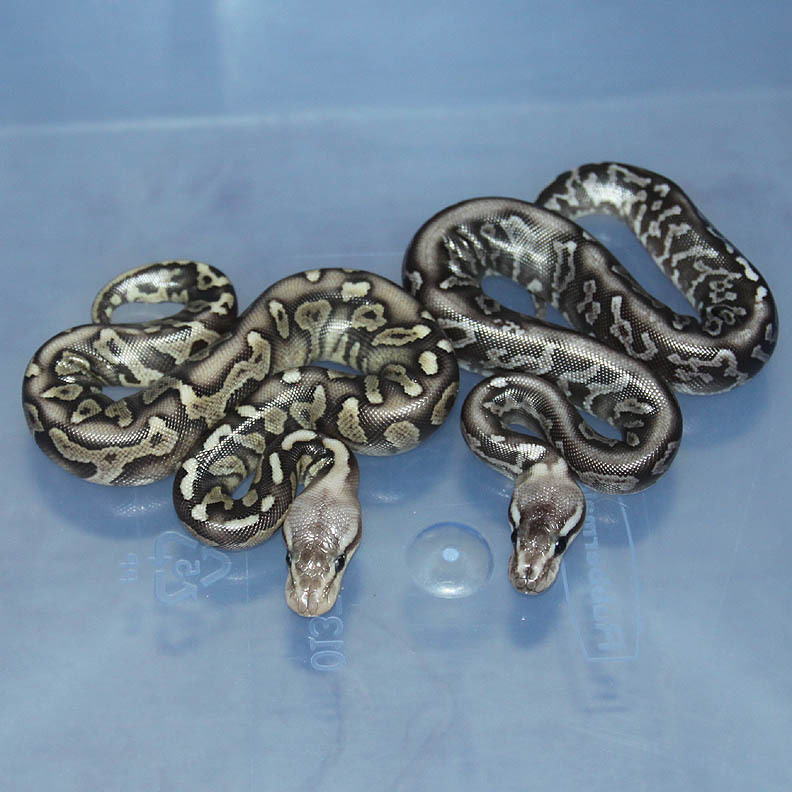 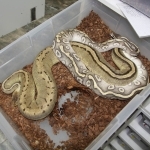 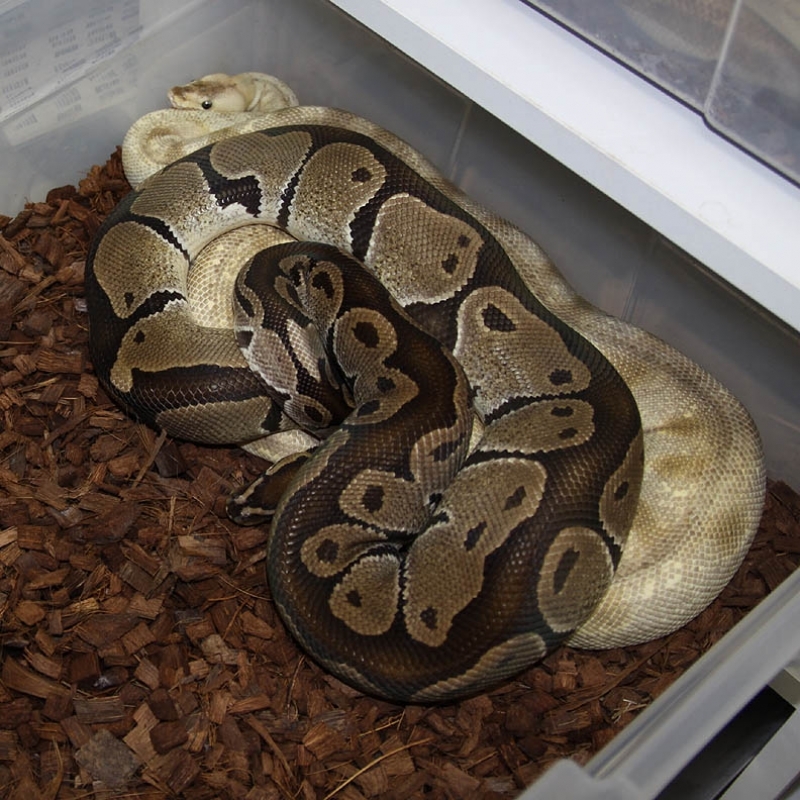 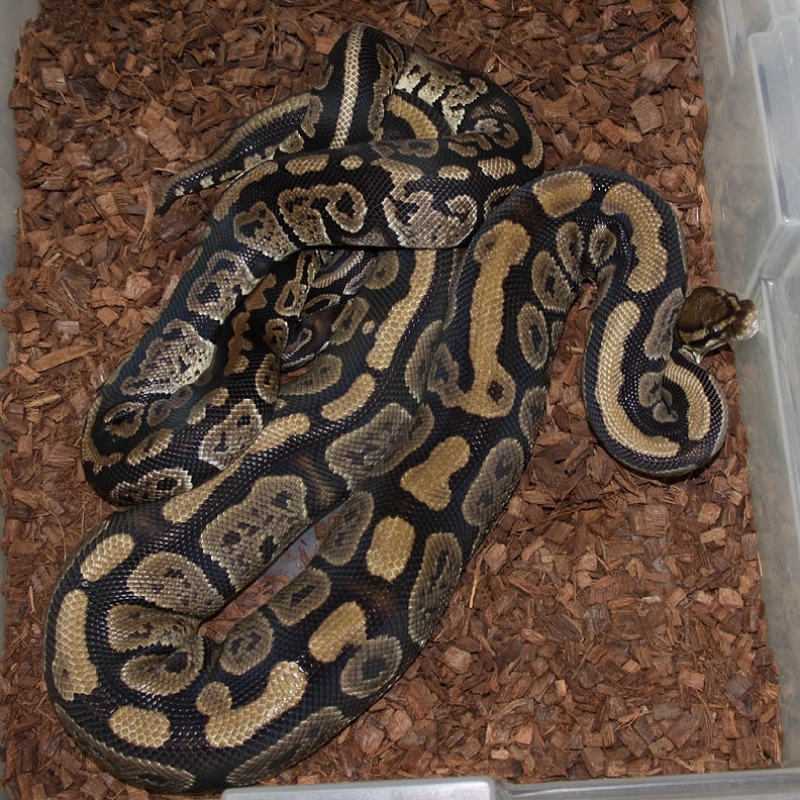 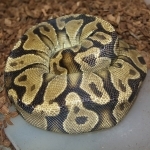 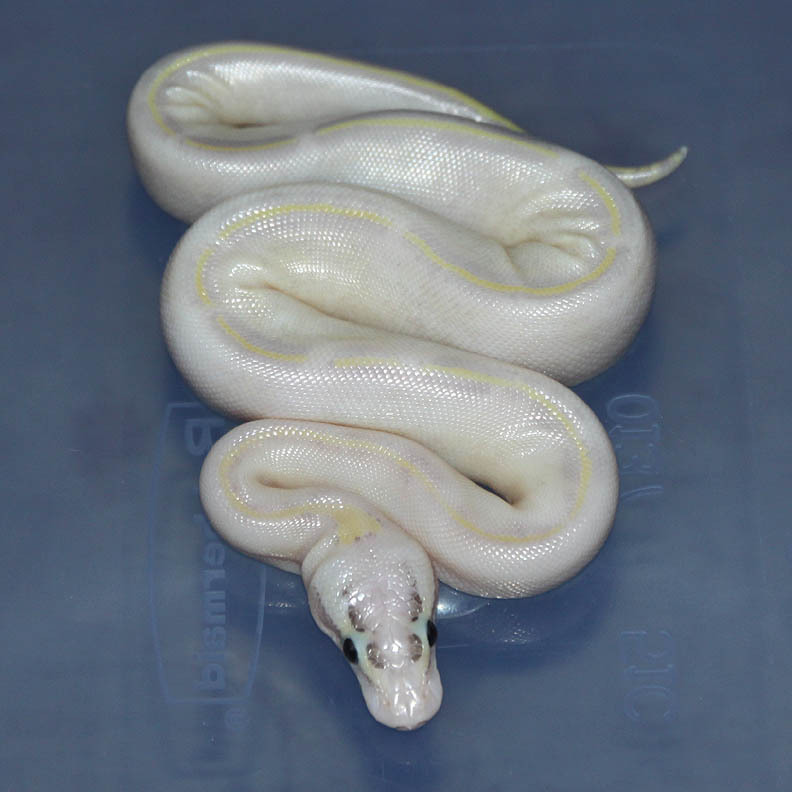 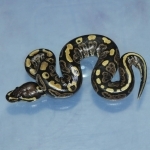 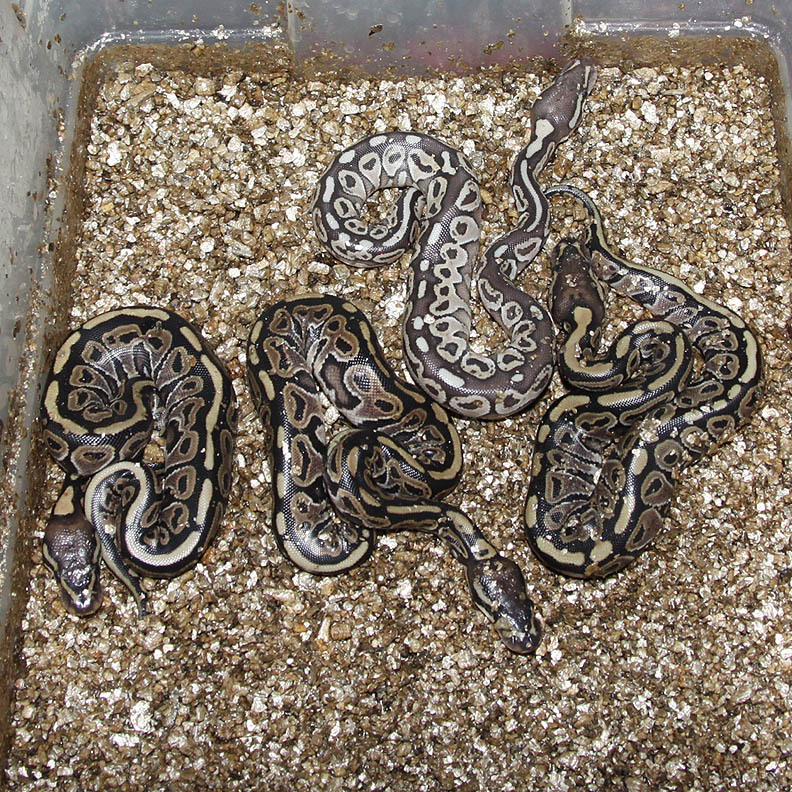 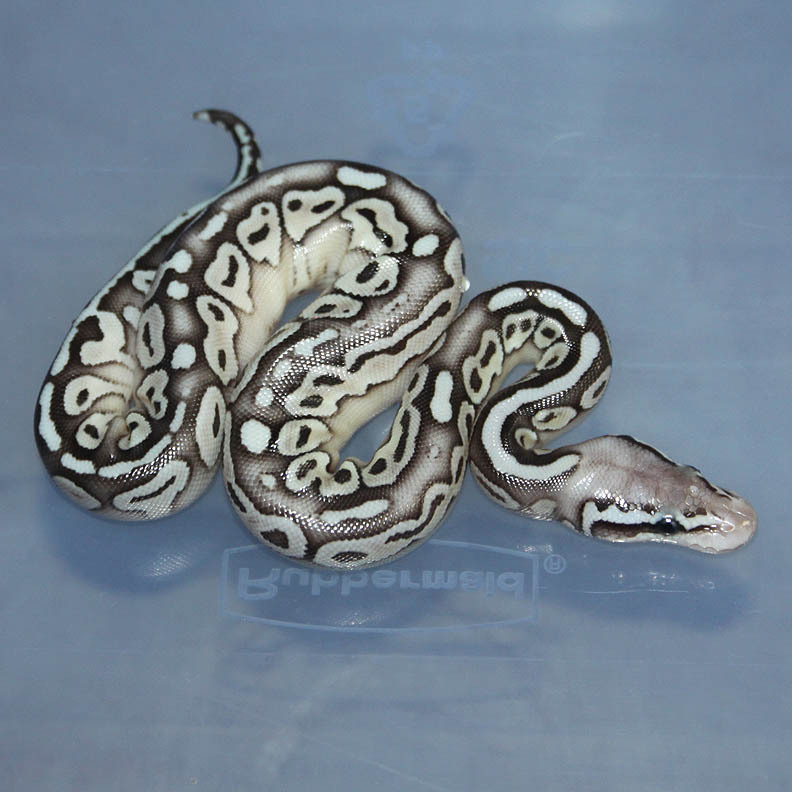 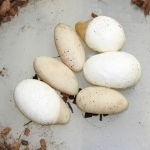 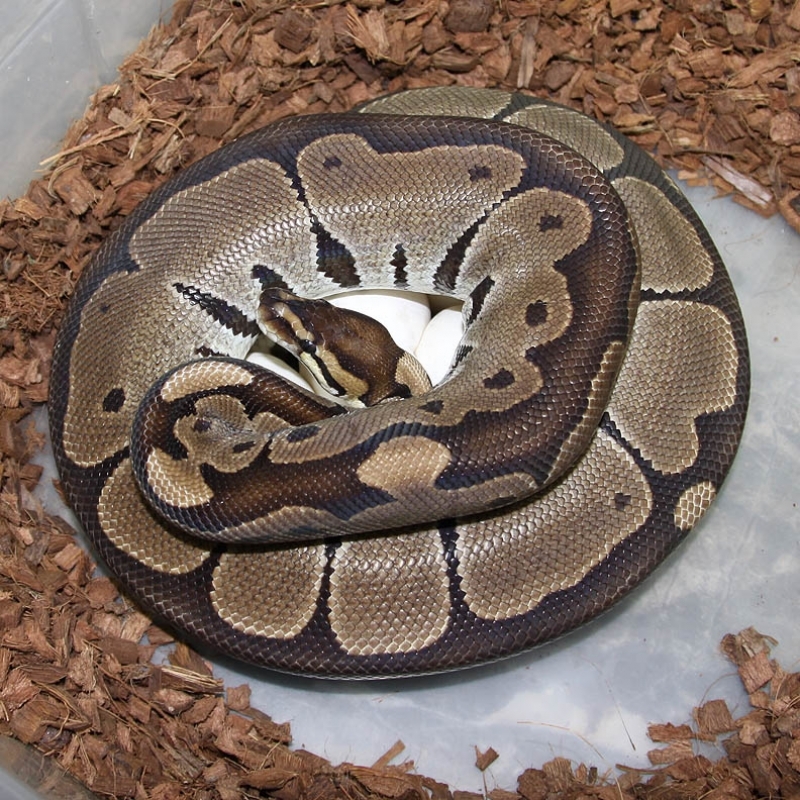 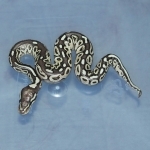 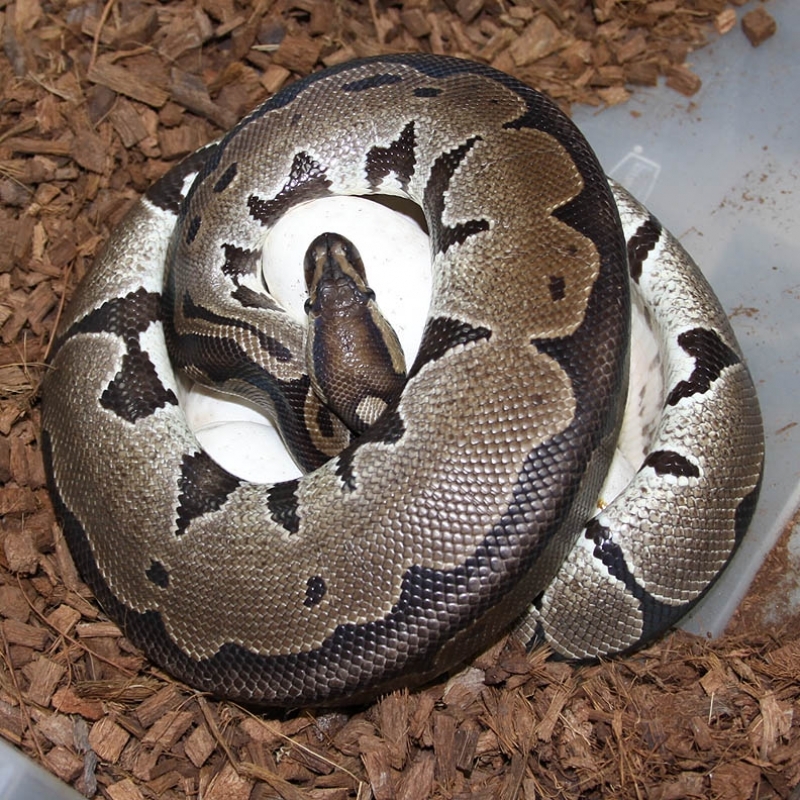 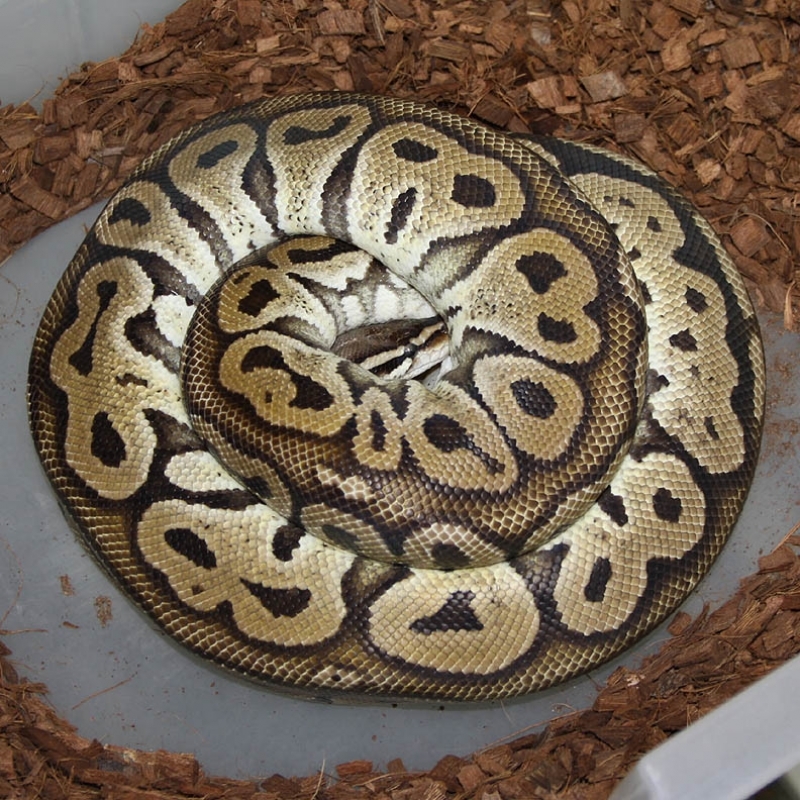 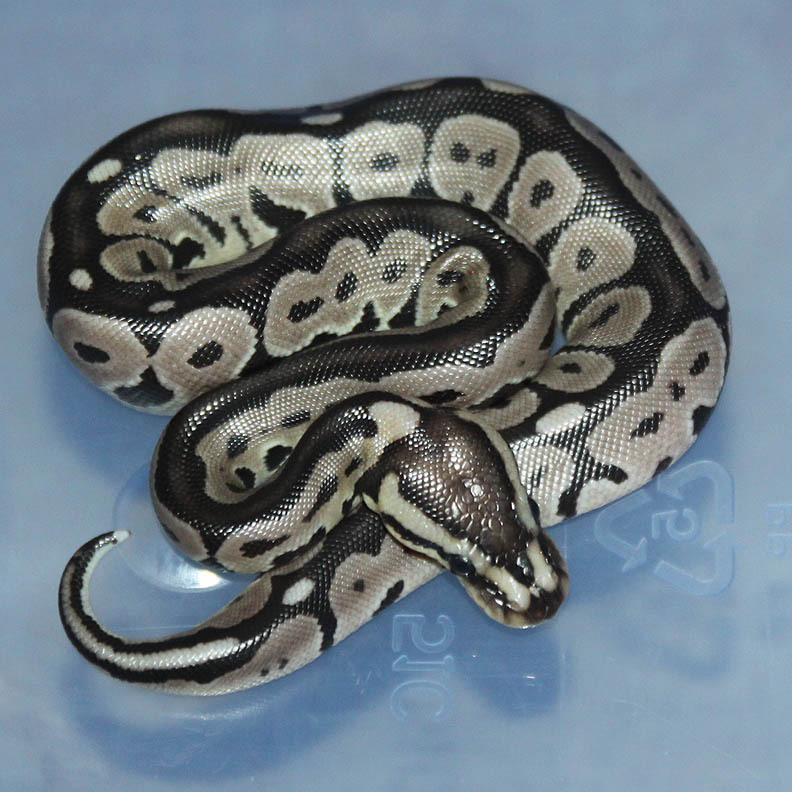 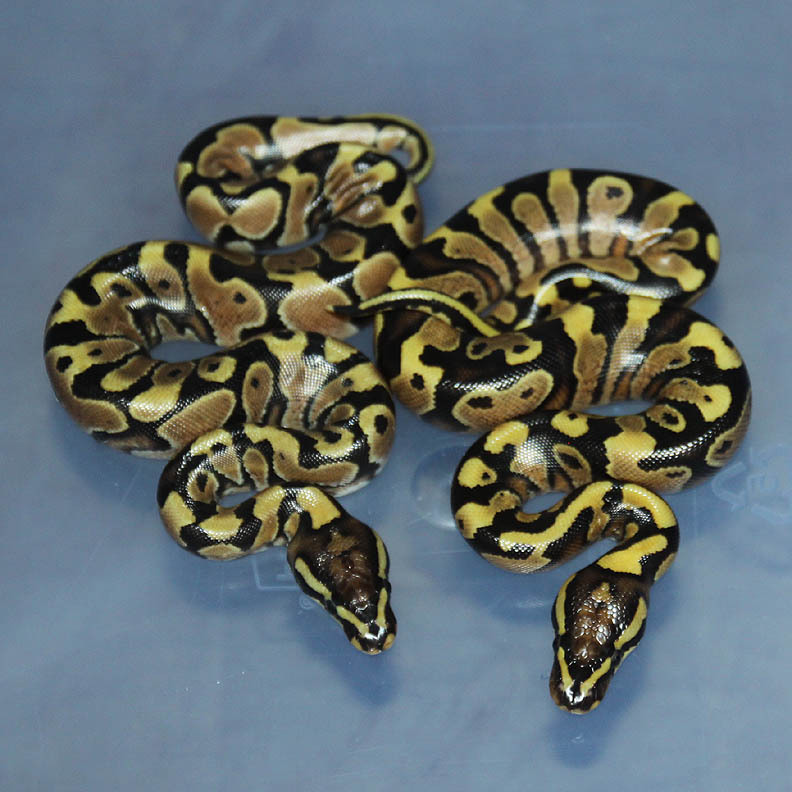 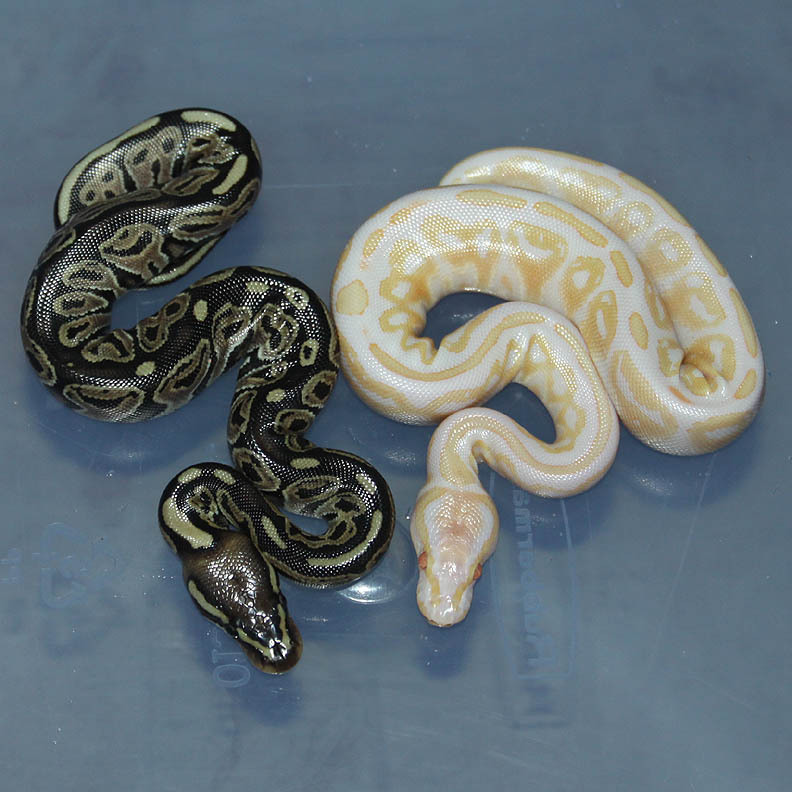 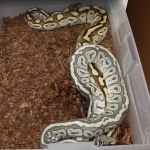 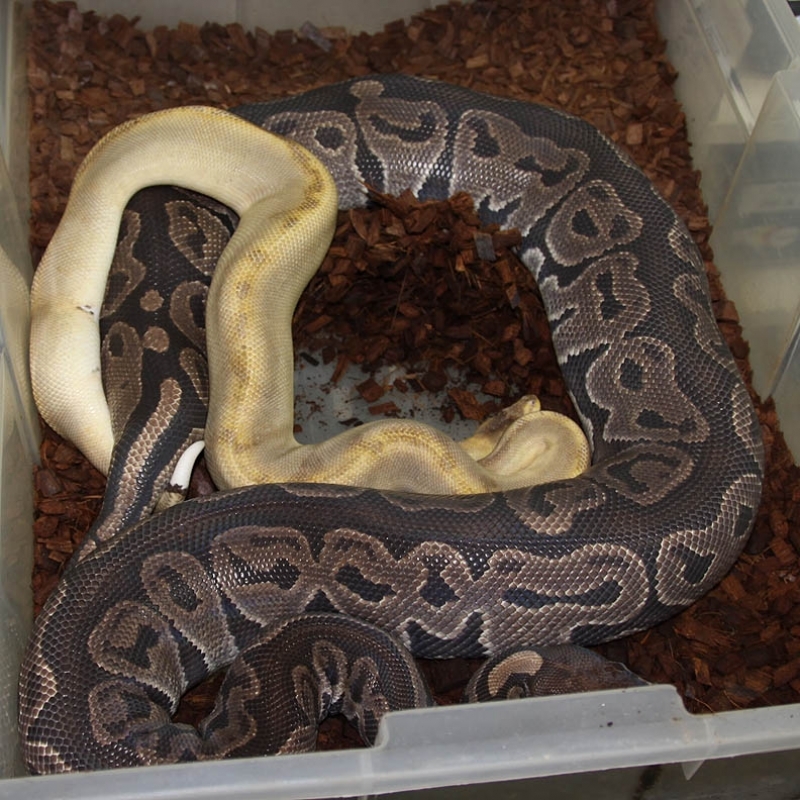 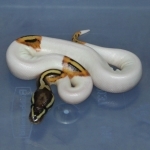 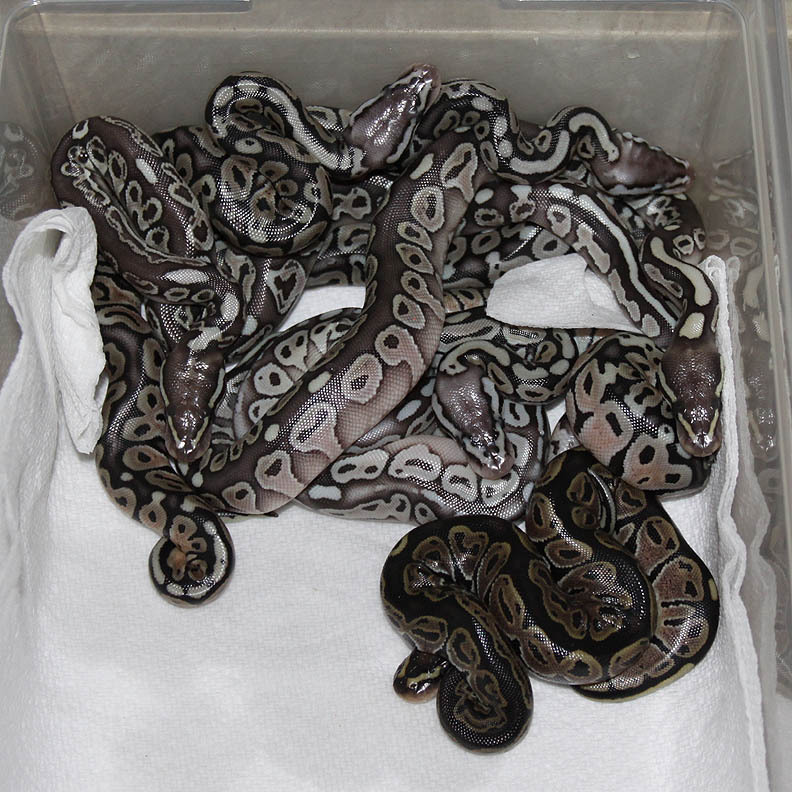 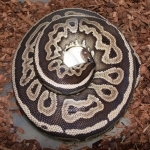 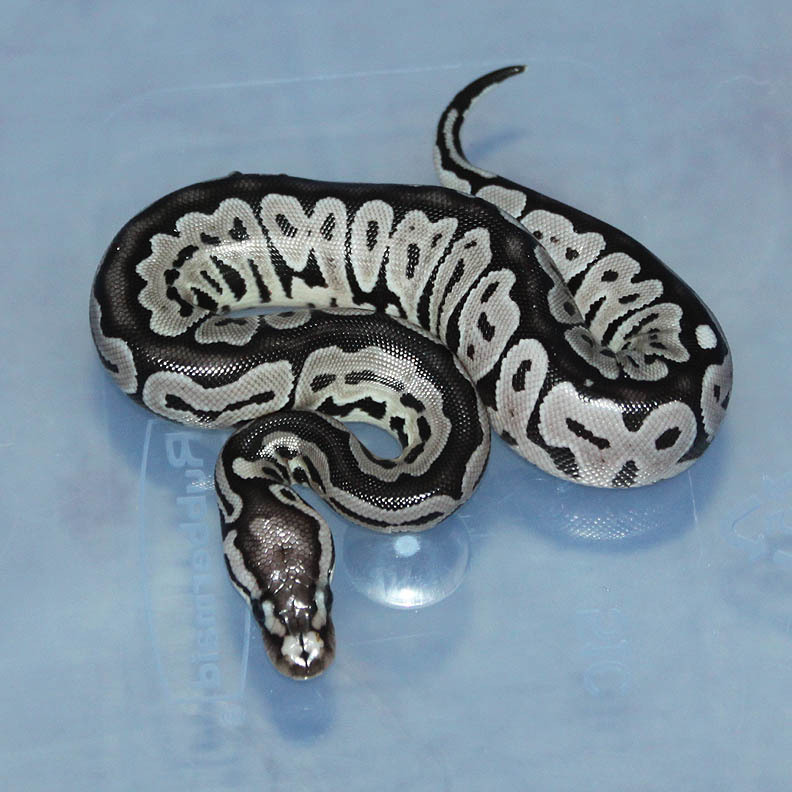 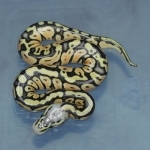 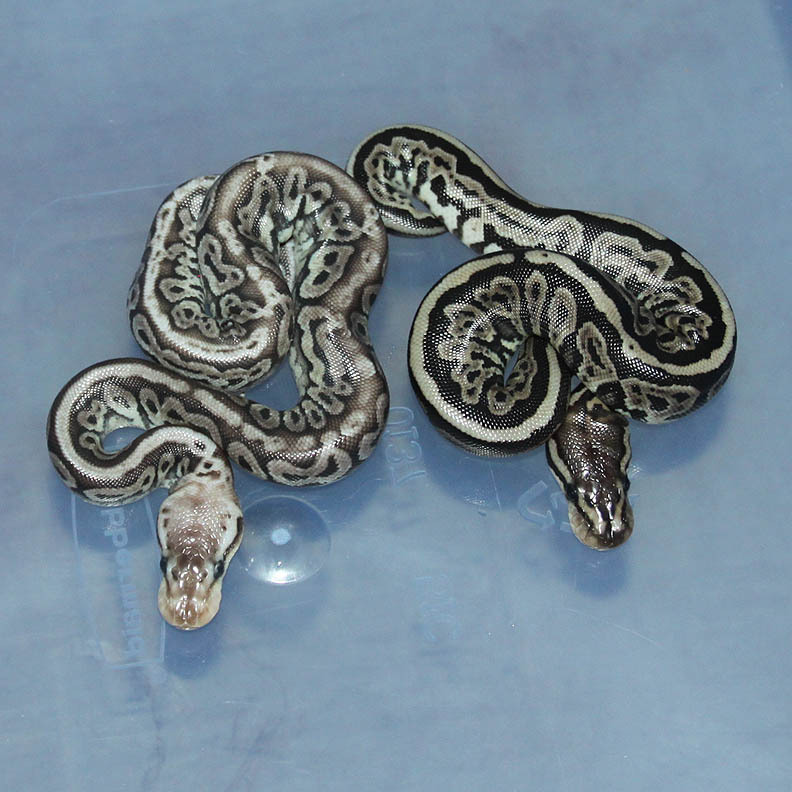 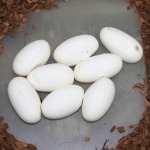 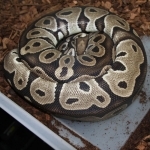 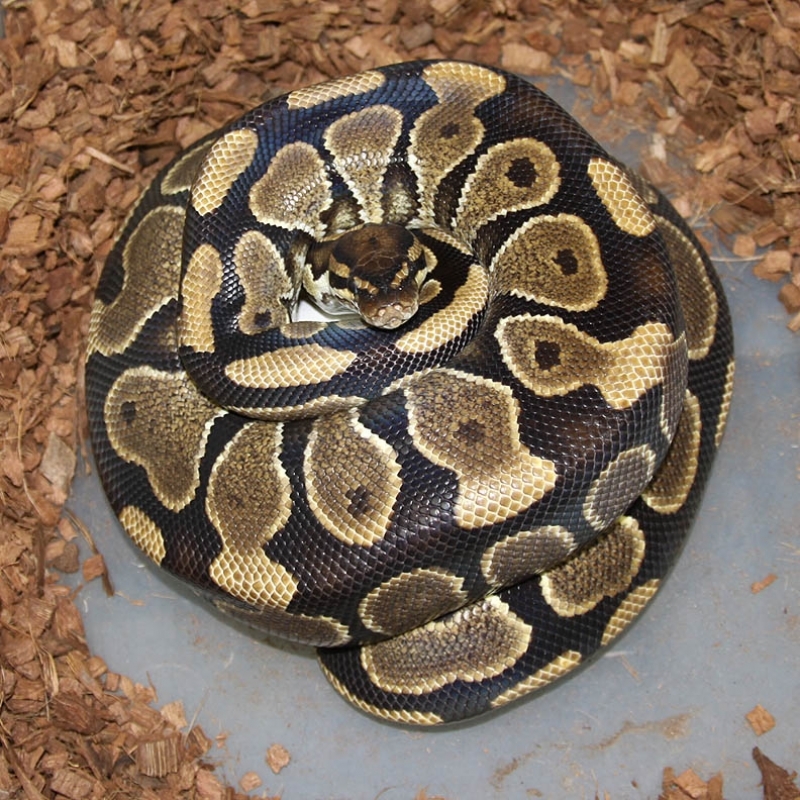 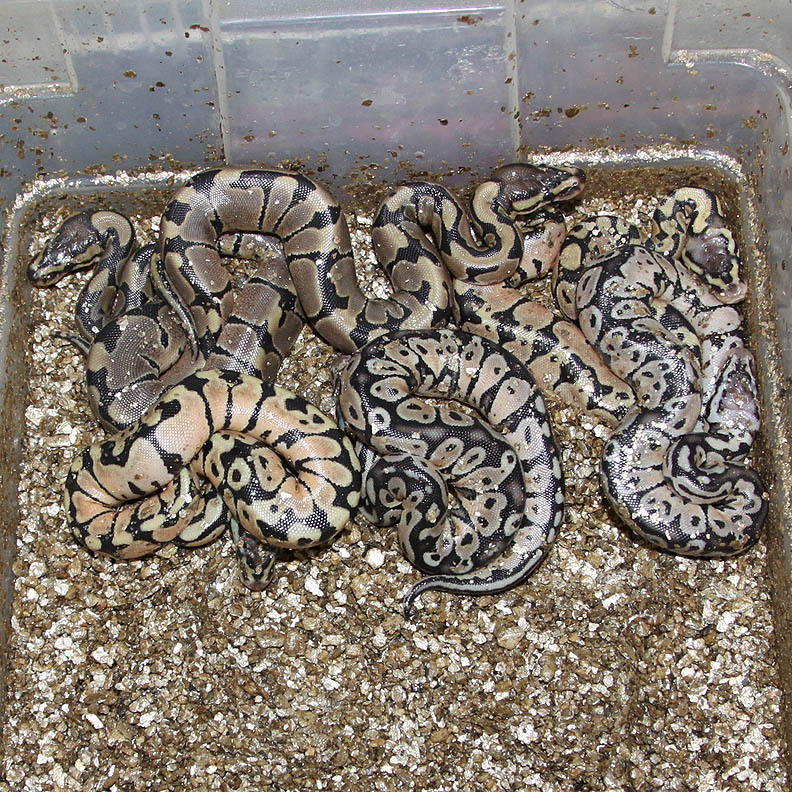 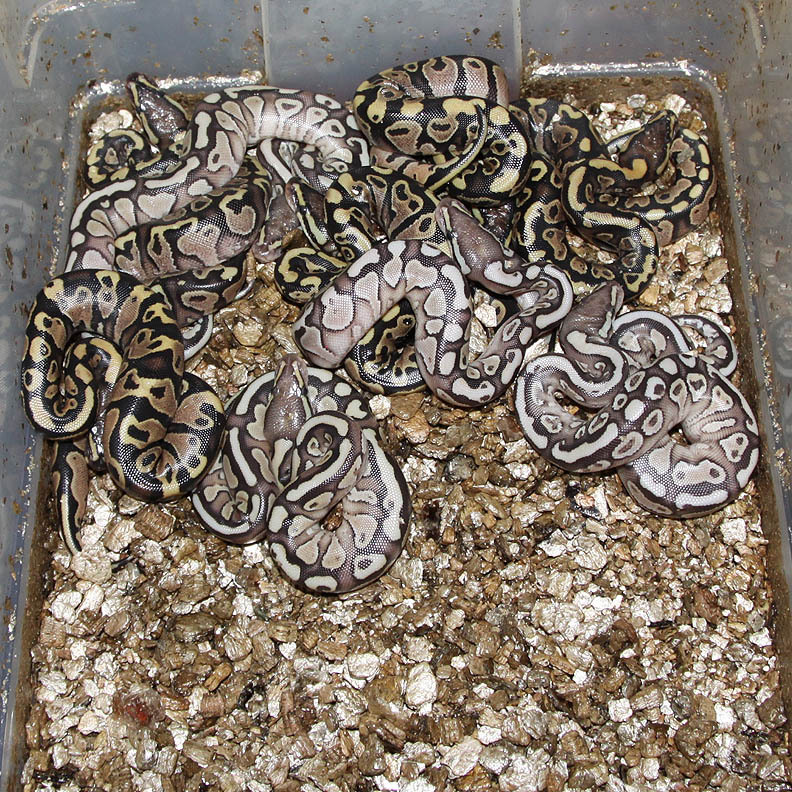 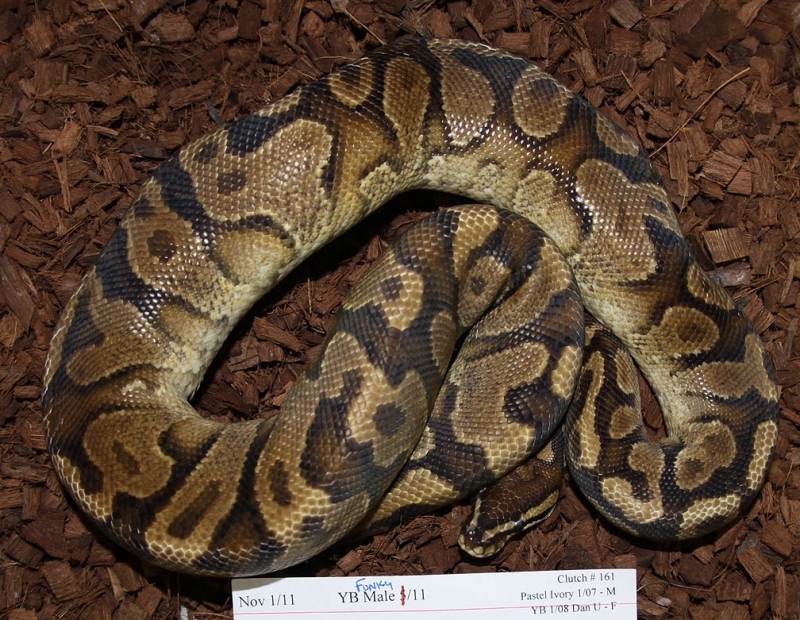 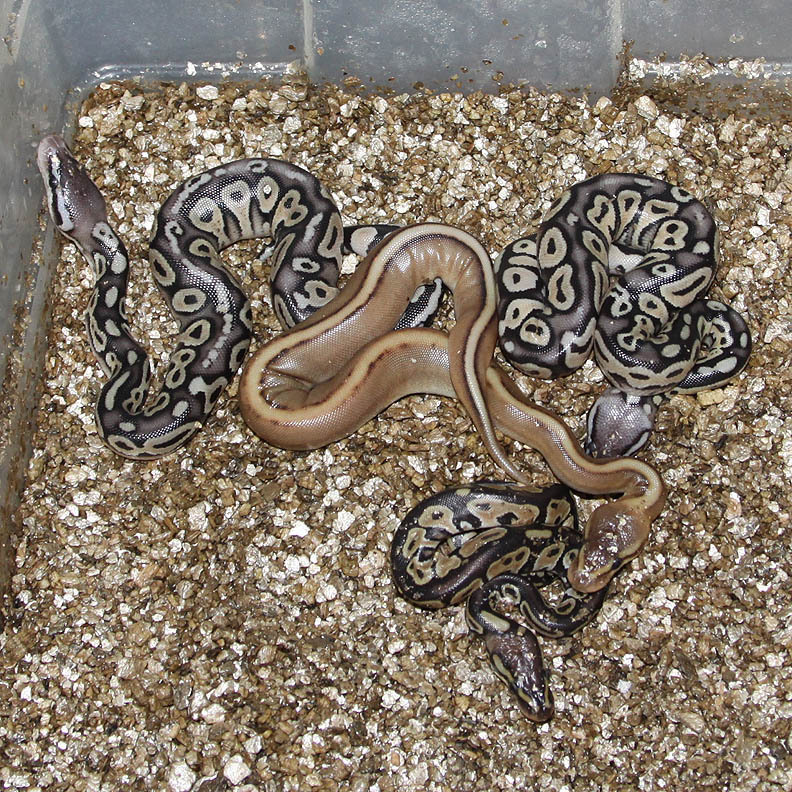 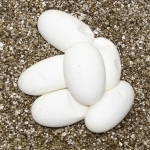 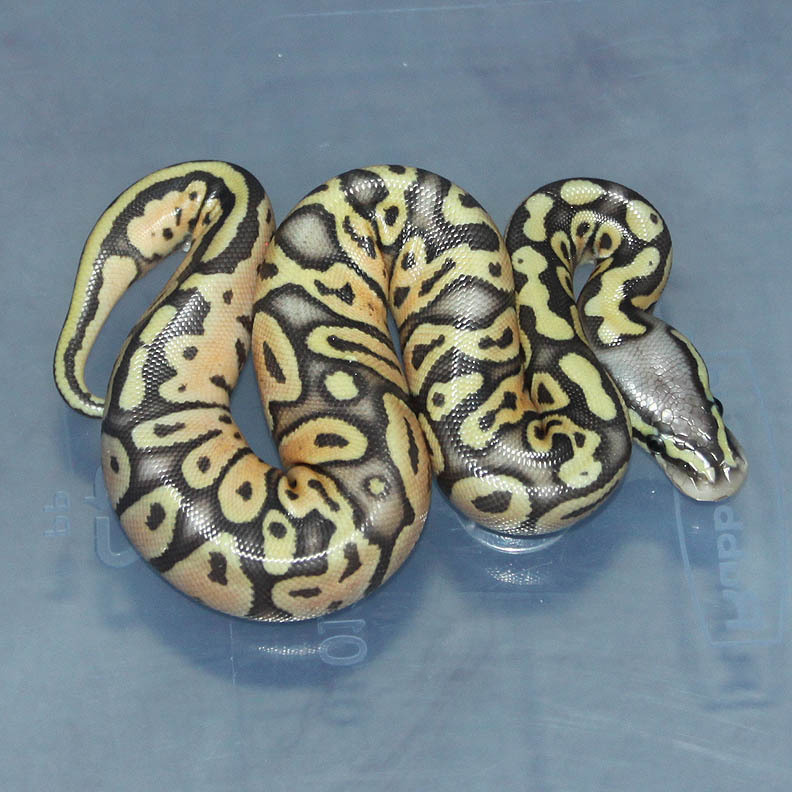 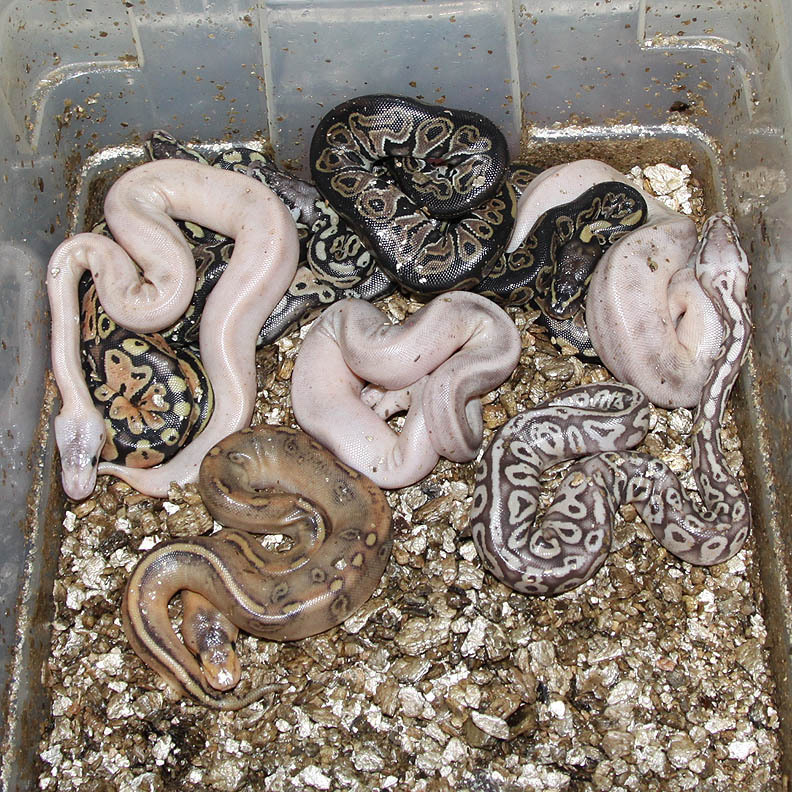 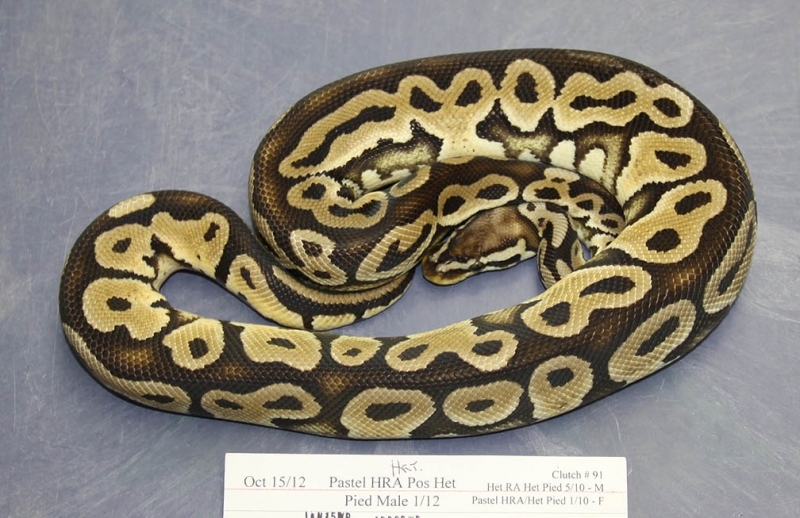 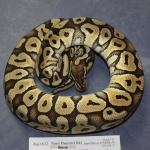 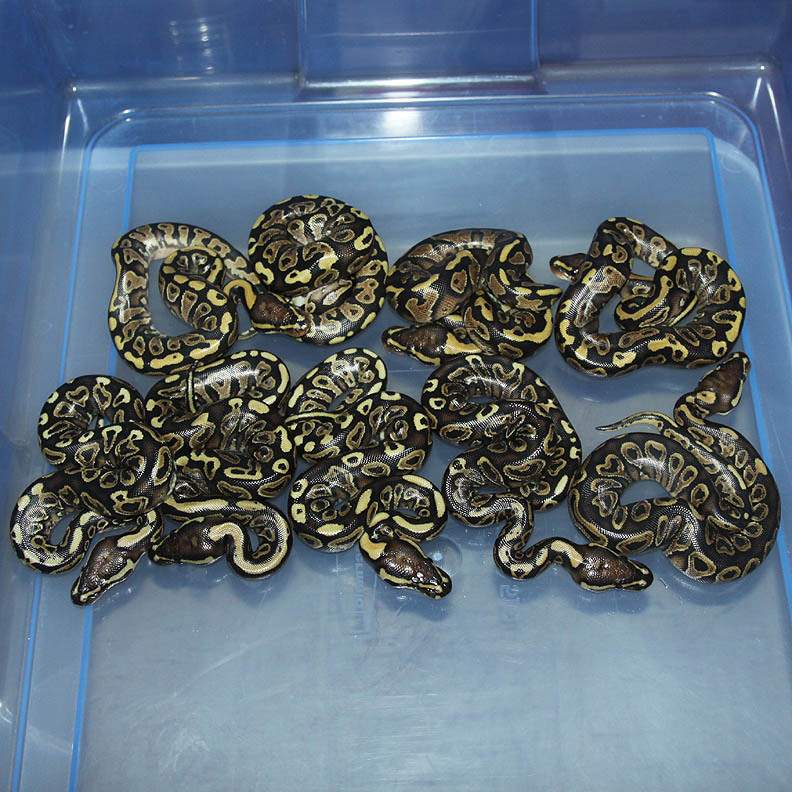 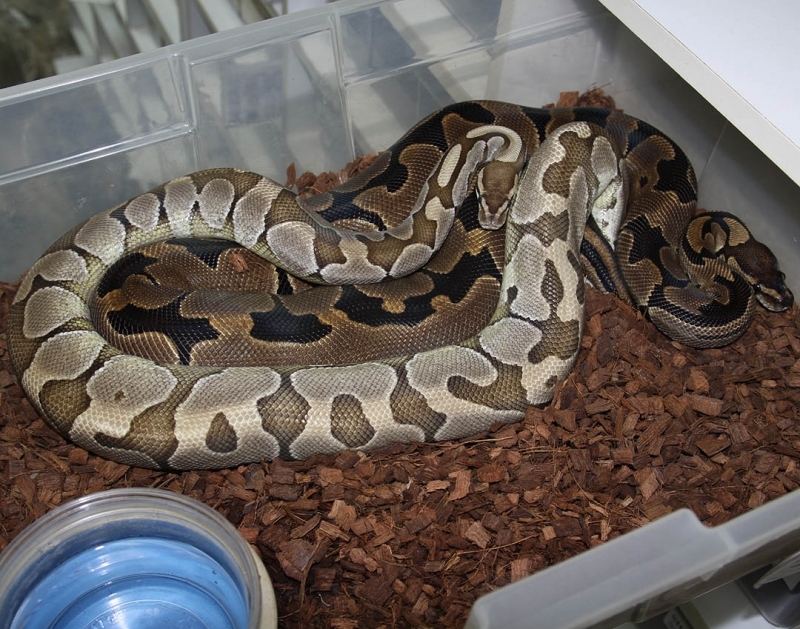 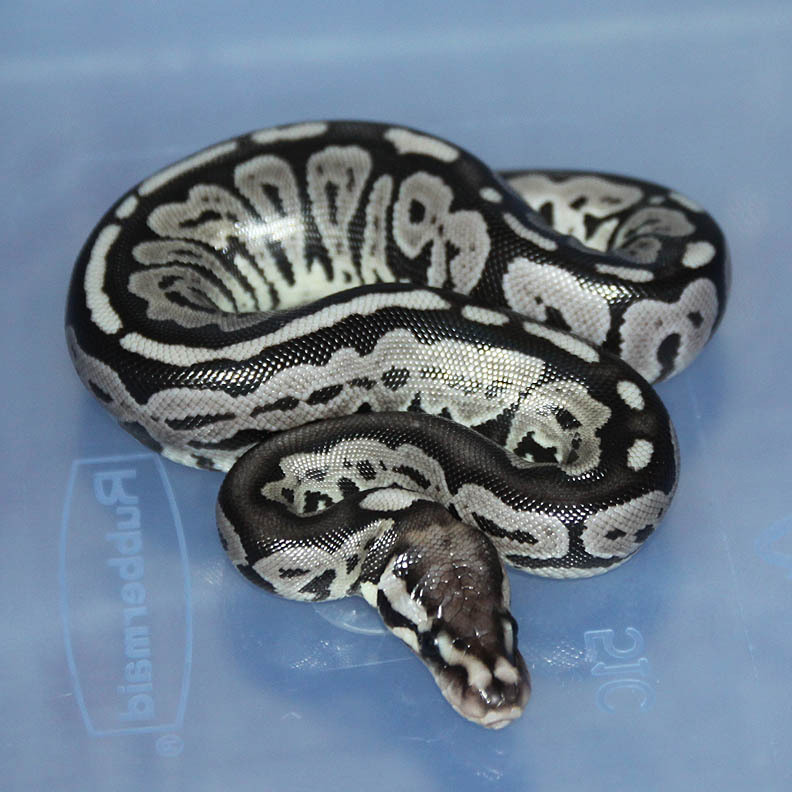 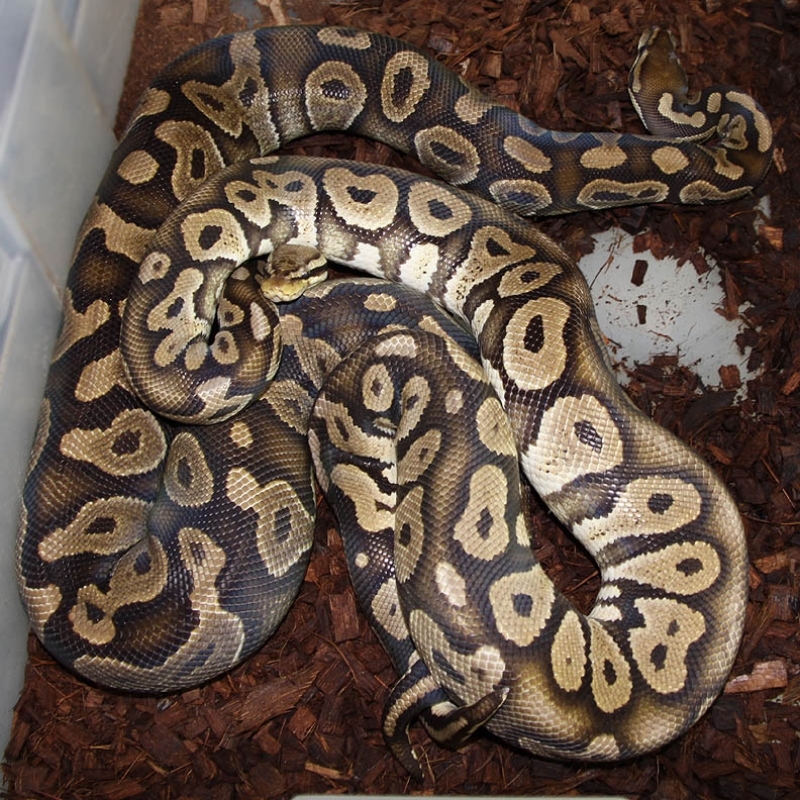 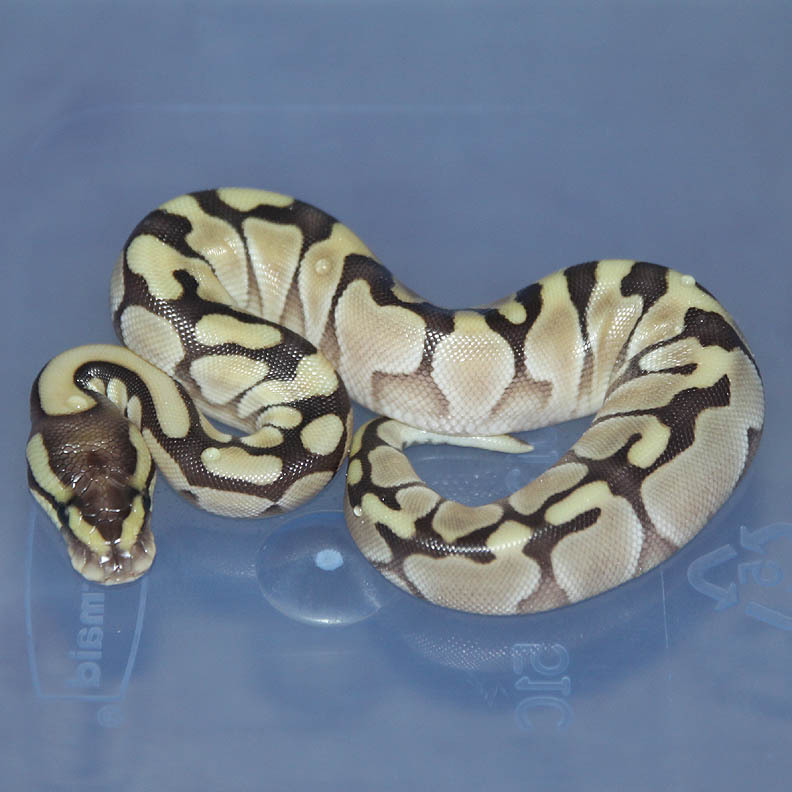 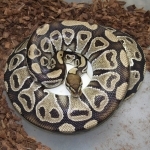 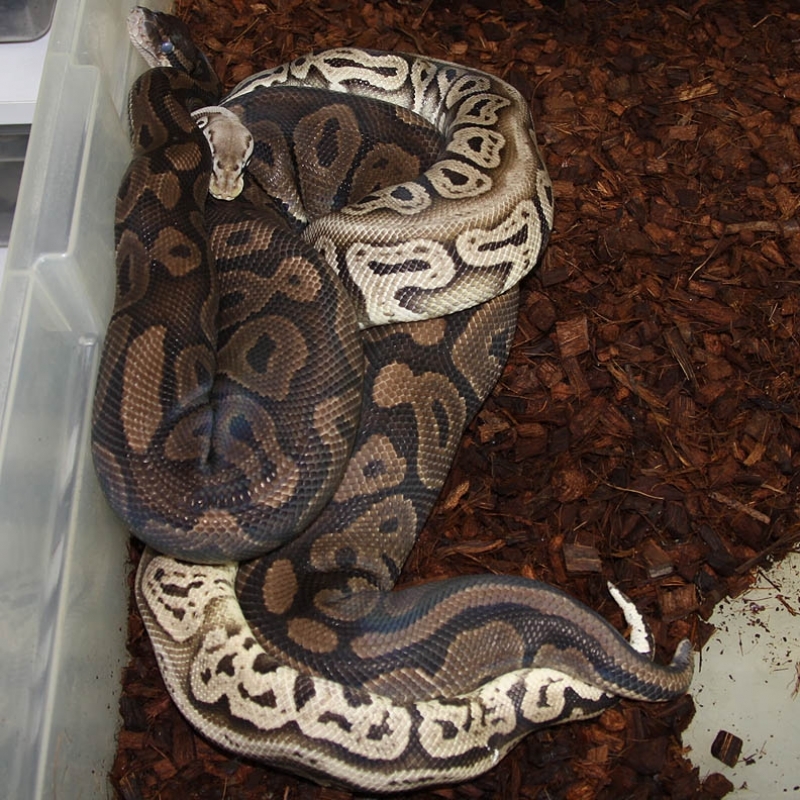 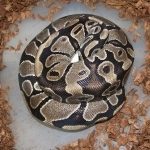 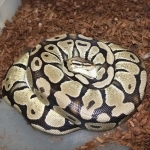 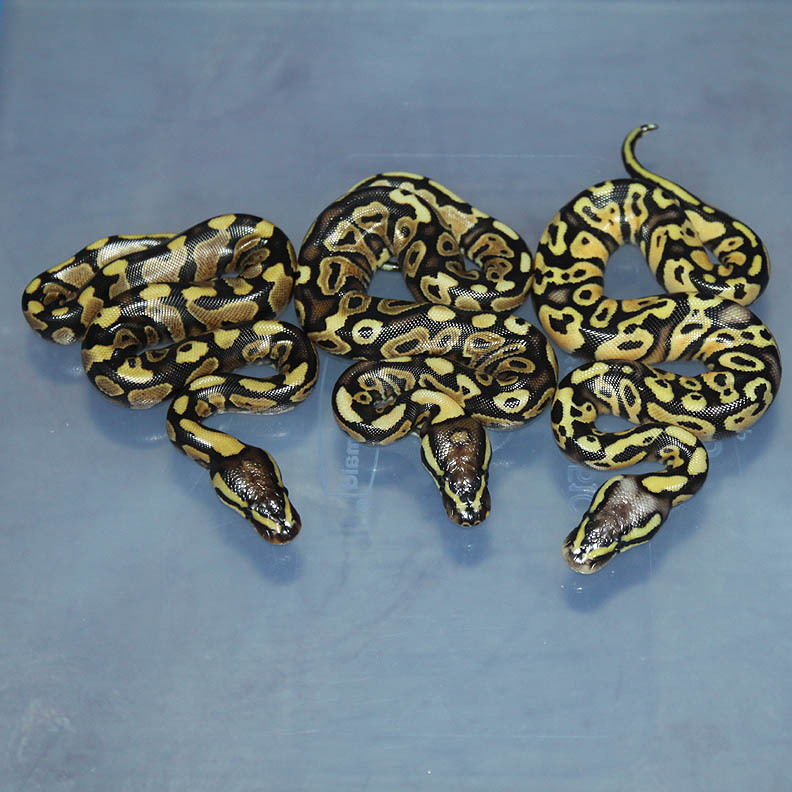 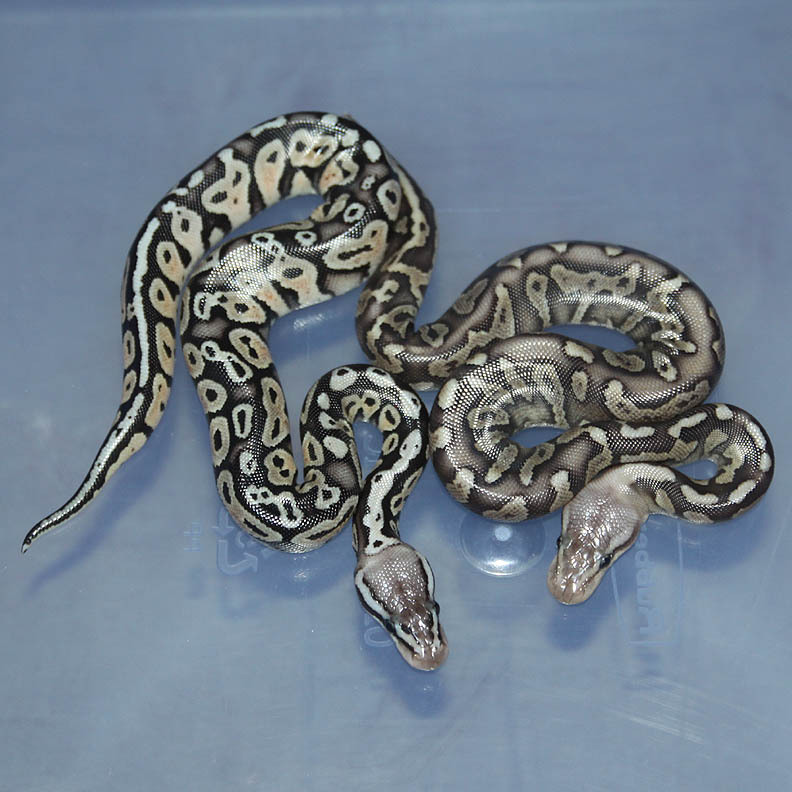 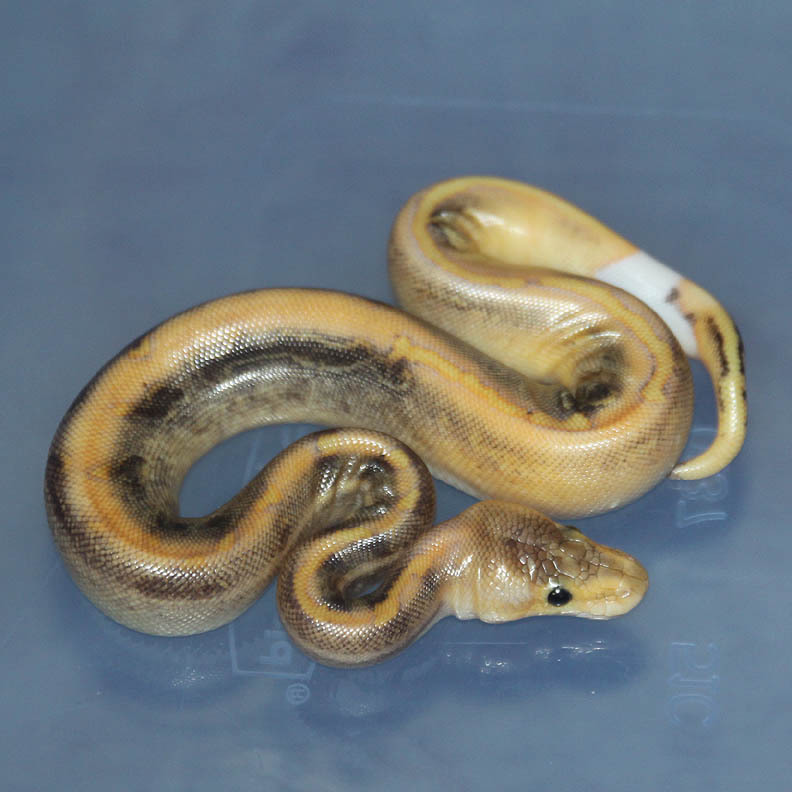 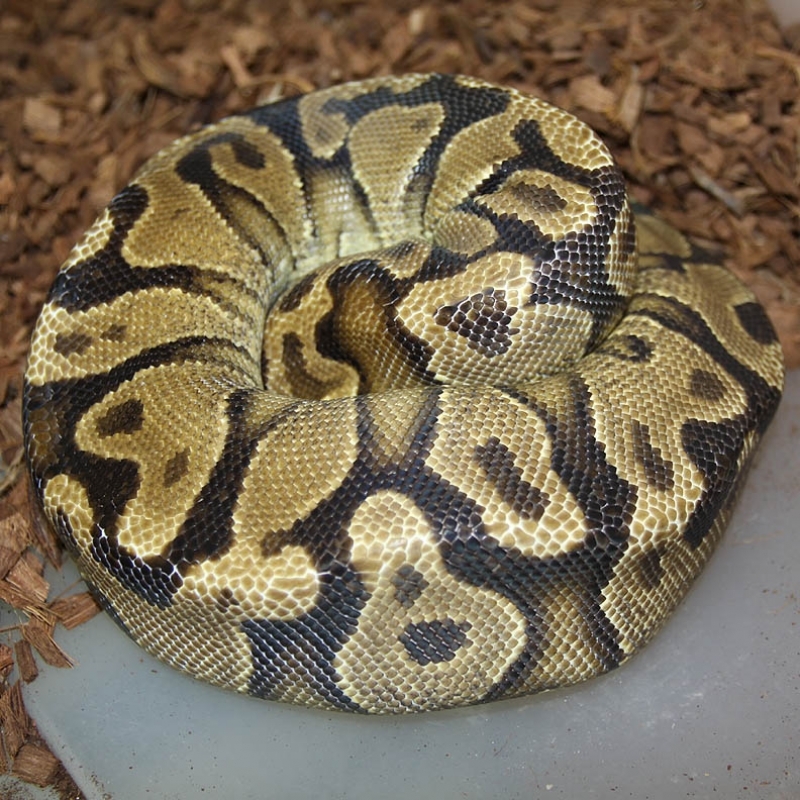 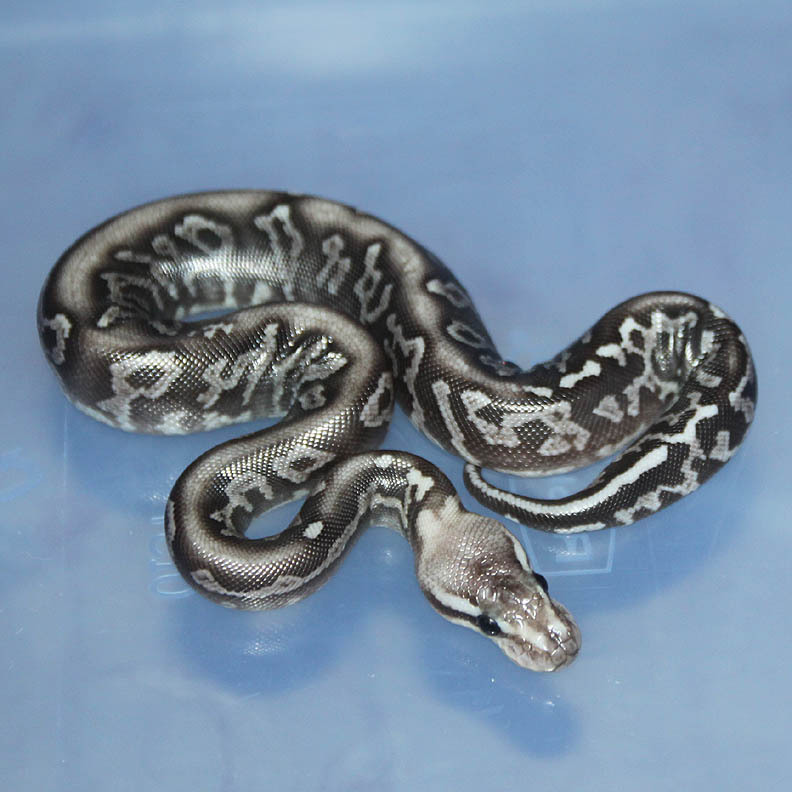 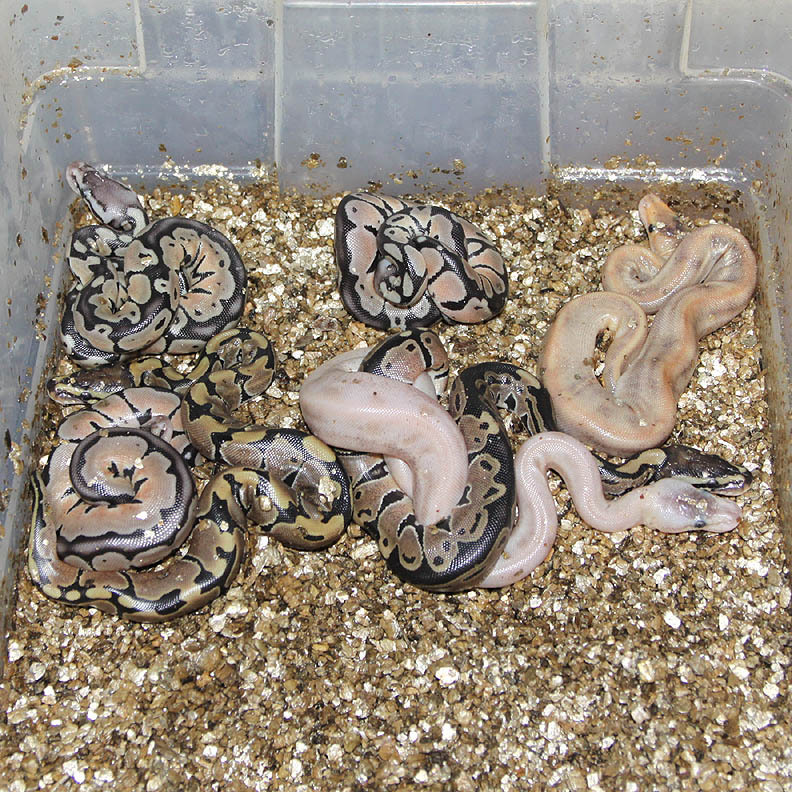 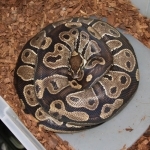 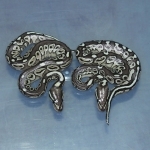 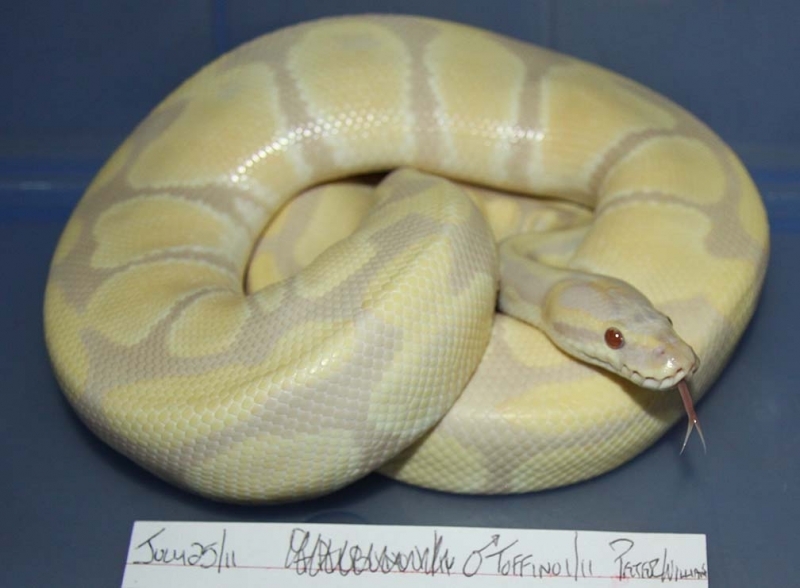 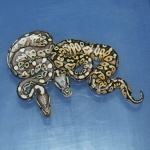 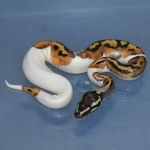 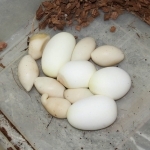 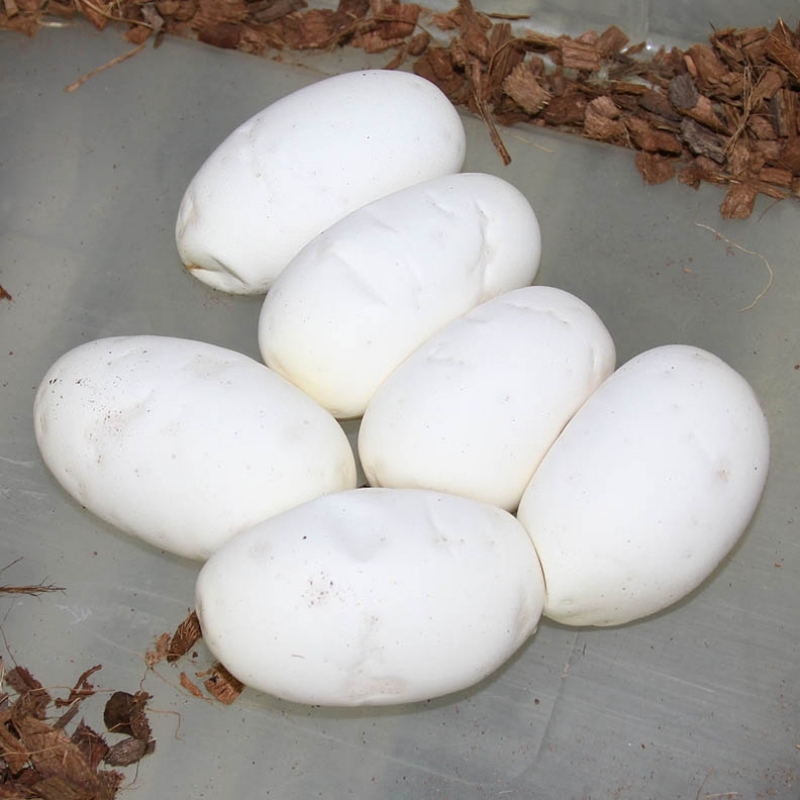 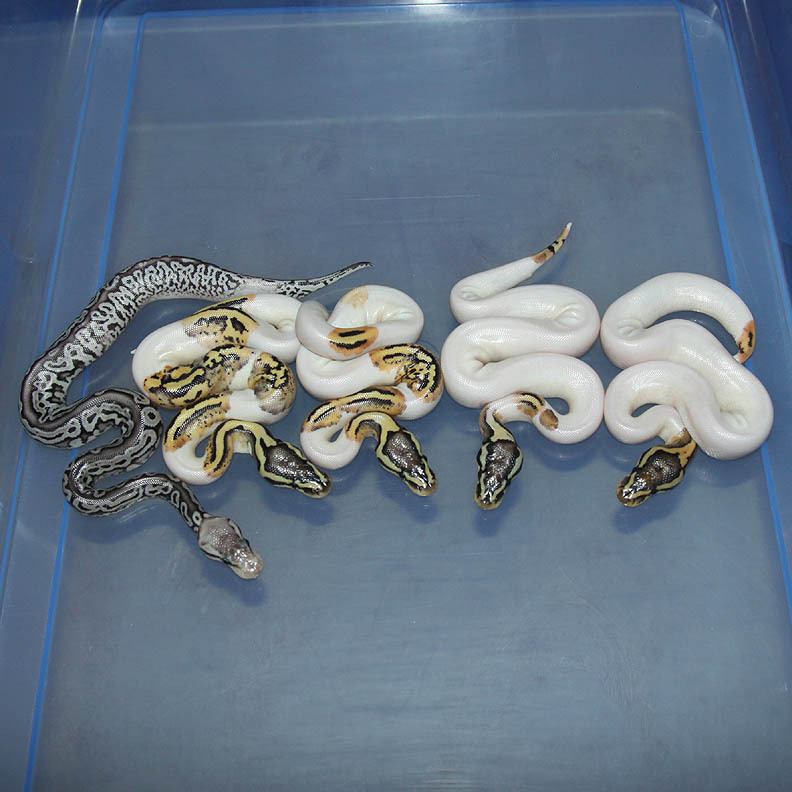 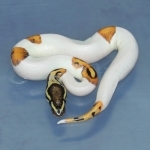 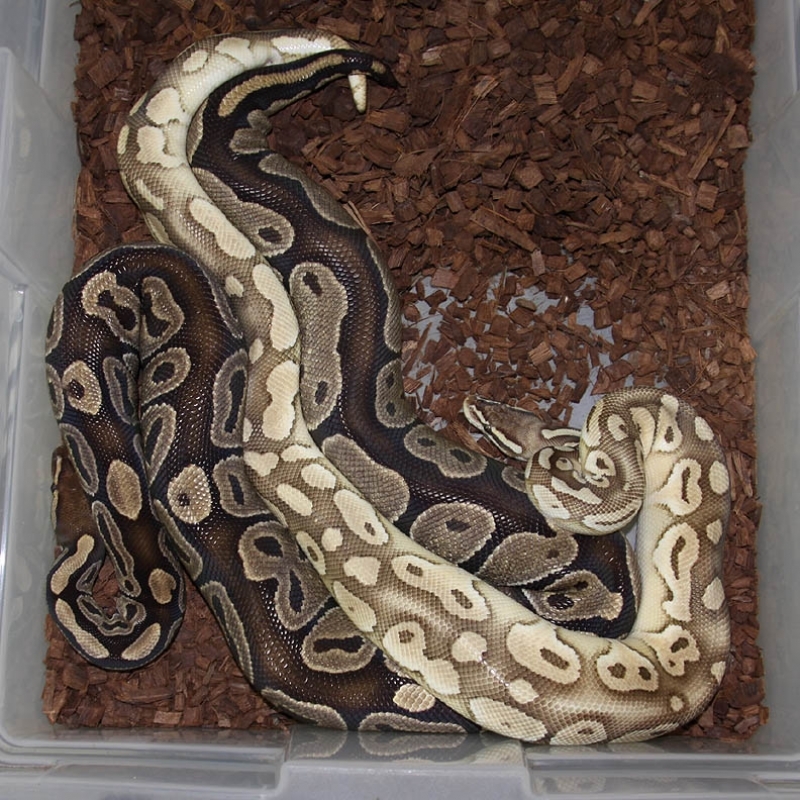 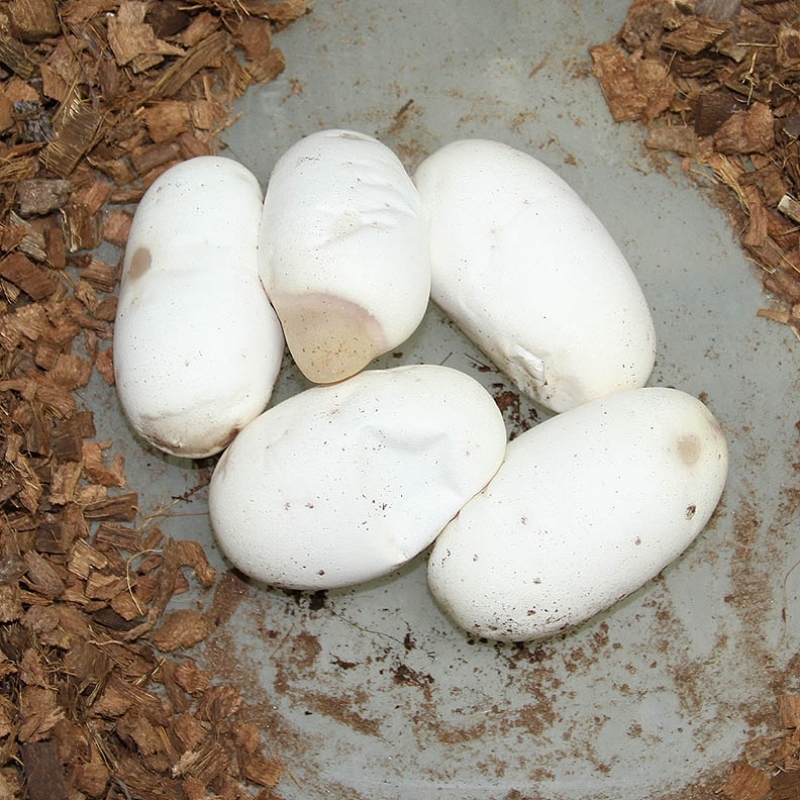 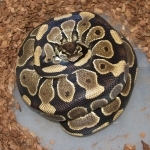 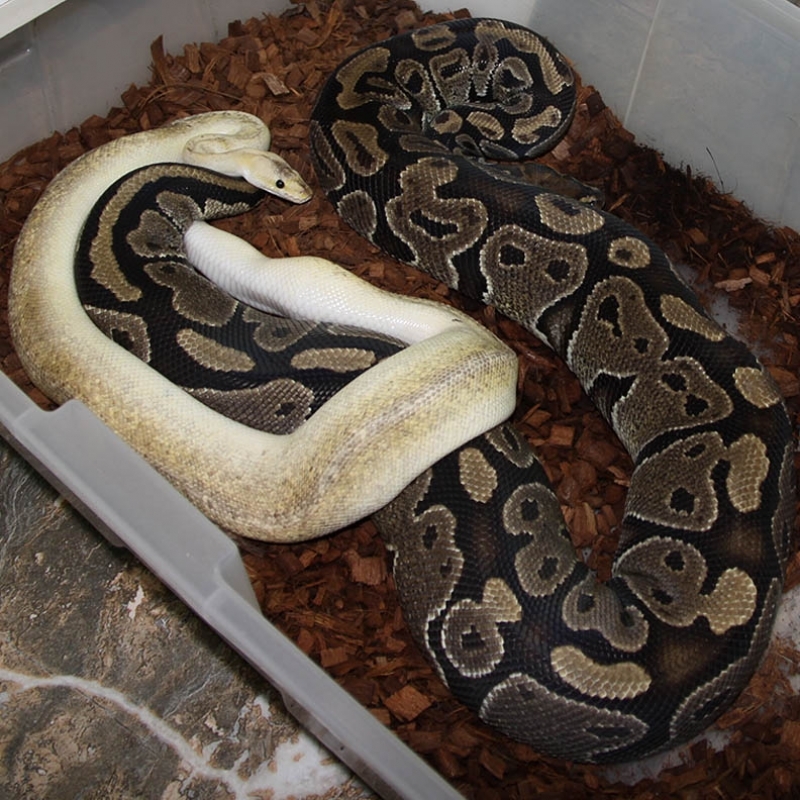 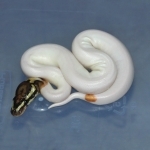 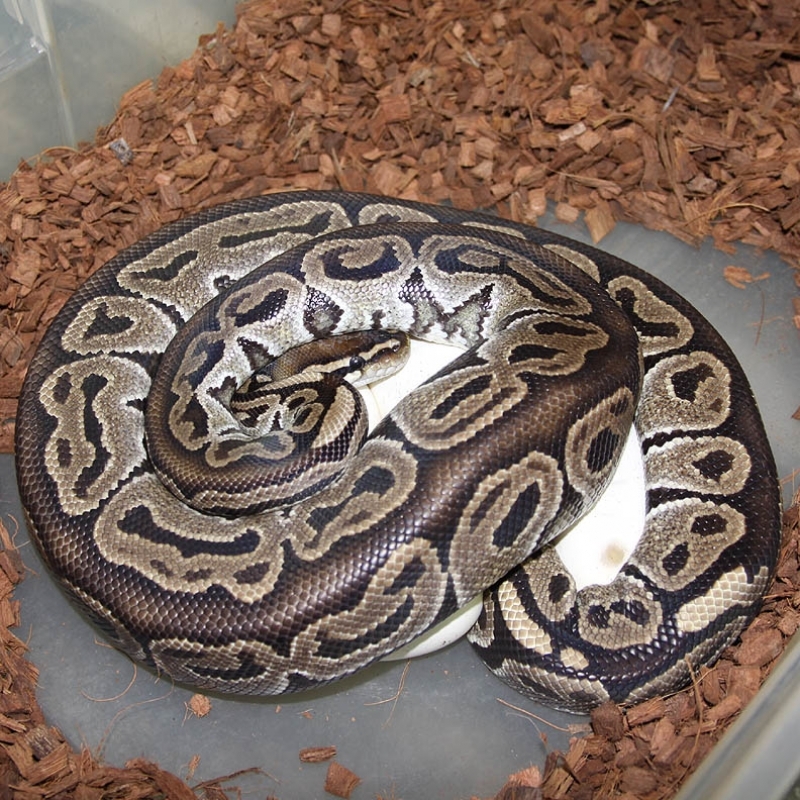 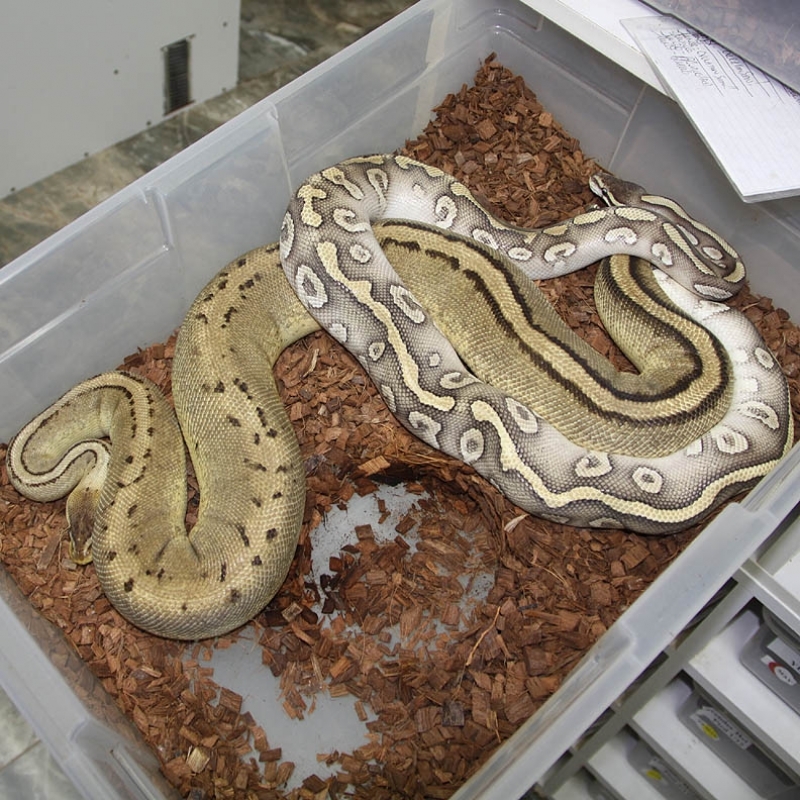 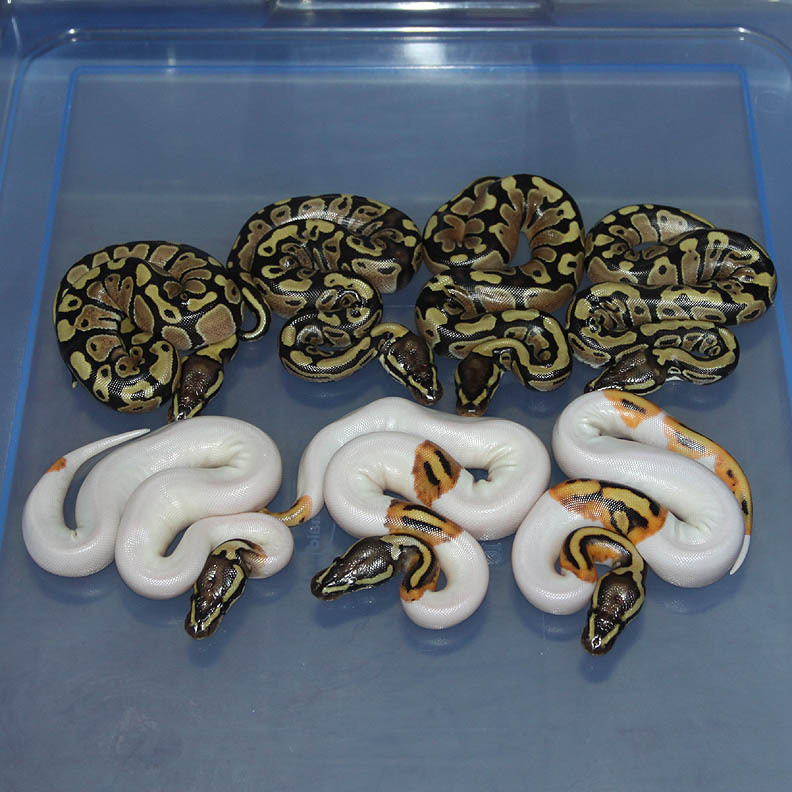 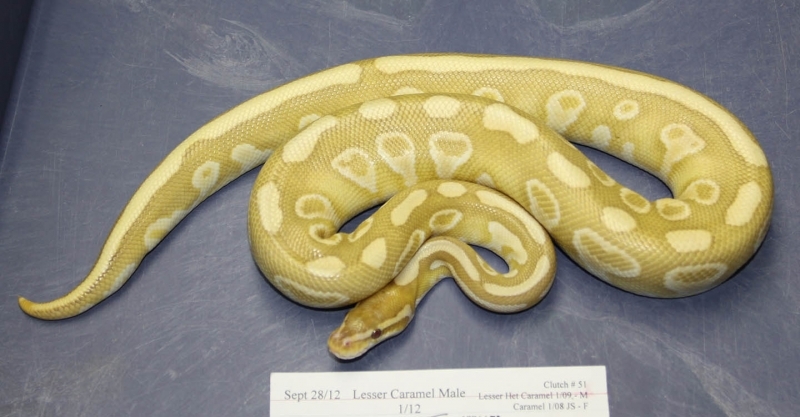 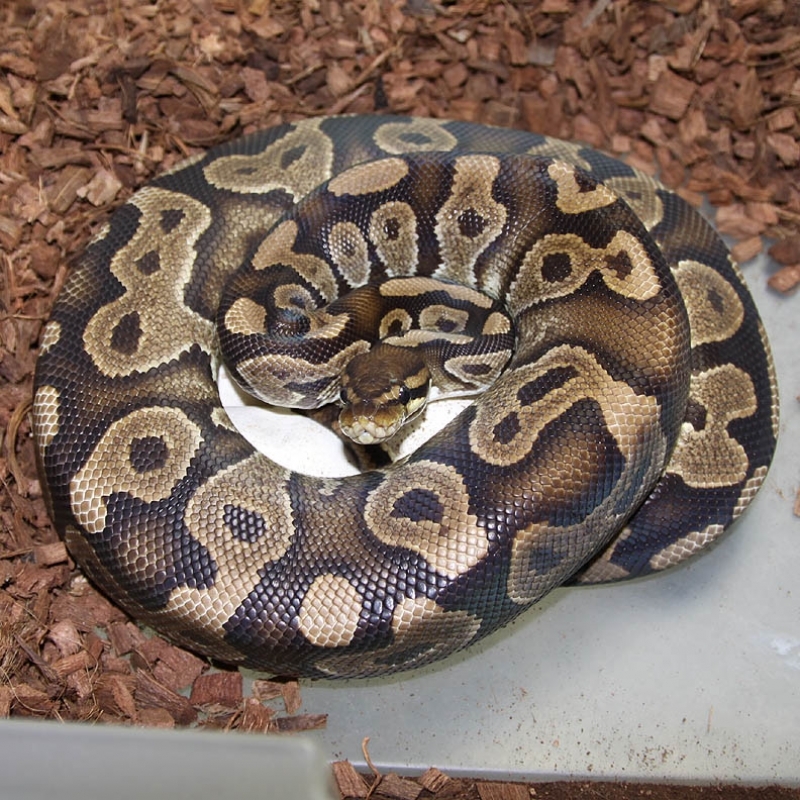 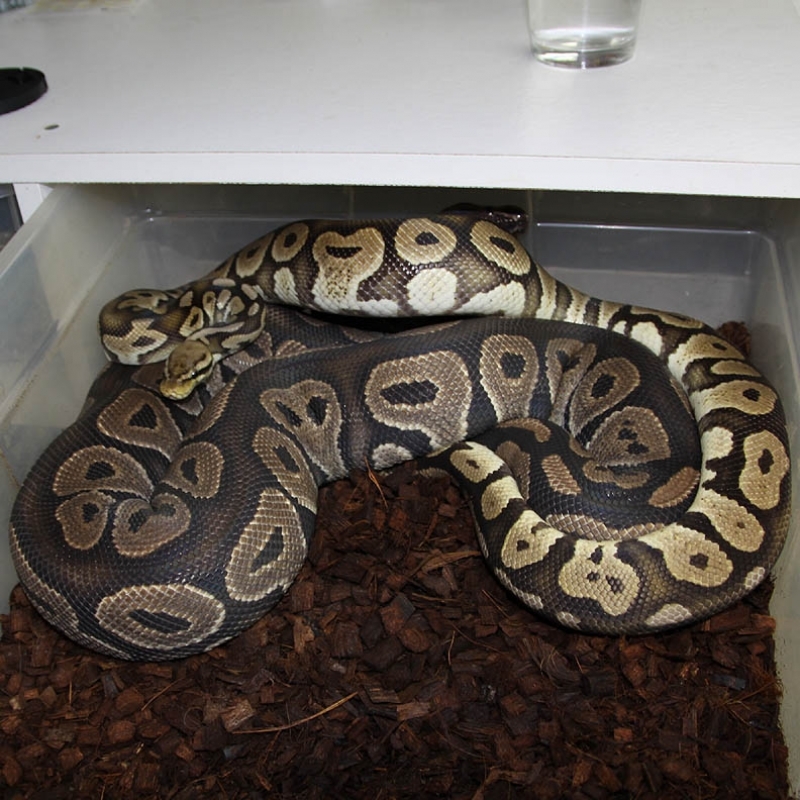 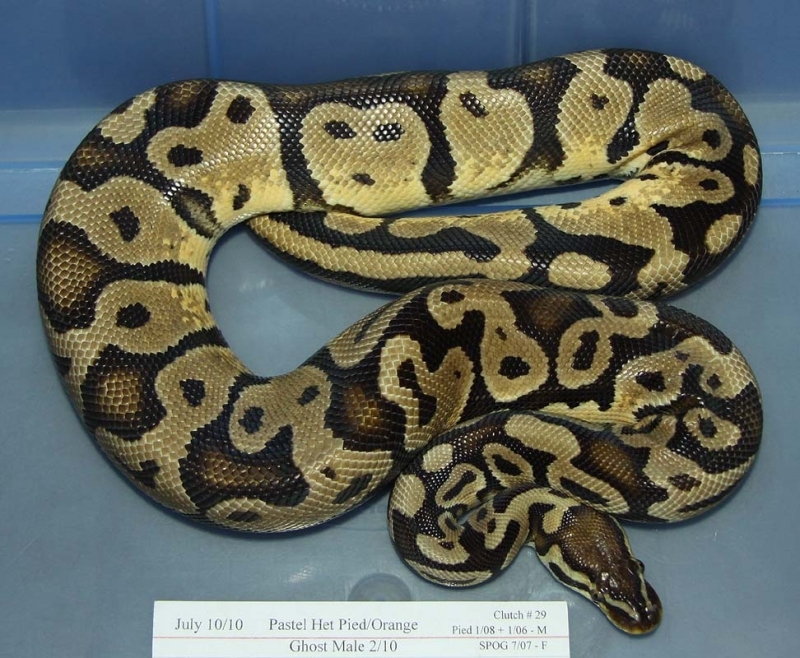 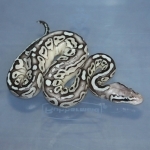 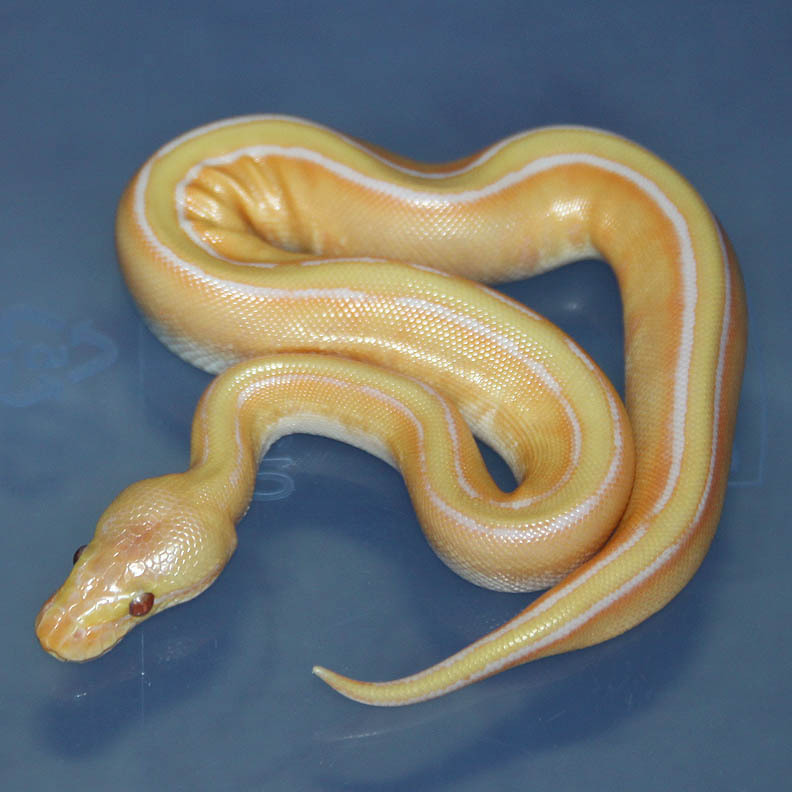 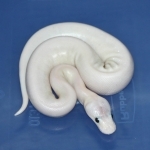 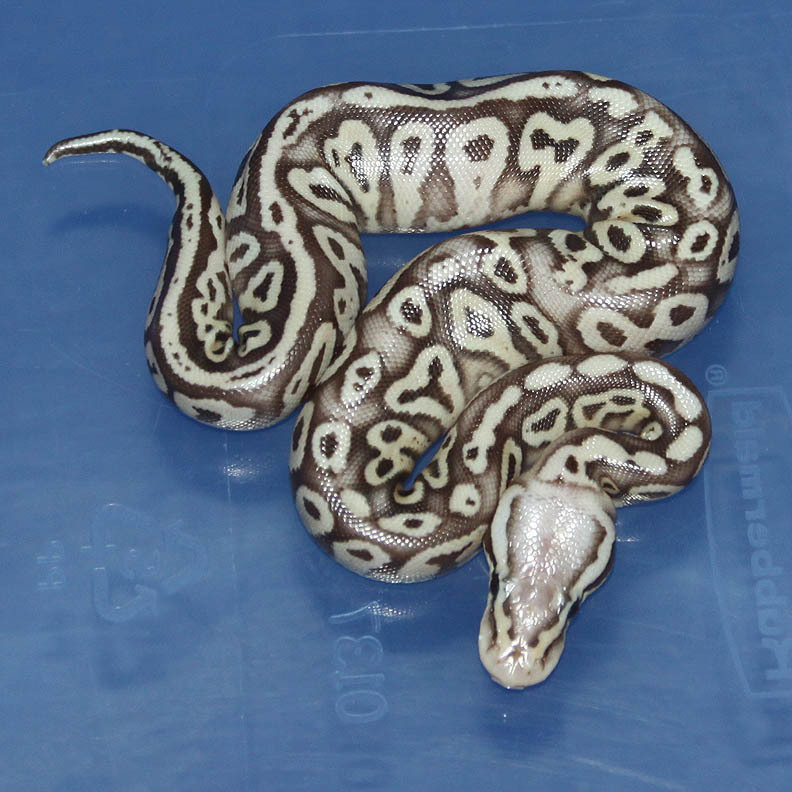 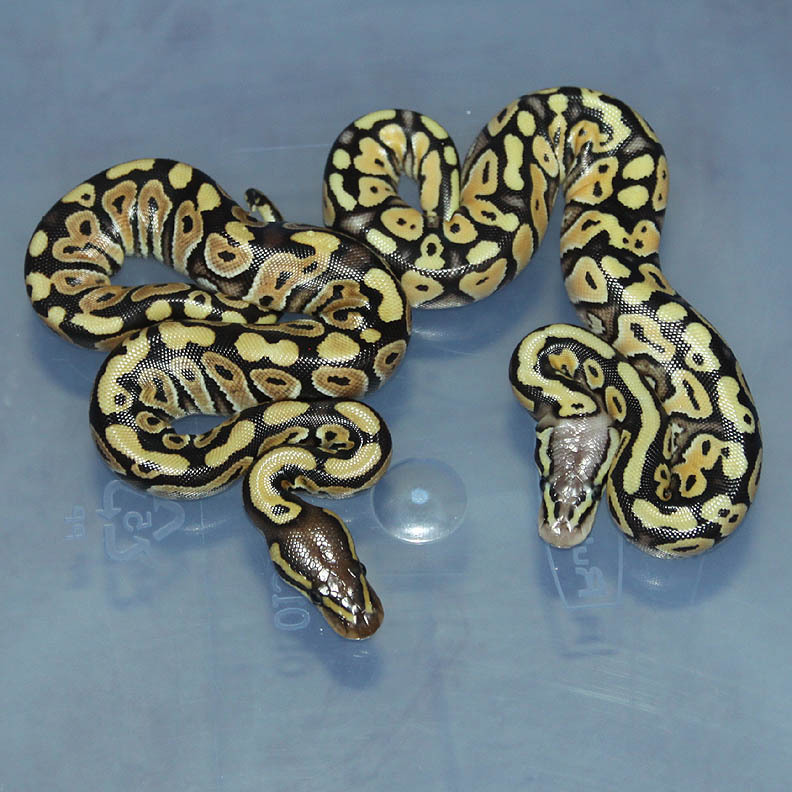 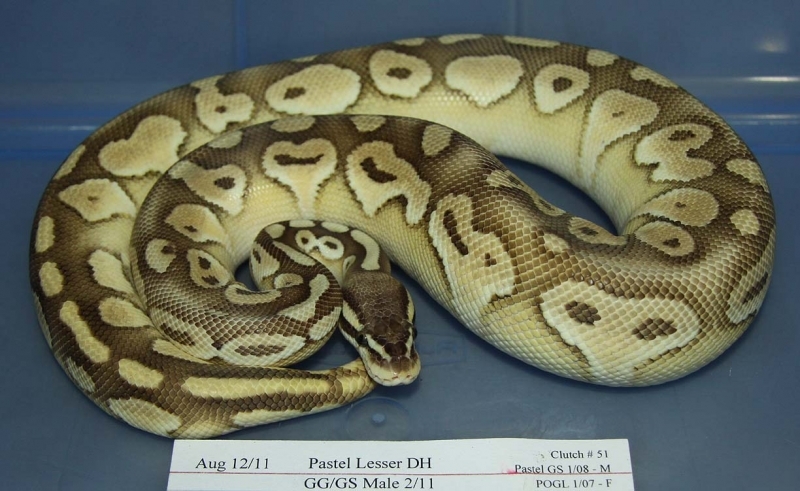 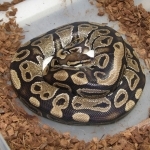 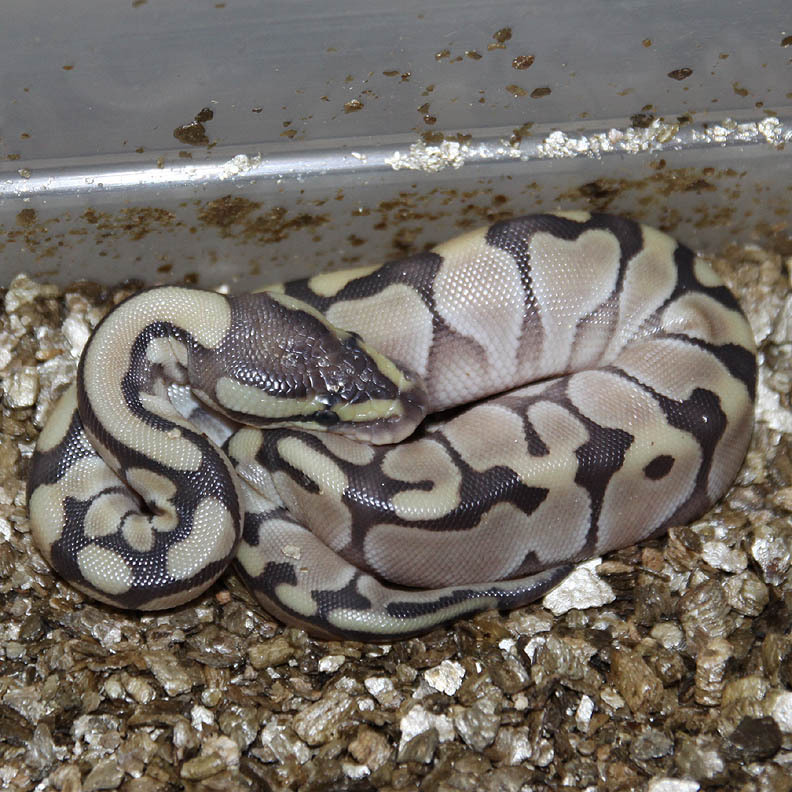 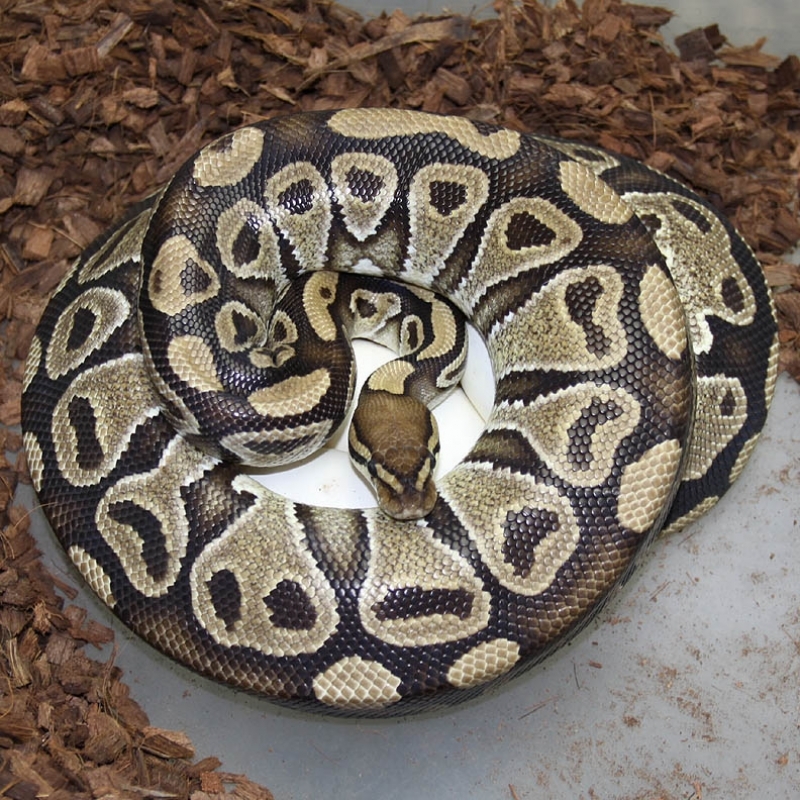 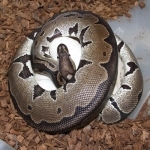 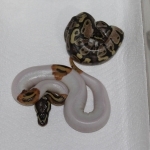 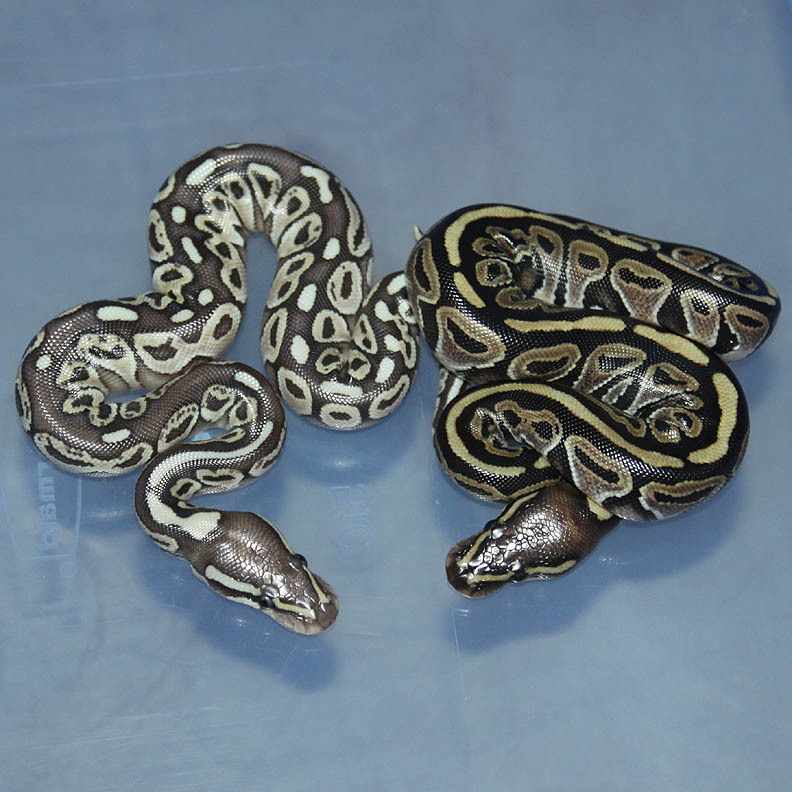 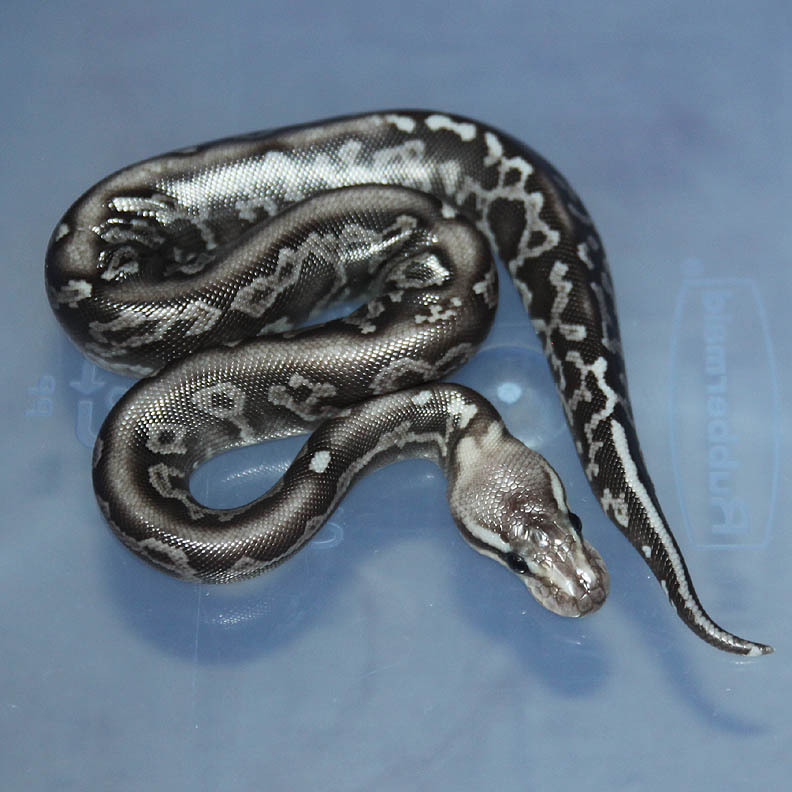 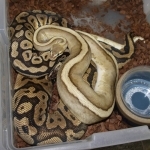 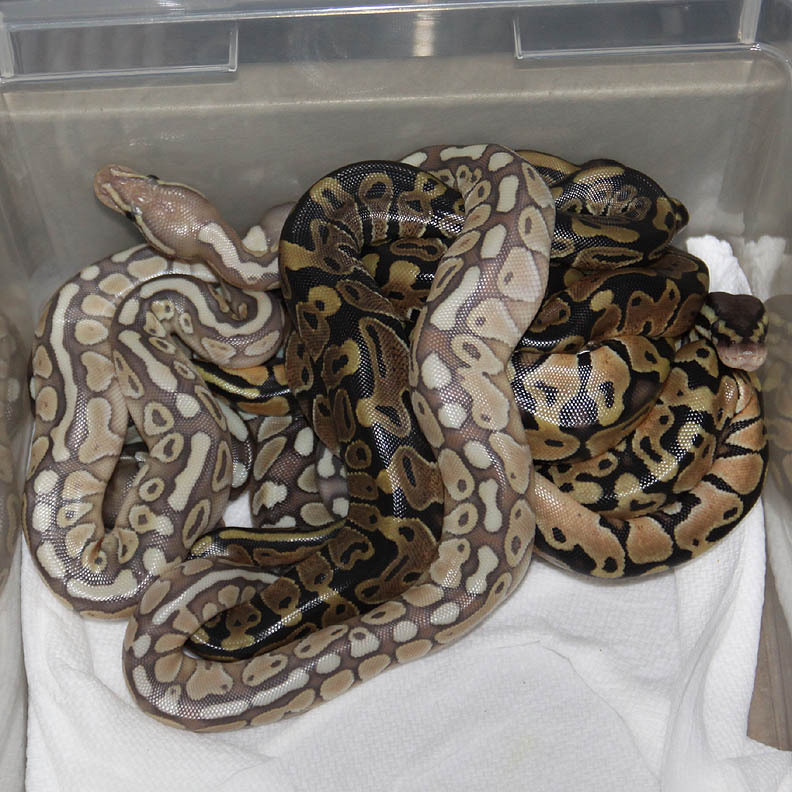 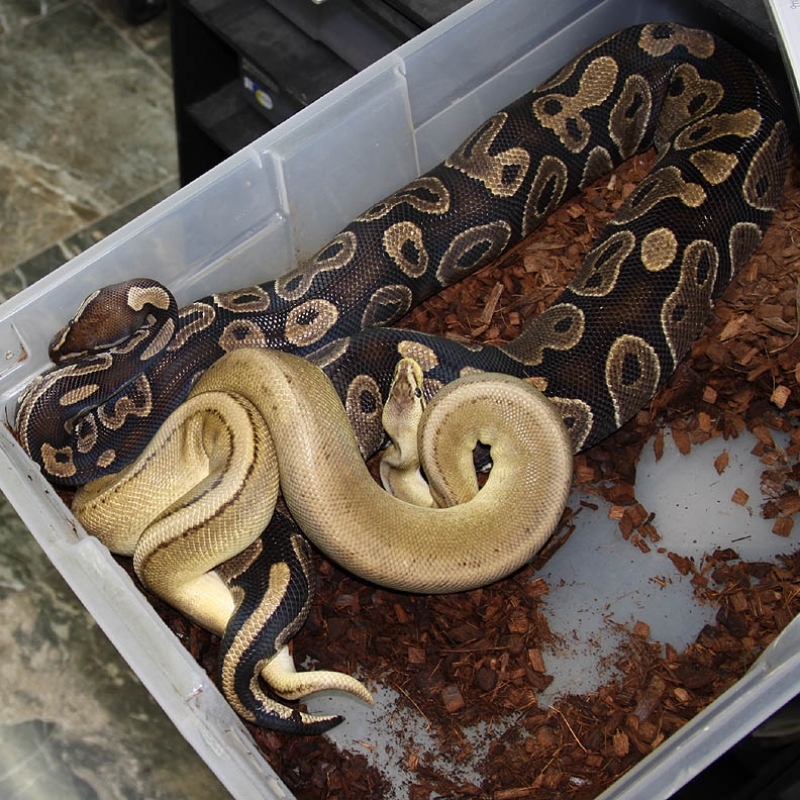 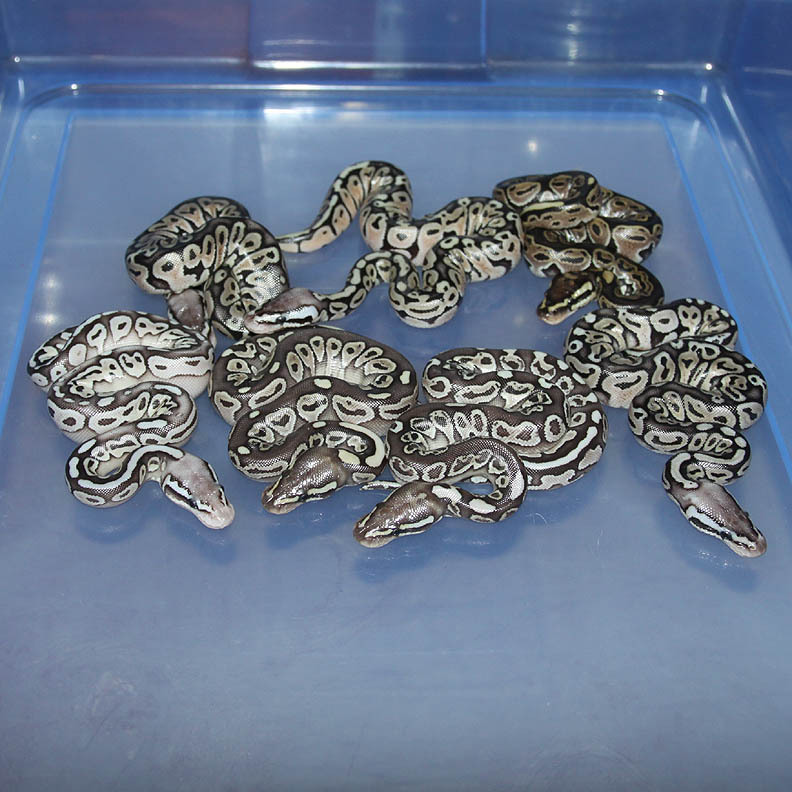 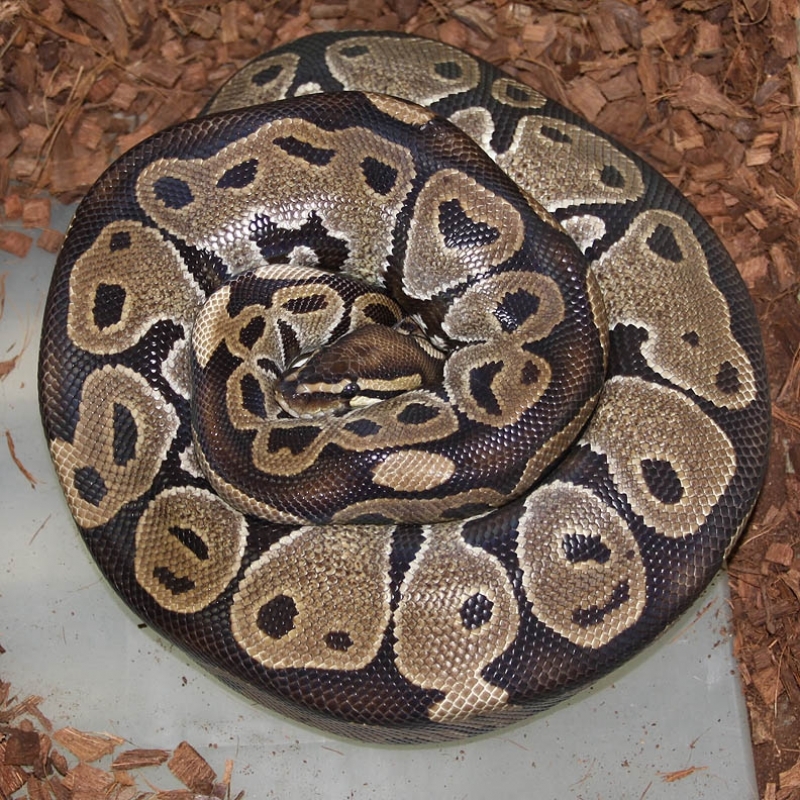 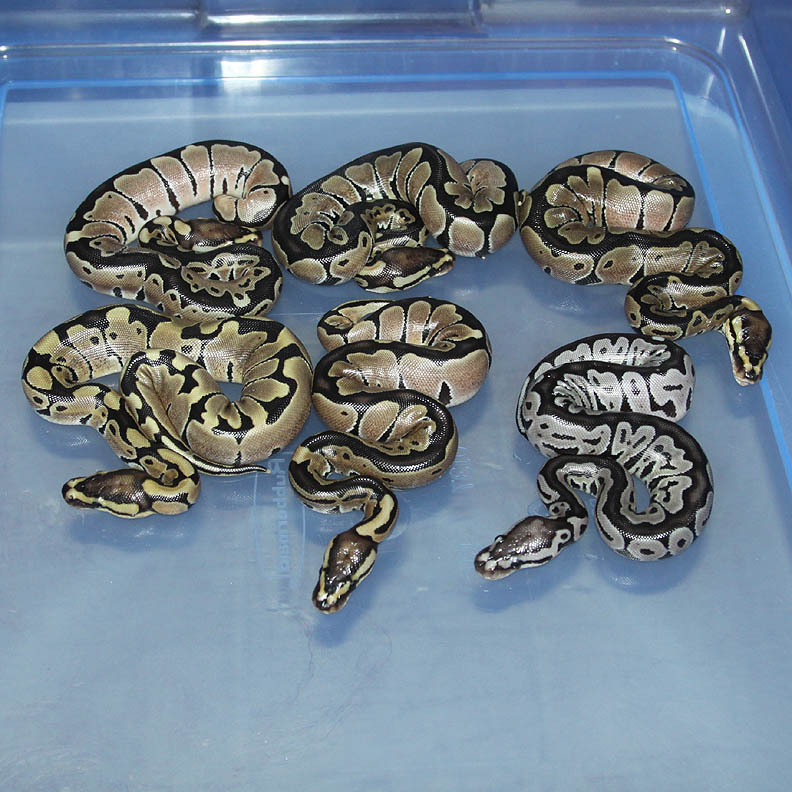 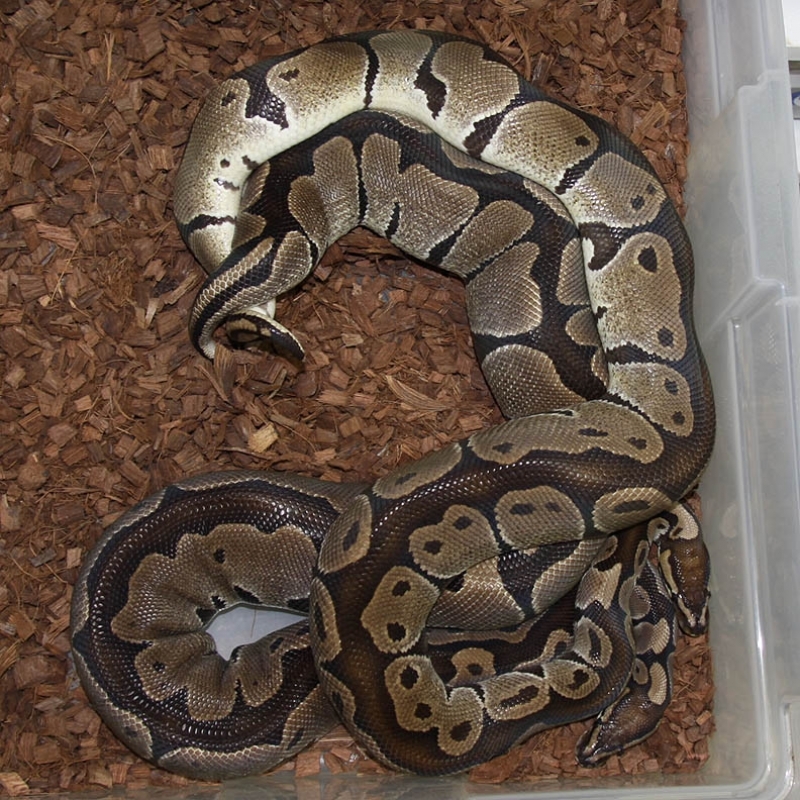 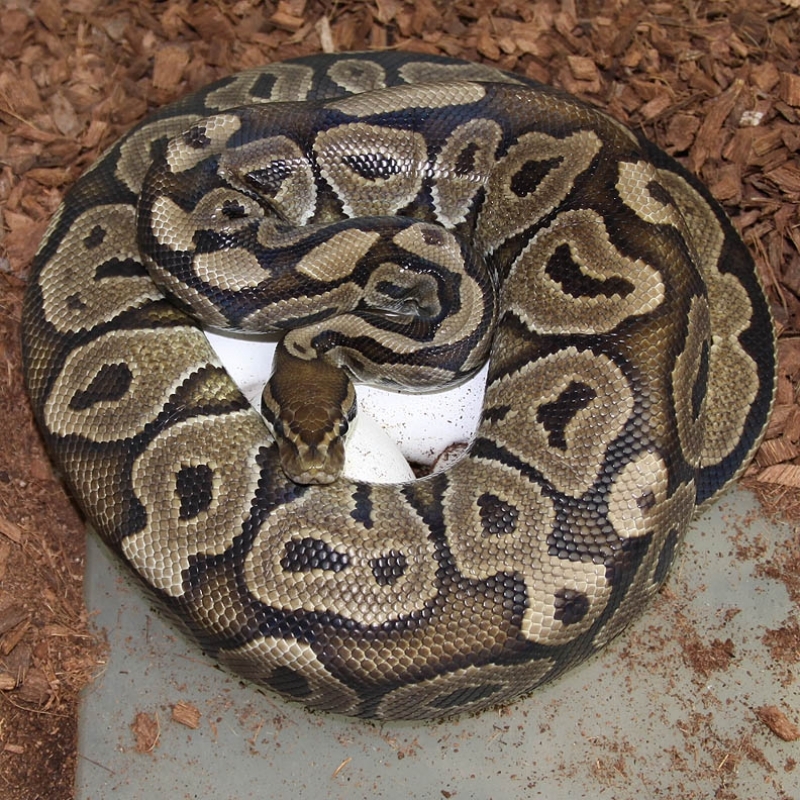 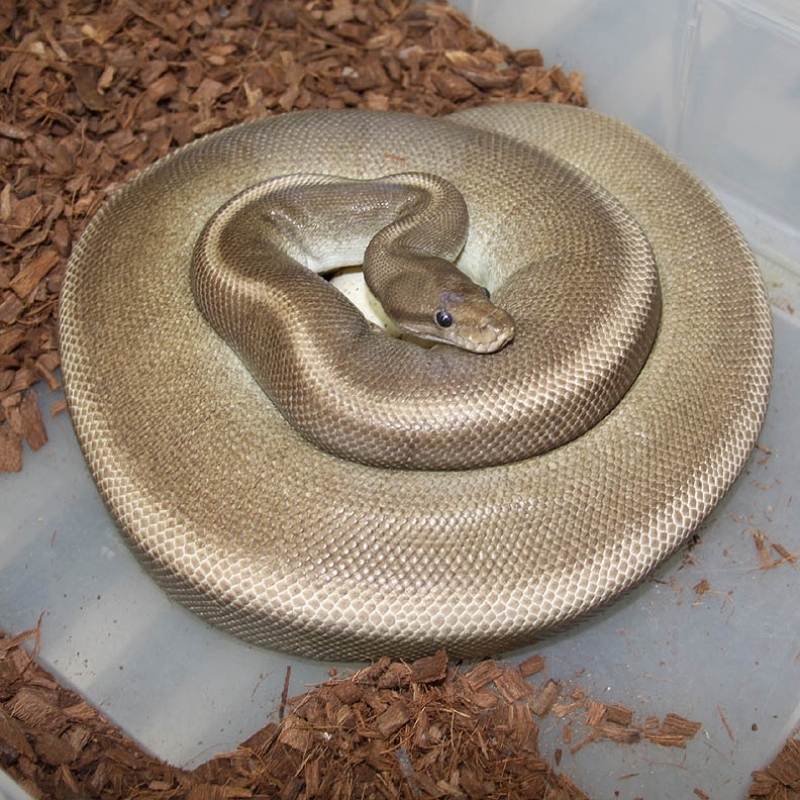 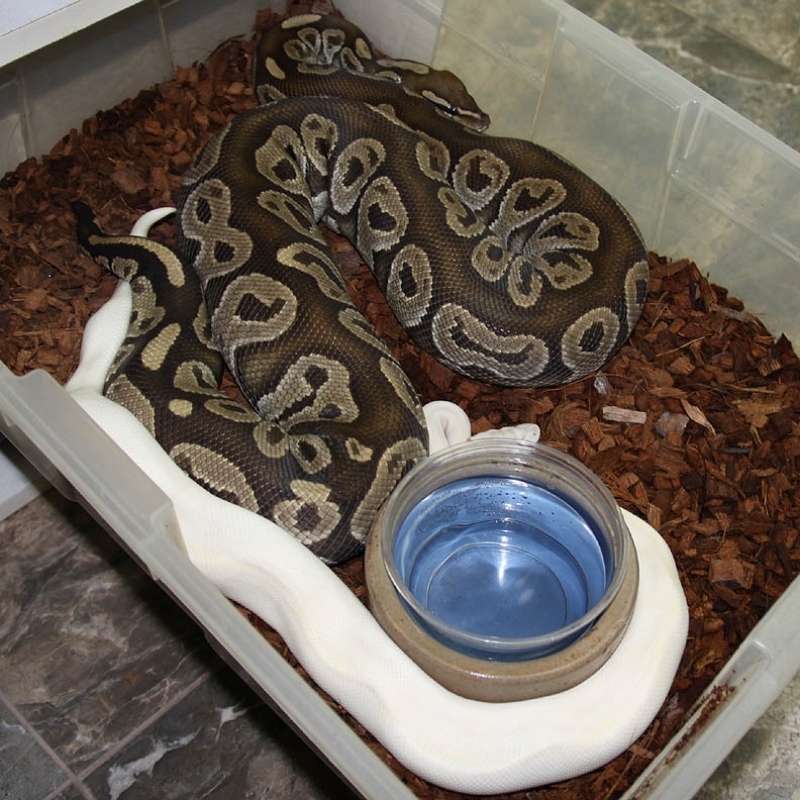 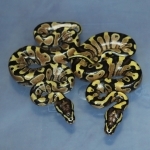 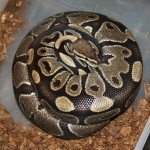 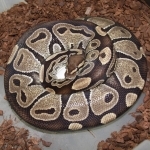 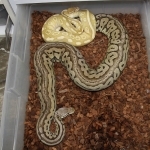 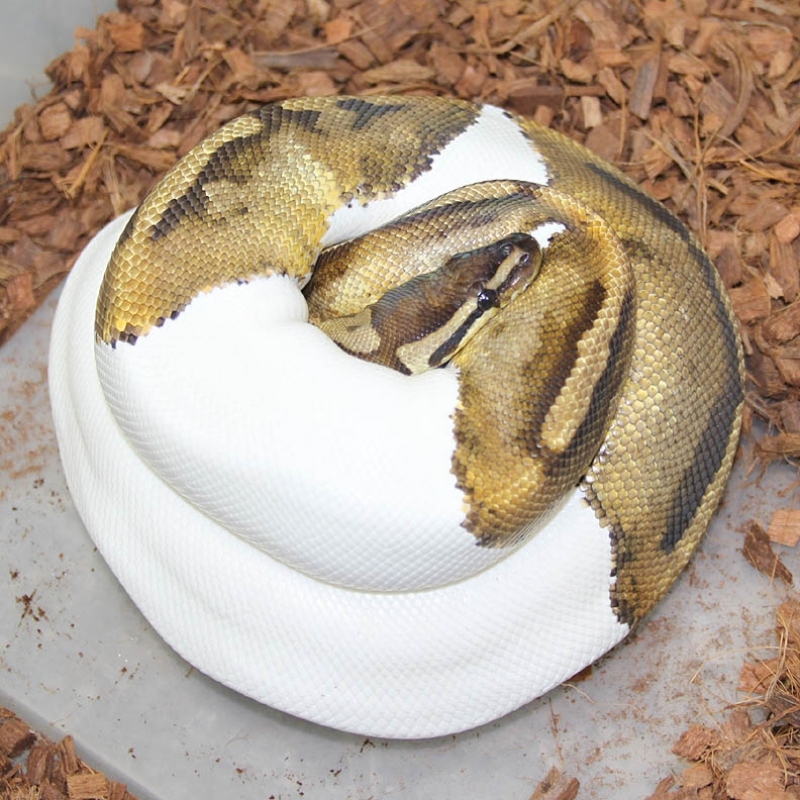 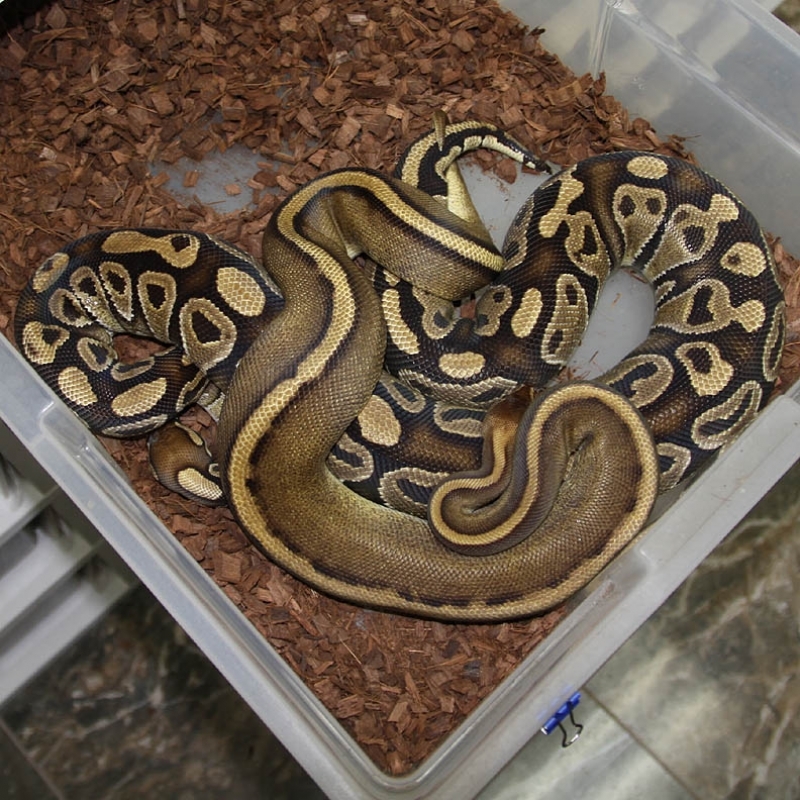 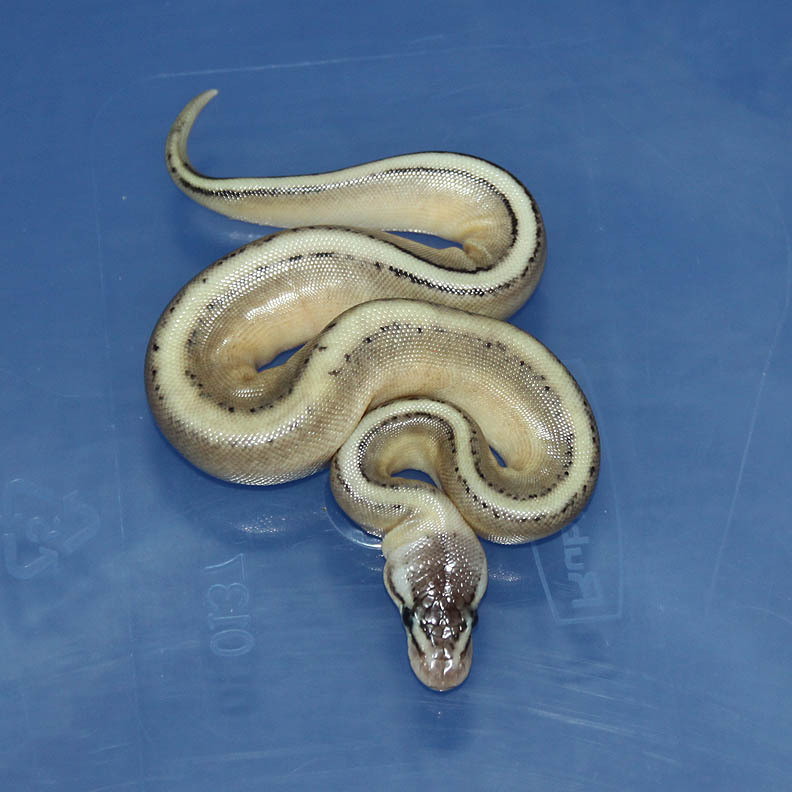 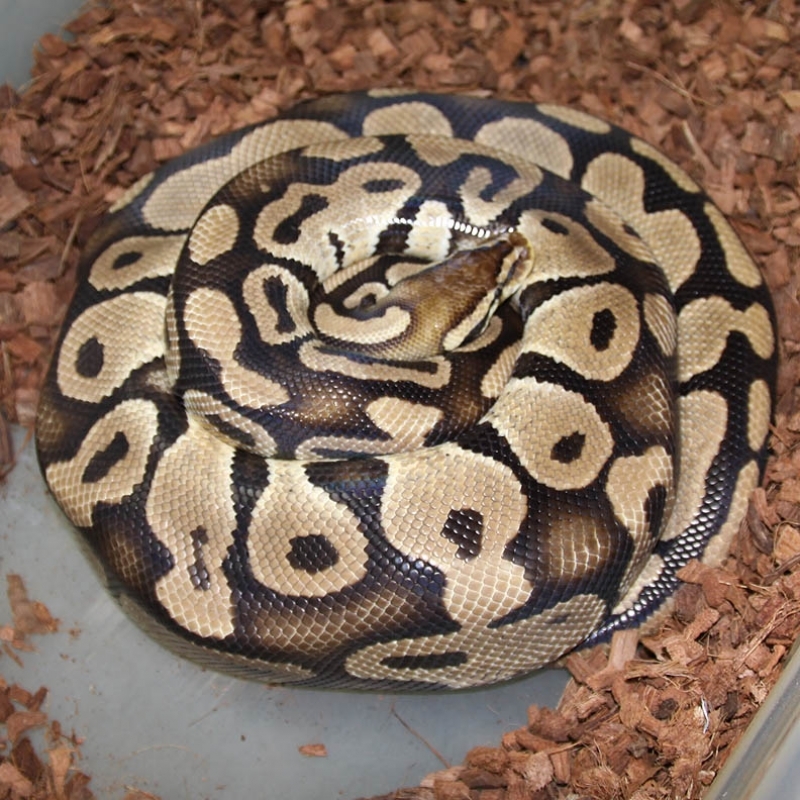 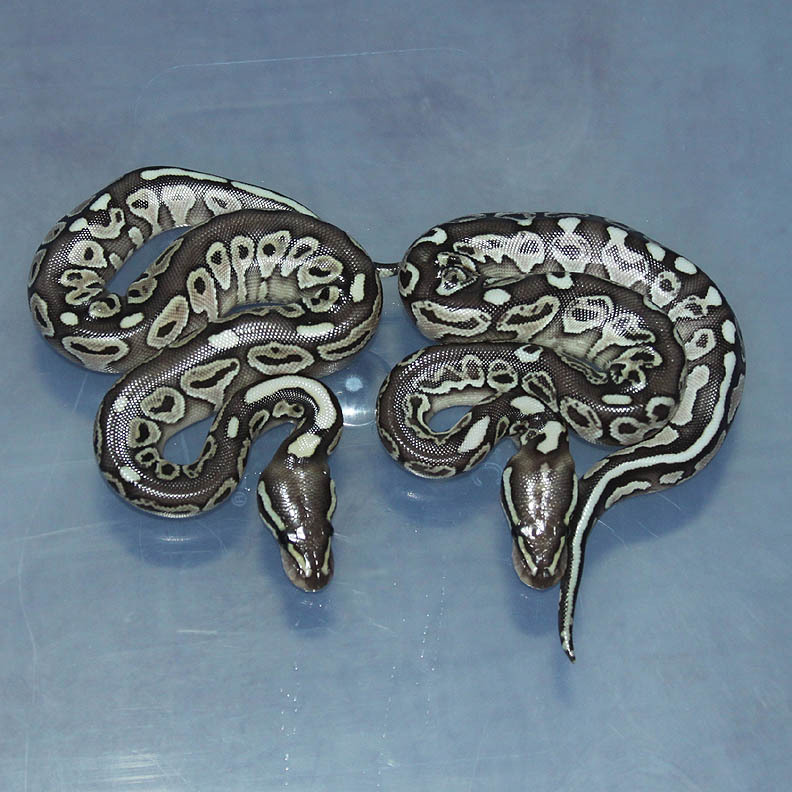 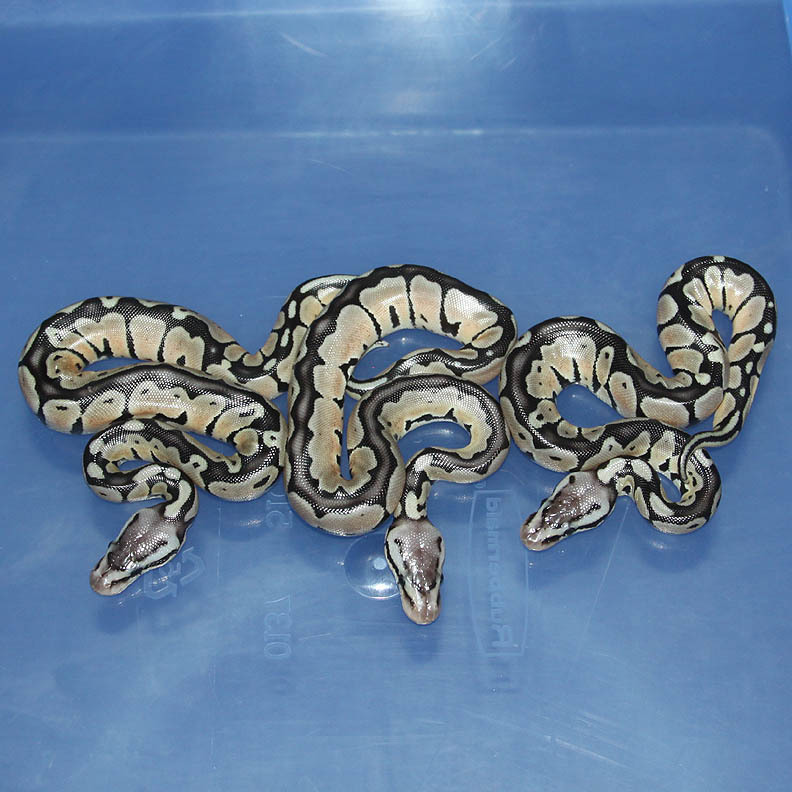 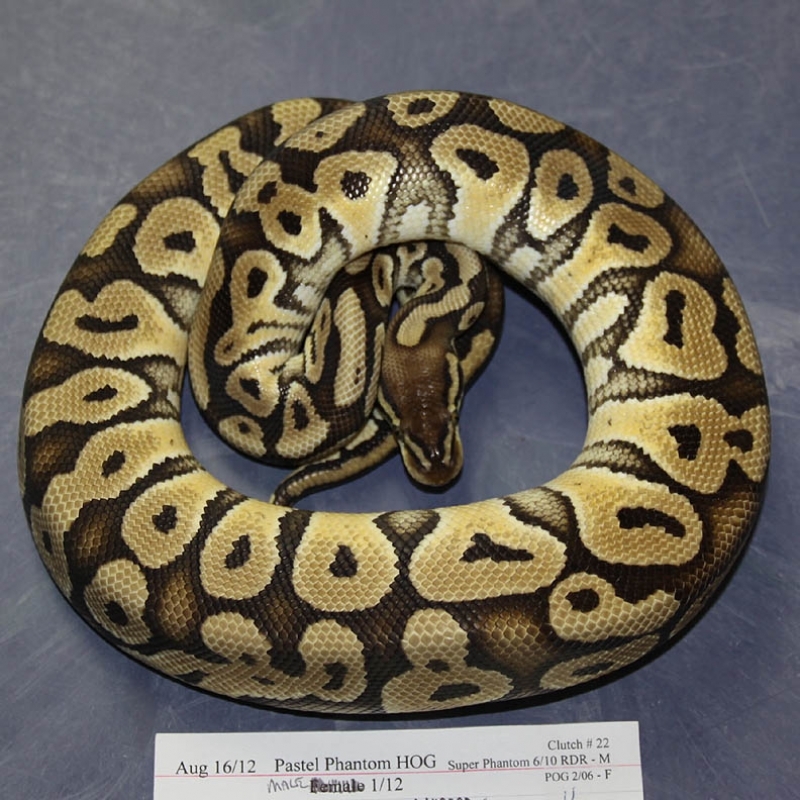 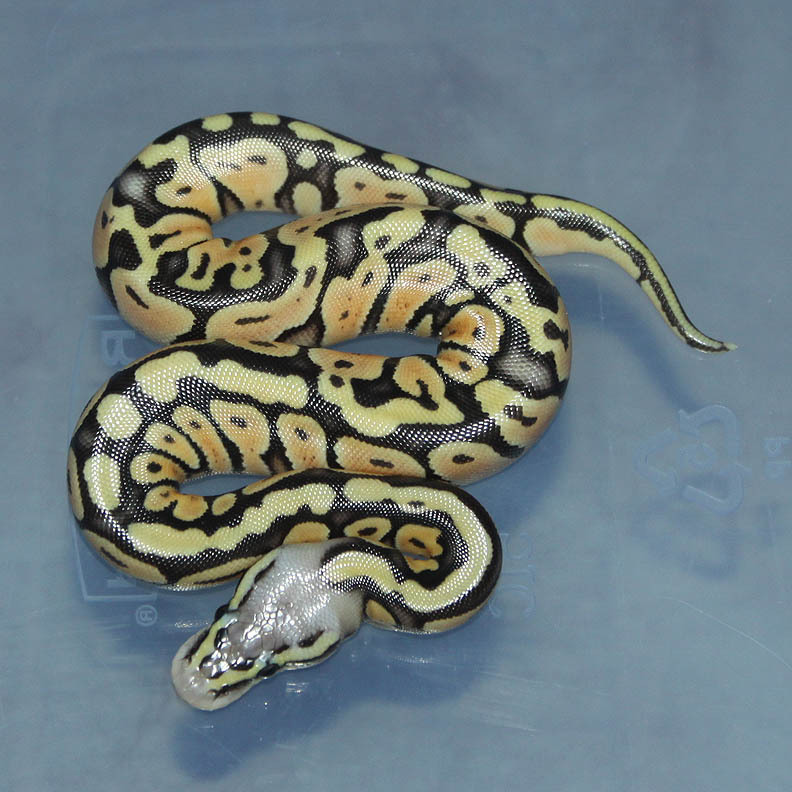 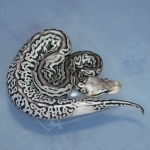 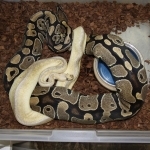 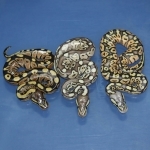 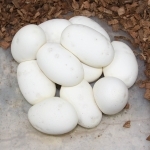 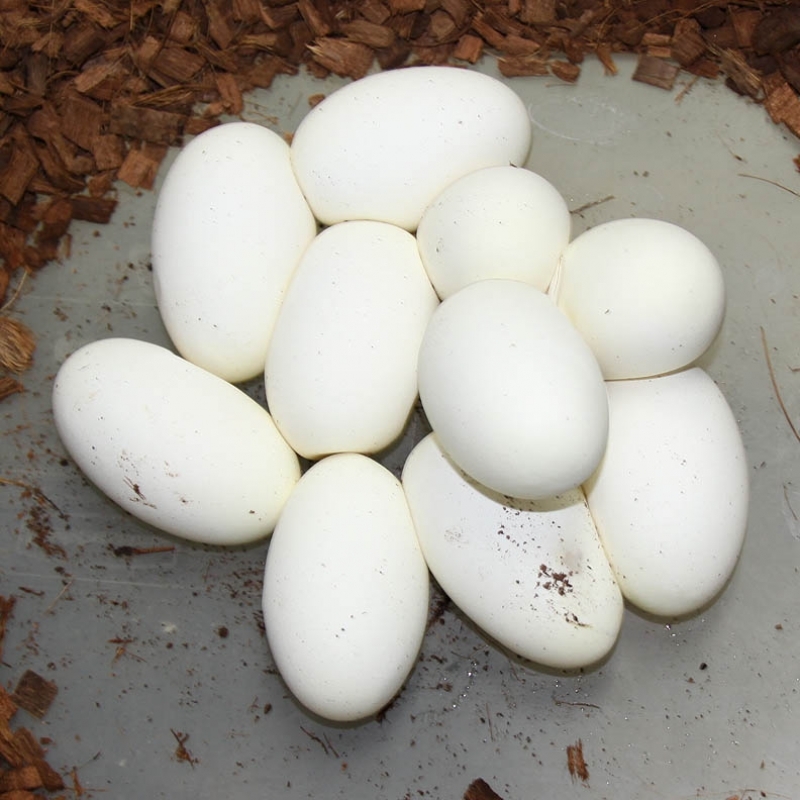 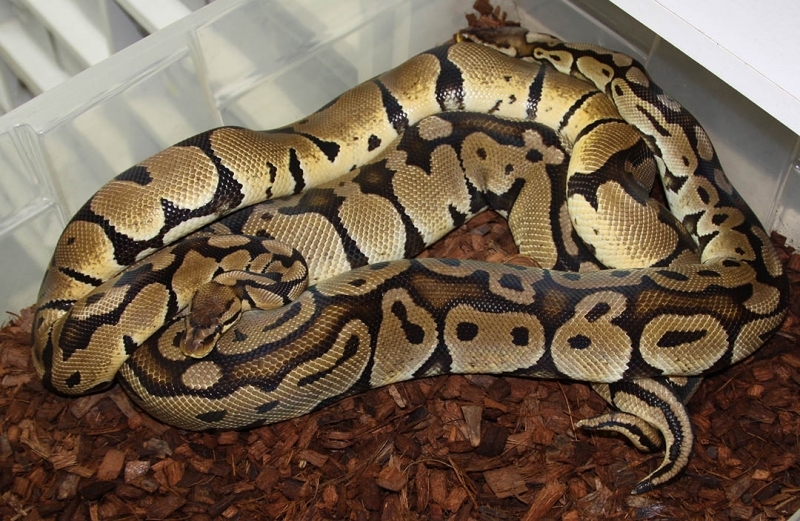 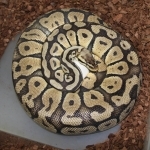 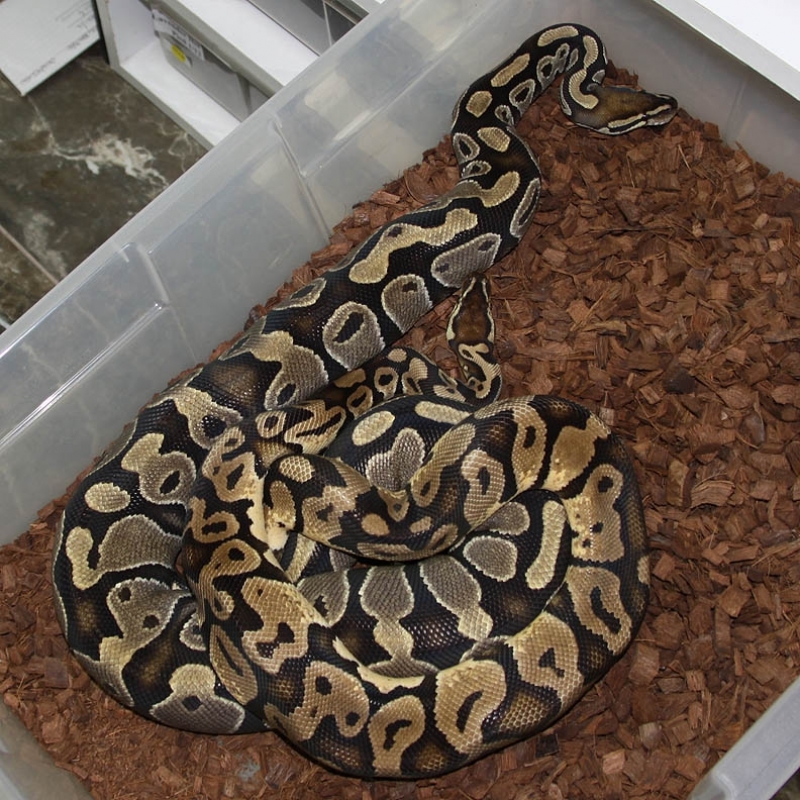 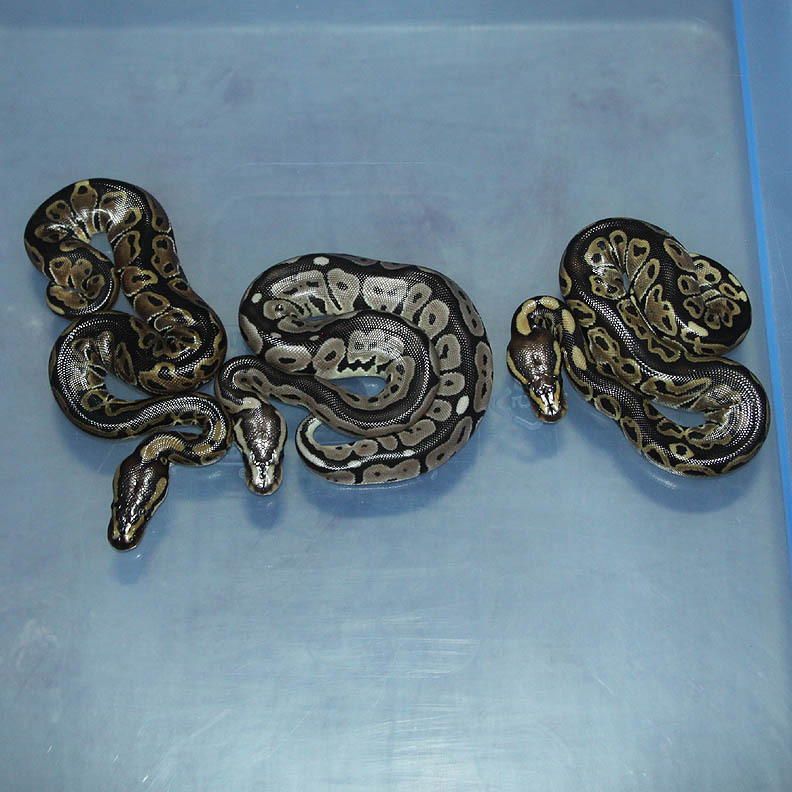 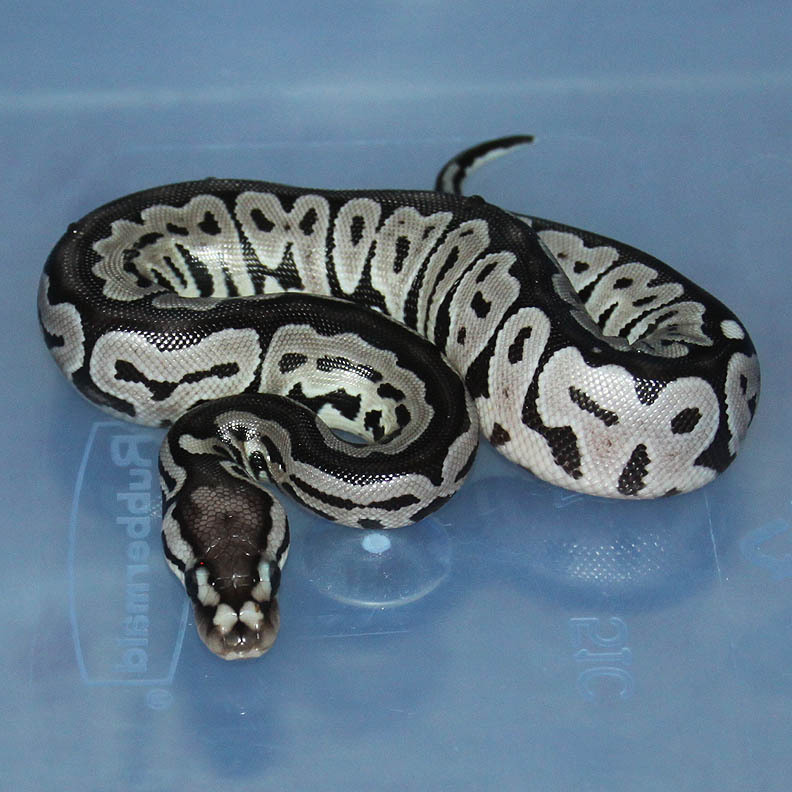 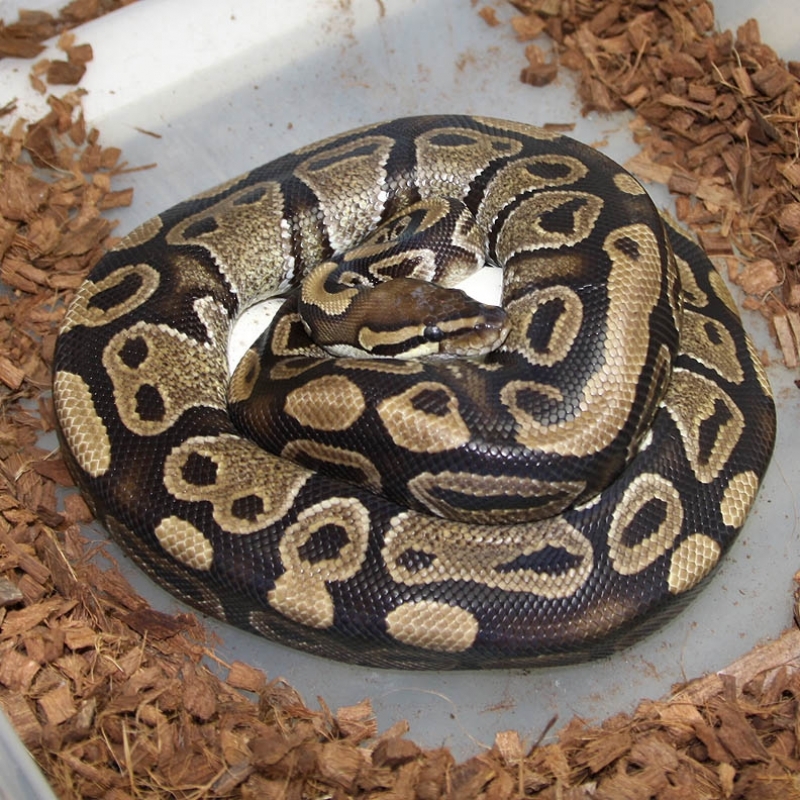 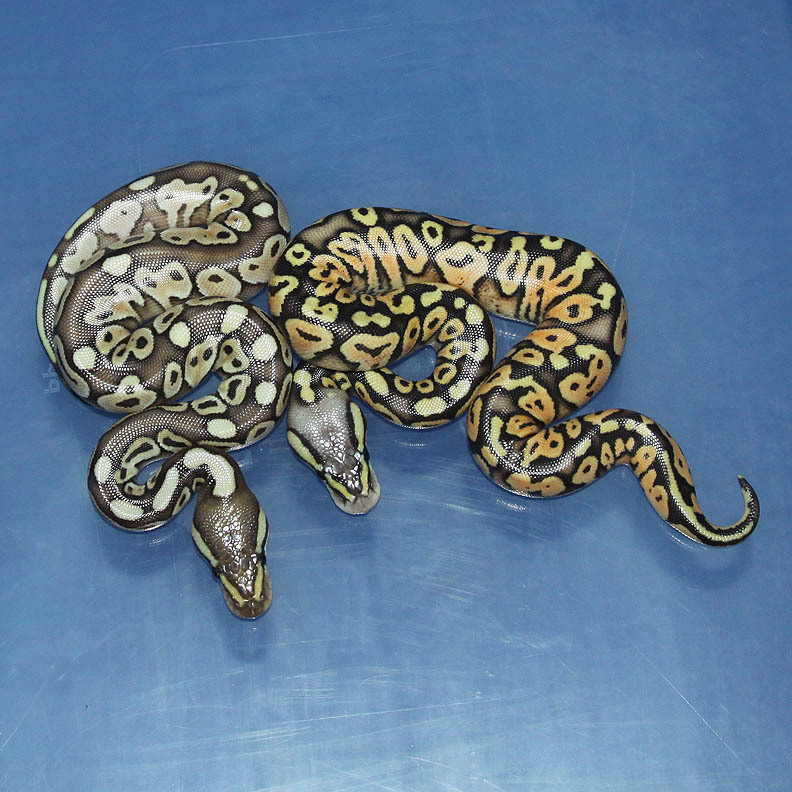 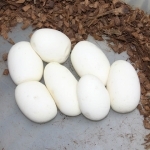 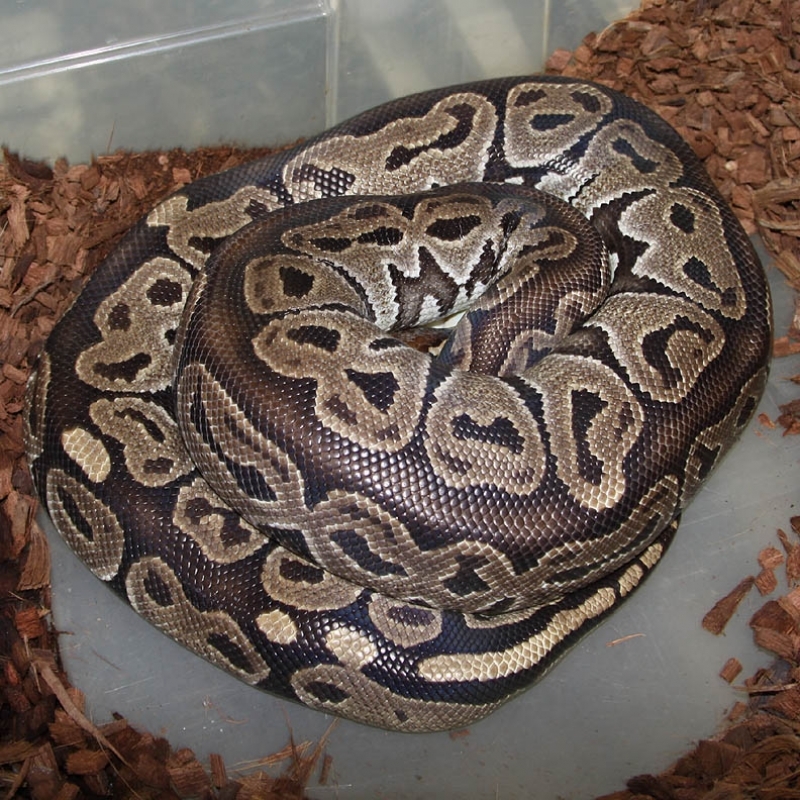 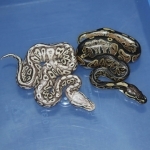 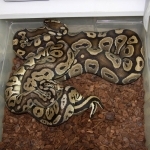 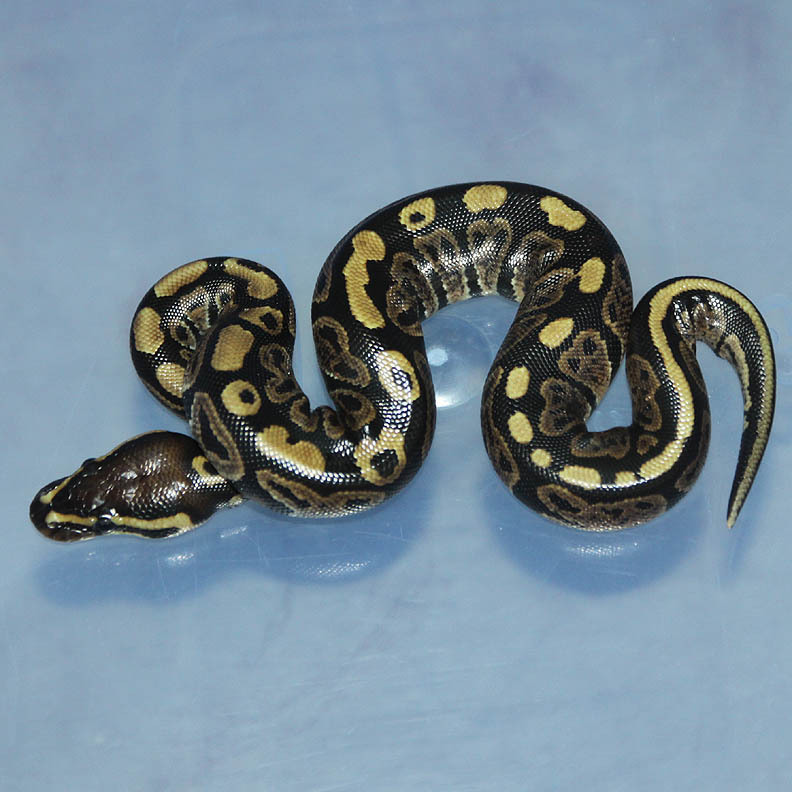 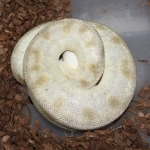 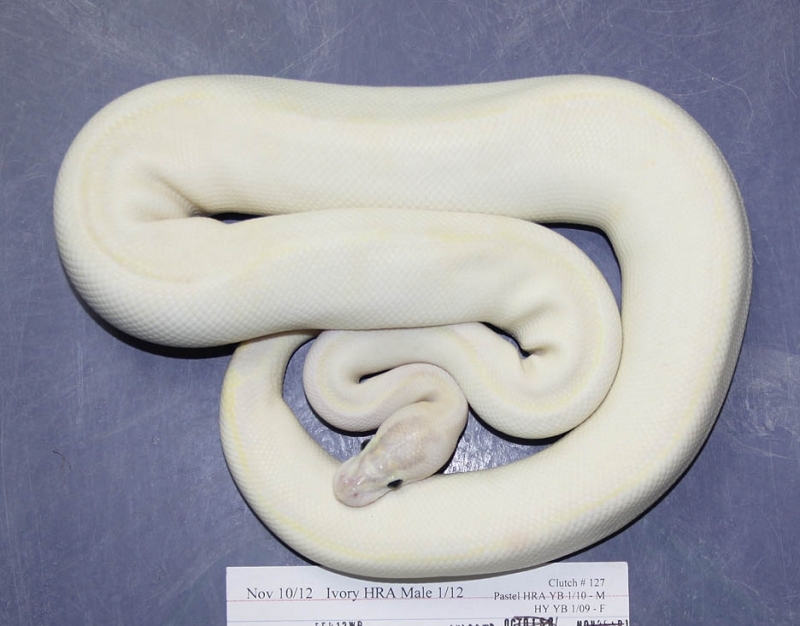 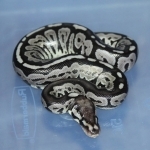 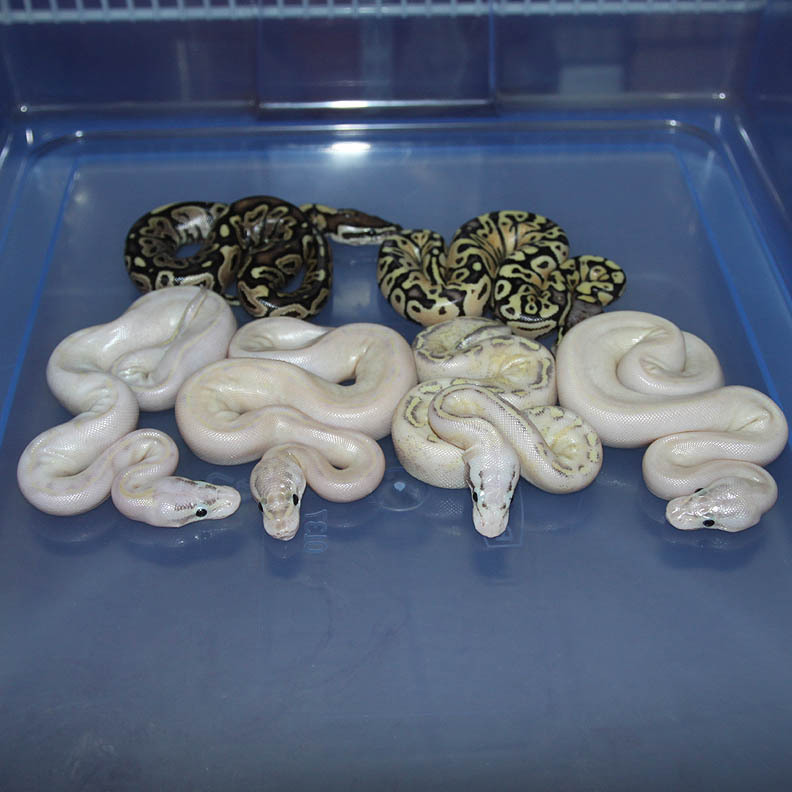 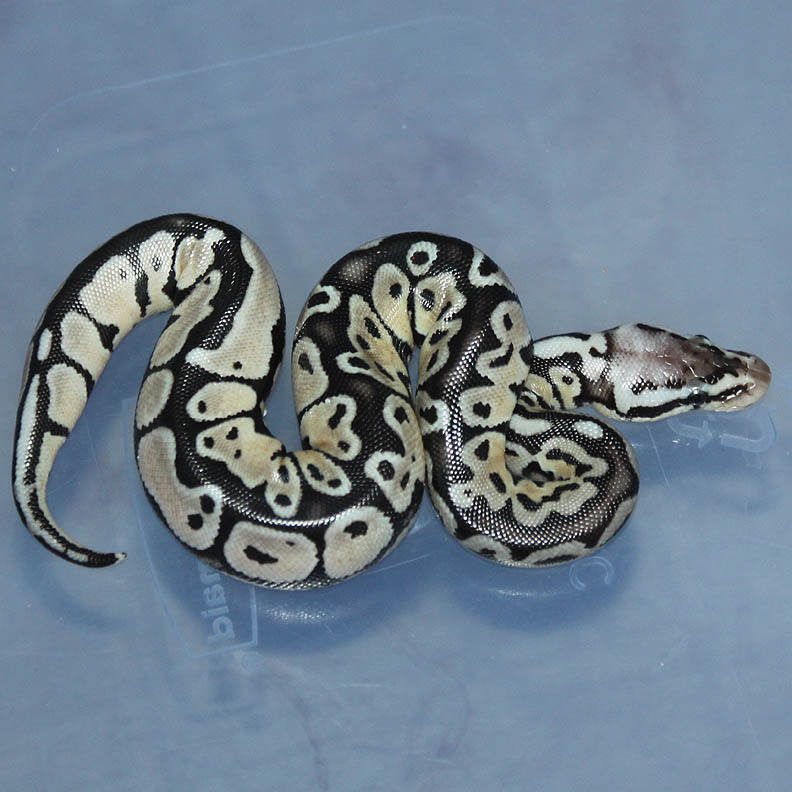 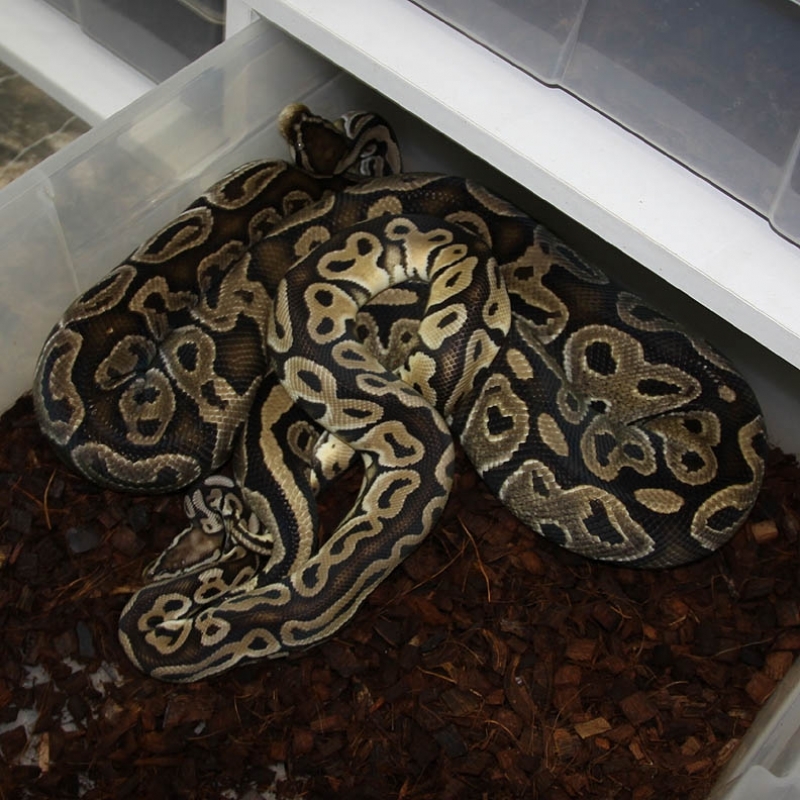 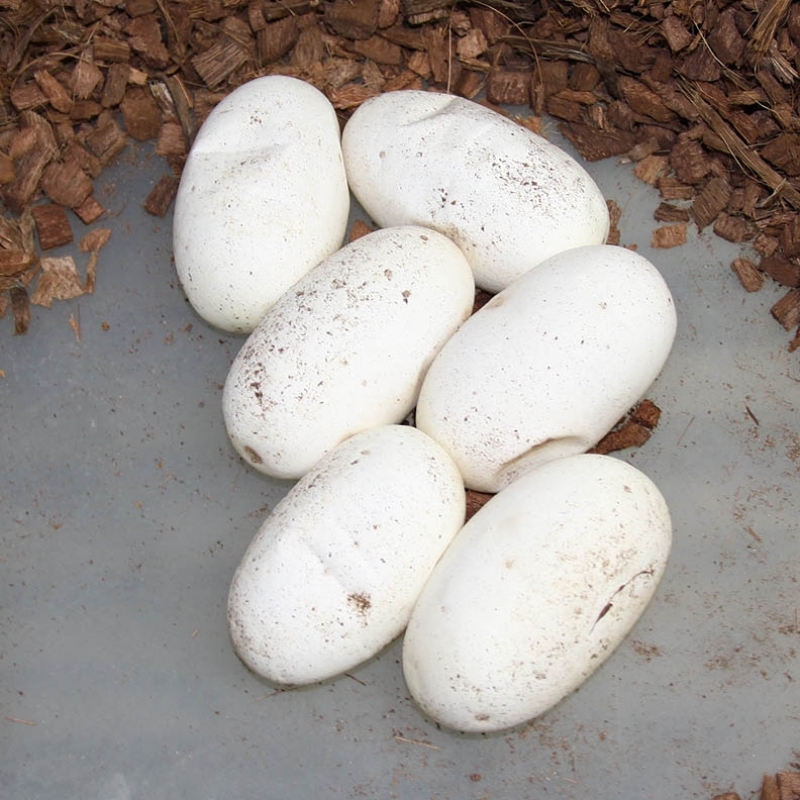 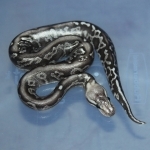 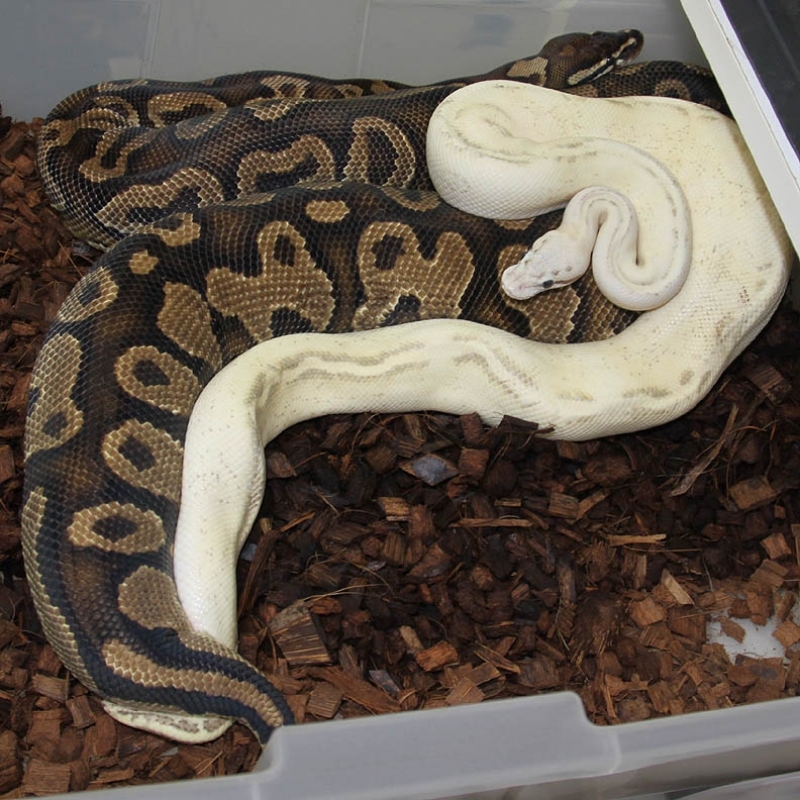 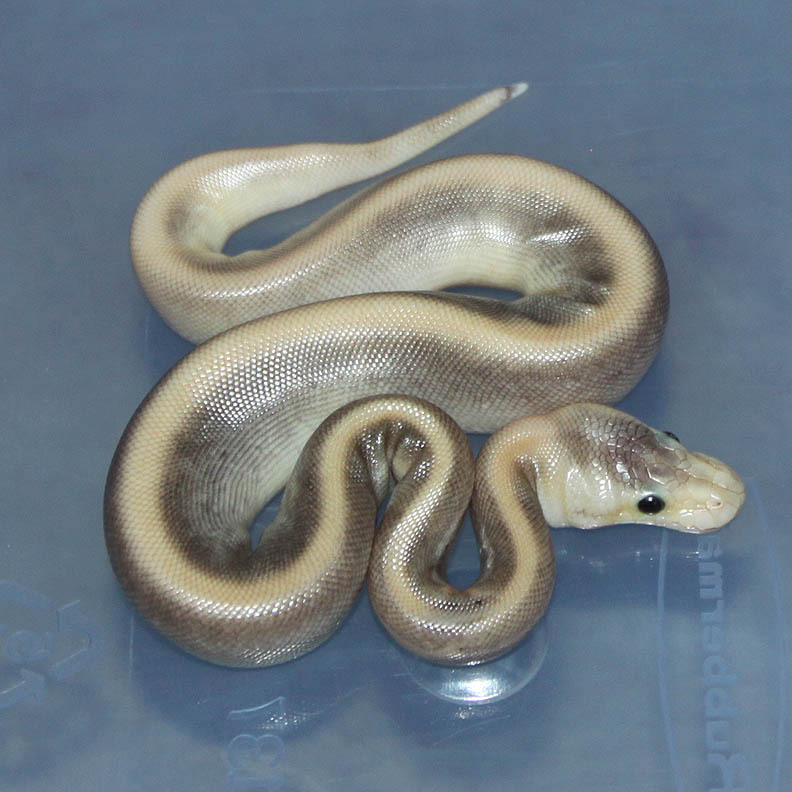 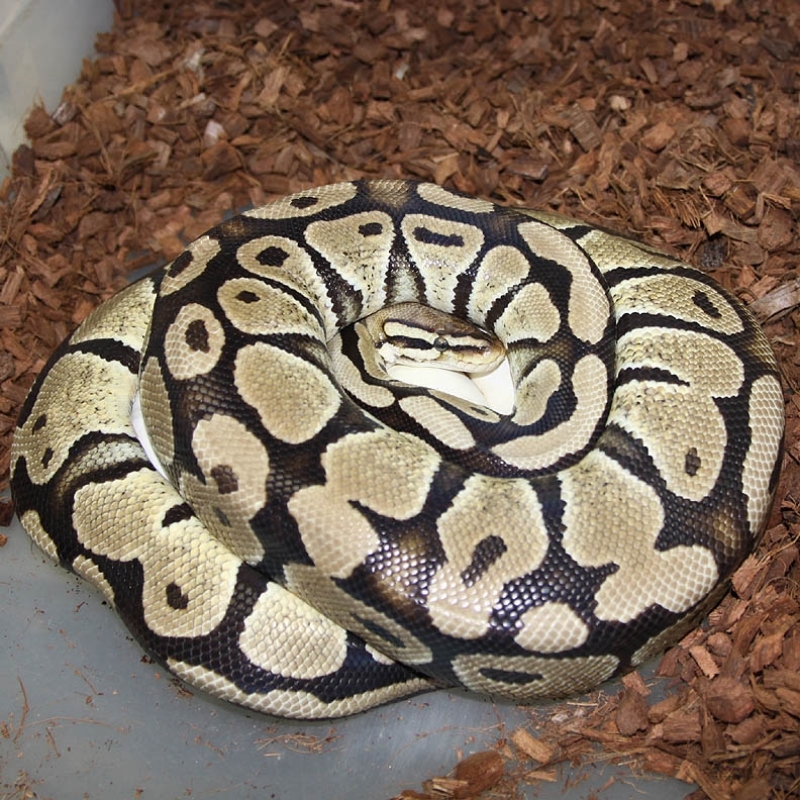 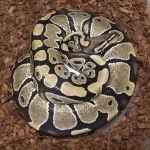 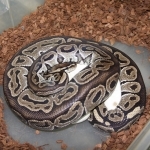 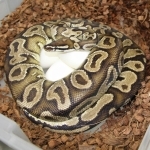 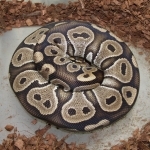 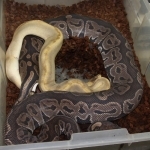 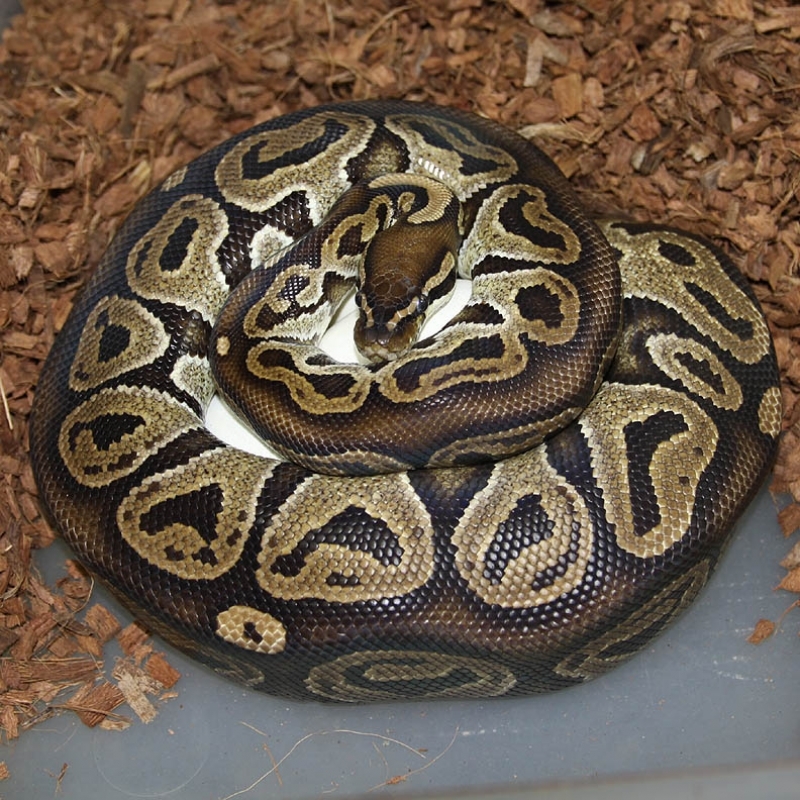 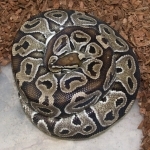 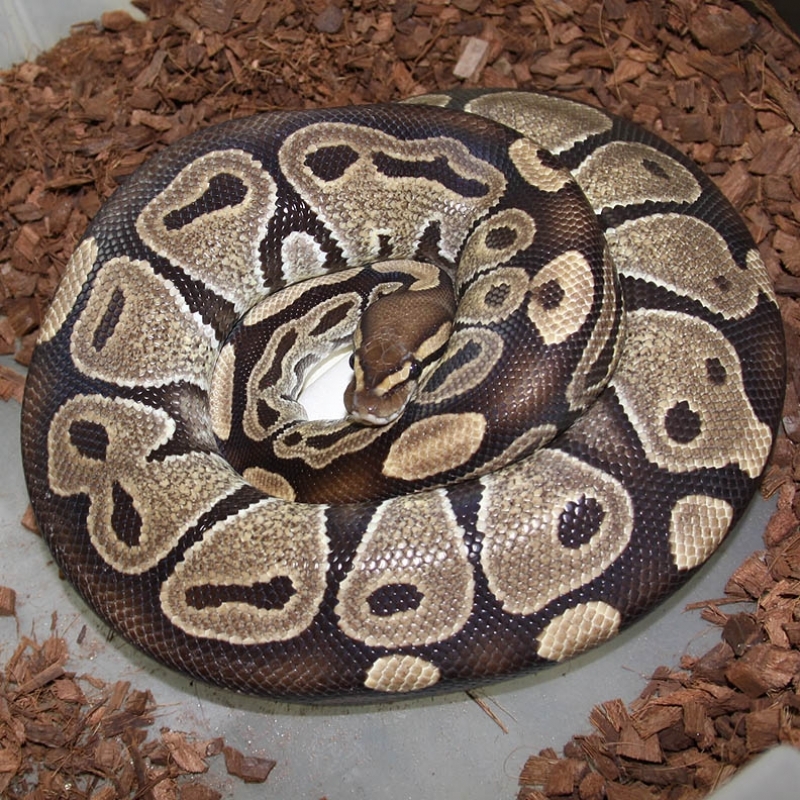 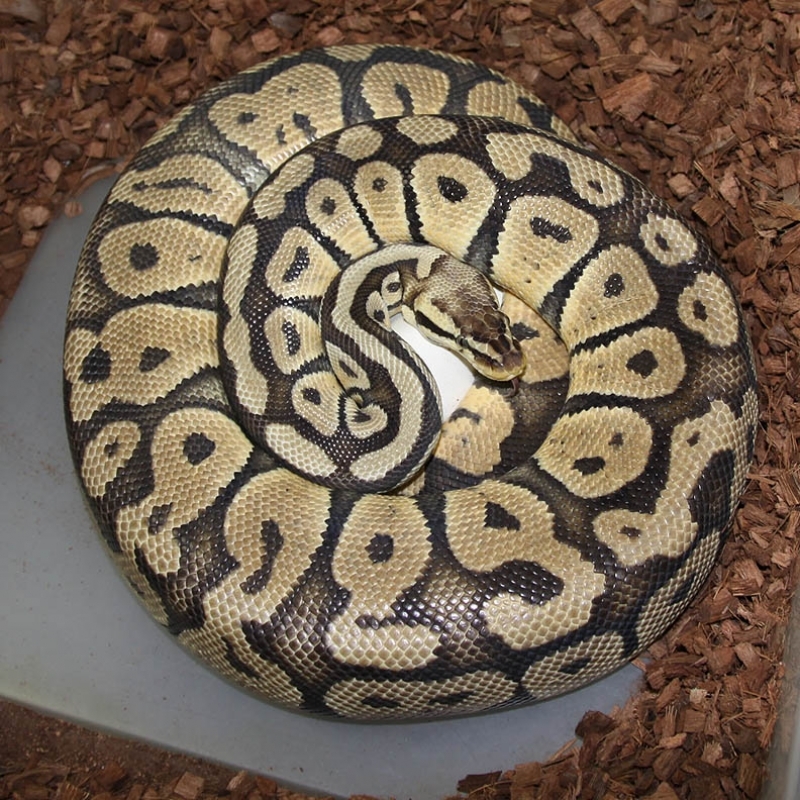 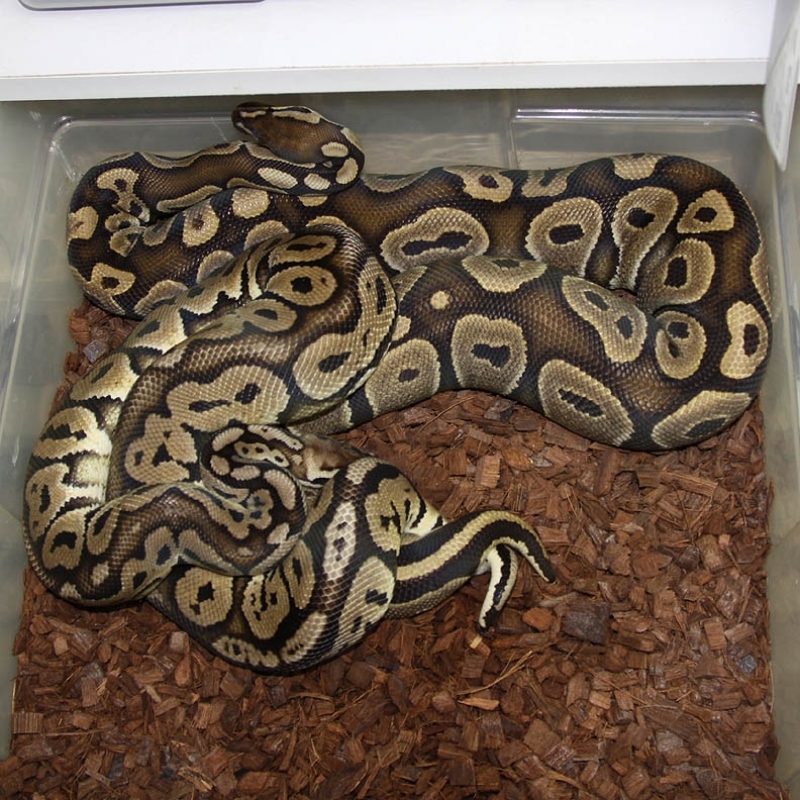 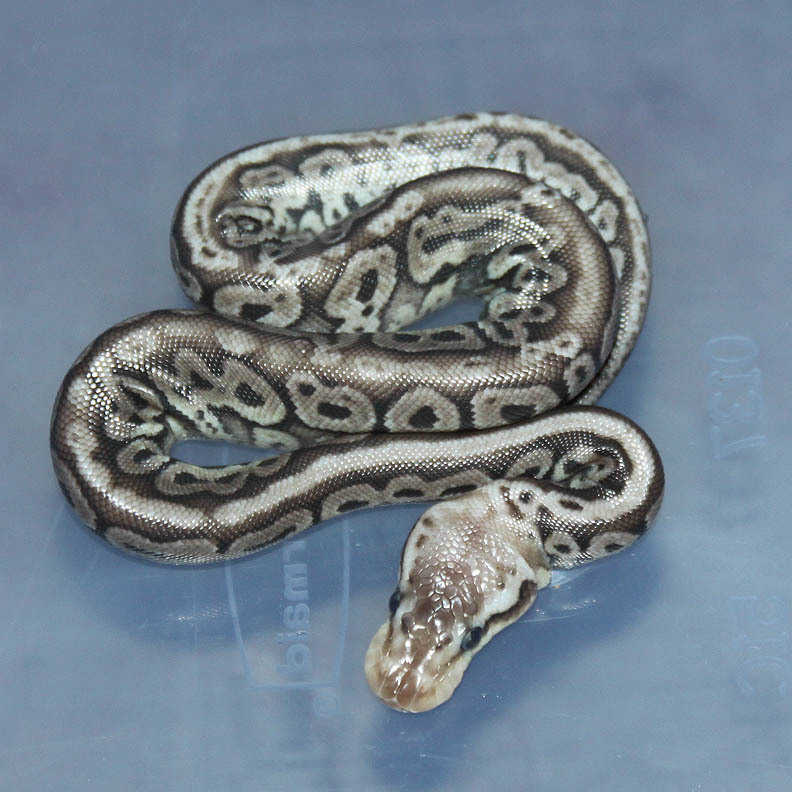 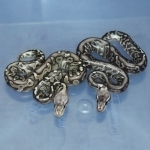 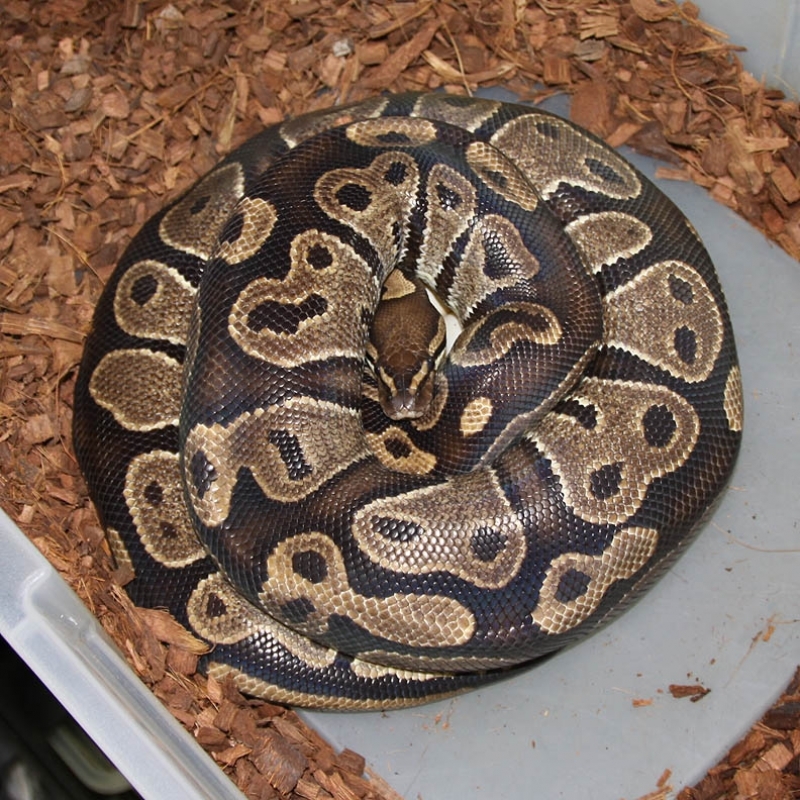 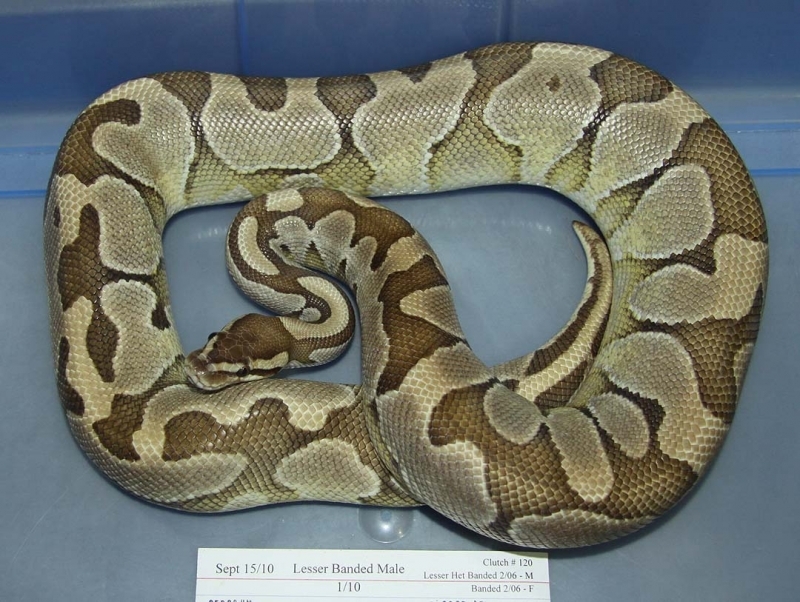 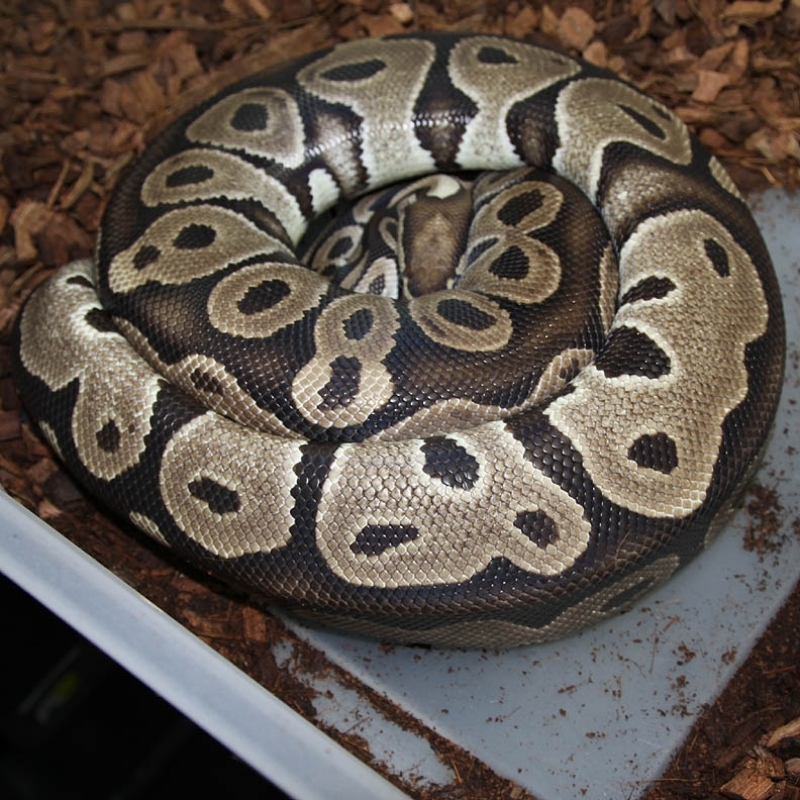 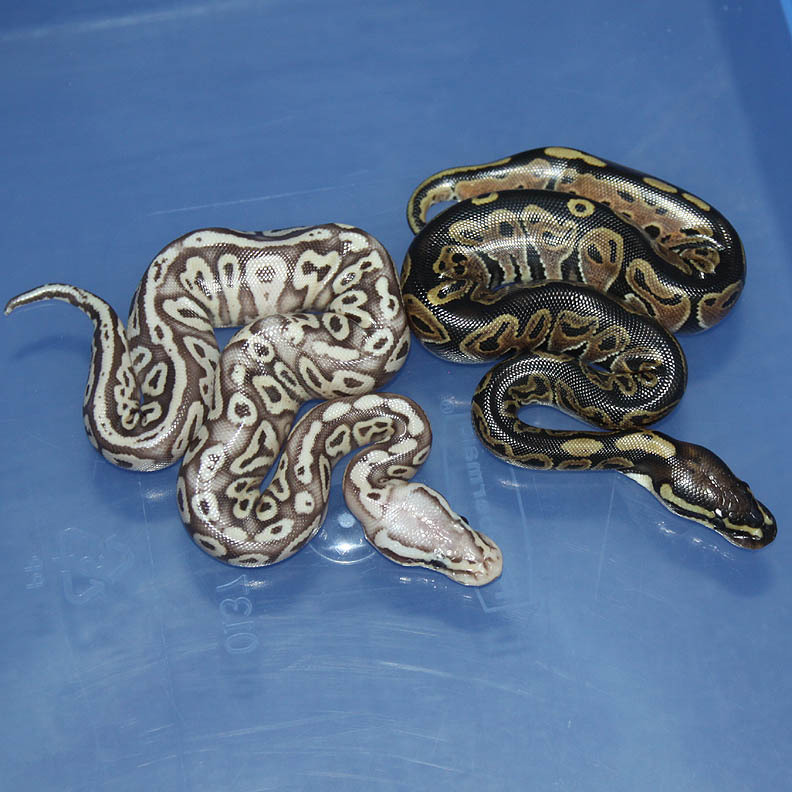 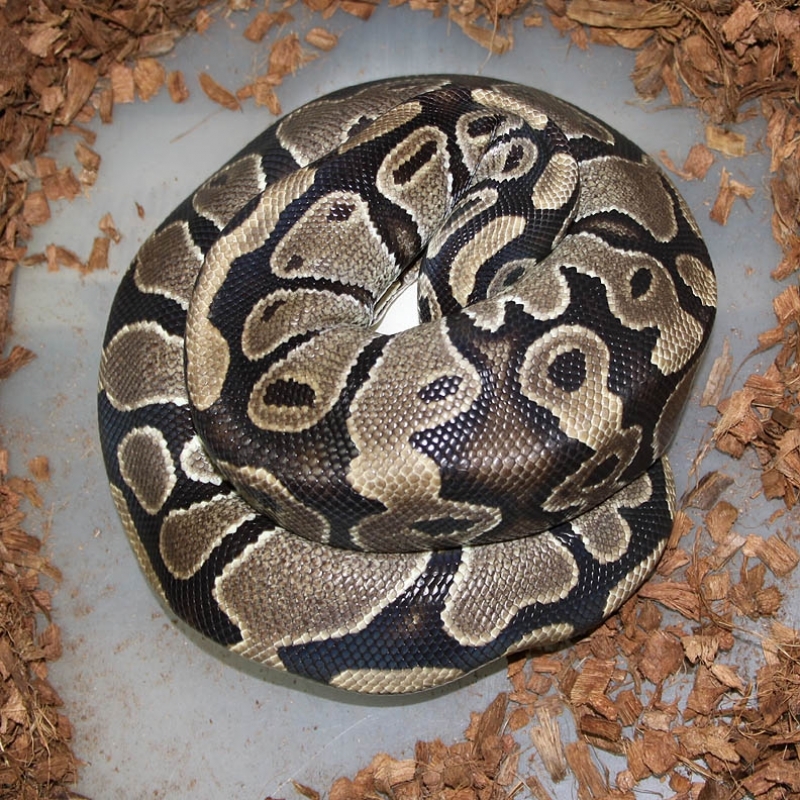 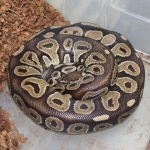 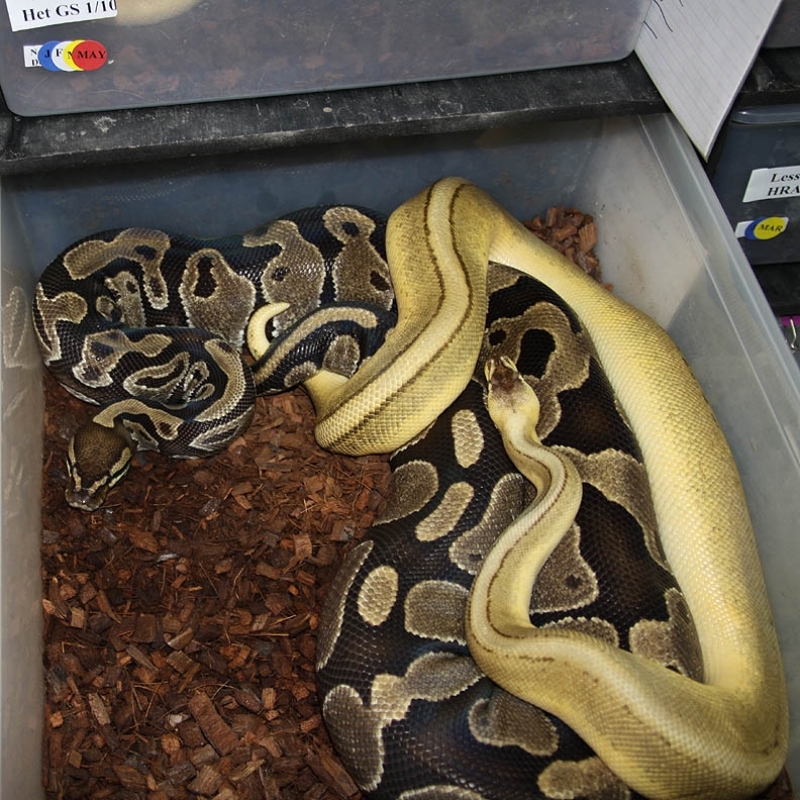 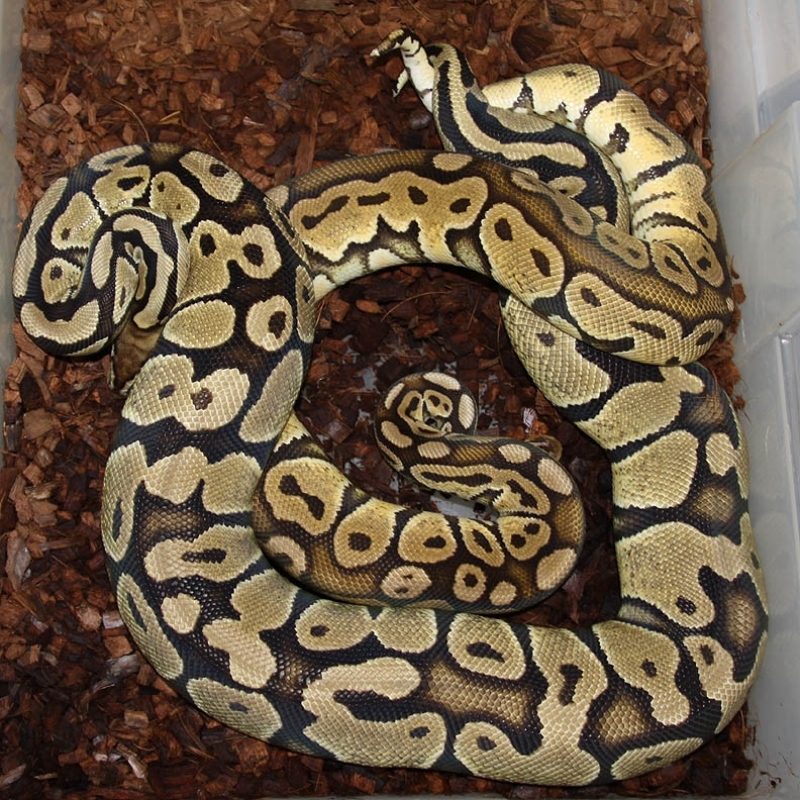 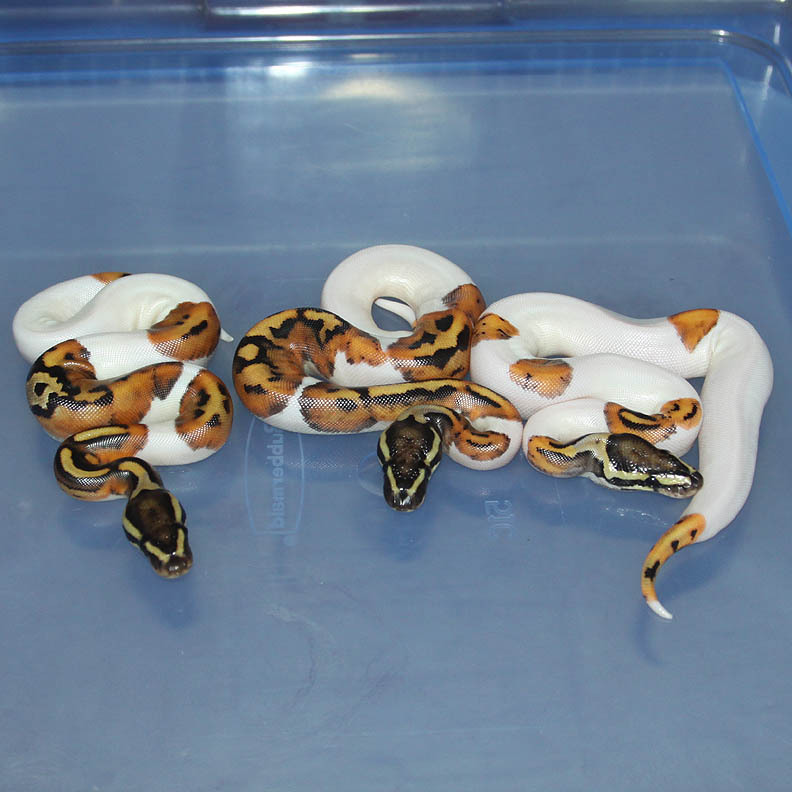 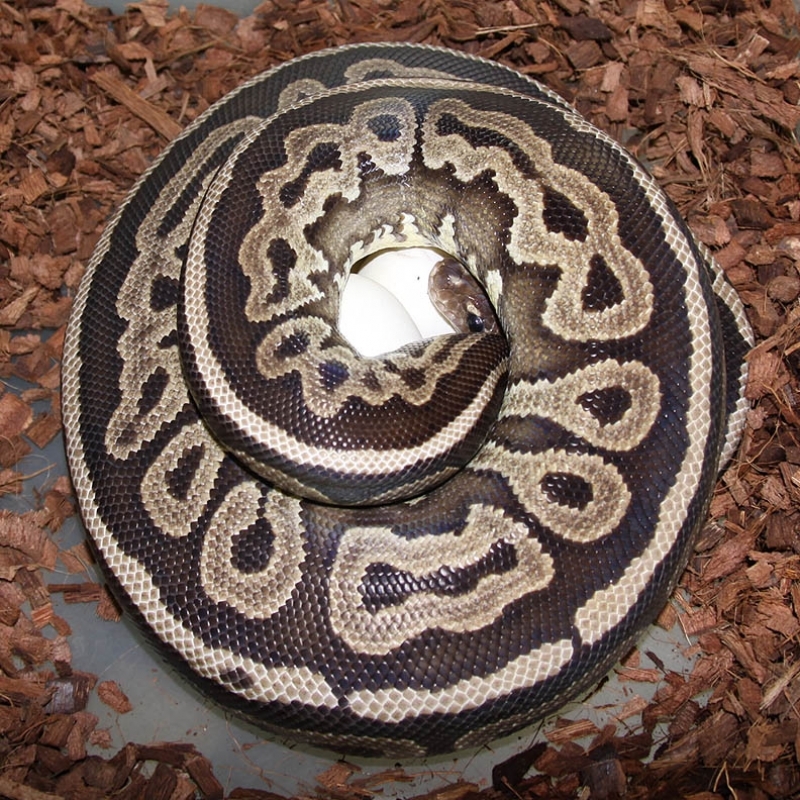 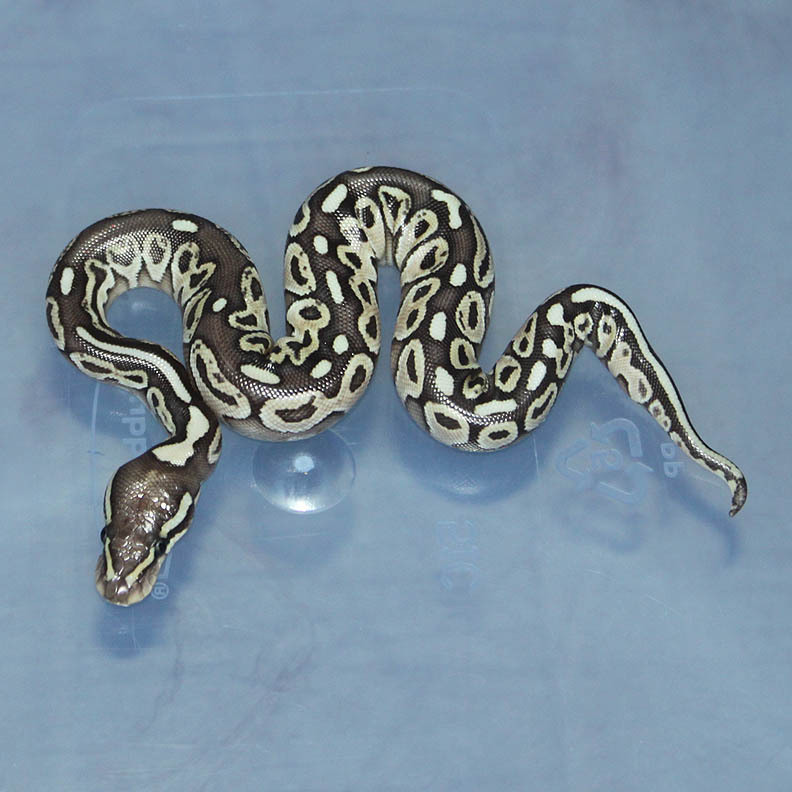 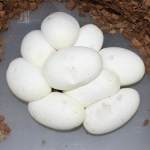 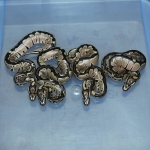 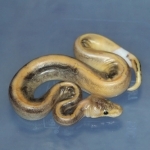 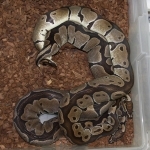 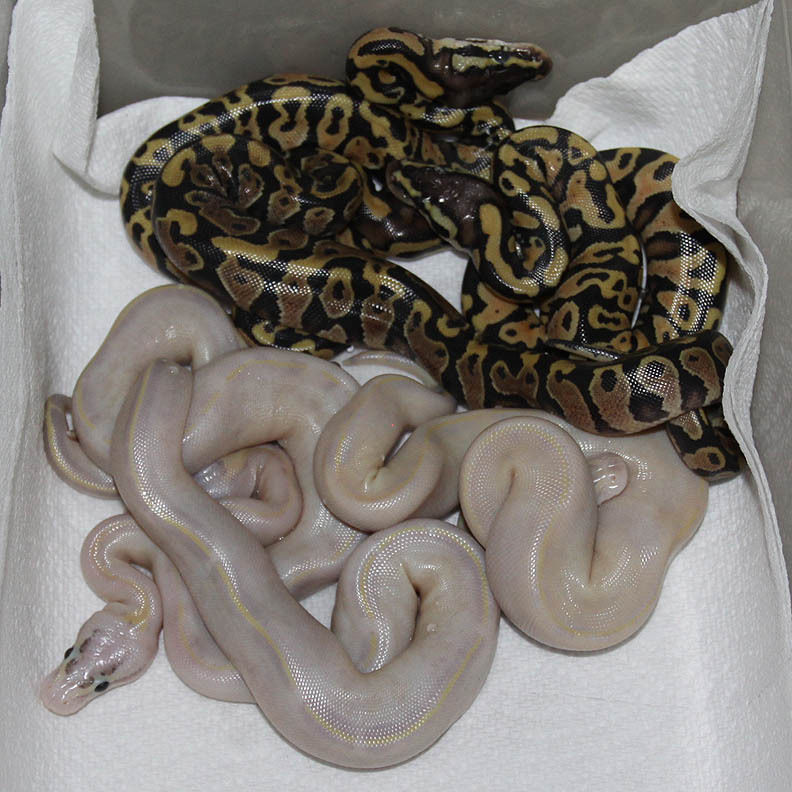 Description: Pastel Het RA/Pied 1/12 x Het RA/Pied 10/10. 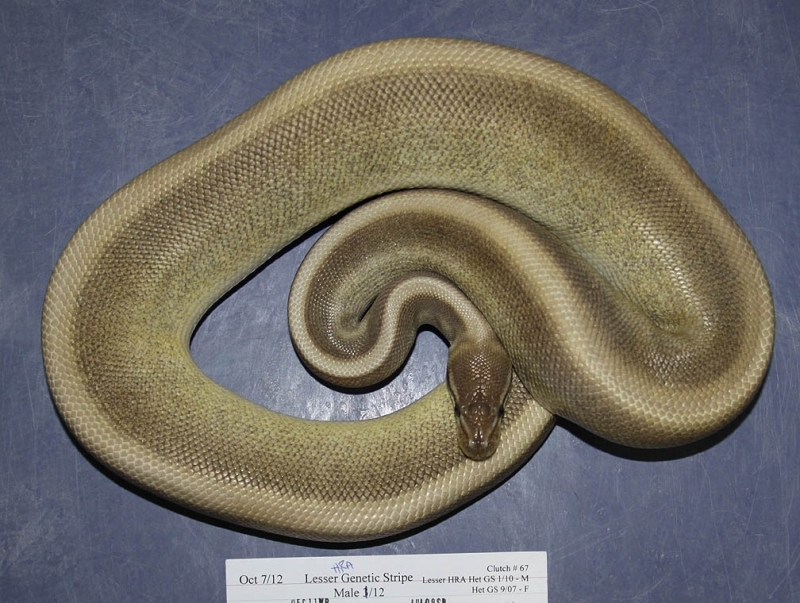 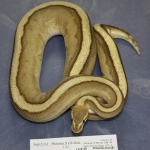 Description: Pastel Champ Het RA/Caramel 1/12 x Het RA/Caramel 1/10. 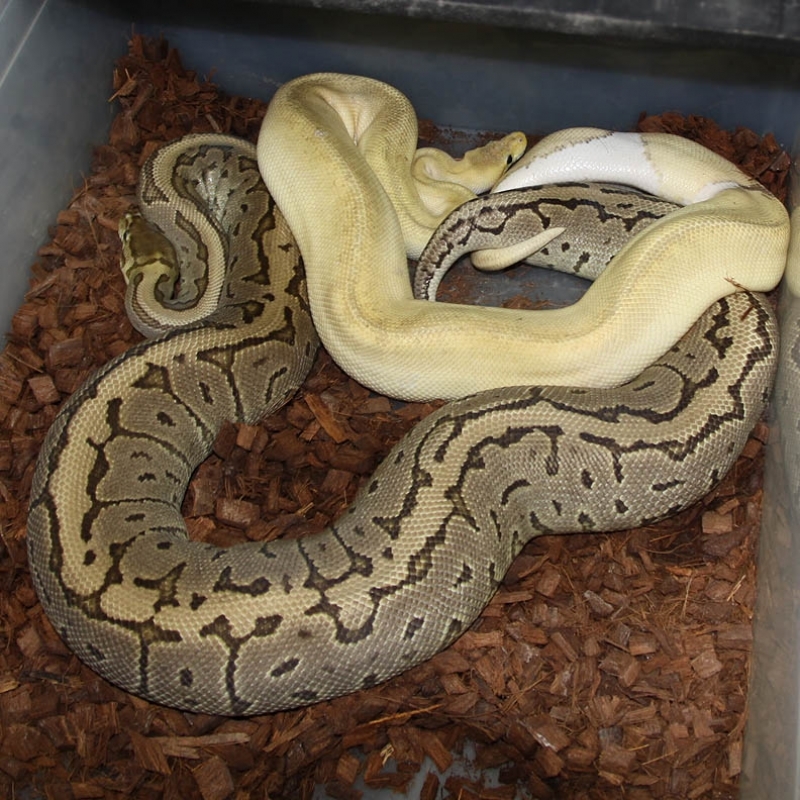 Description: Pastel Phantom HOG 1/12 x Pastel HOG 14/06. 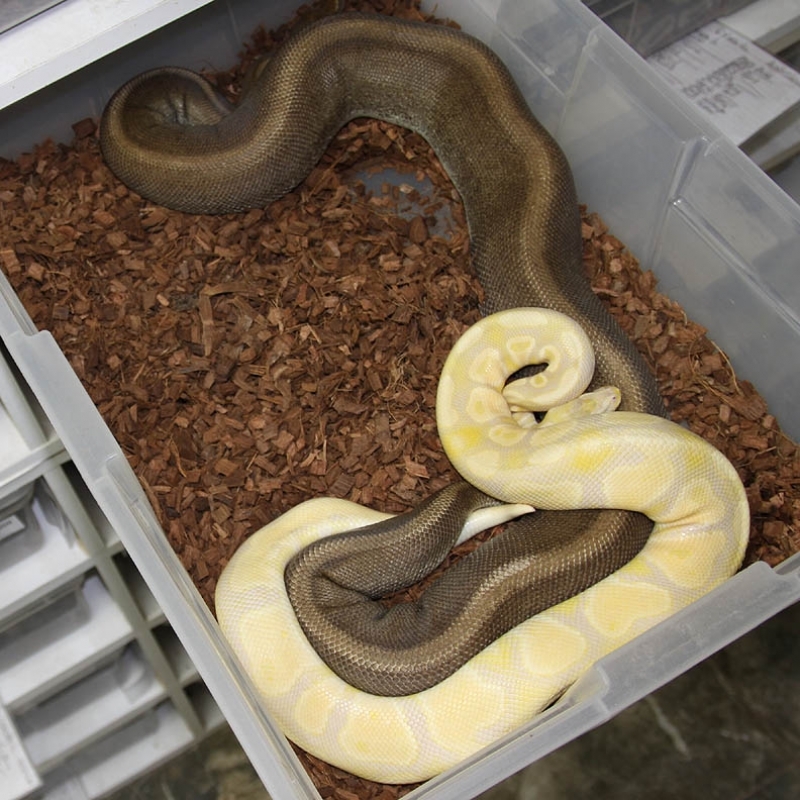 This pair was never observed breeding. 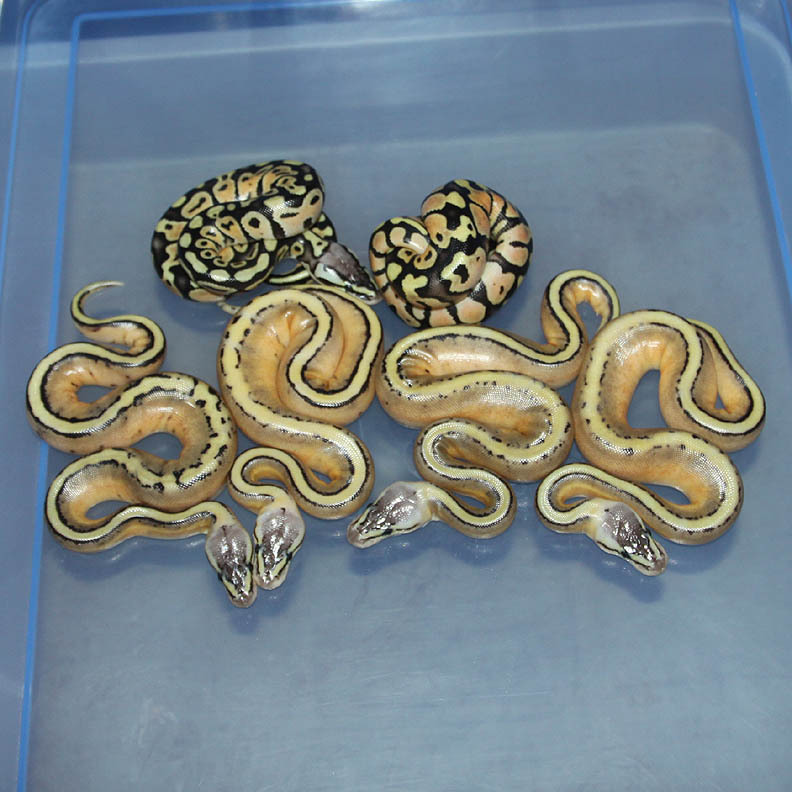 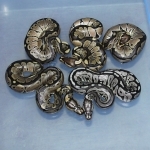 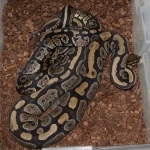 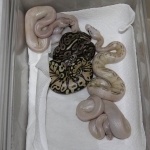 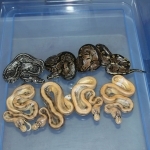 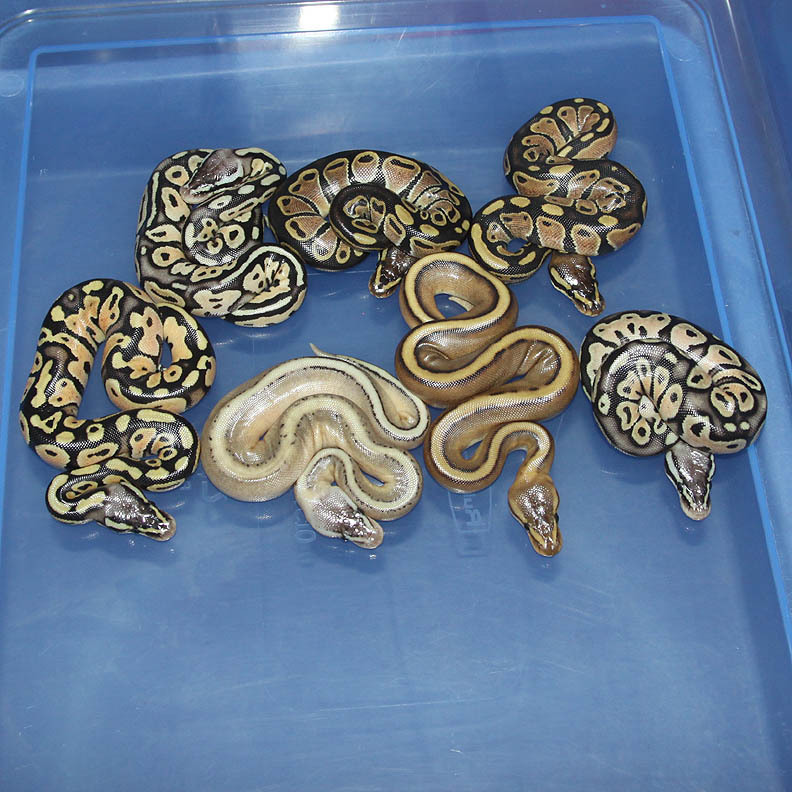 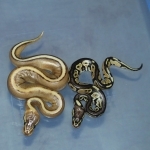 Description: Super Pastel Genetic Stripe 1/11 x Pastel Het Genetic Stripe 6/07. Description: Toffino HRA 1/12 x Het RA/Albino 3/09. 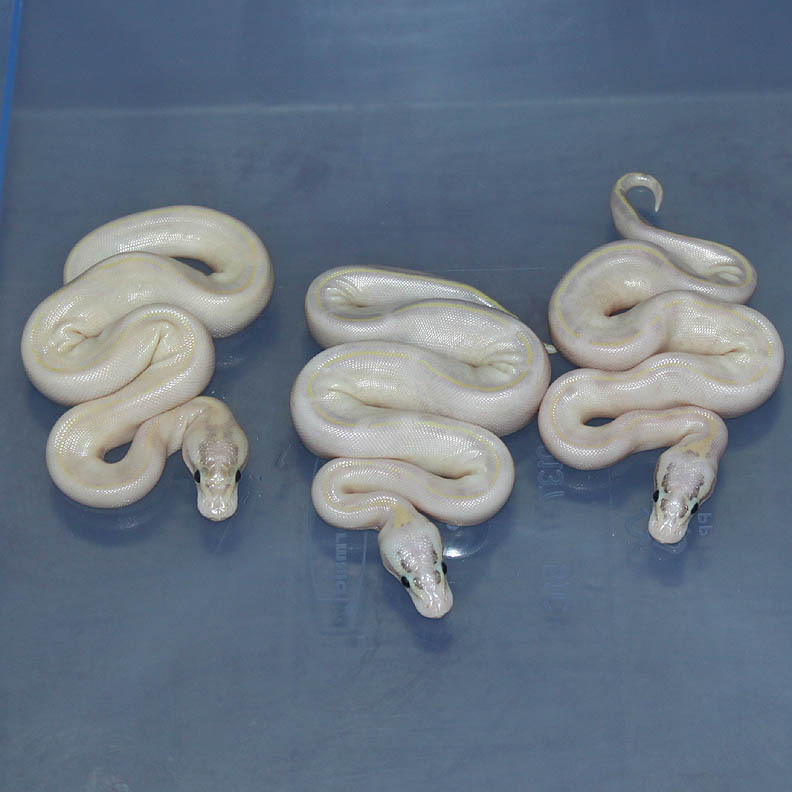 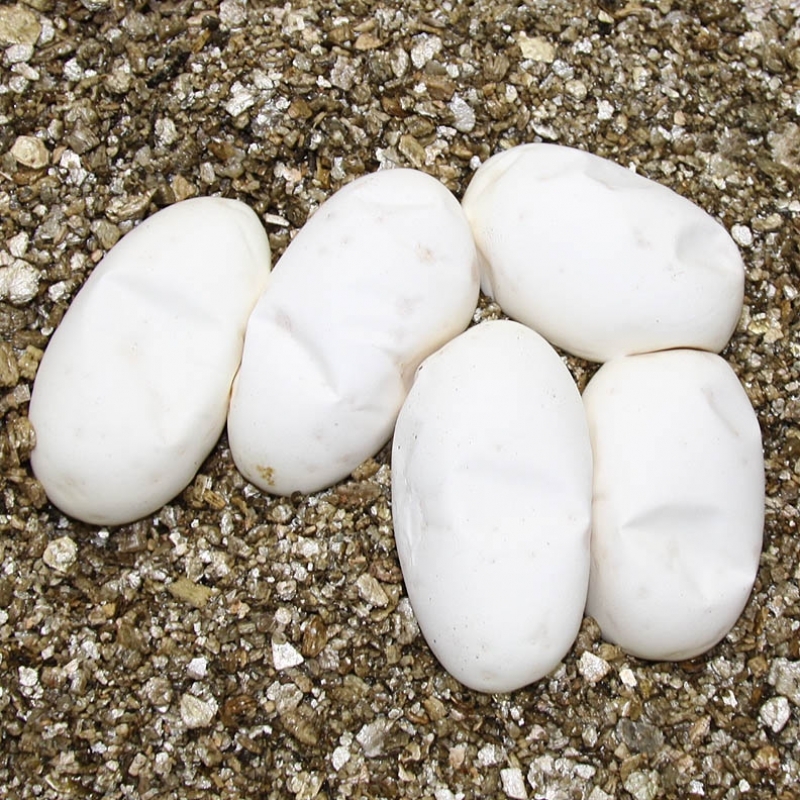 I should know in about 4-8 weeks which ones are Toffinos and which ones are Albinos. 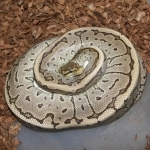 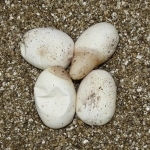 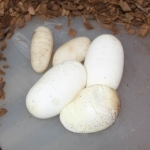 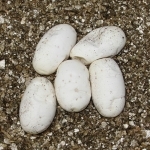 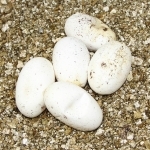 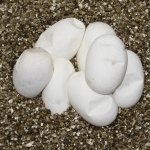 Description: Pastel DH OG/Pied 2/10 x DH OG/Pied 2/10. 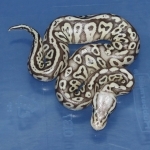 Description: Lavender Het Pied 1/12 x Pied 1/10. 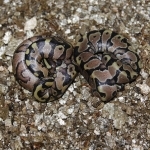 Description: Lesser Banded 1/10 x Banded 10/06. 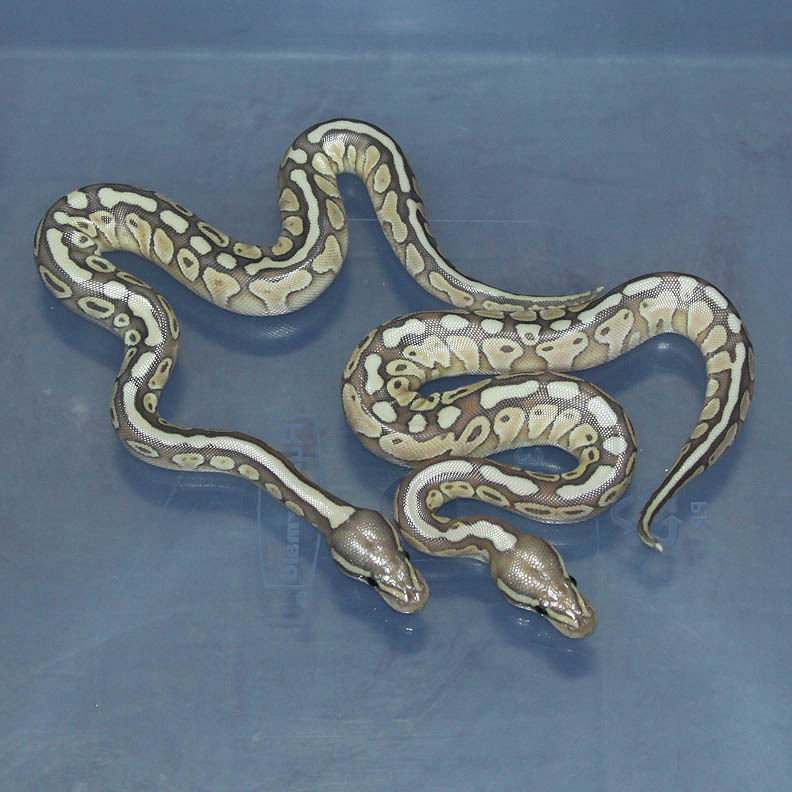 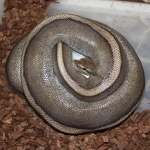 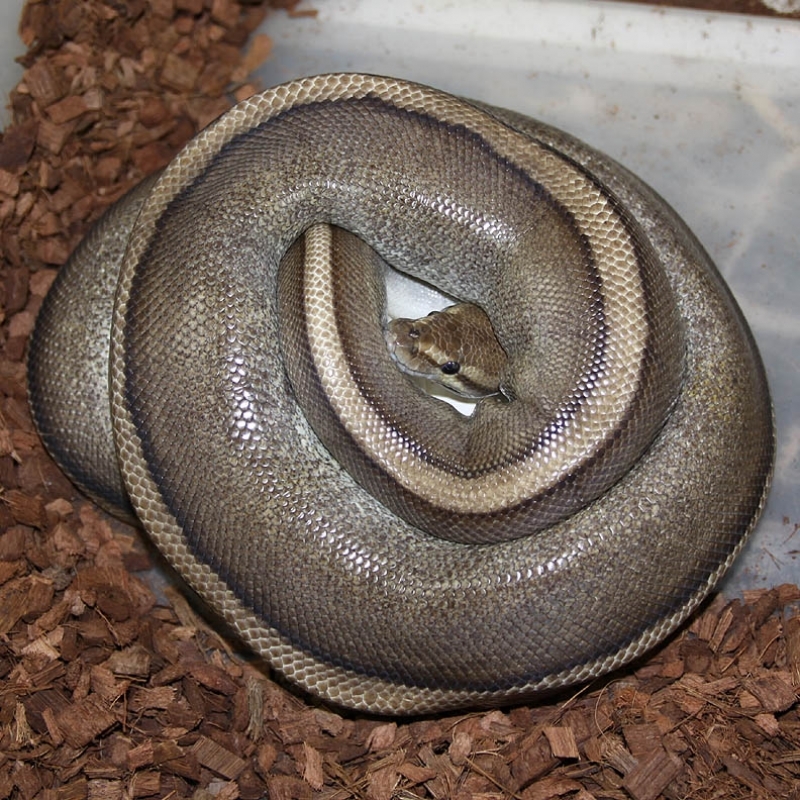 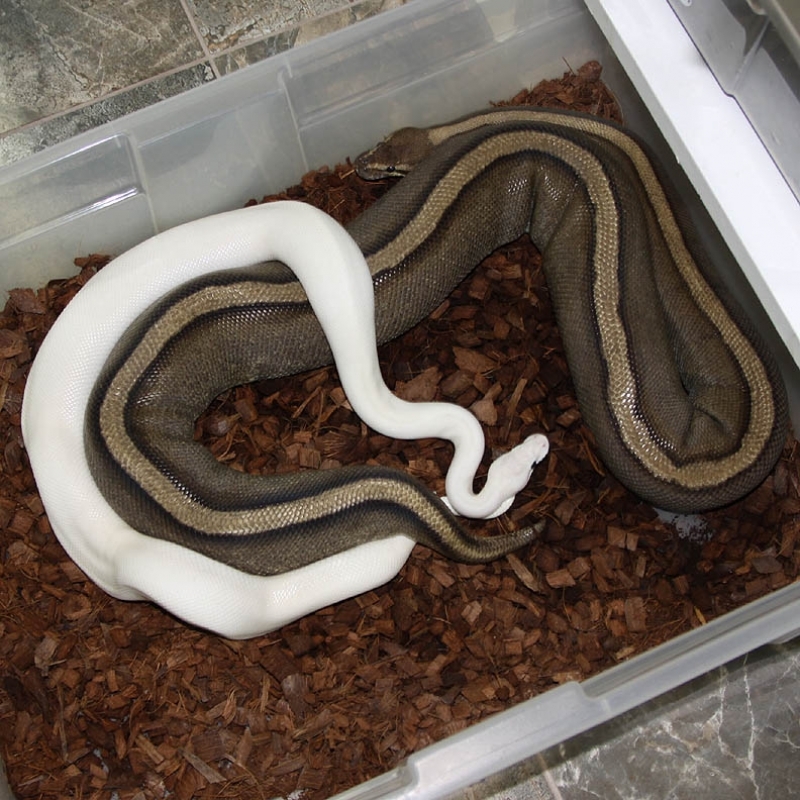 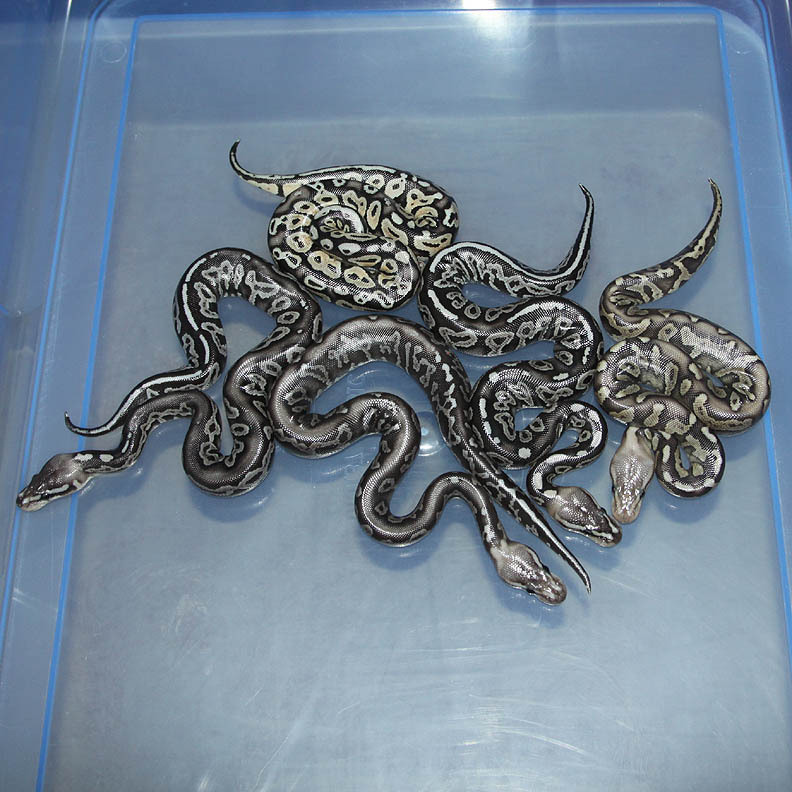 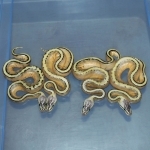 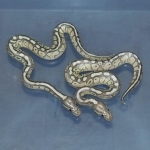 Description: Pastel Lavender Het Genetic Stripe 1/10 x Red Axanthic Genetic Stripe 1/11. 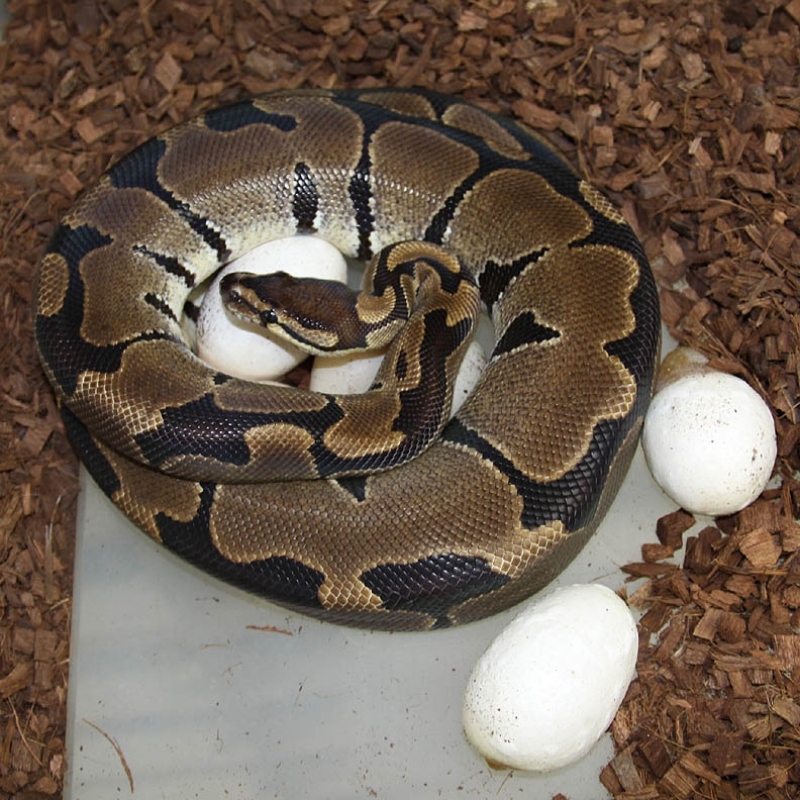 The HRA female had her yoke go hard in the egg. She's small but she'll be ok. 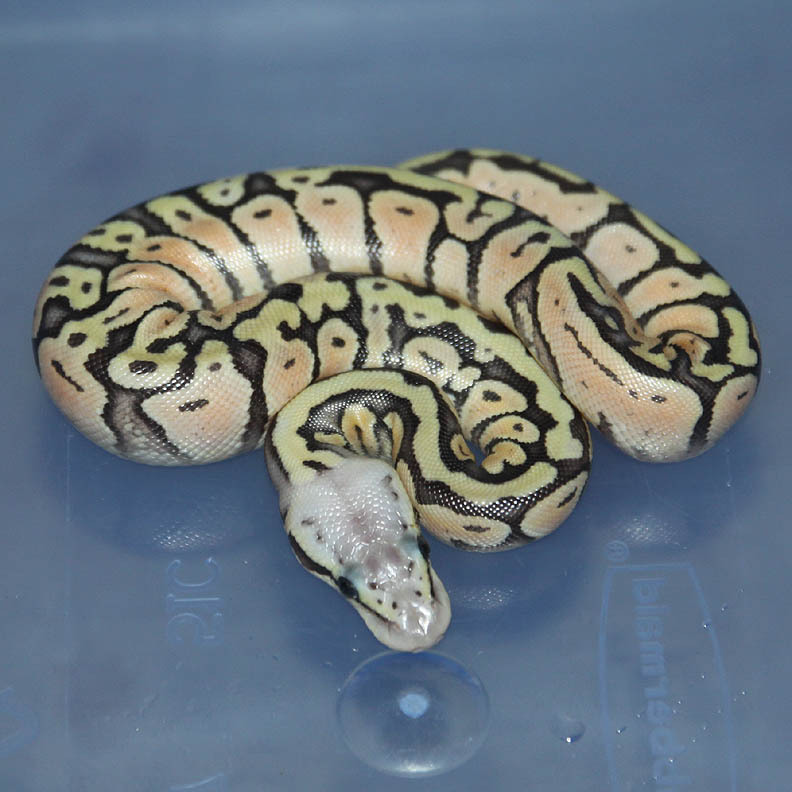 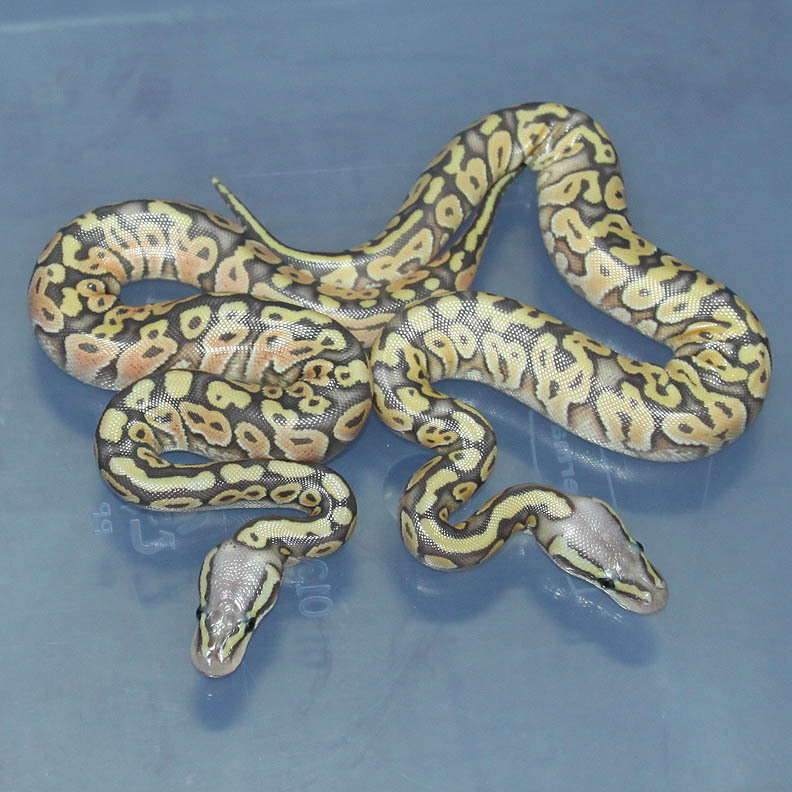 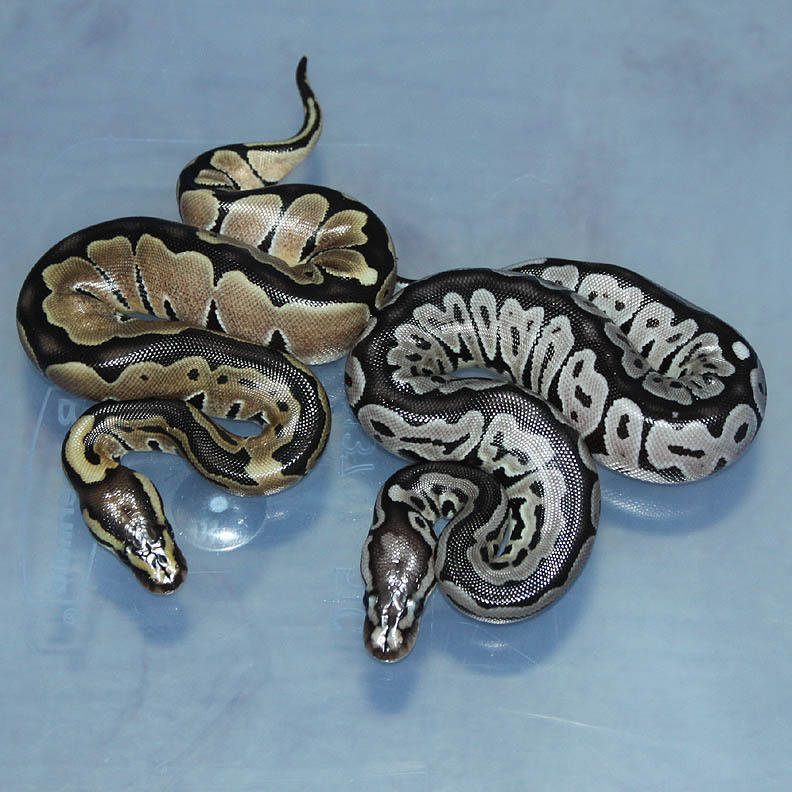 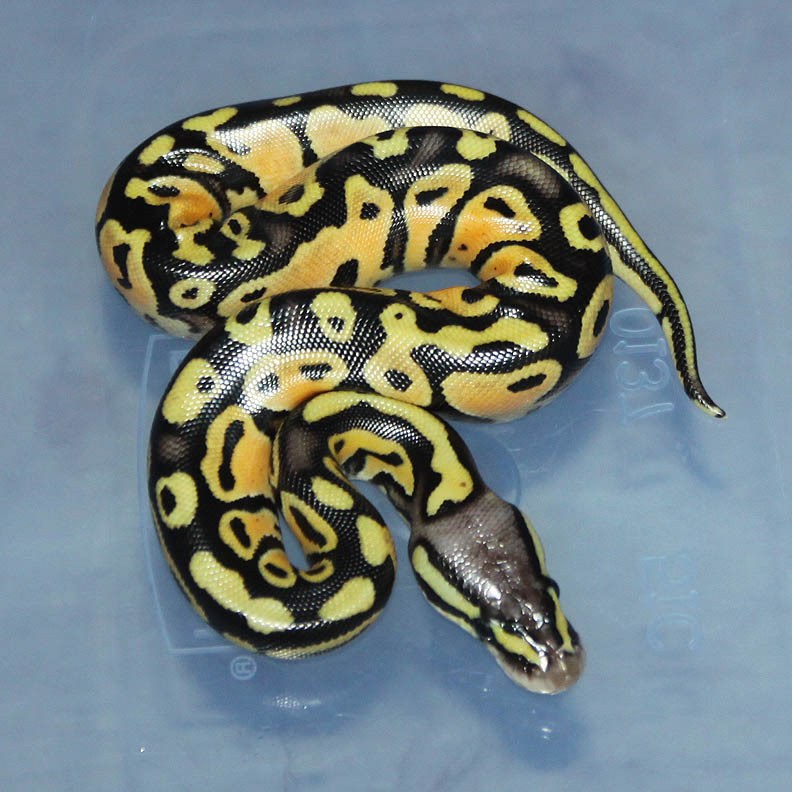 Description: Mutation X Genetic Stripe 1/12 x Super Pastel Het Genetic Stripe 1/10. 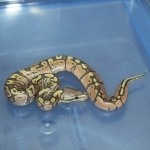 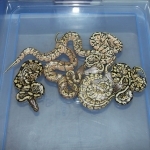 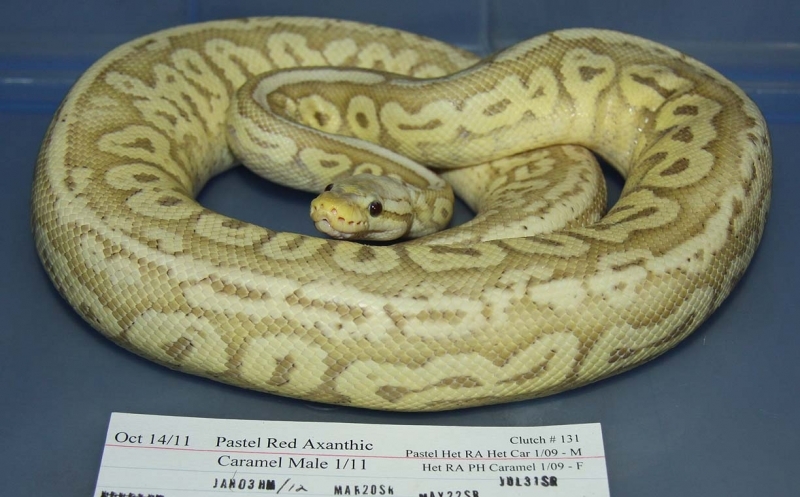 Description: Pastel Red Axanthic Caramel 1/11 x Pastel Het RA/Caramel 1/09. 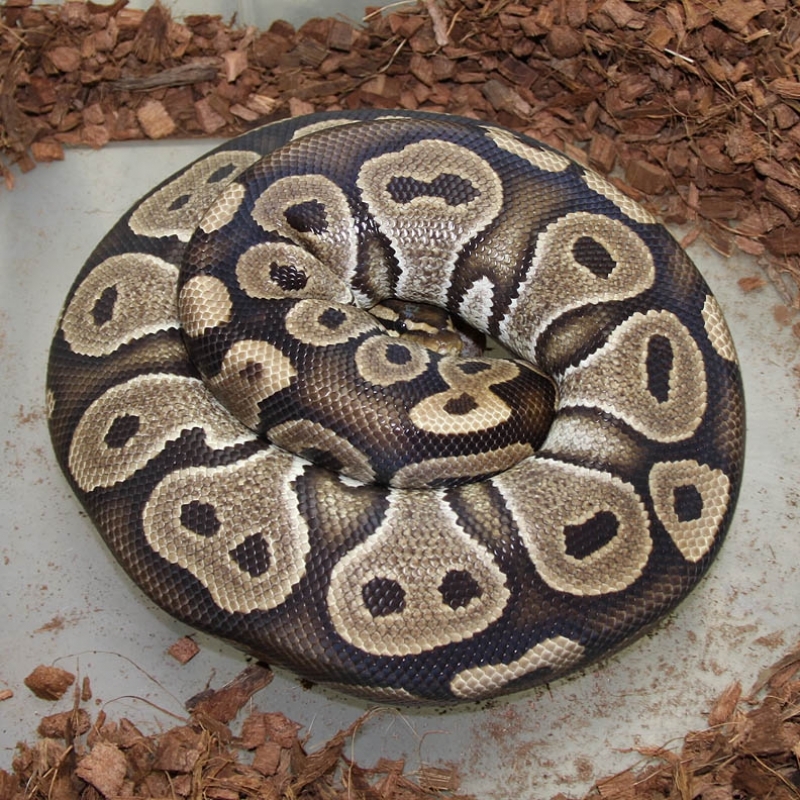 Results: This clutch went bad. 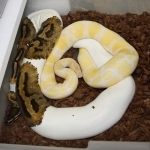 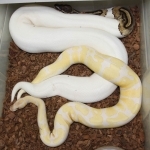 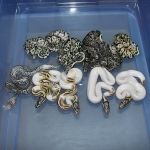 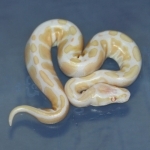 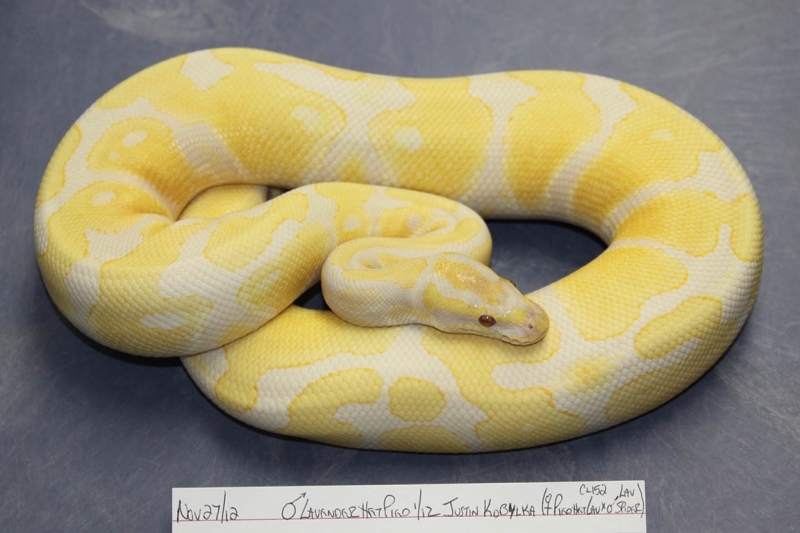 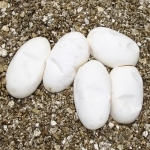 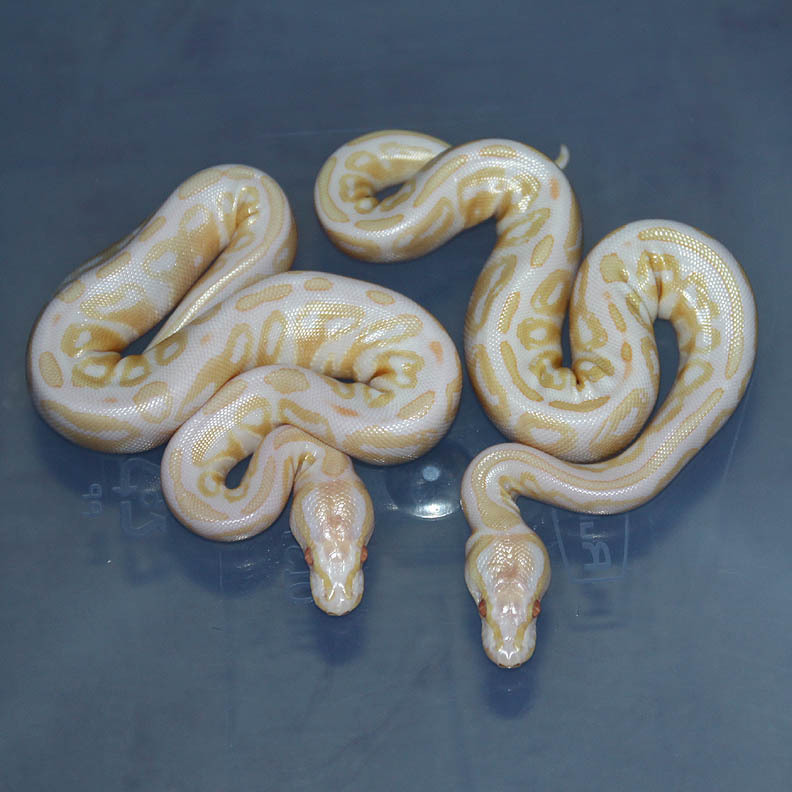 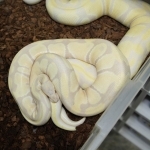 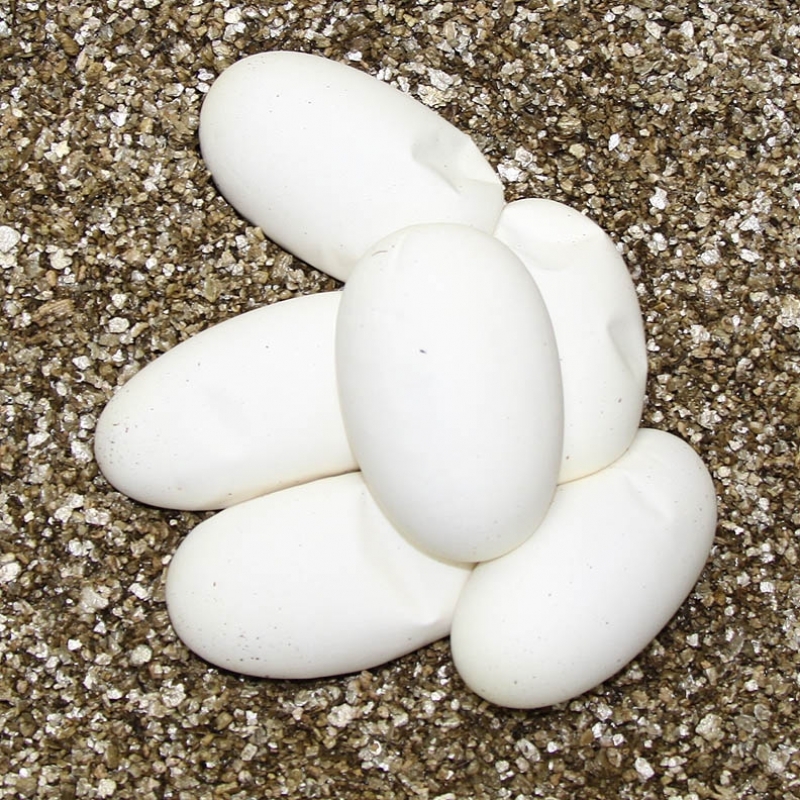 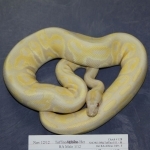 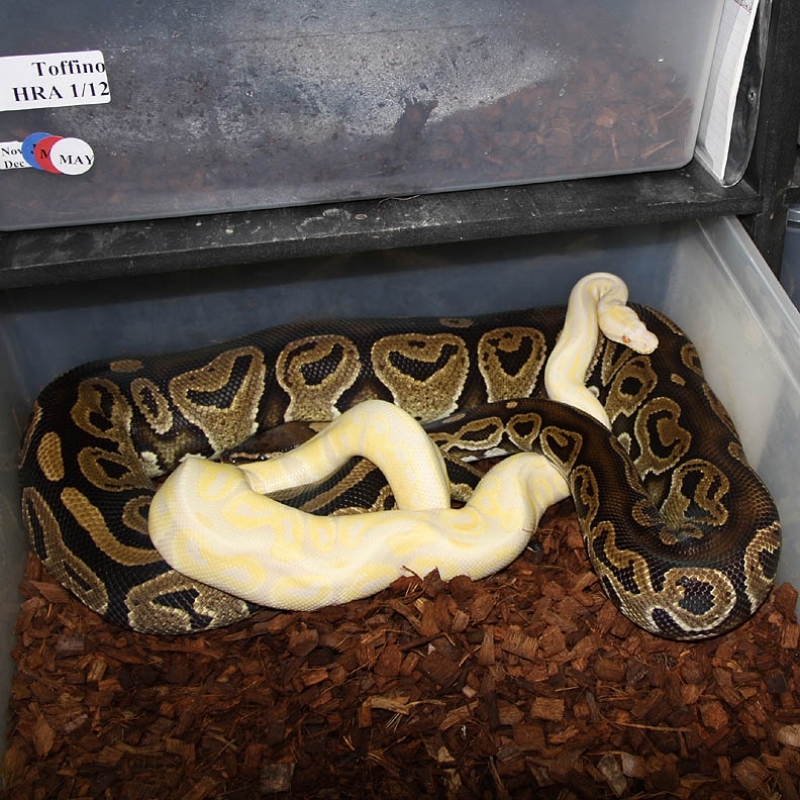 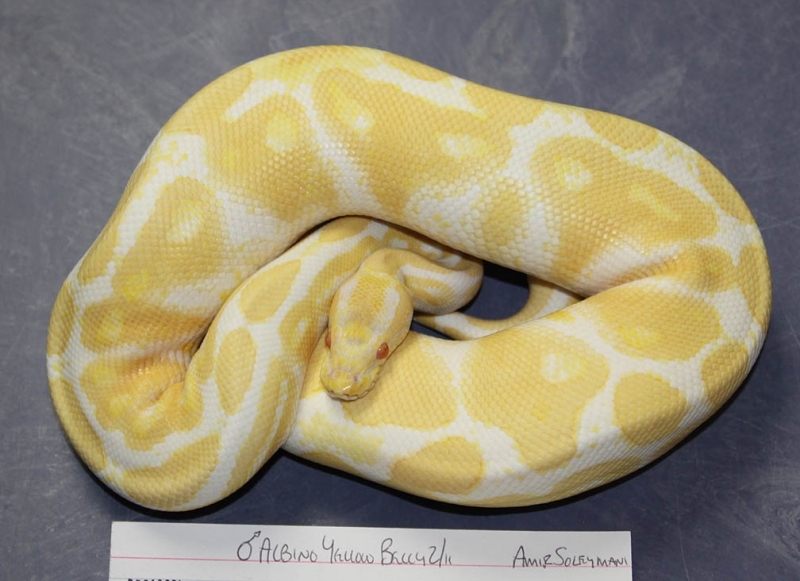 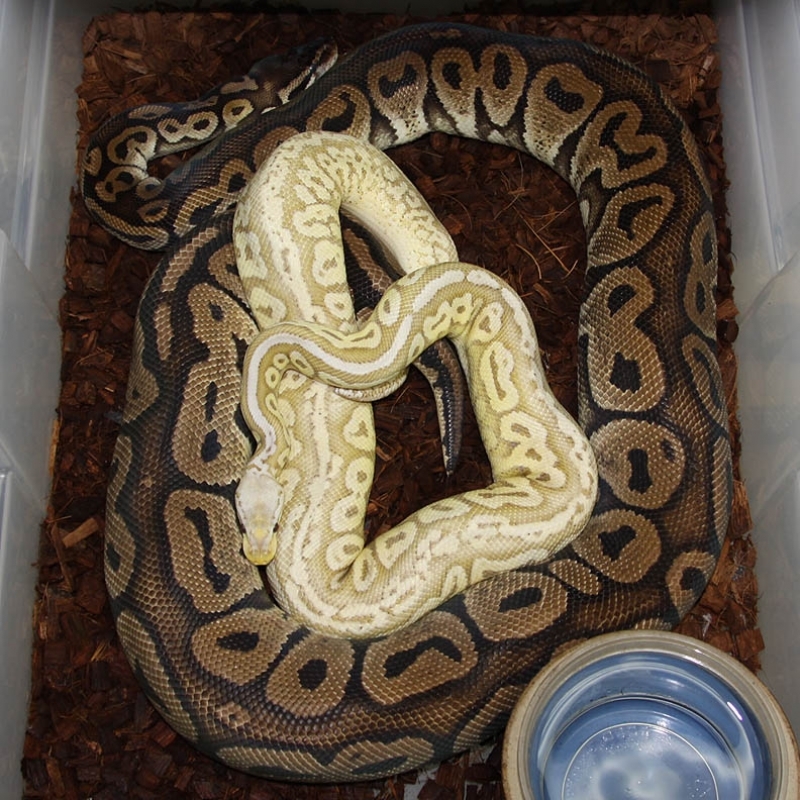 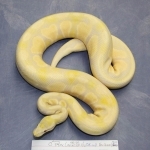 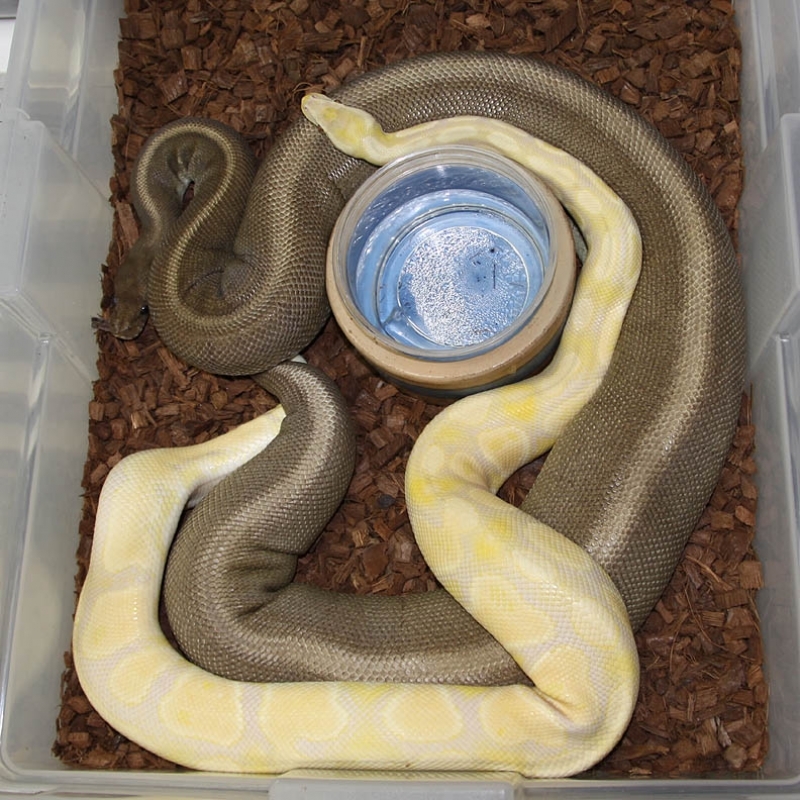 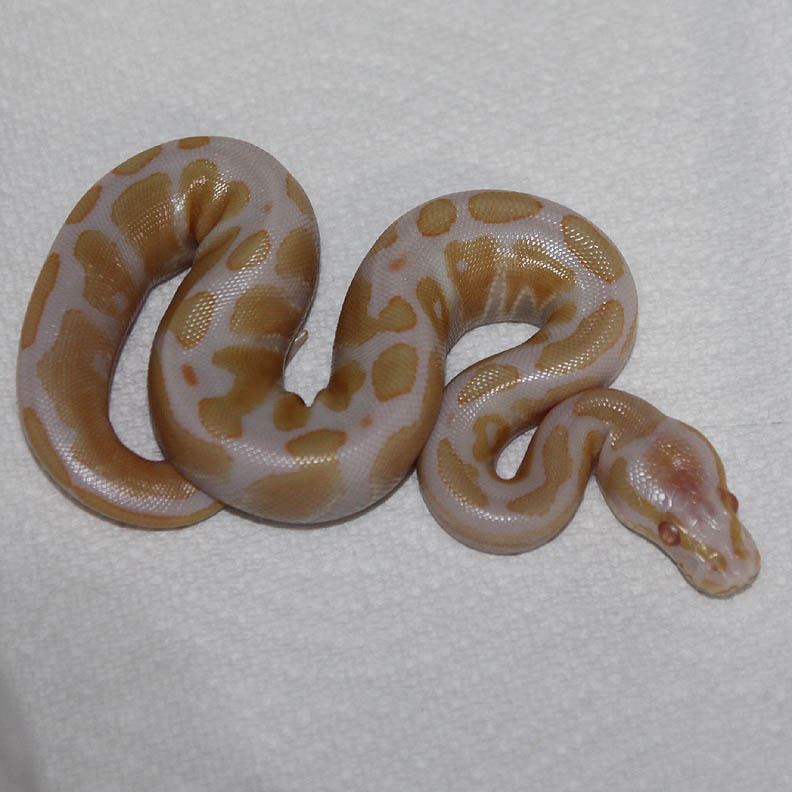 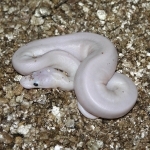 Description: Albino YB 2/11 x Het RA/Albino 1/09. 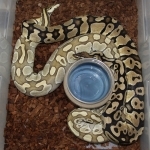 Description: Mutation X Champagne HRA 1/12 x Het RA 1/09. 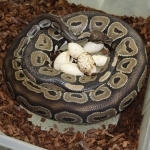 So, it appears as though the father is not a Mutation X. 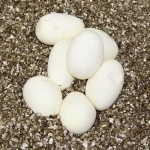 That is one of the problems of the Champagne gene is that it sometimes hides the other genes so it makes it hard to tell what is in there. 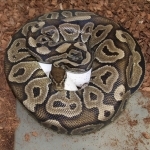 Anyways, the Champagne HRA's are really wacked out in this clutch! 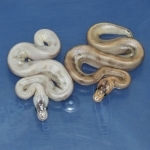 Description: Ivory HRA 1/12 x Pastel HRA 3/06. Description: SPGS 1/11 x Het GS 1/06. Description: Pastel Red Axanthic Chocolate 1/12 x Chocolate HRA 1/11. 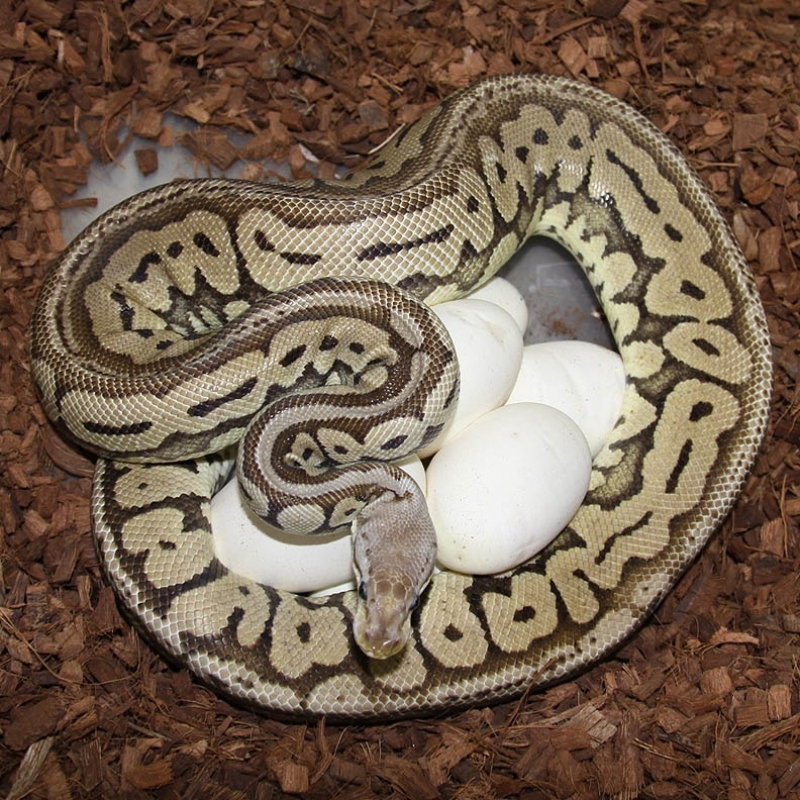 Description: Super Phantom 6/10 RDR x Pastel Genetic Stripe 2/10. Description: Funky YB 1/11 x Funky YB 3/11. 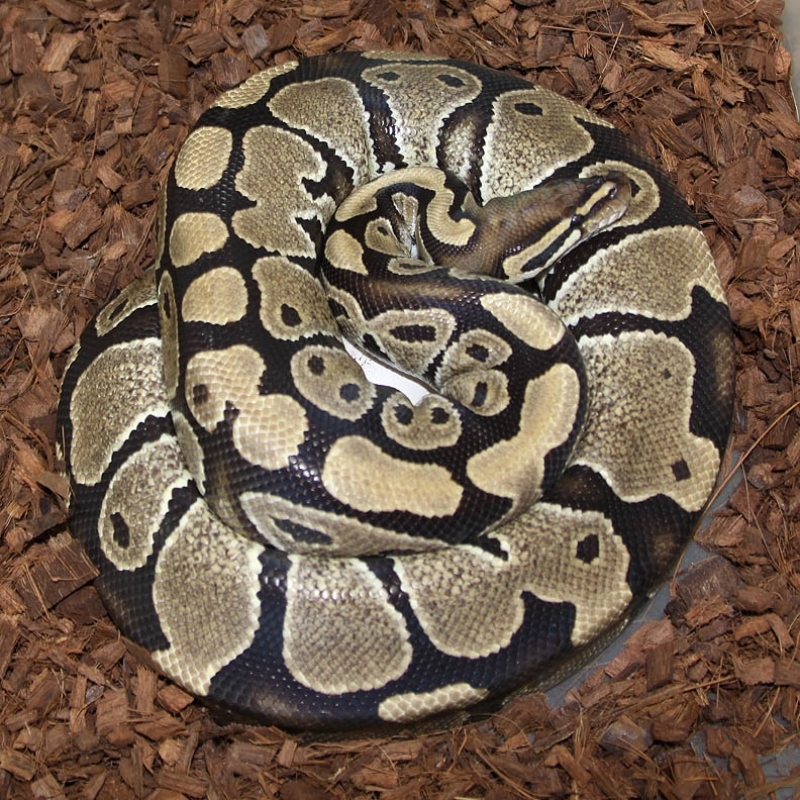 The "Funky" gene has enlarged scales down their spines. 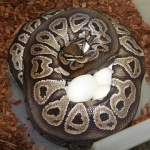 Maybe there is a super??? Description: Banded HRA 1/11 x Banded HRA 1/11. 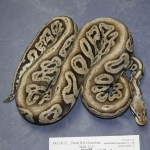 Description: Champagne HRA 1/12 x Het RA (Weird) 2/09. 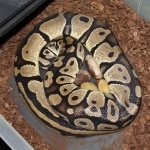 This male has proven to be a Champagne HRA. 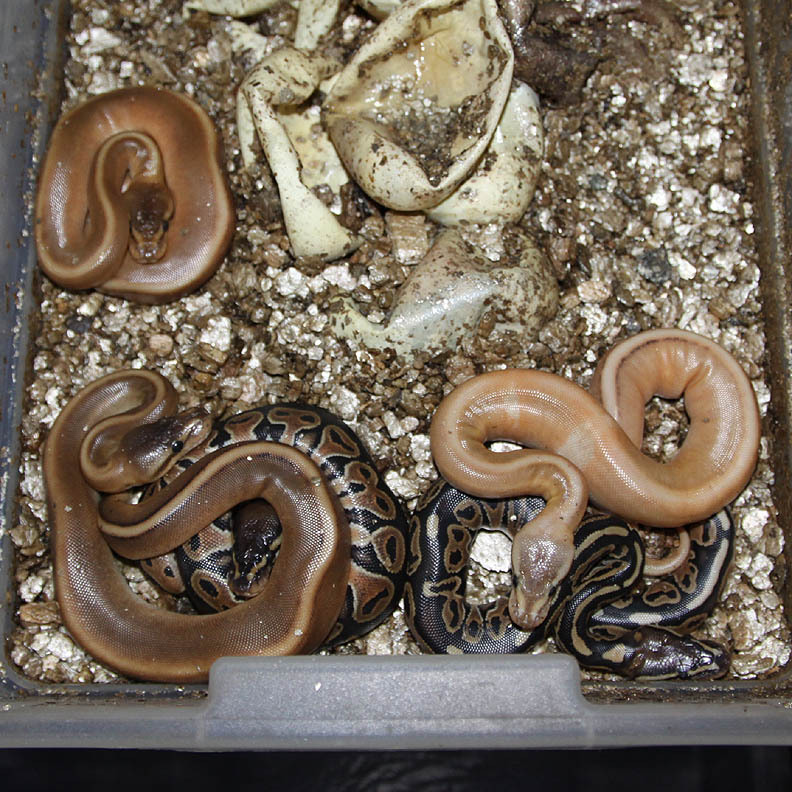 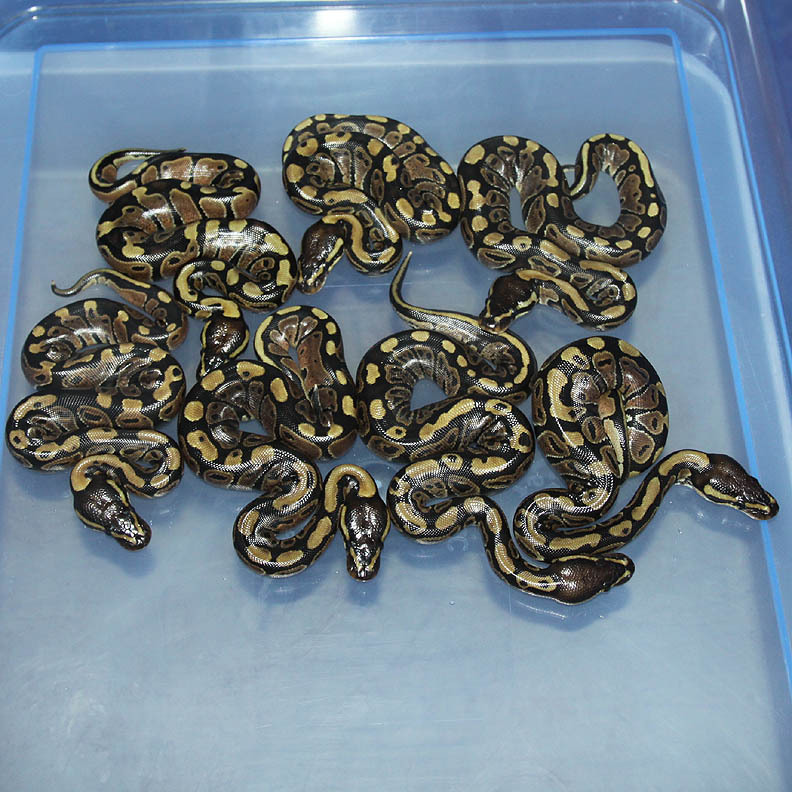 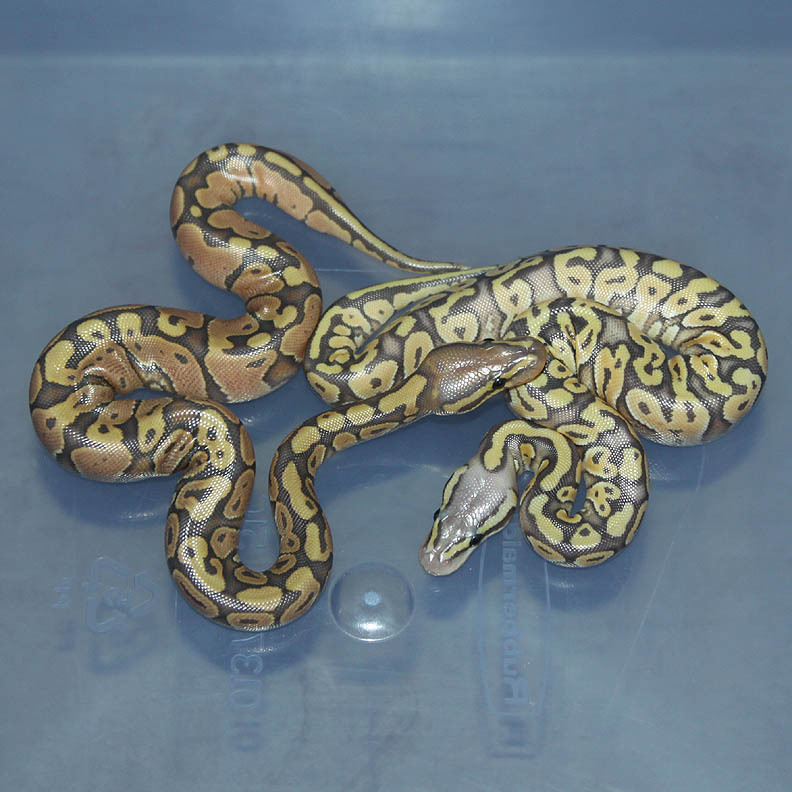 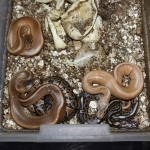 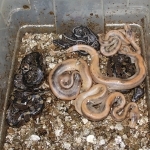 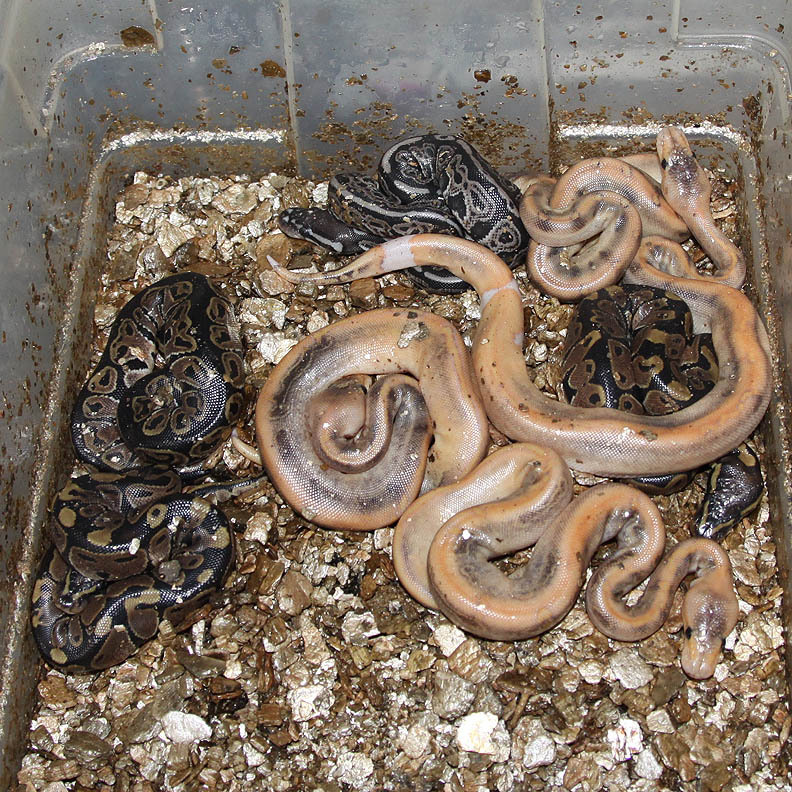 Description: Lesser Caramel 1/12 x Pastel Red Axanthic Pos Het Caramel 1/11.